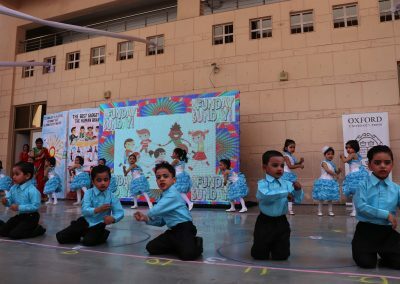 Beginning of the session is a time when we wake up early, happy and joyful, full of anxieties in our hearts thinking about the “The First Day of School”. 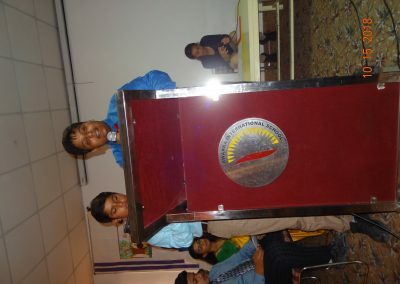 It is an experience of mixed emotions. 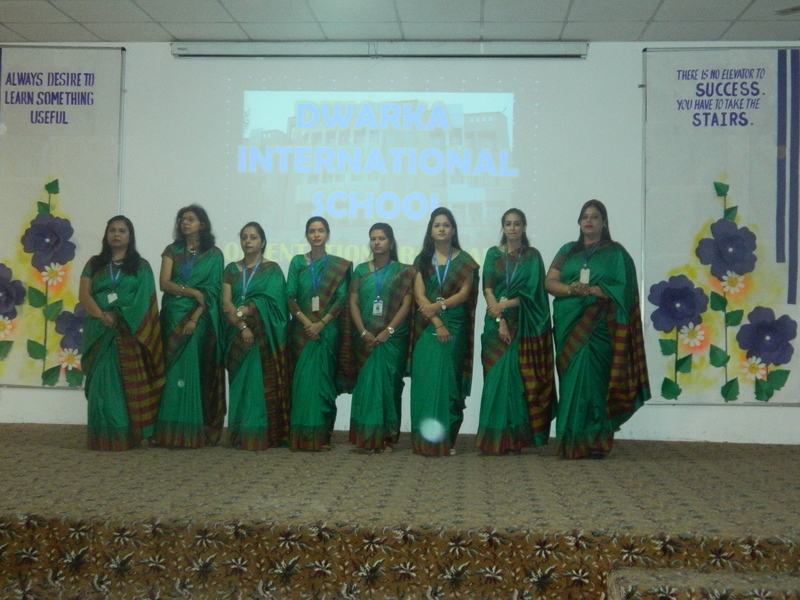 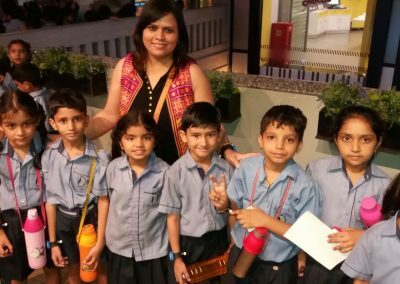 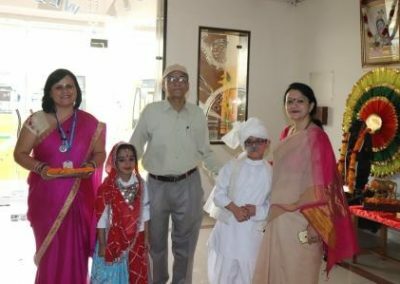 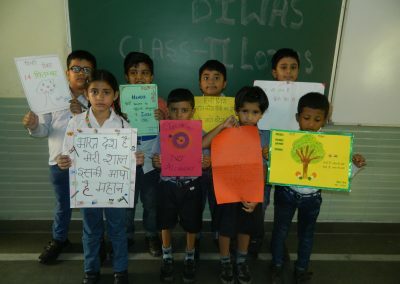 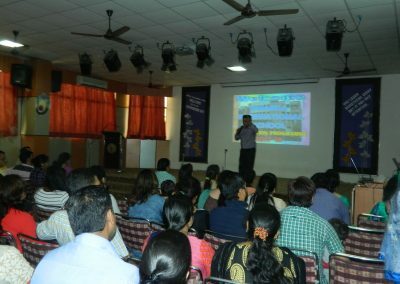 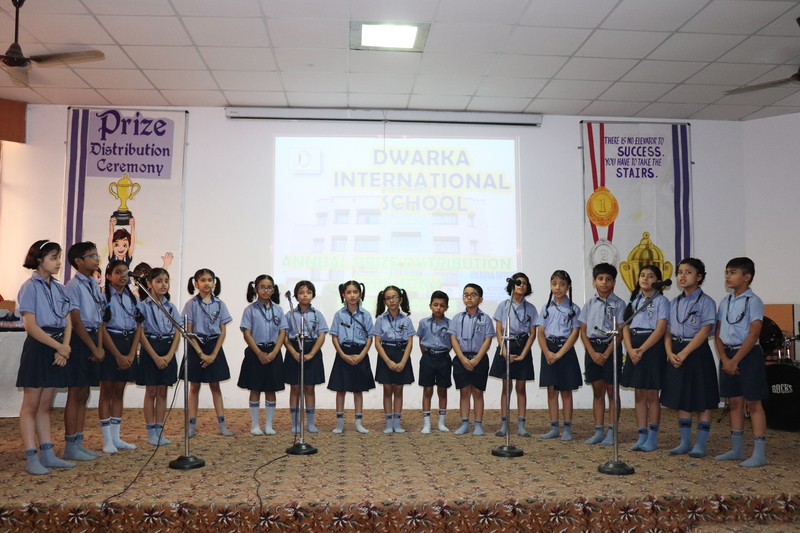 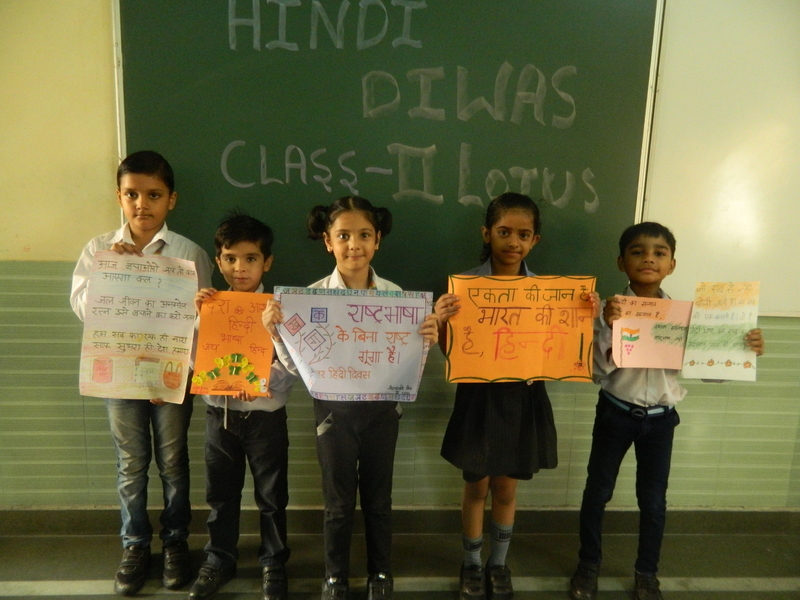 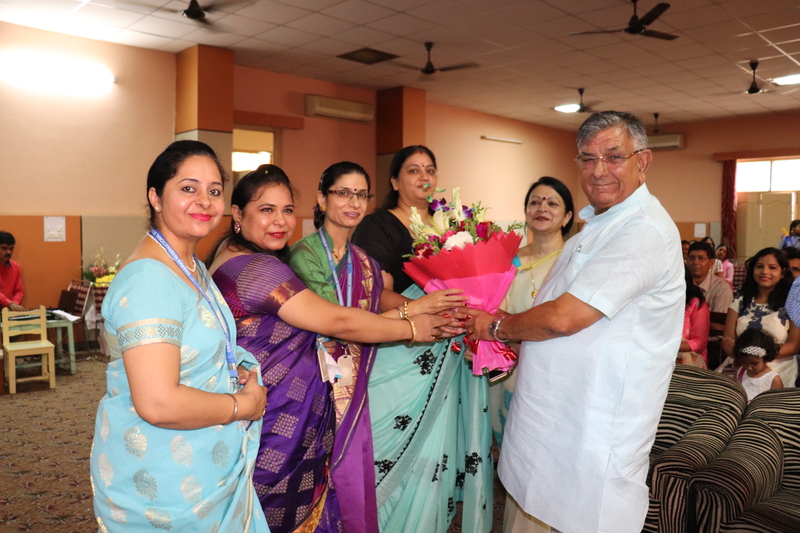 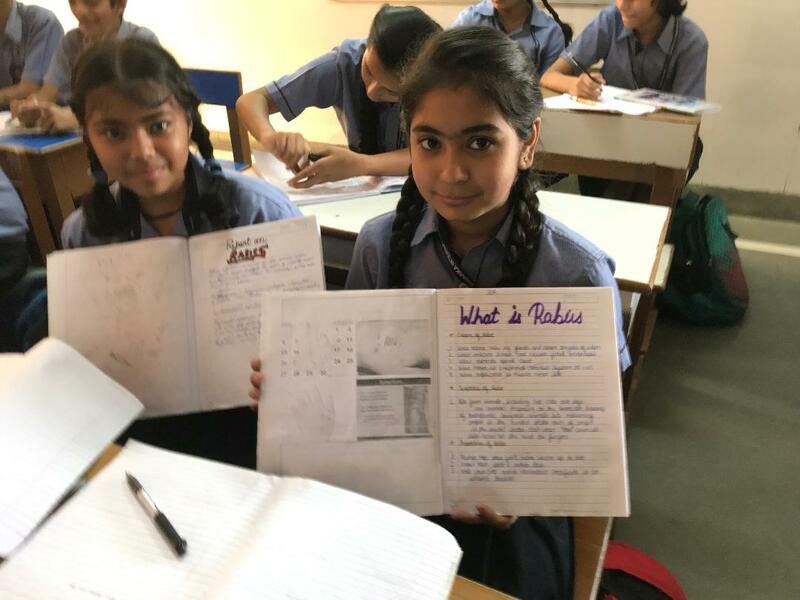 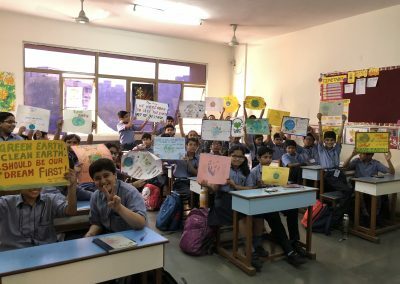 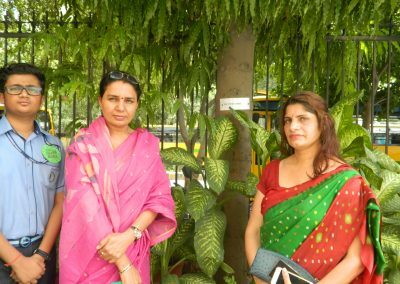 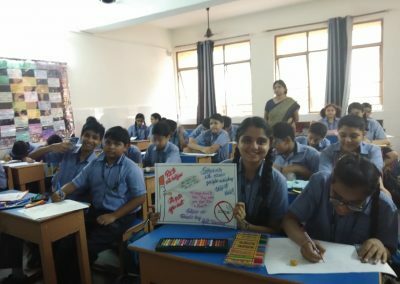 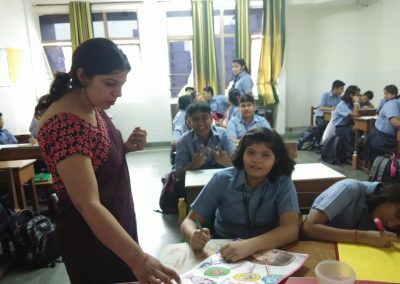 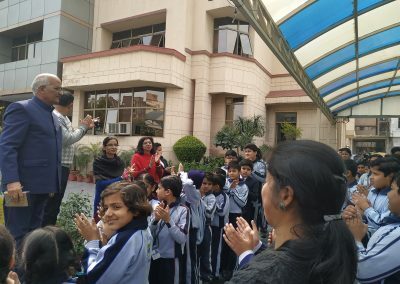 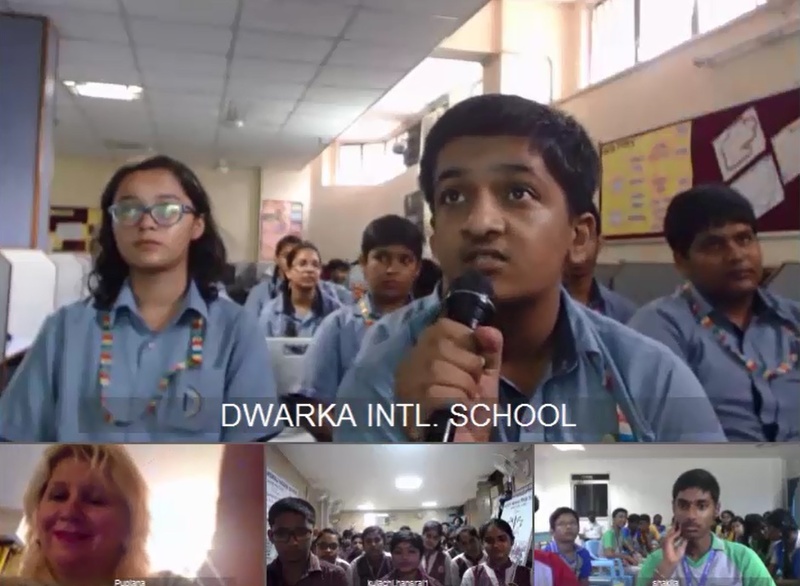 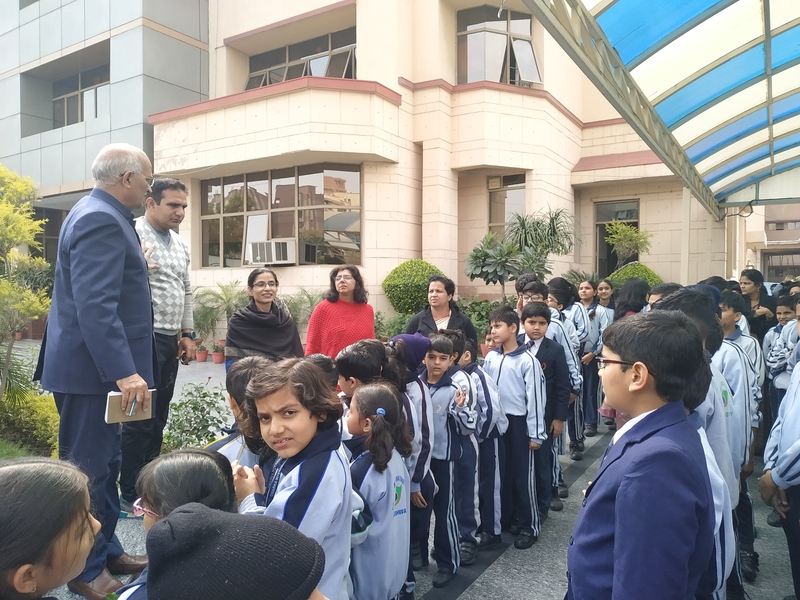 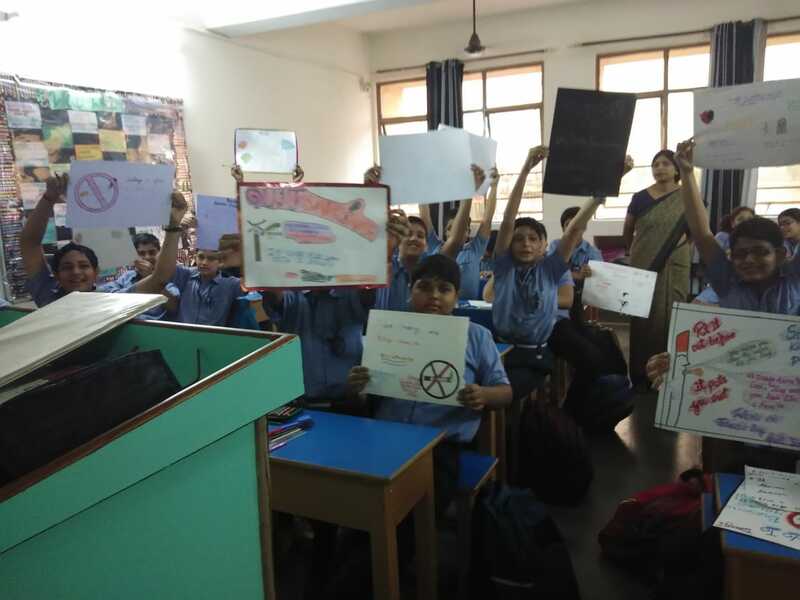 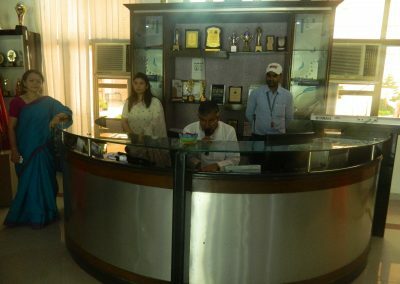 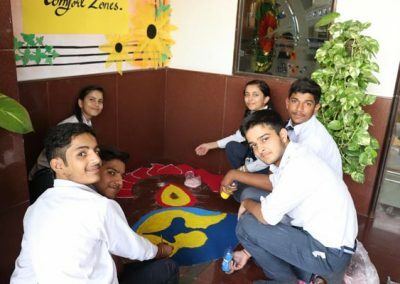 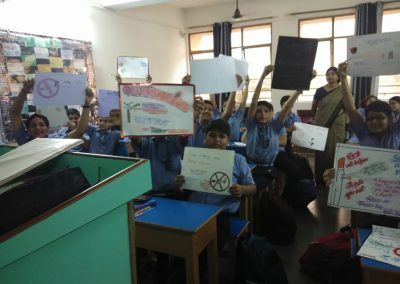 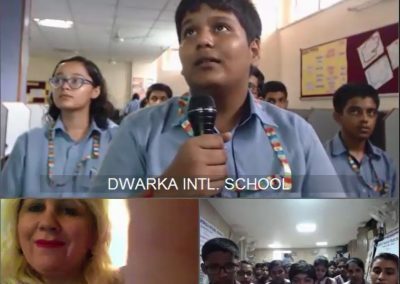 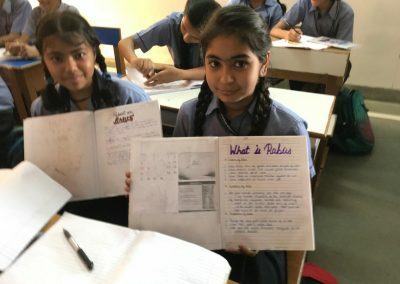 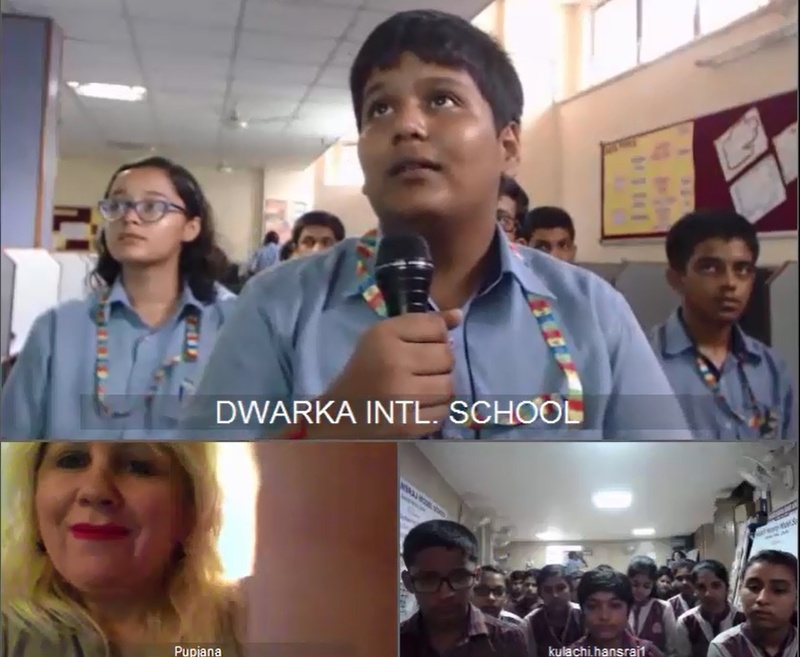 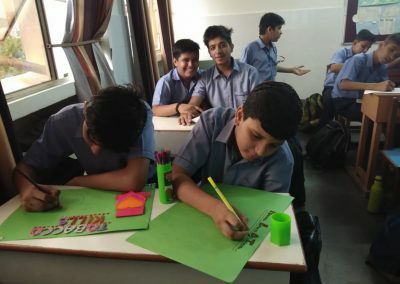 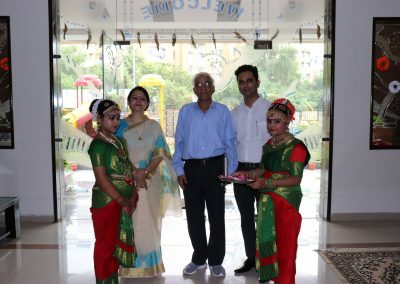 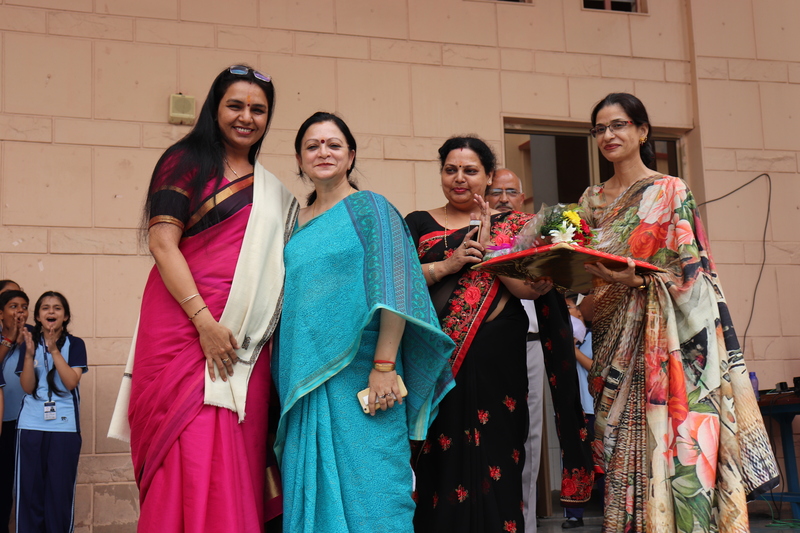 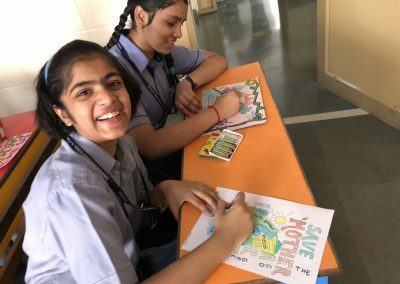 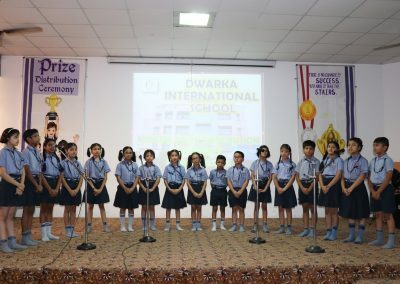 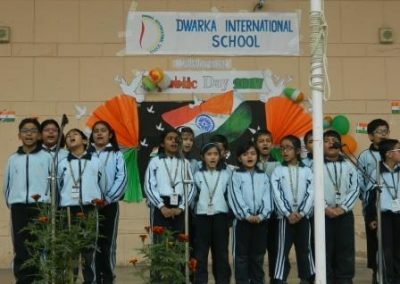 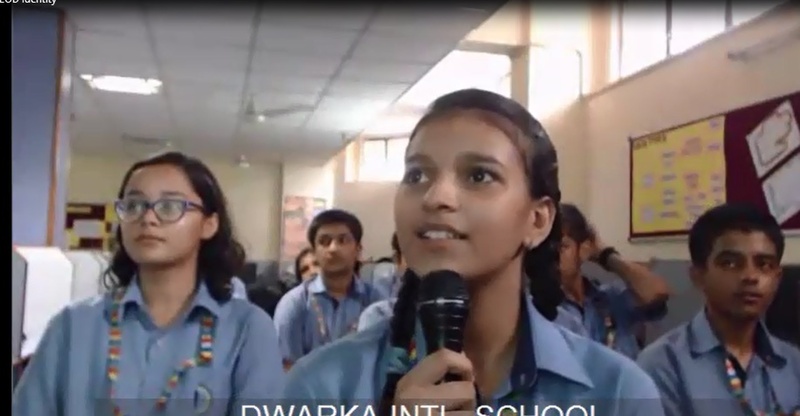 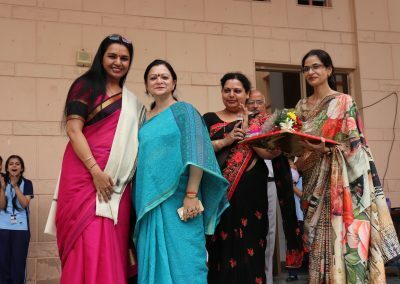 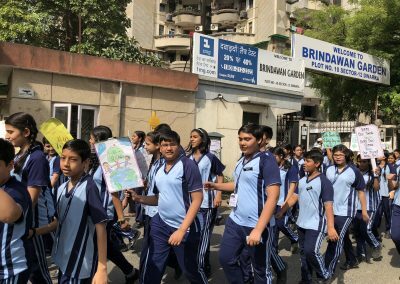 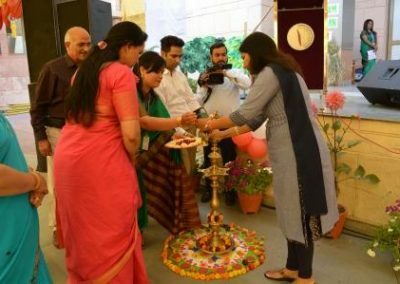 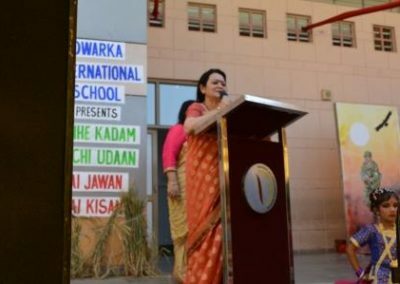 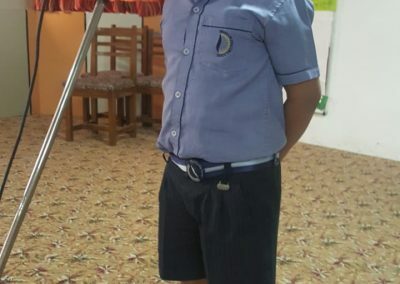 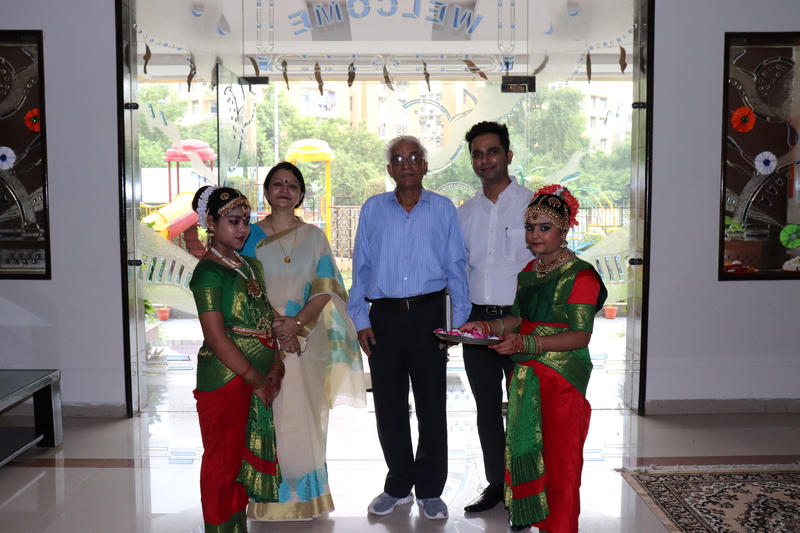 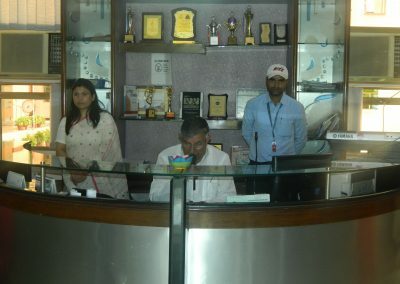 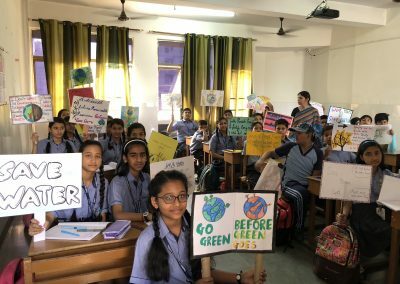 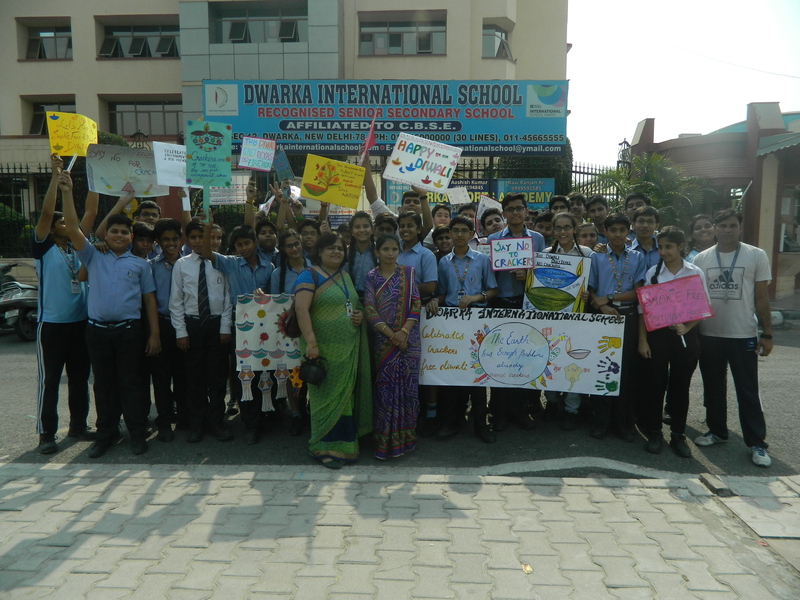 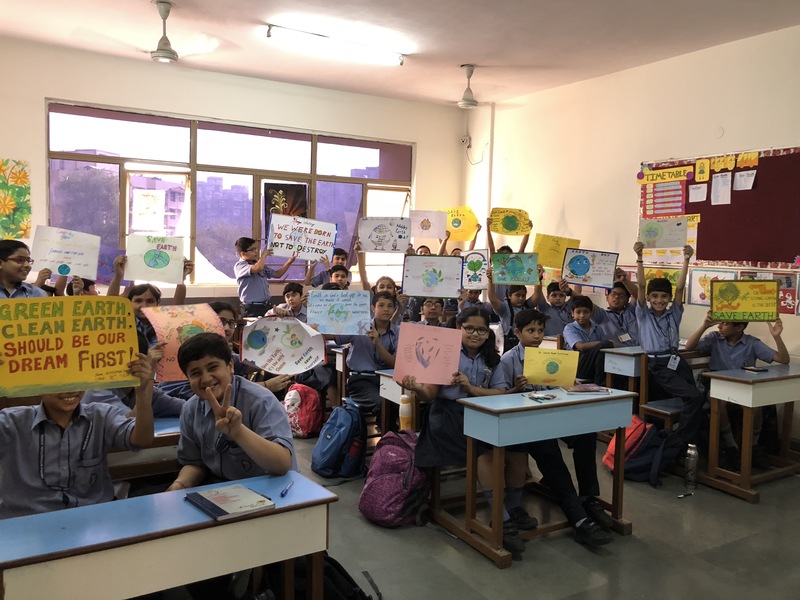 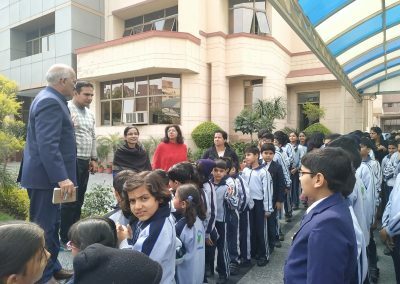 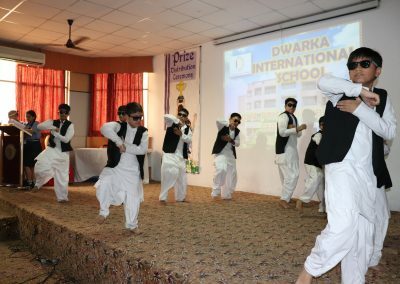 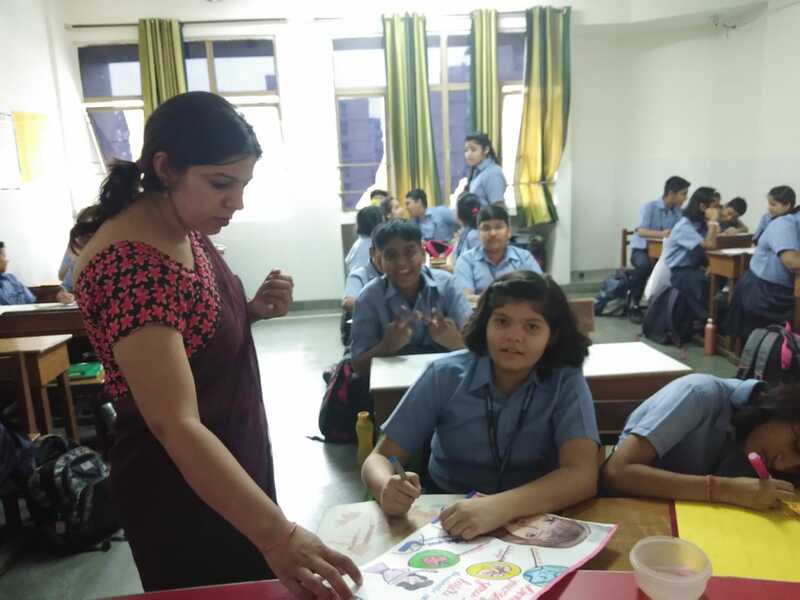 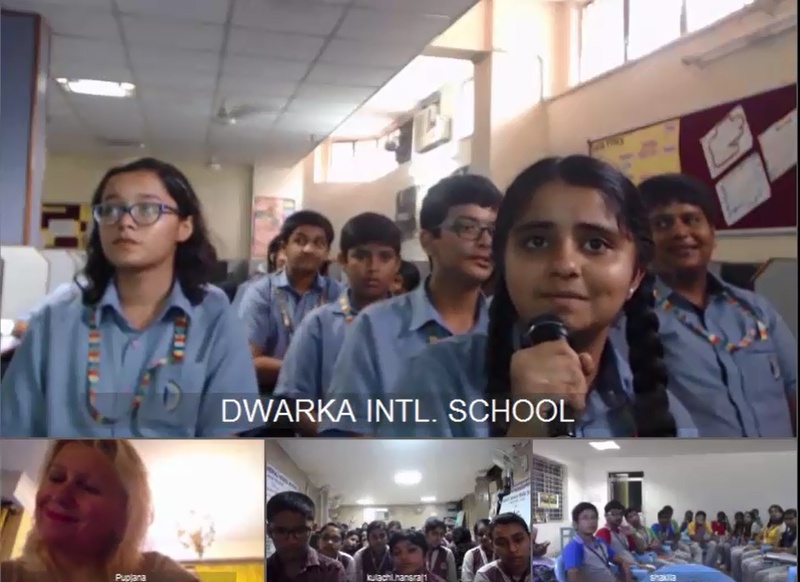 On the first day of Dwarka International School, teachers extended a warm welcome to the children as they stepped into the school and provided support at each step to help them find their respective classes. 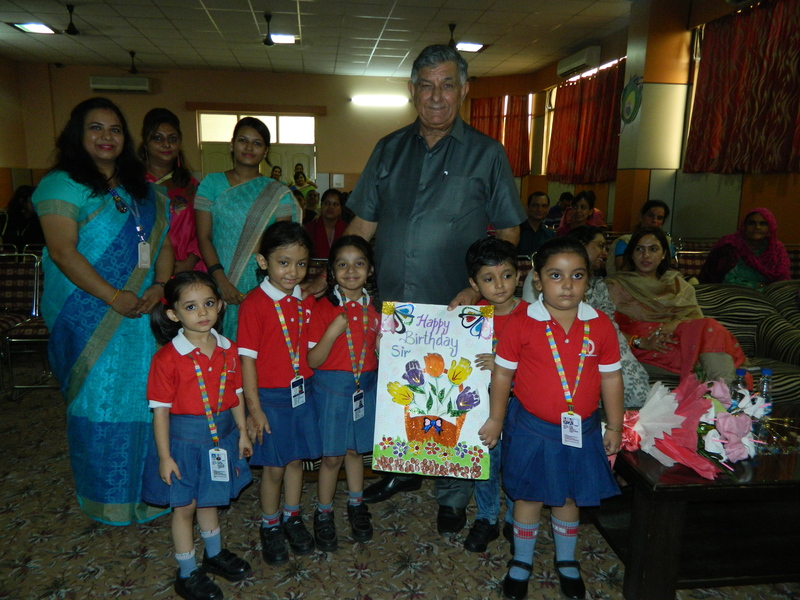 Children greeted teachers and felt glad catching up with their old friends. 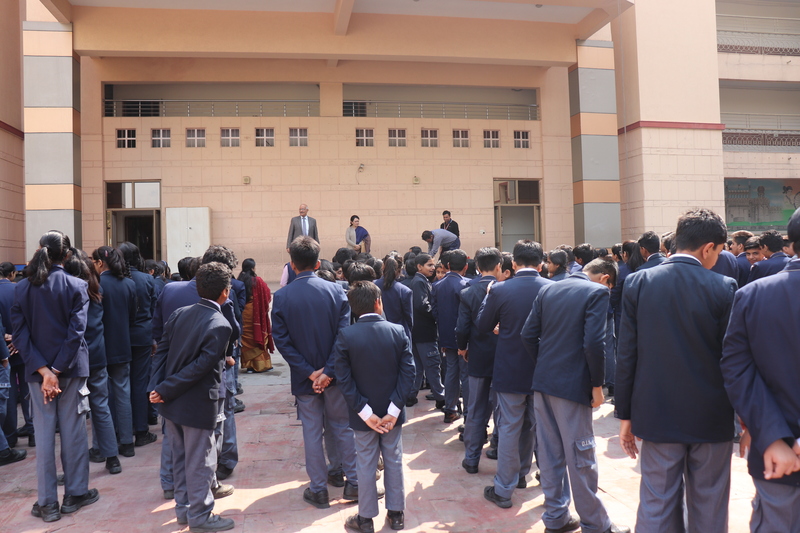 New students were given a cordial atmosphere to make them feel cozy and comfortable. 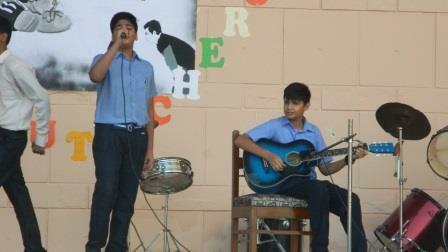 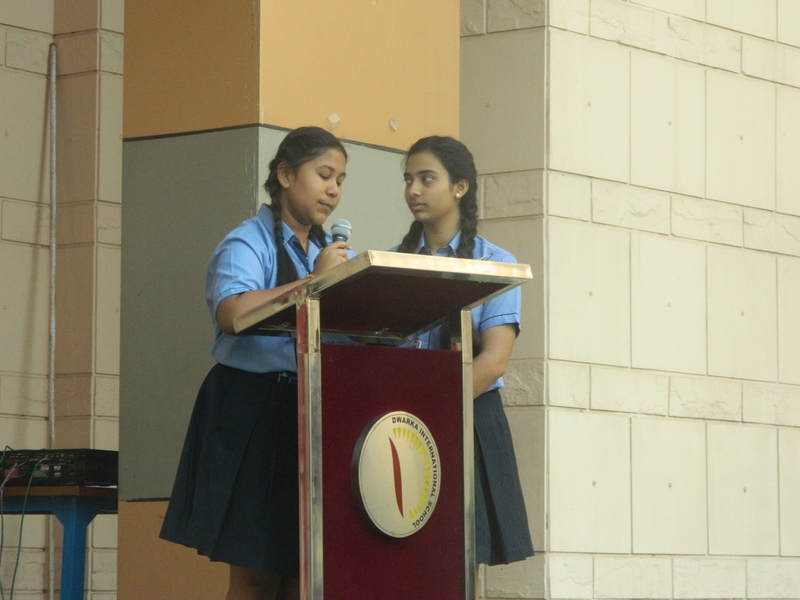 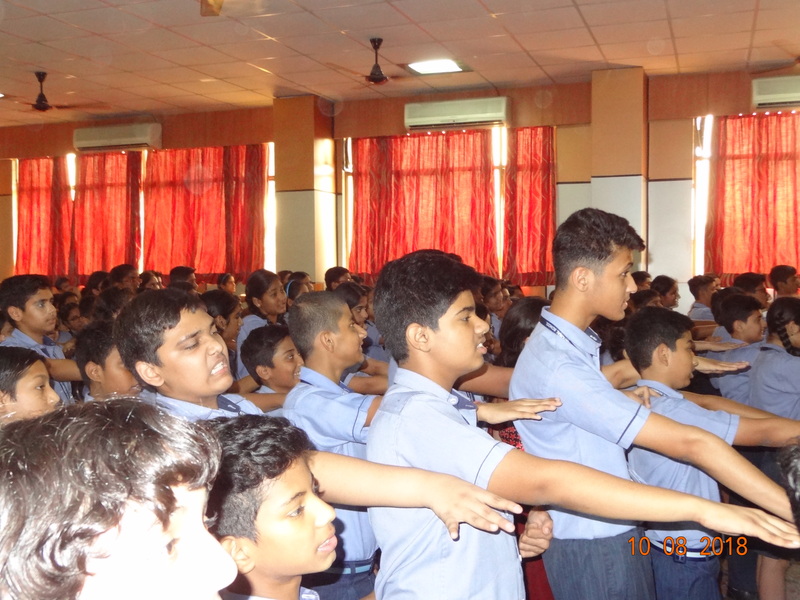 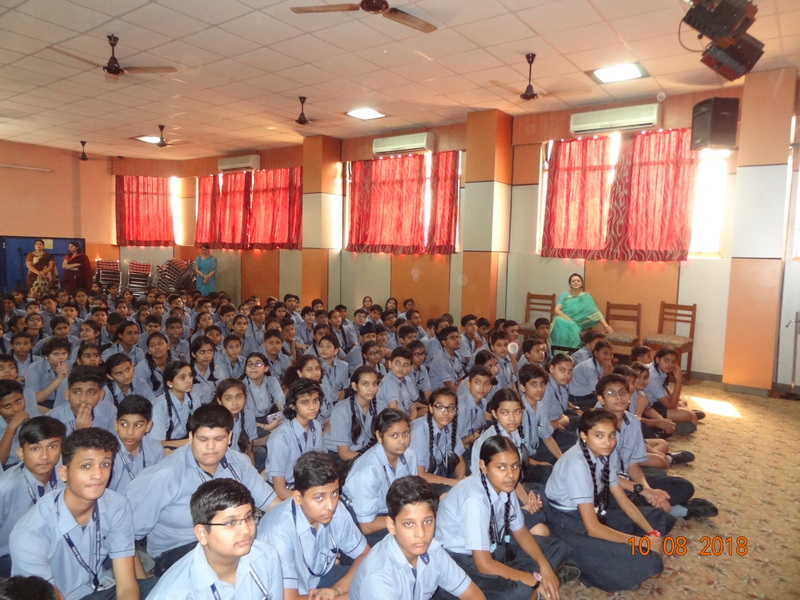 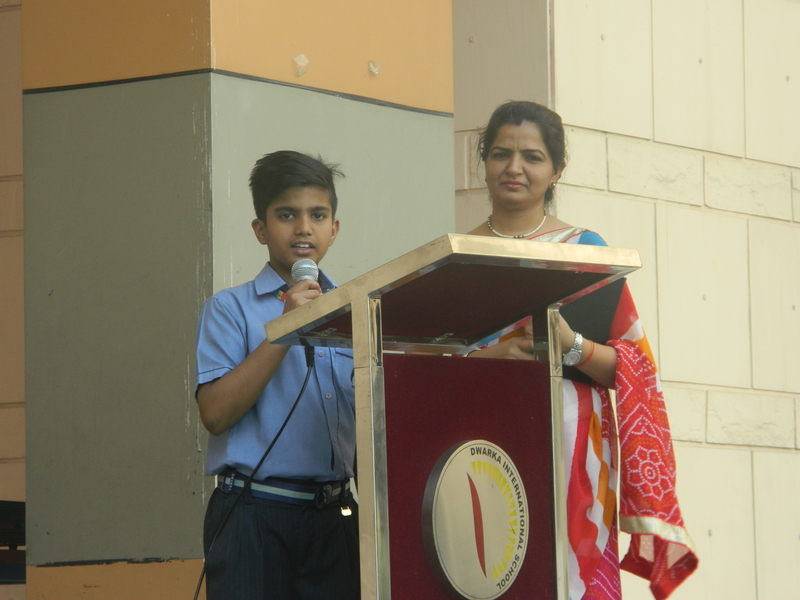 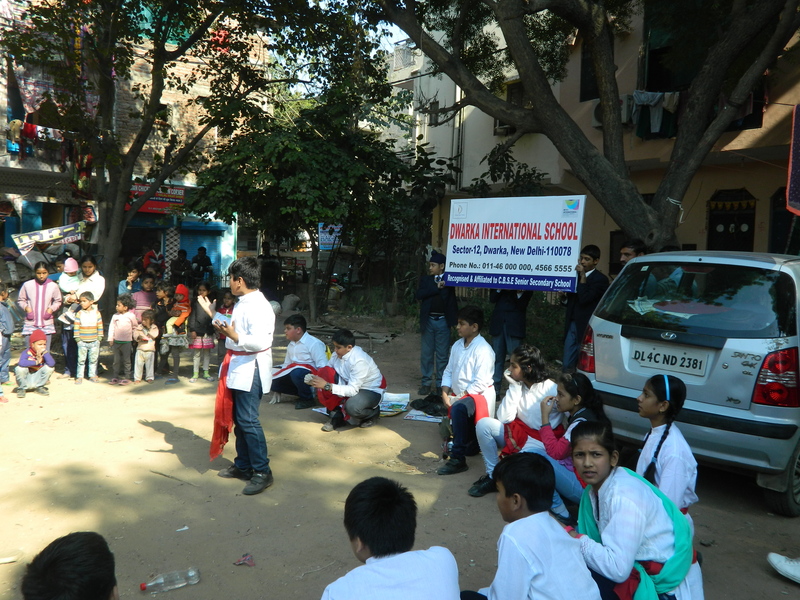 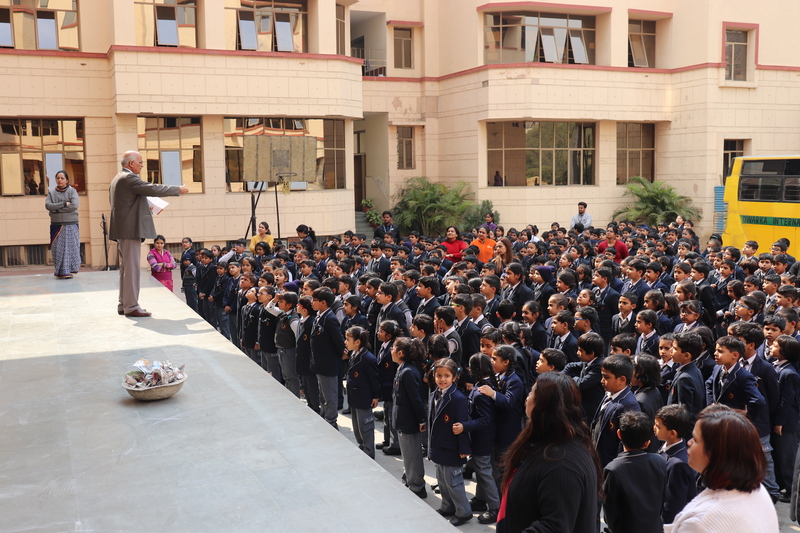 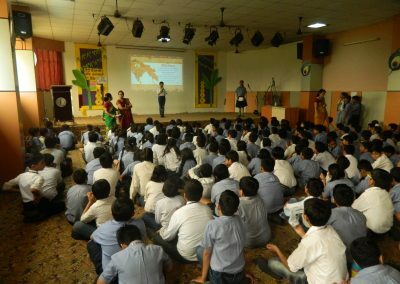 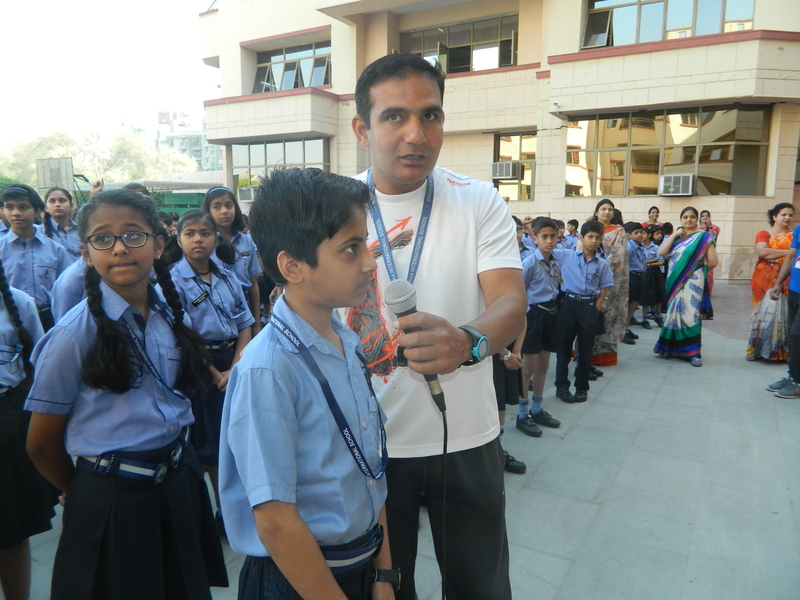 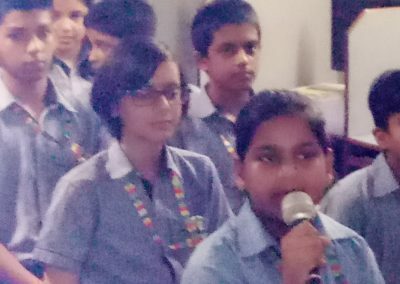 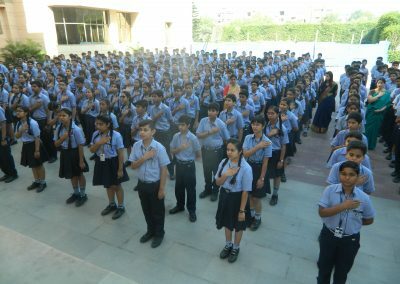 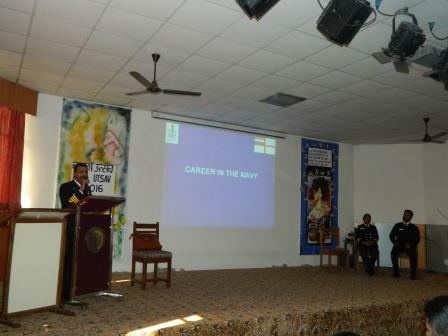 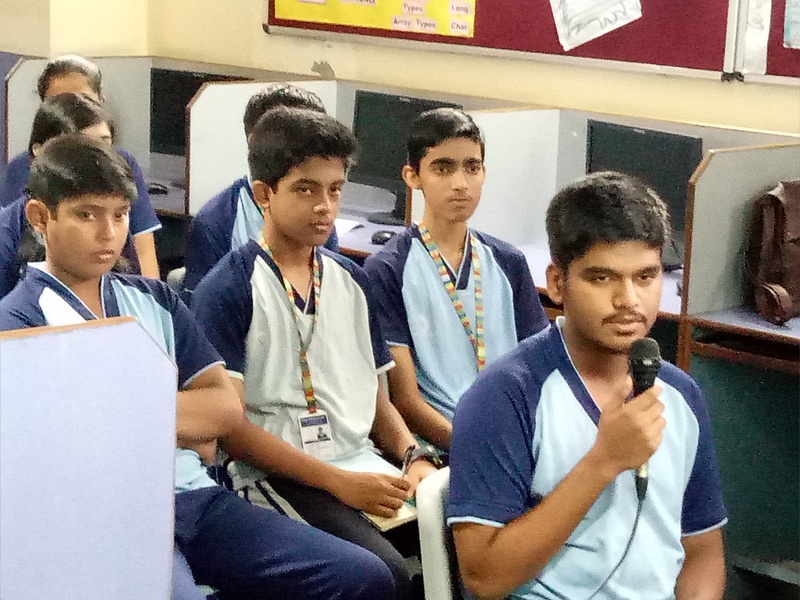 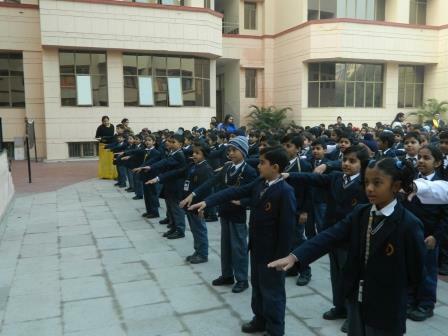 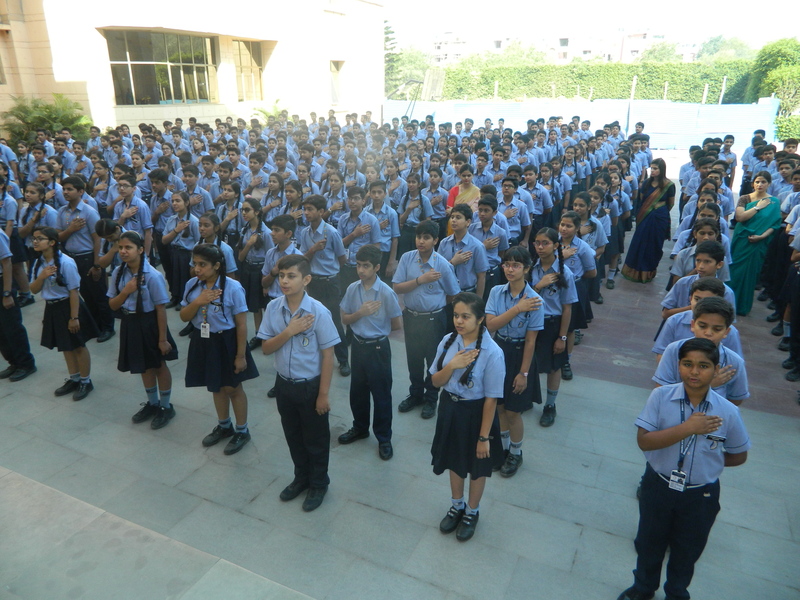 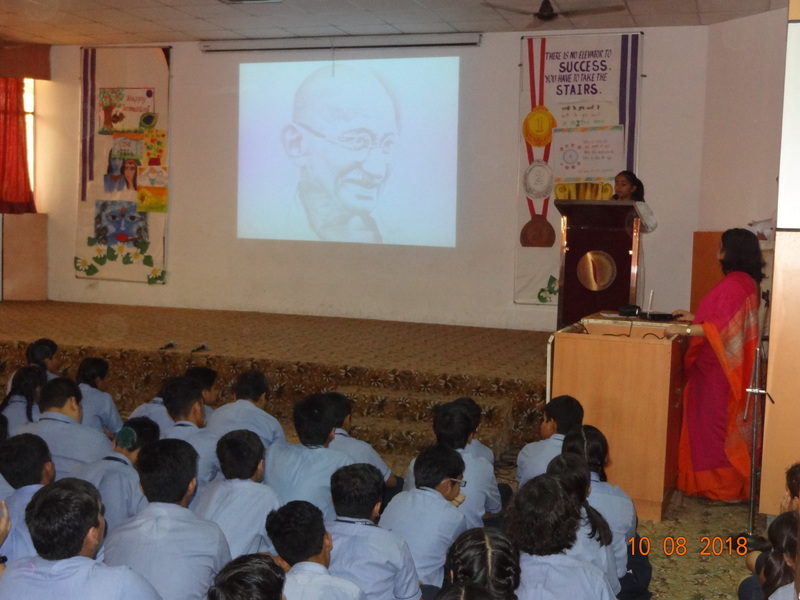 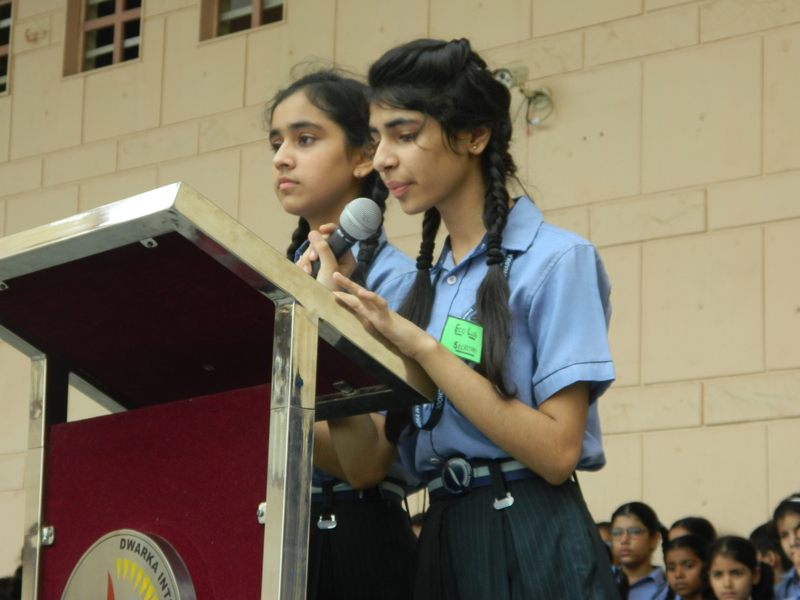 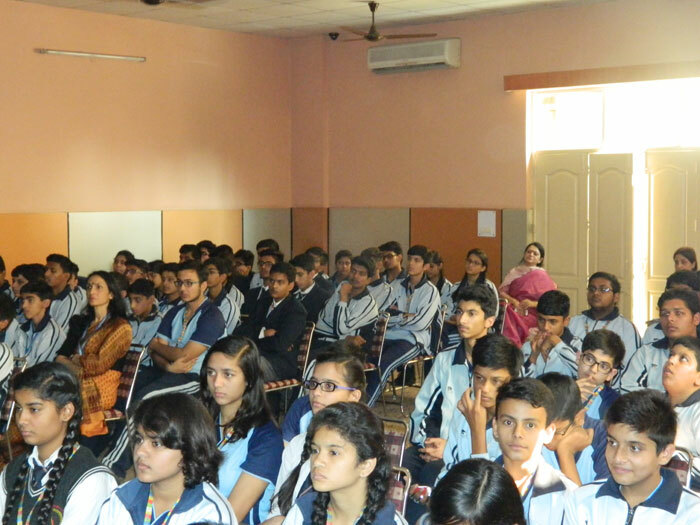 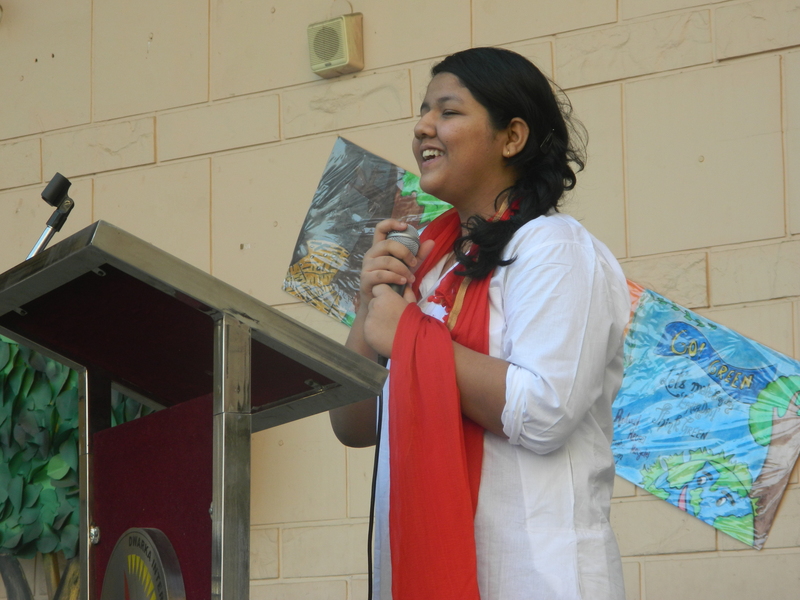 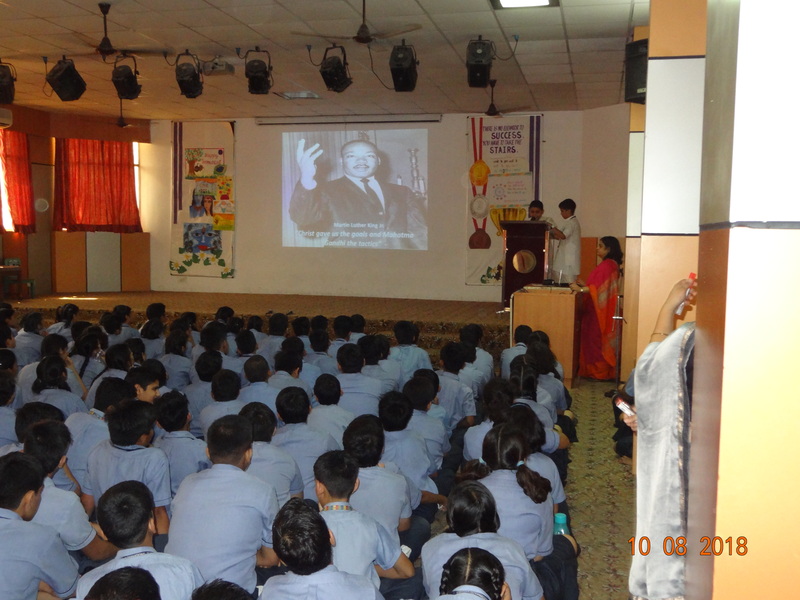 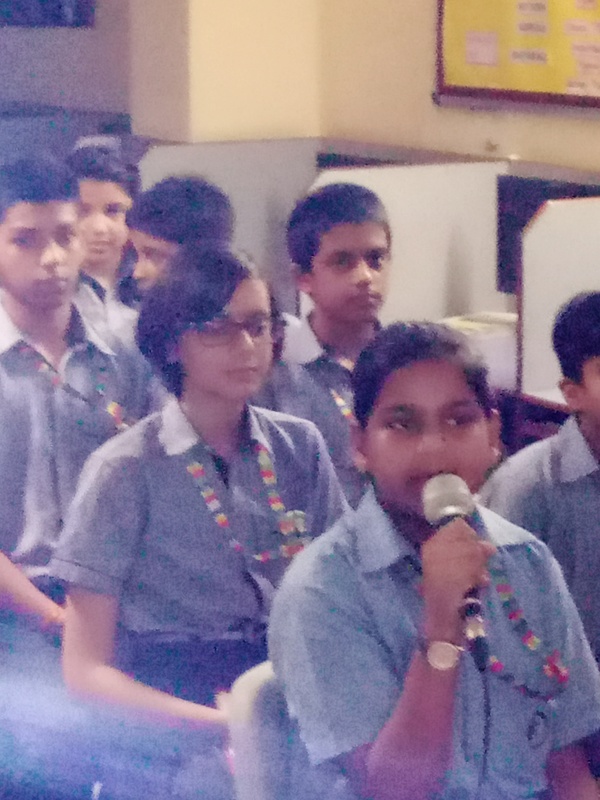 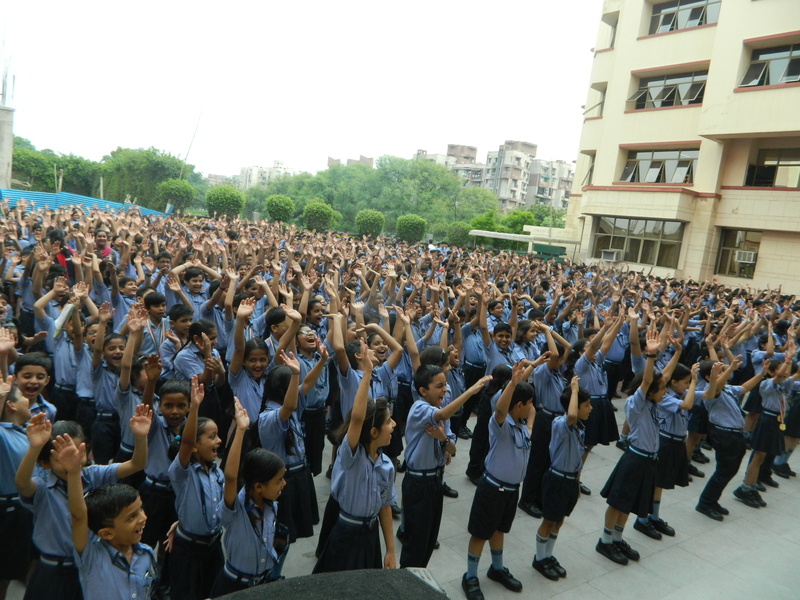 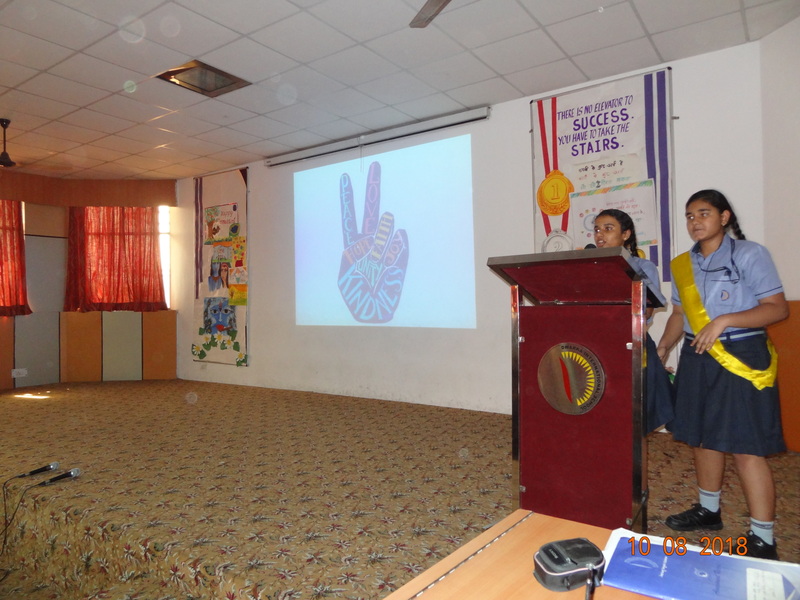 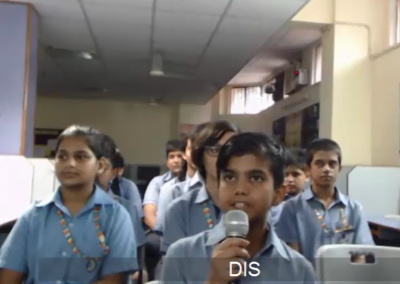 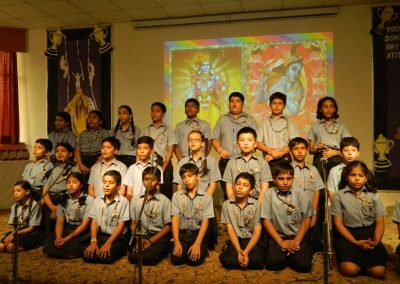 An assembly was conducted in the morning to refresh the students and all prayed for a successful year ahead. 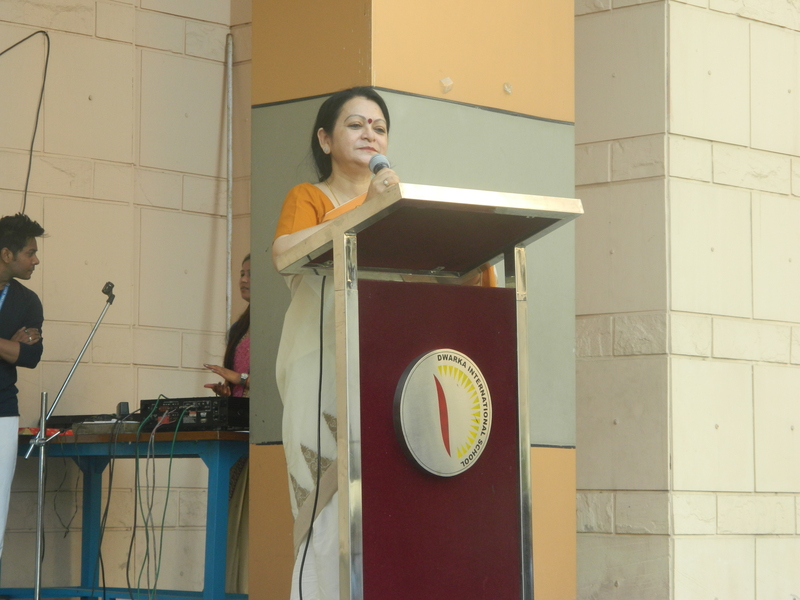 Principal ma’am graced the stage and shared a few words to encourage and inspire students for leading another fruitful year. 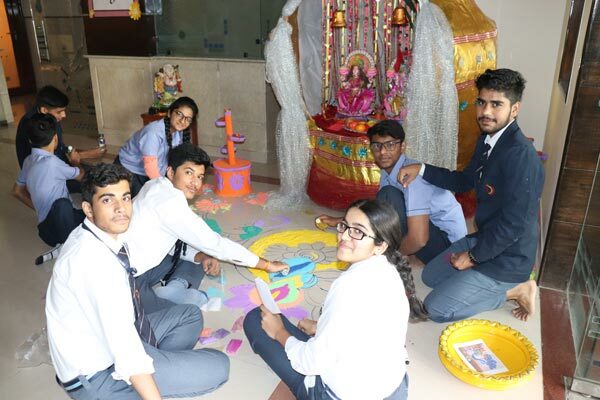 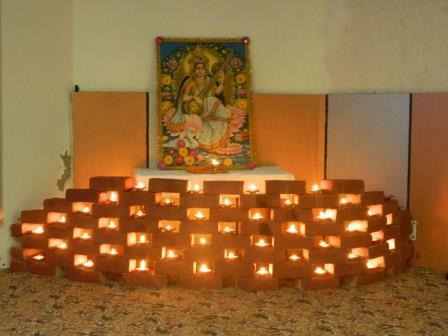 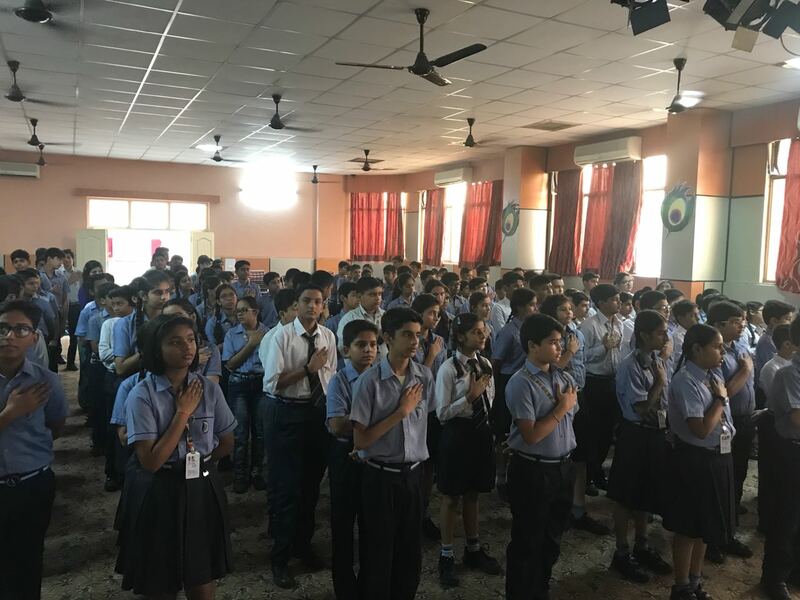 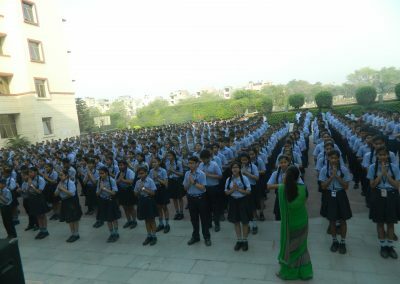 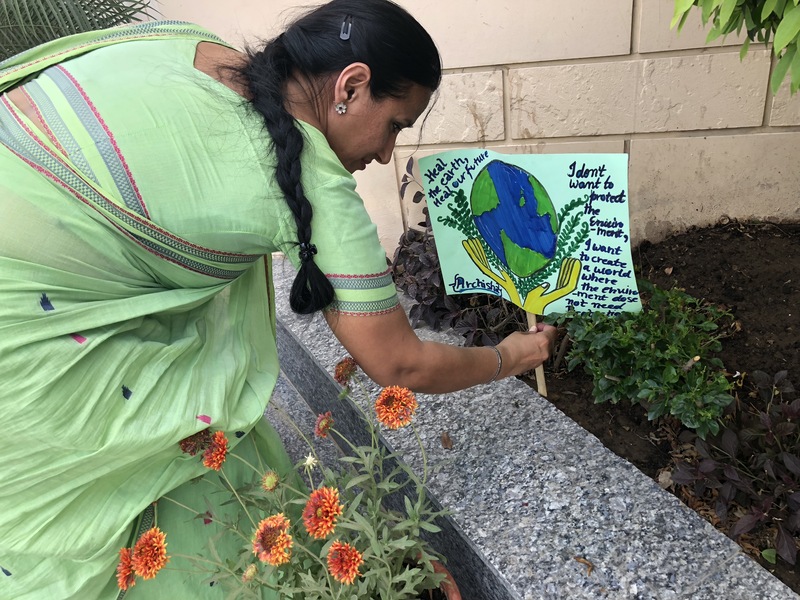 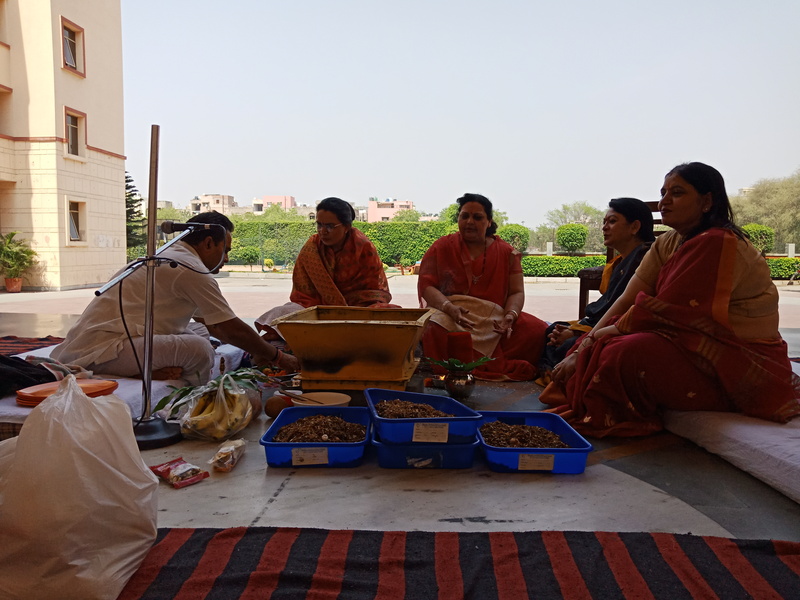 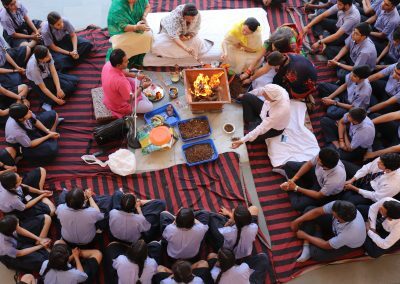 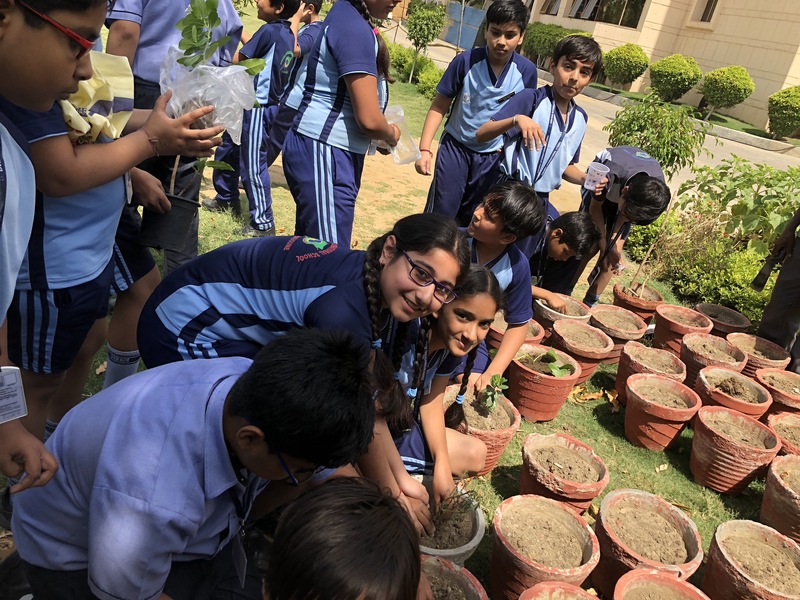 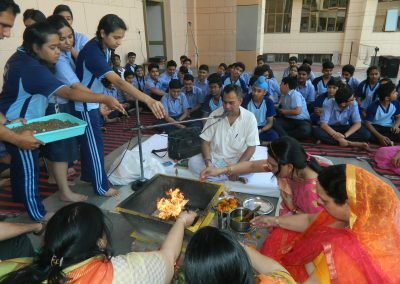 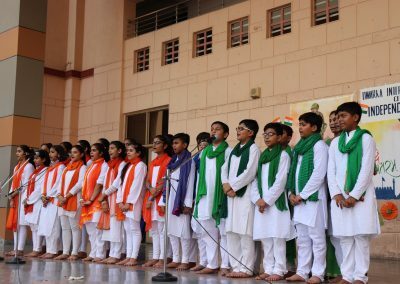 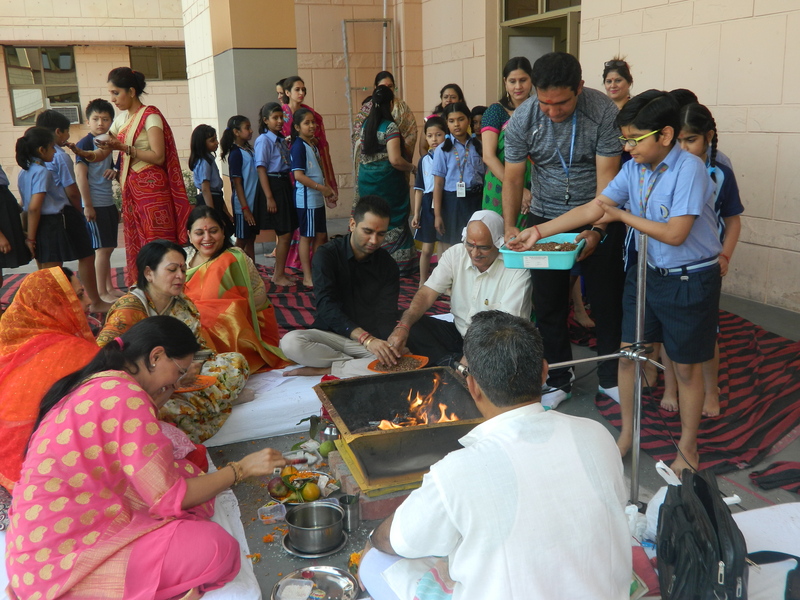 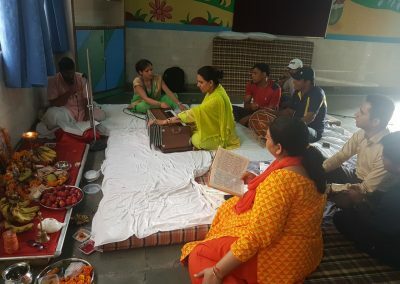 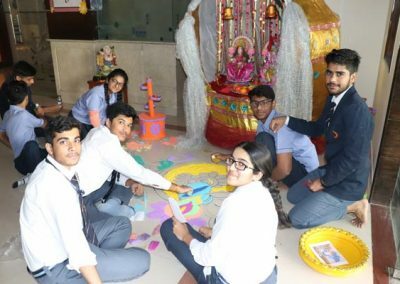 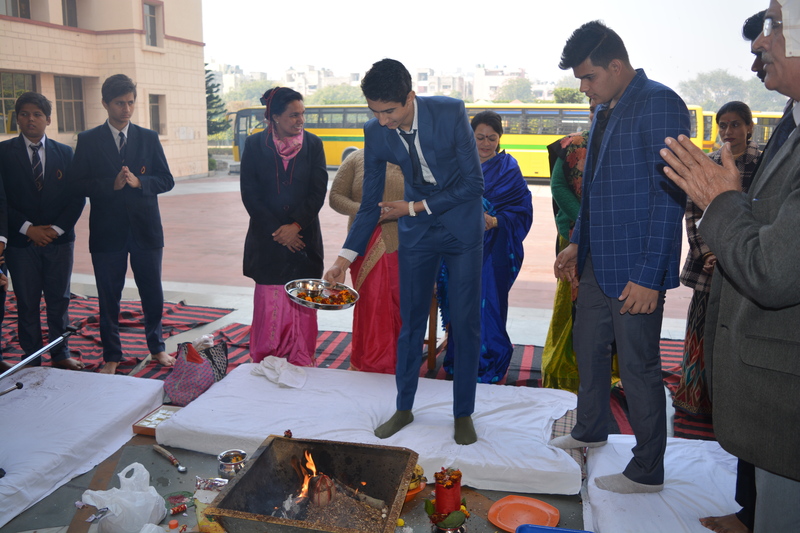 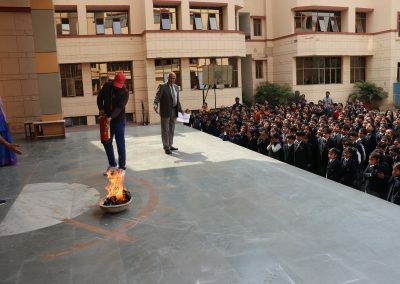 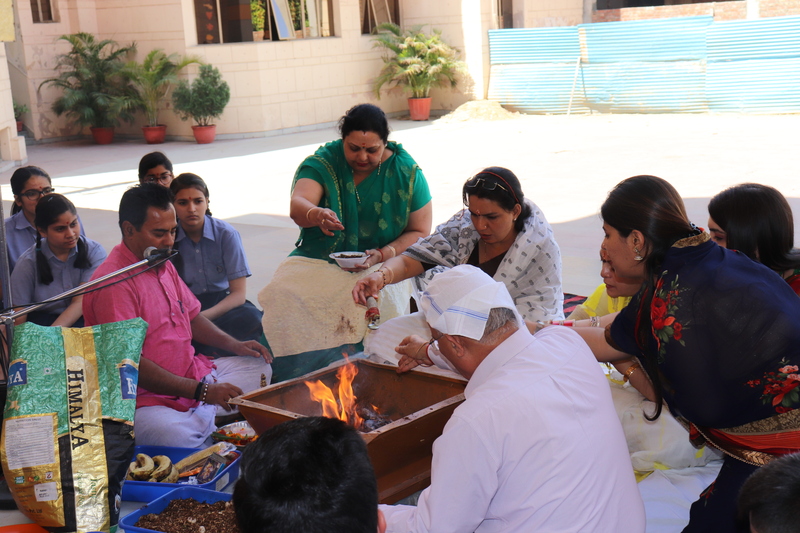 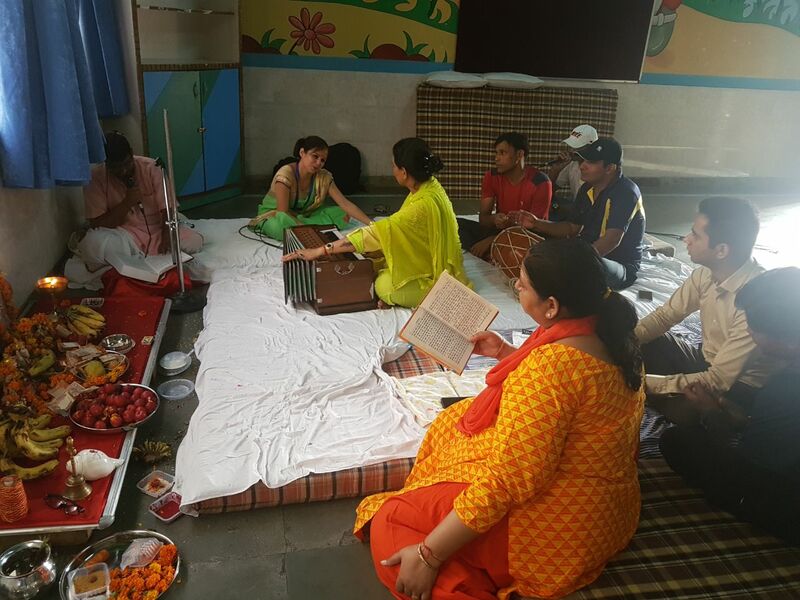 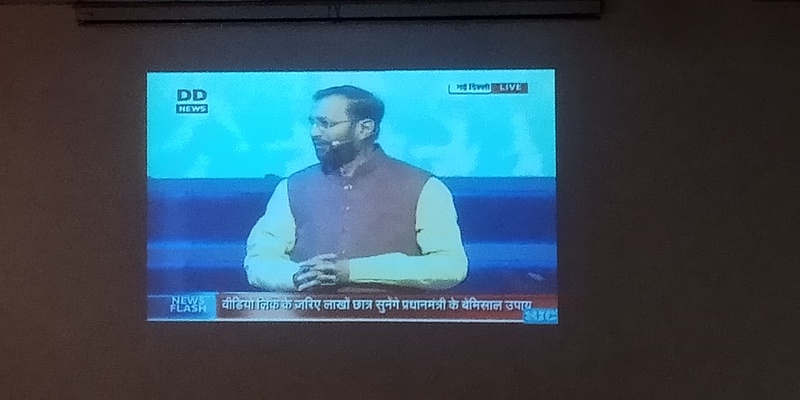 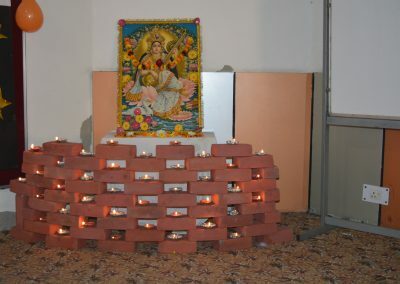 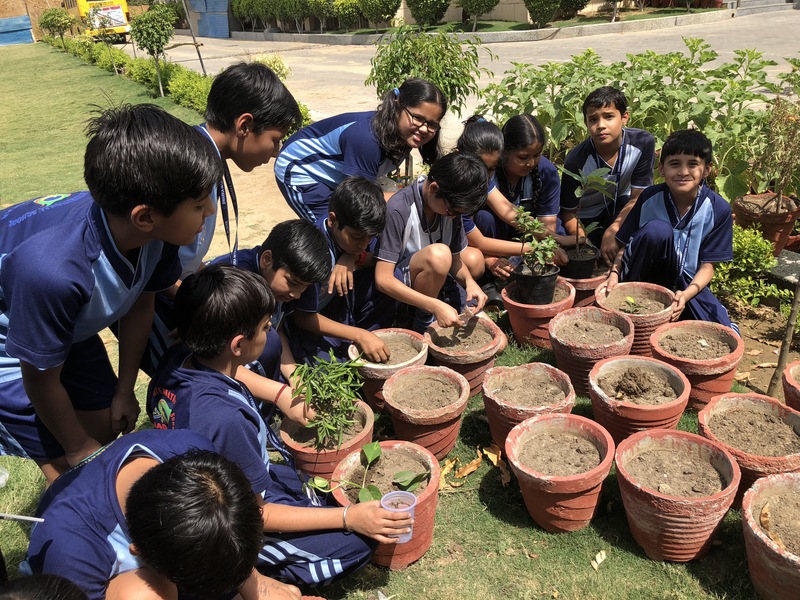 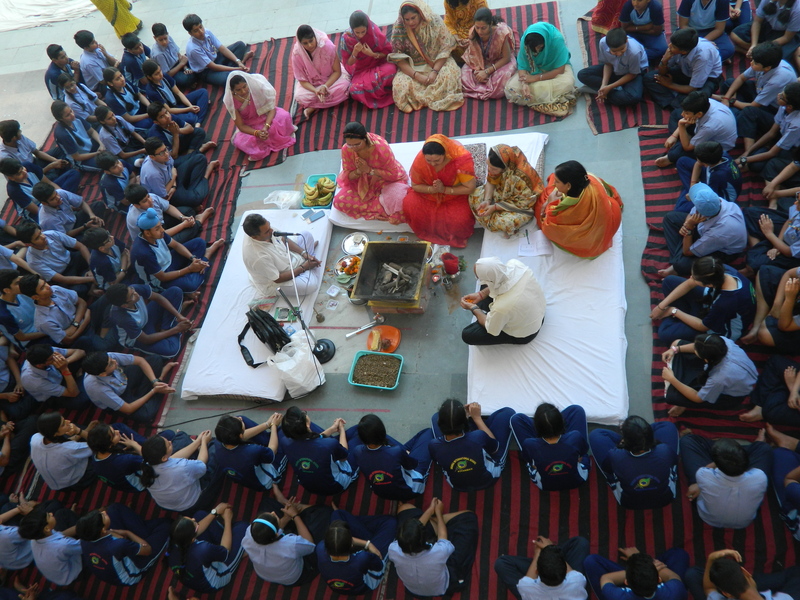 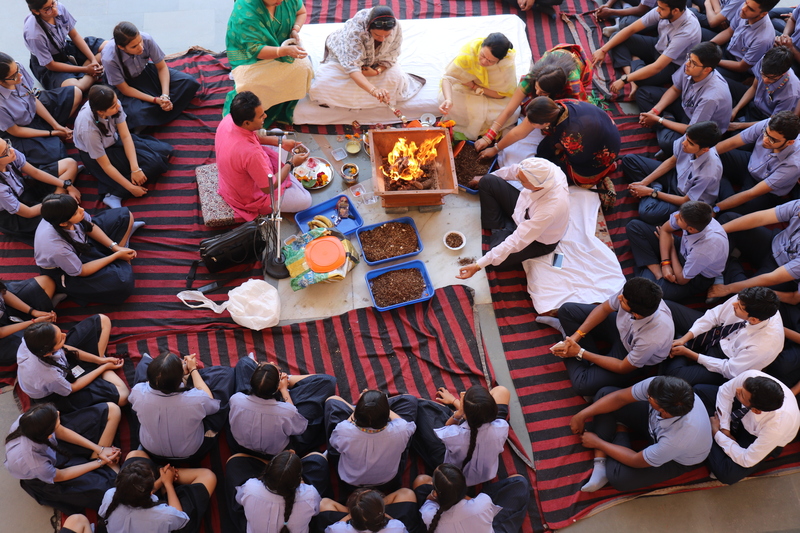 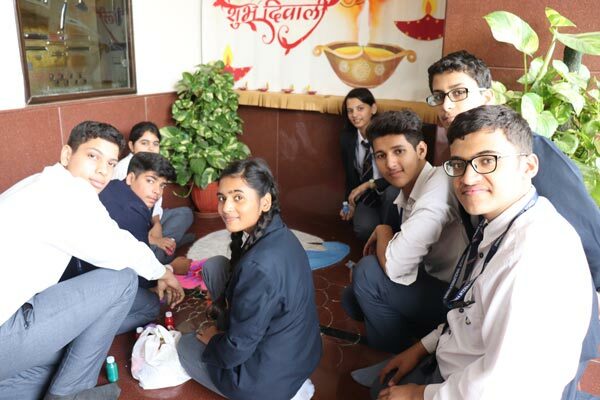 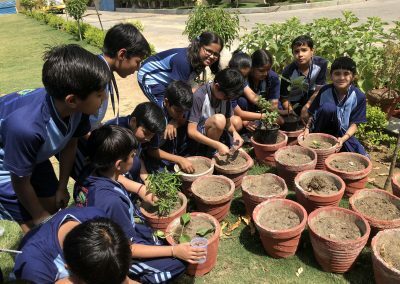 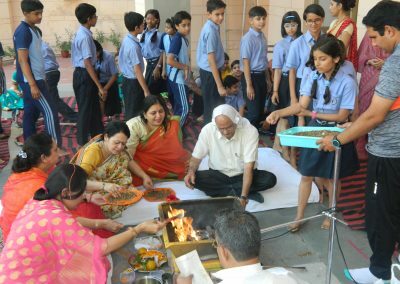 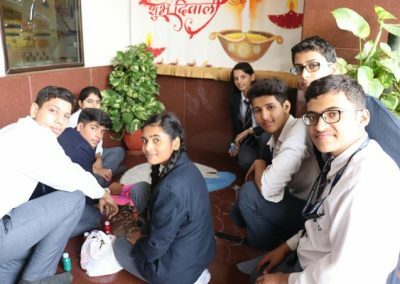 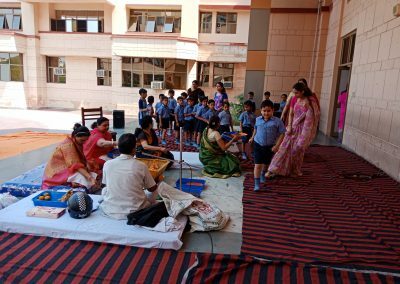 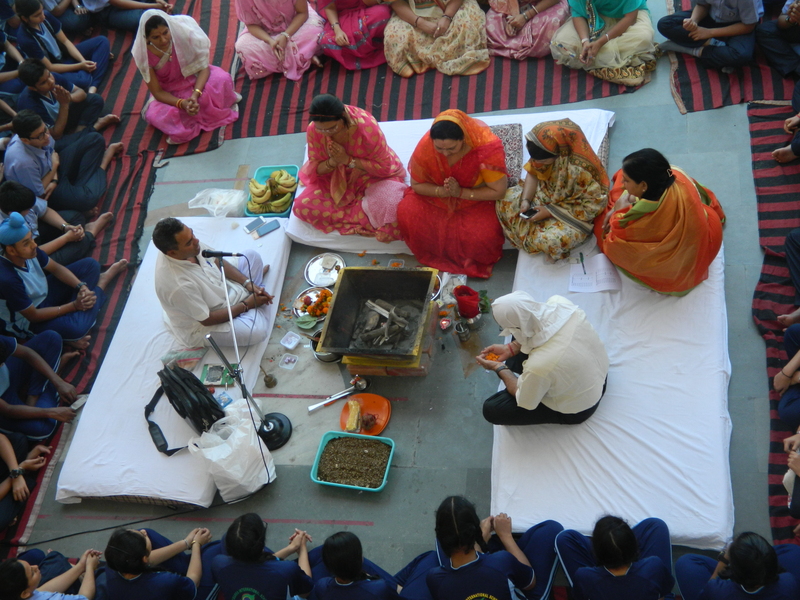 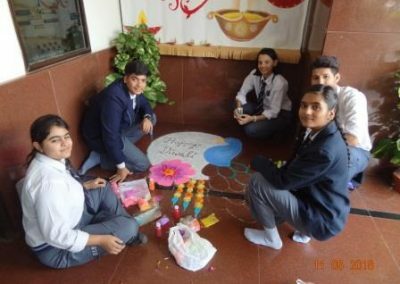 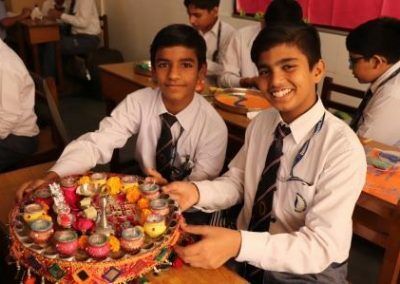 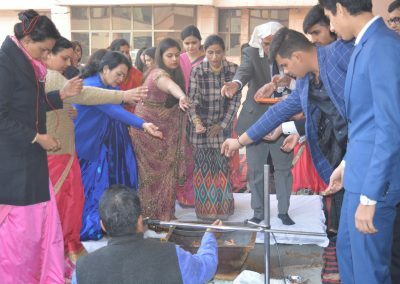 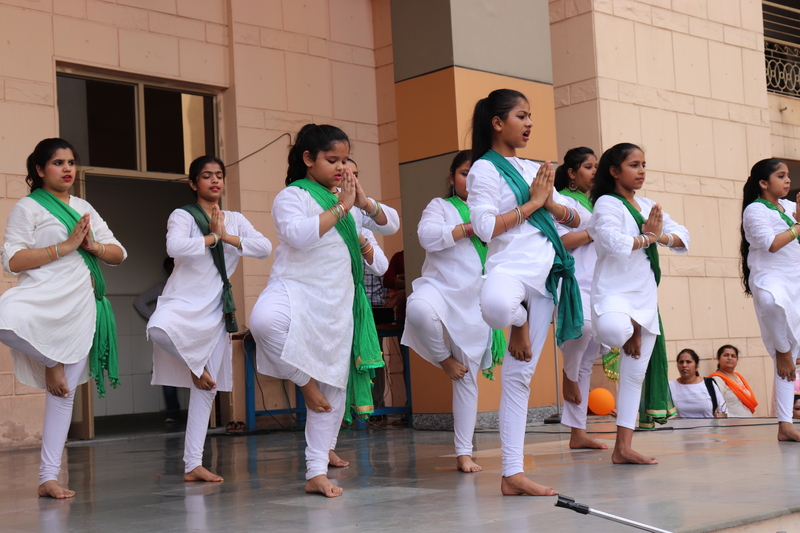 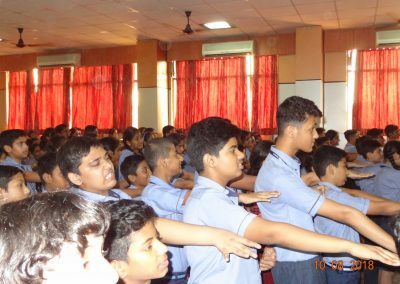 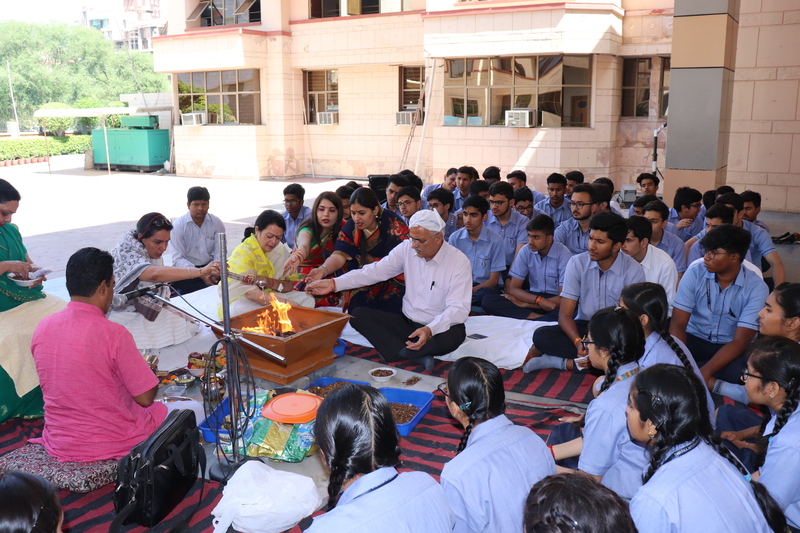 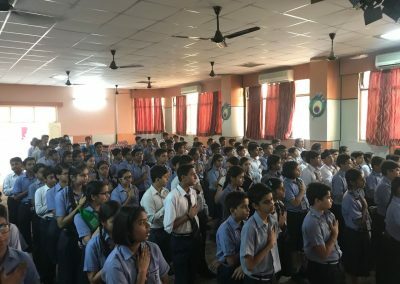 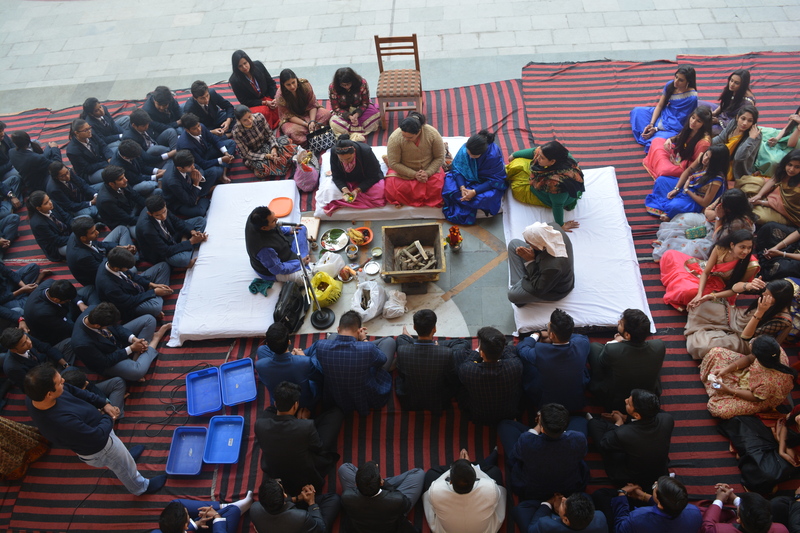 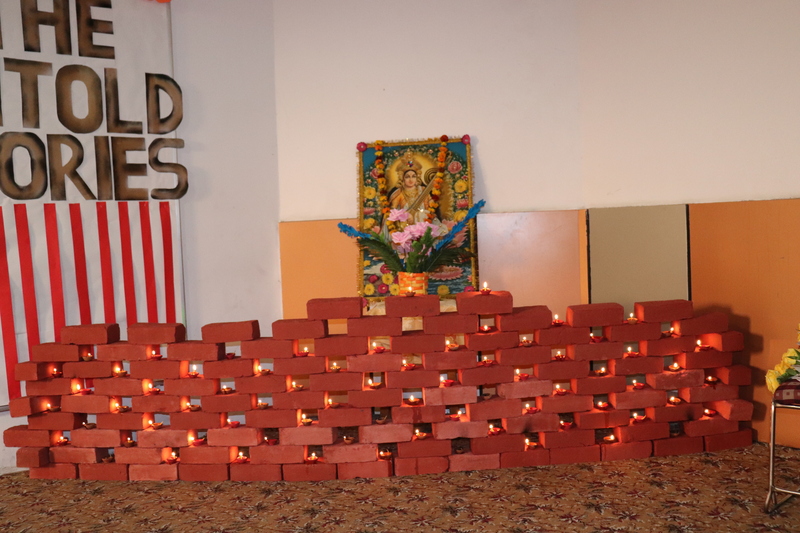 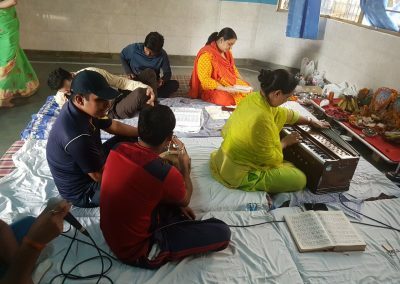 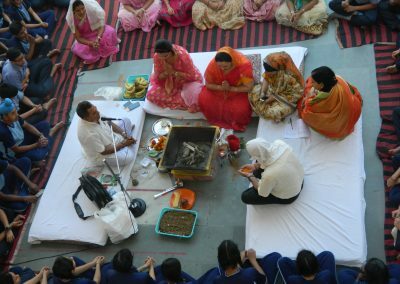 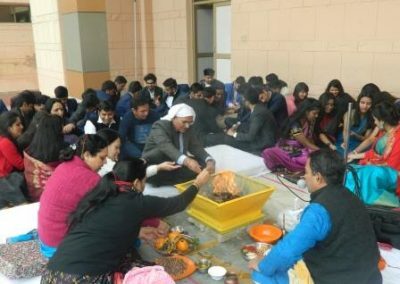 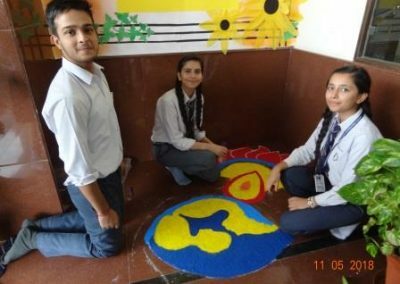 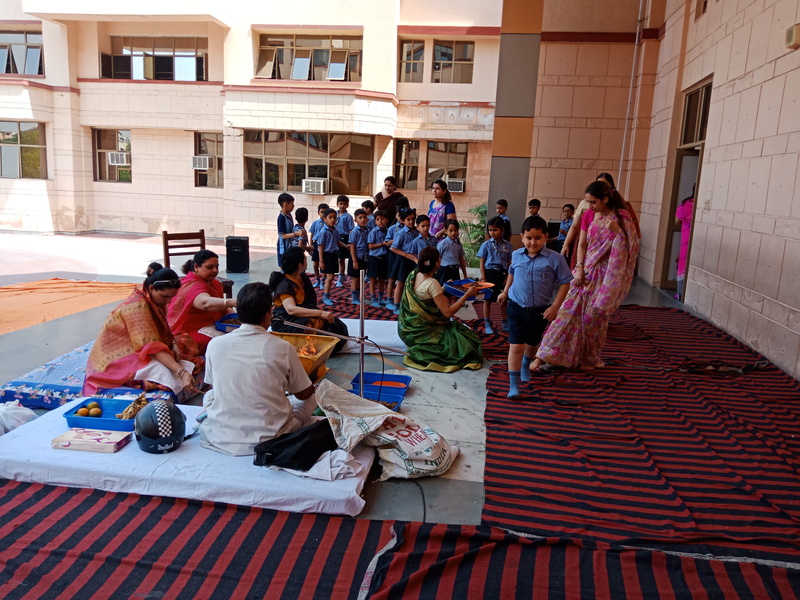 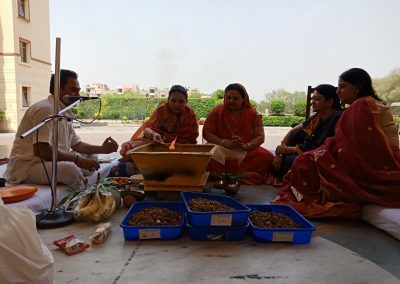 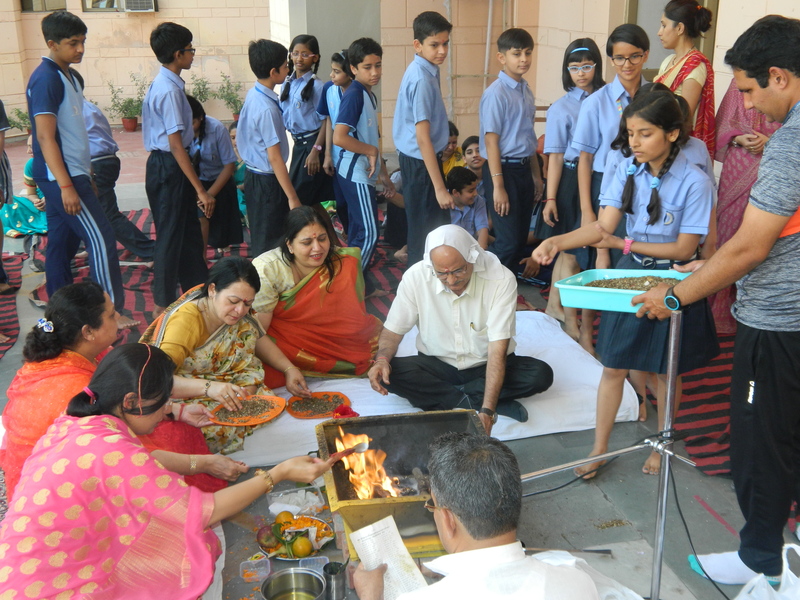 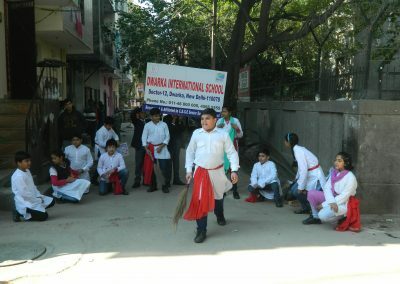 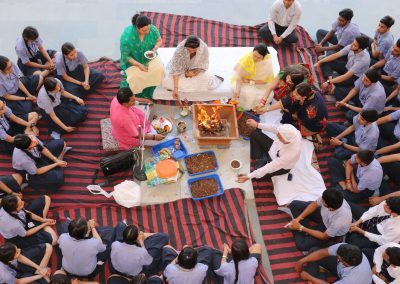 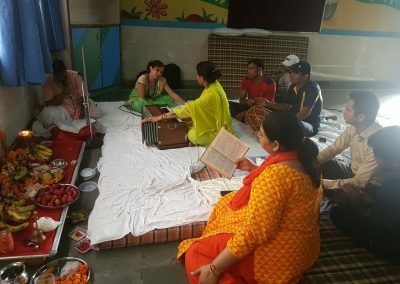 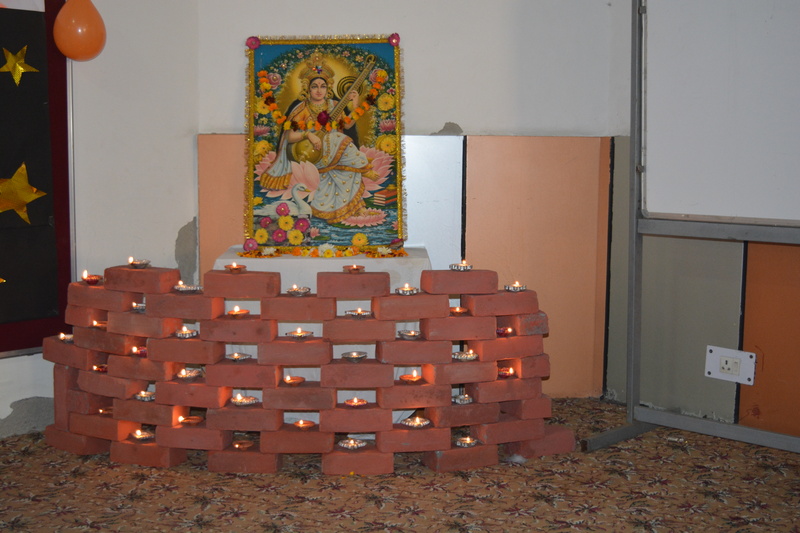 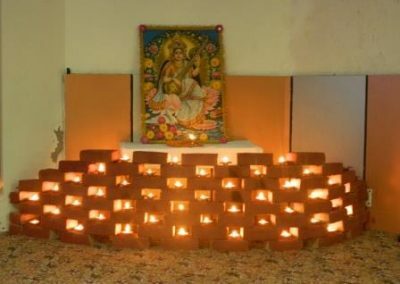 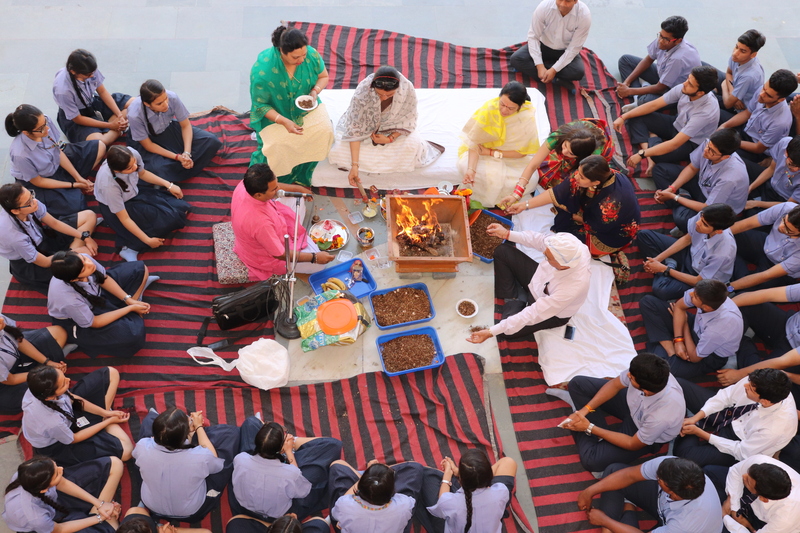 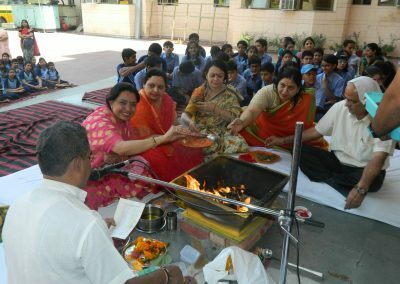 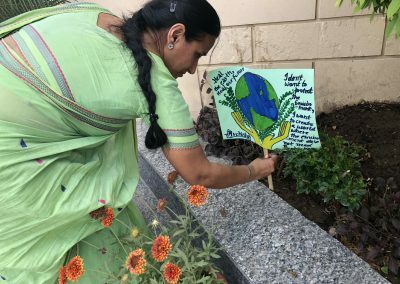 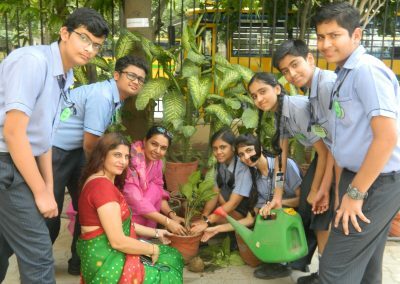 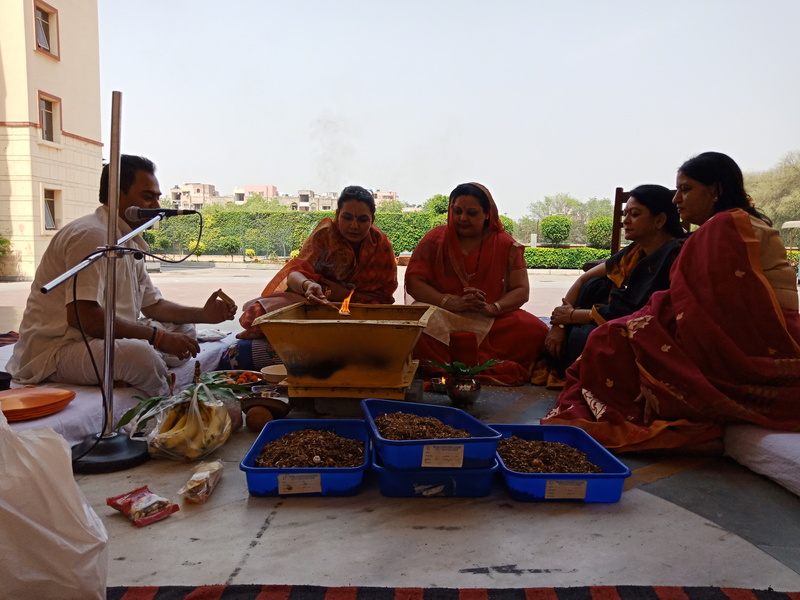 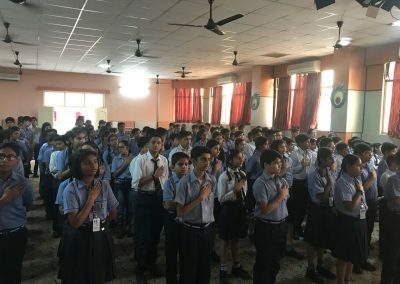 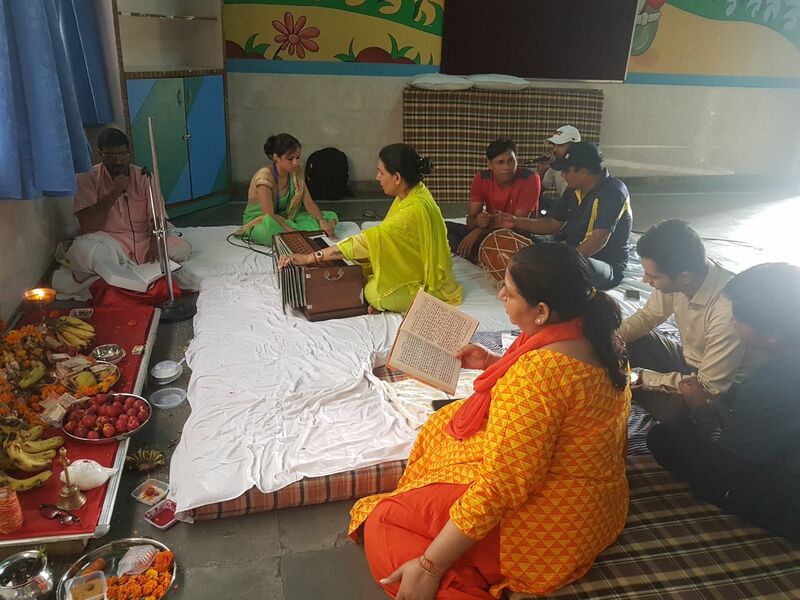 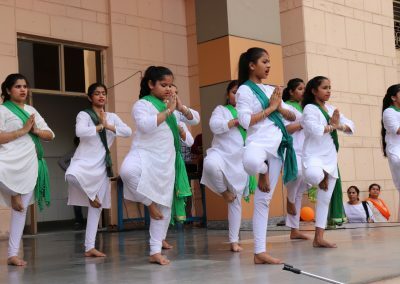 Hawan ritual was performed on the first day for purification of Mind, Body, Soul and the Environment and to instill positivity in the school. 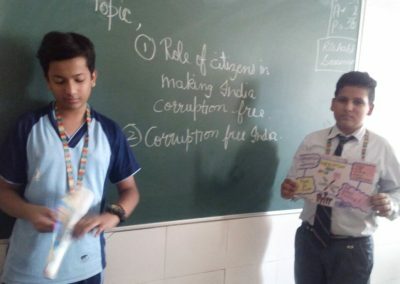 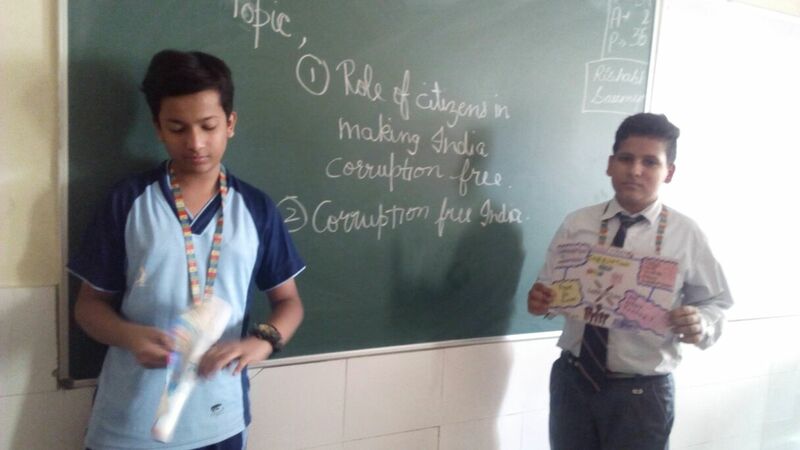 In the classrooms, teachers discussed the code of conduct mentioned in link book aiming to equip children with sincere code of ethics. 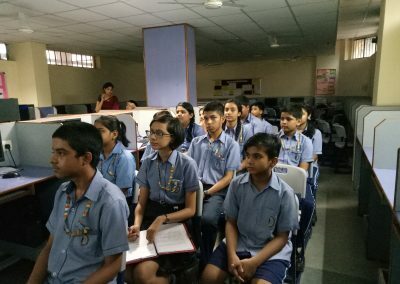 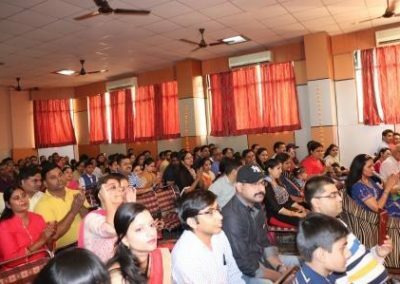 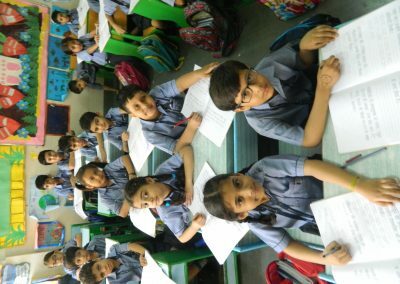 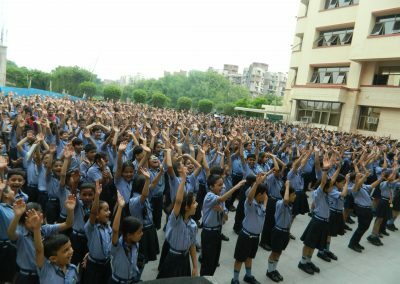 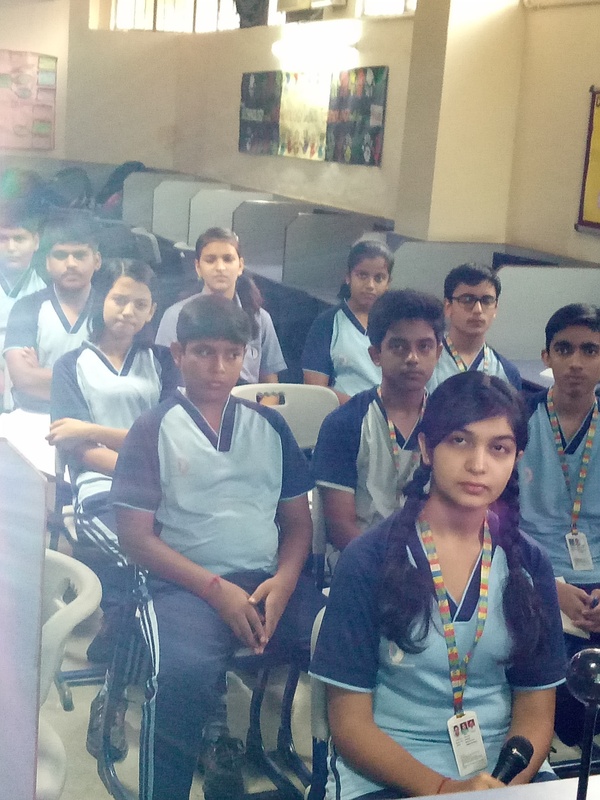 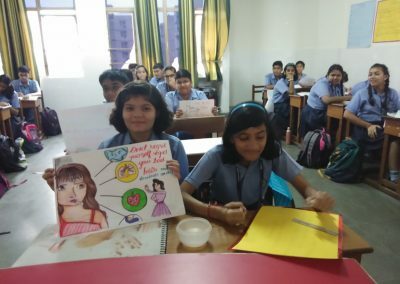 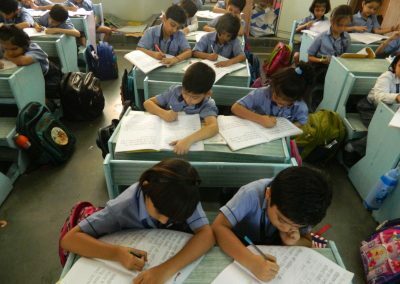 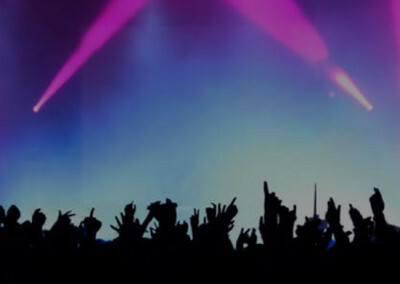 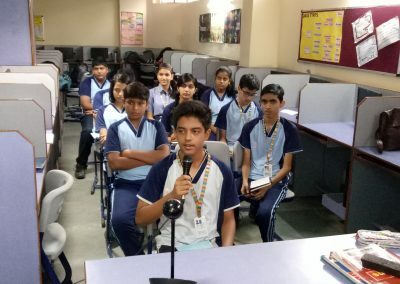 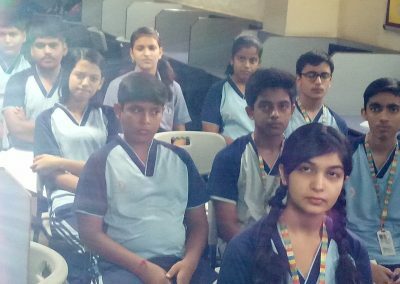 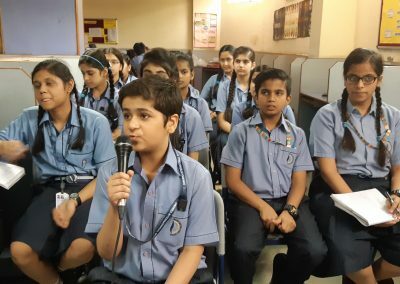 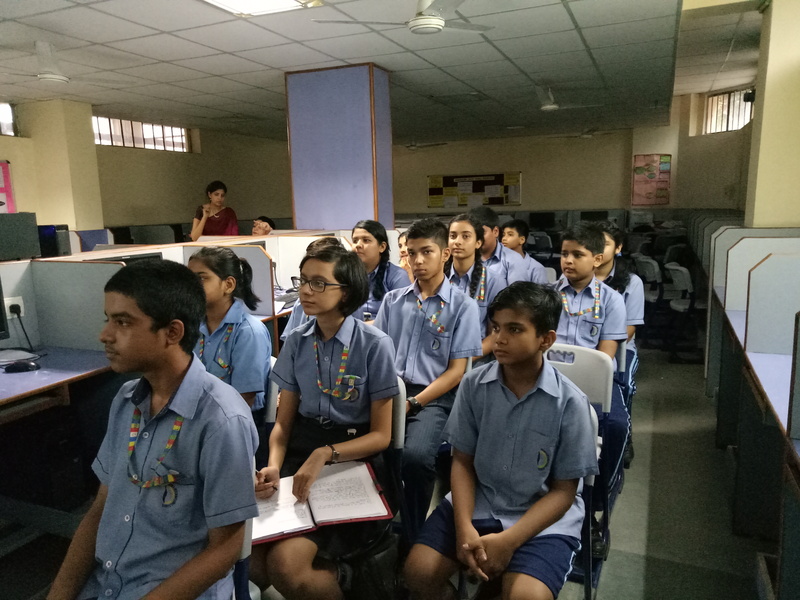 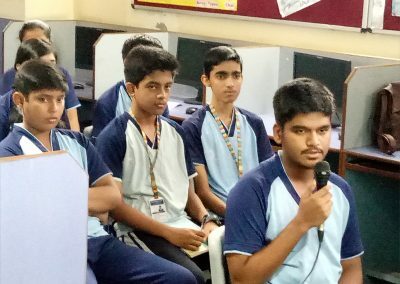 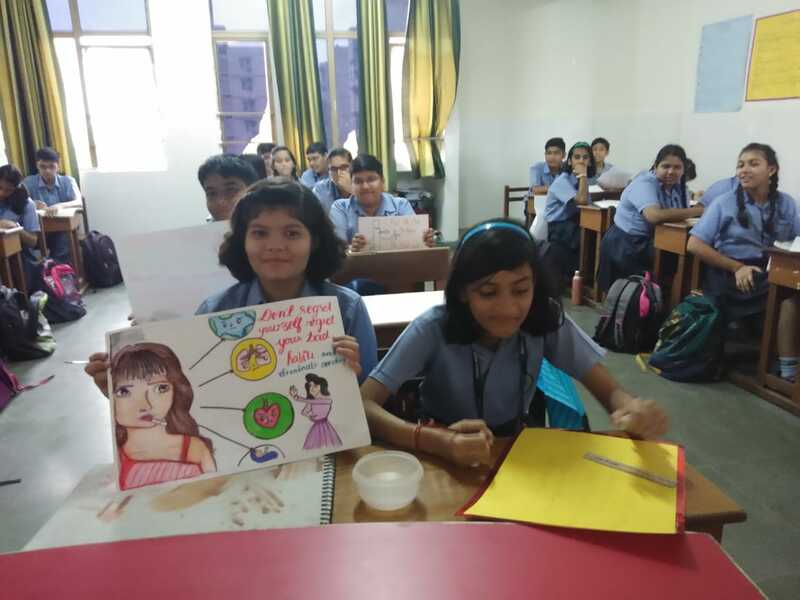 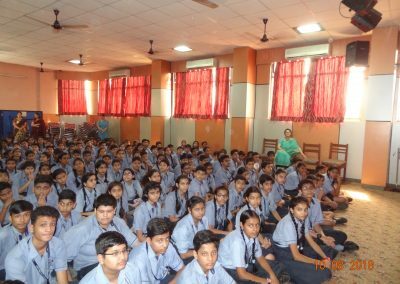 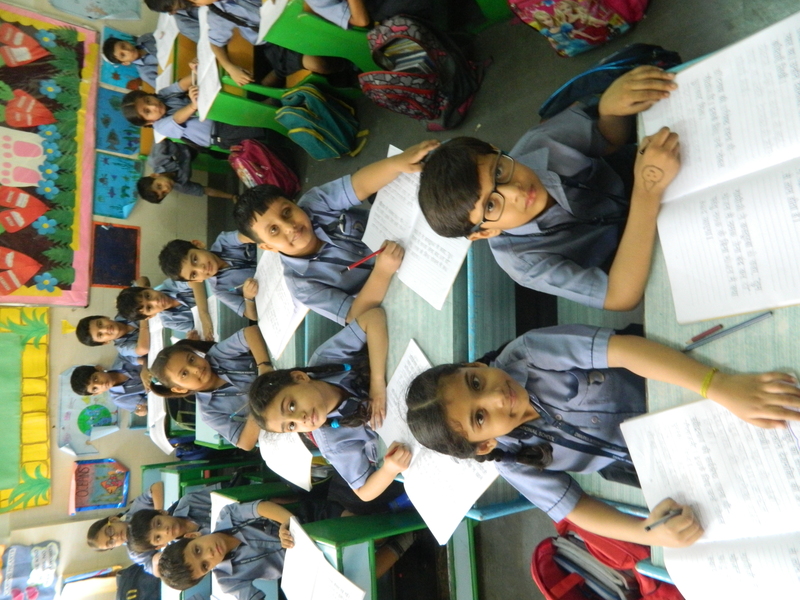 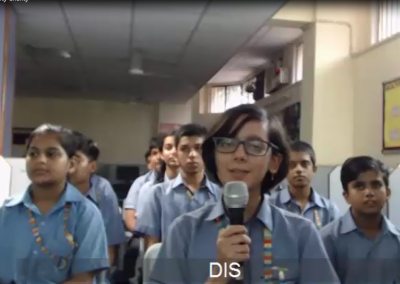 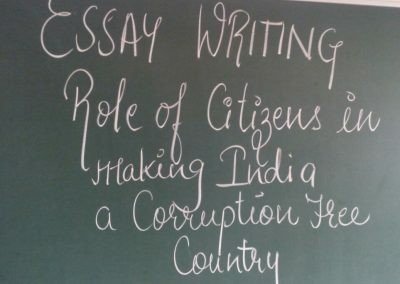 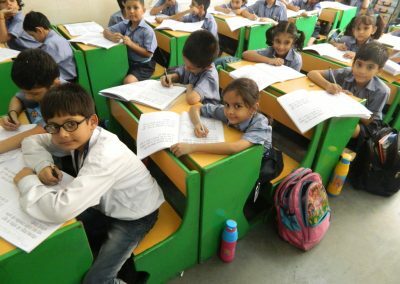 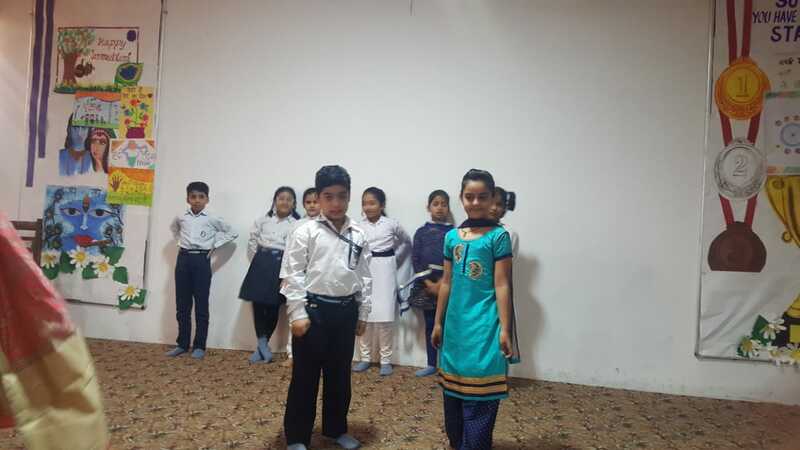 Self introduction of the students was done in the classes so that each one gets familiar with the class and system followed in school. 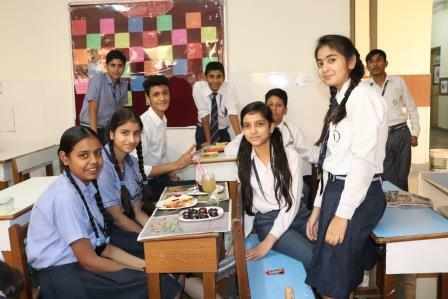 First day of the school was productive and fun-filled. 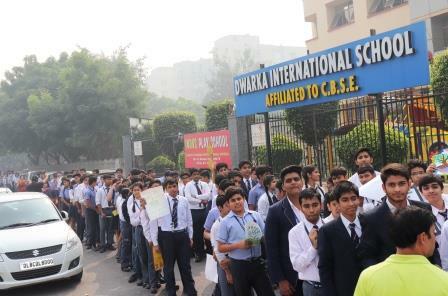 All the best to each one associated to the school. 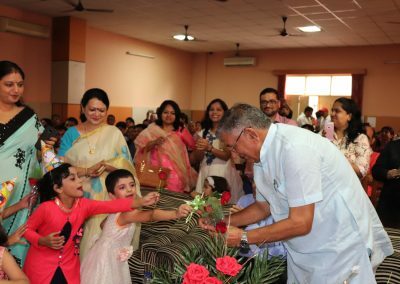 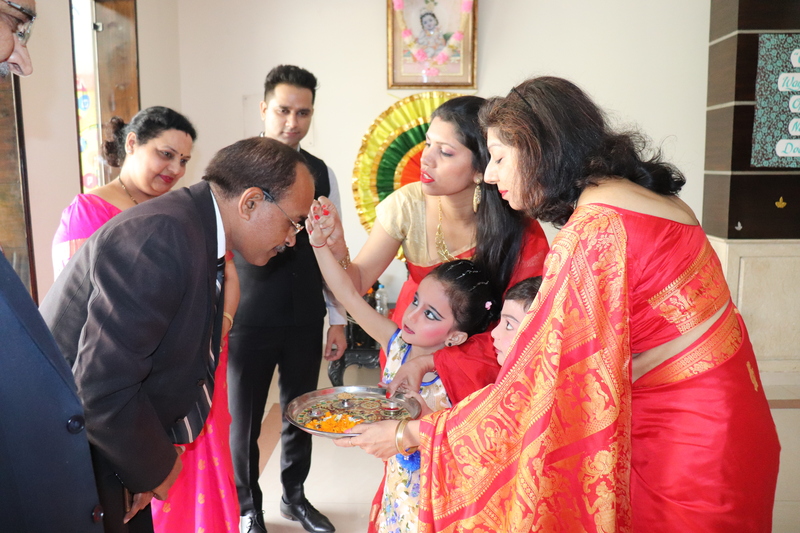 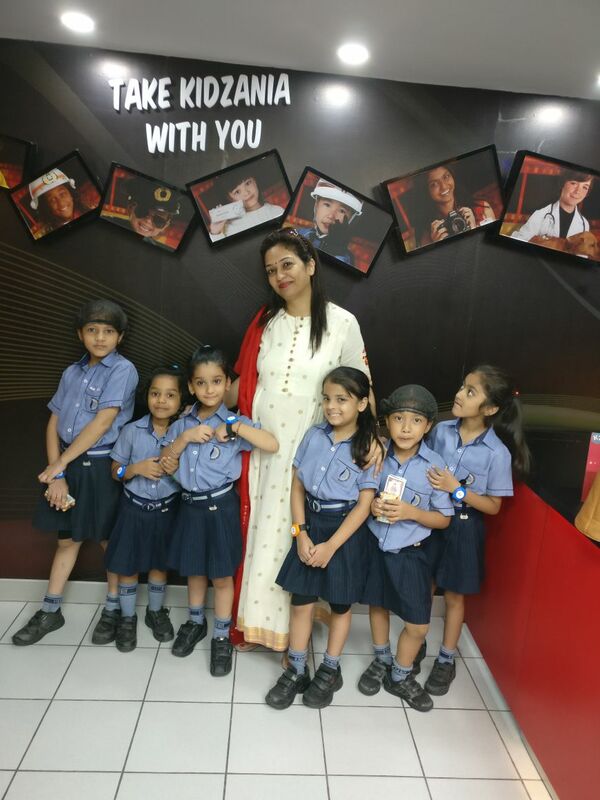 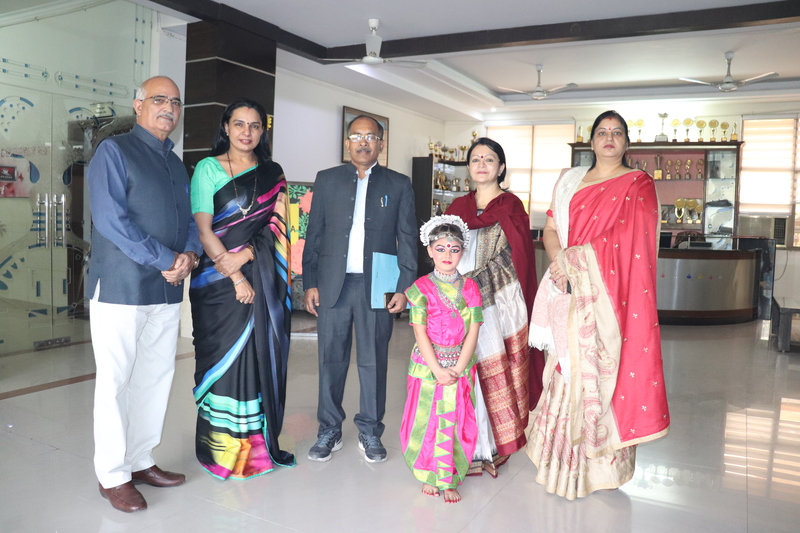 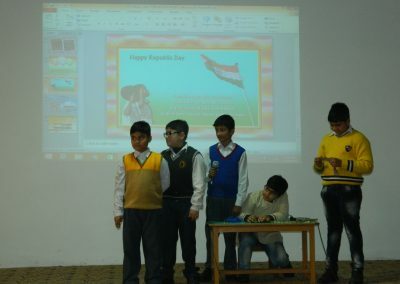 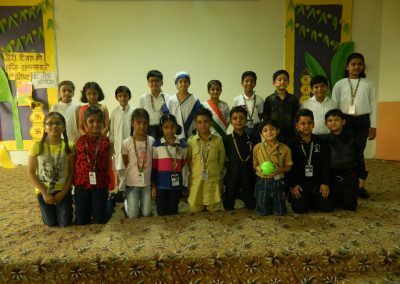 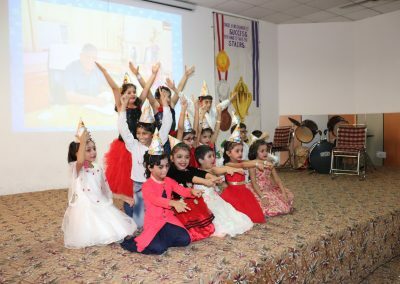 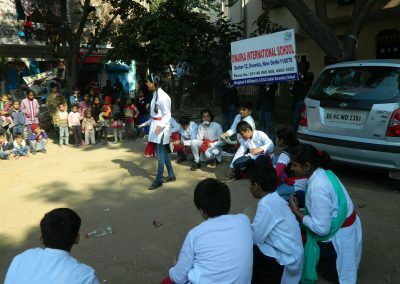 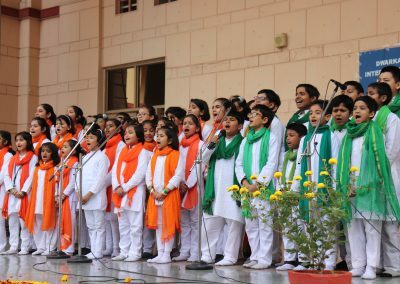 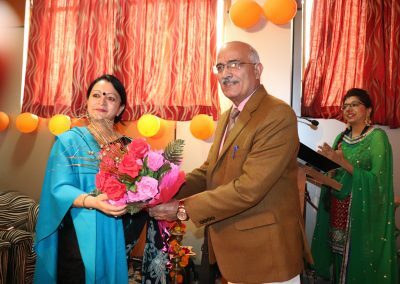 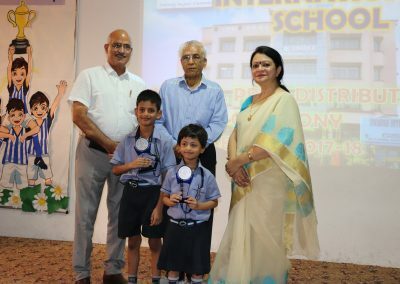 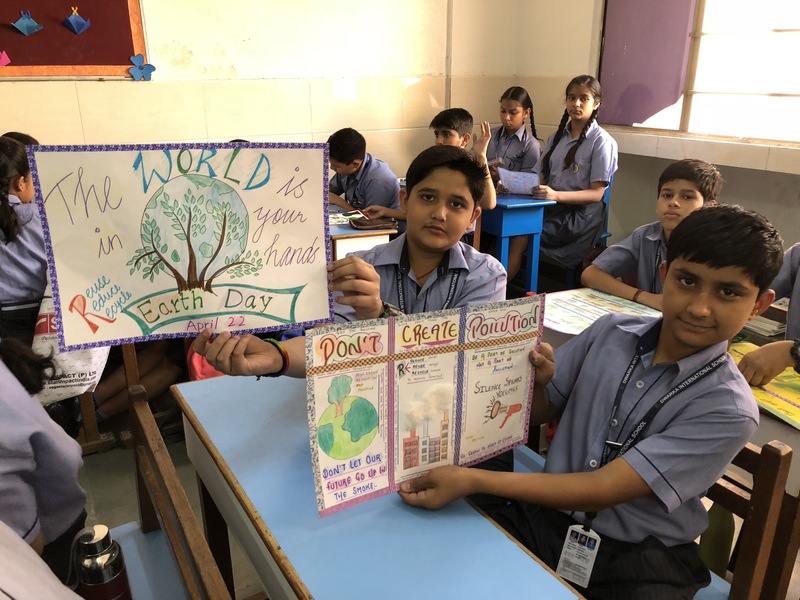 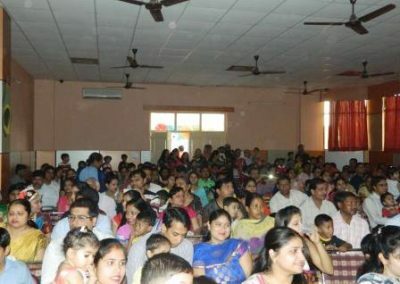 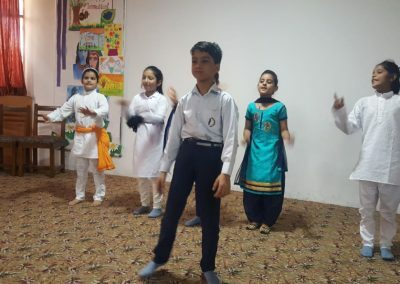 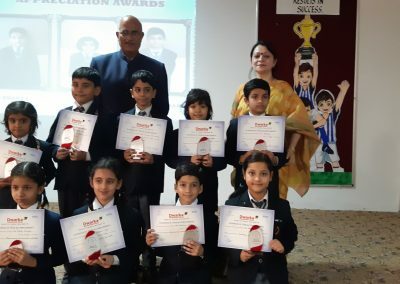 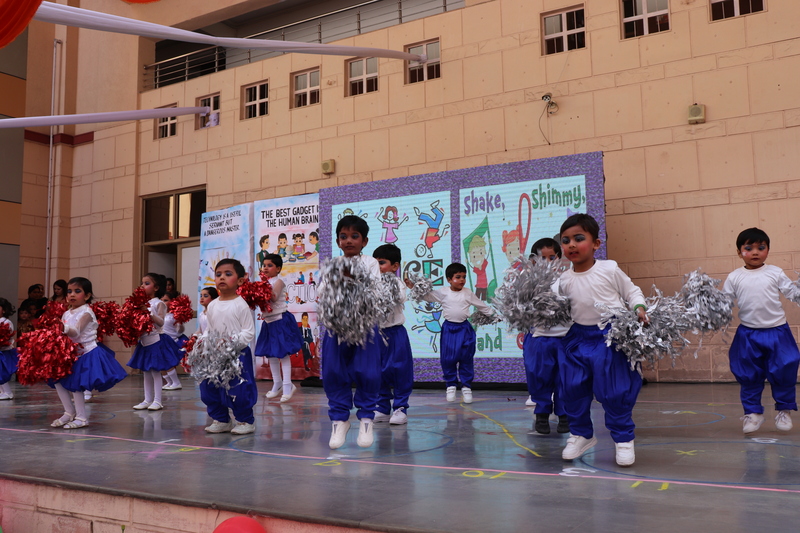 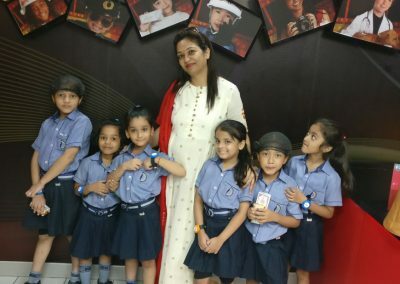 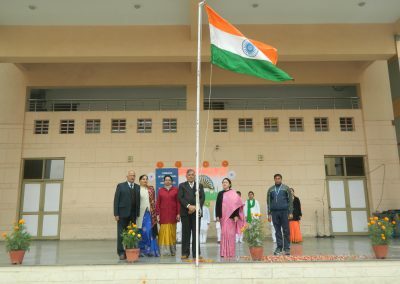 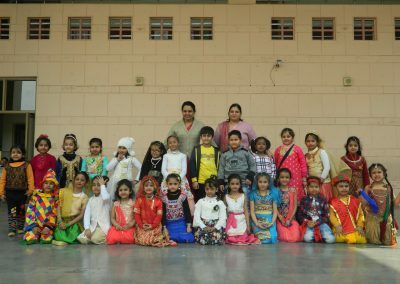 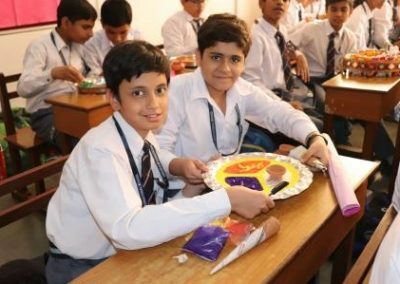 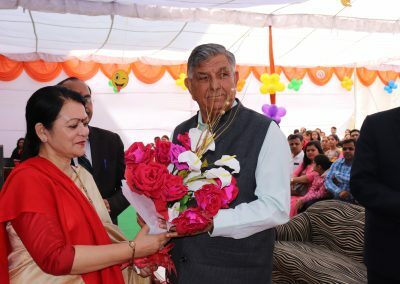 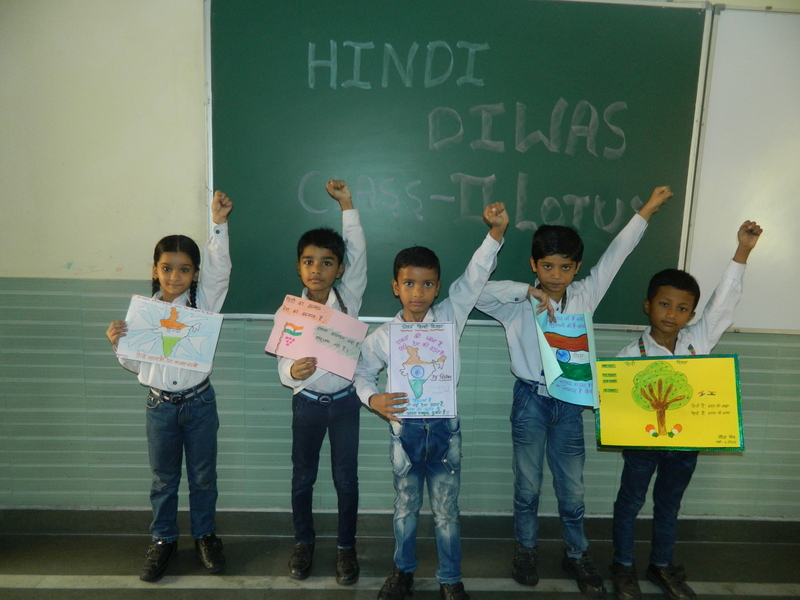 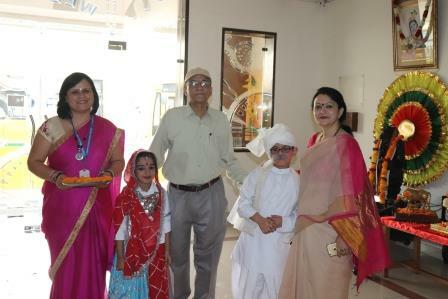 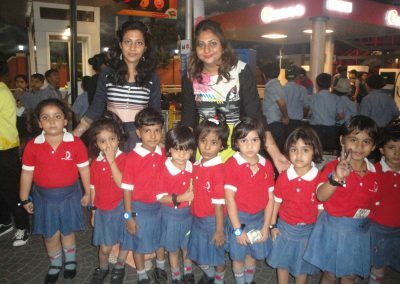 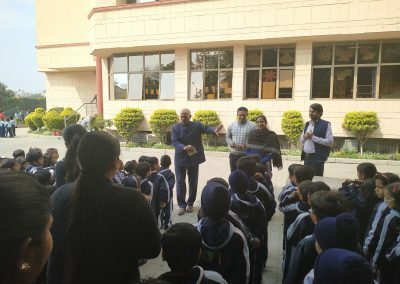 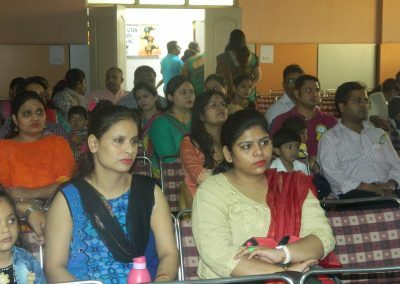 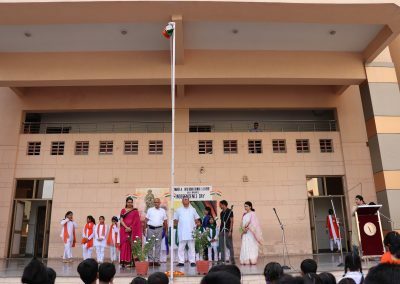 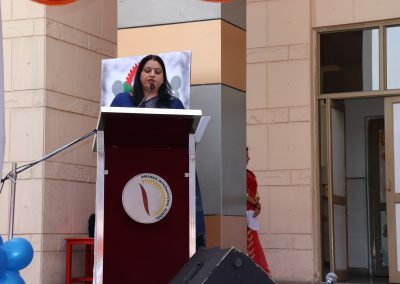 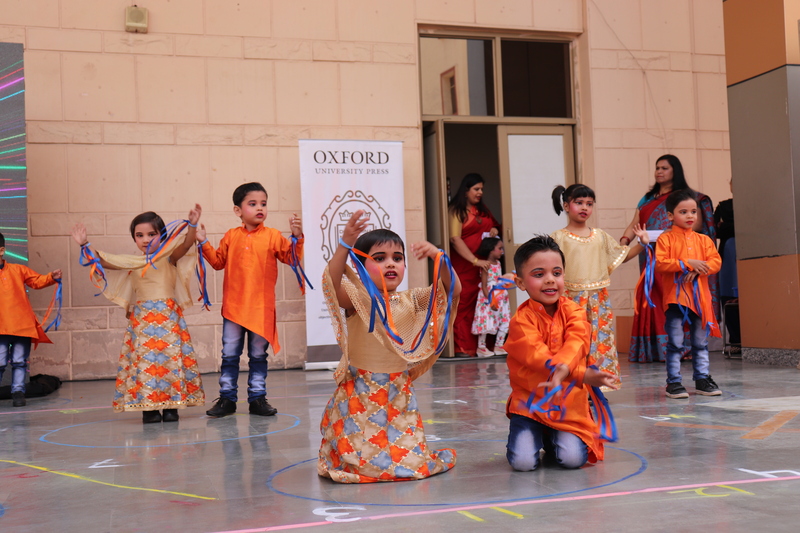 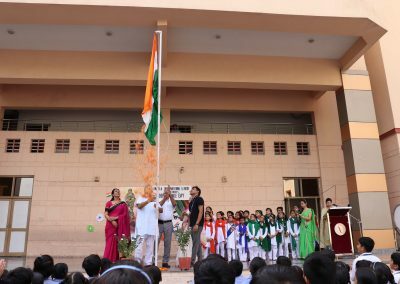 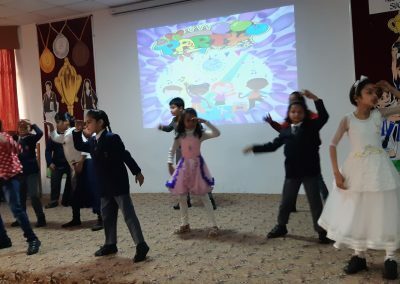 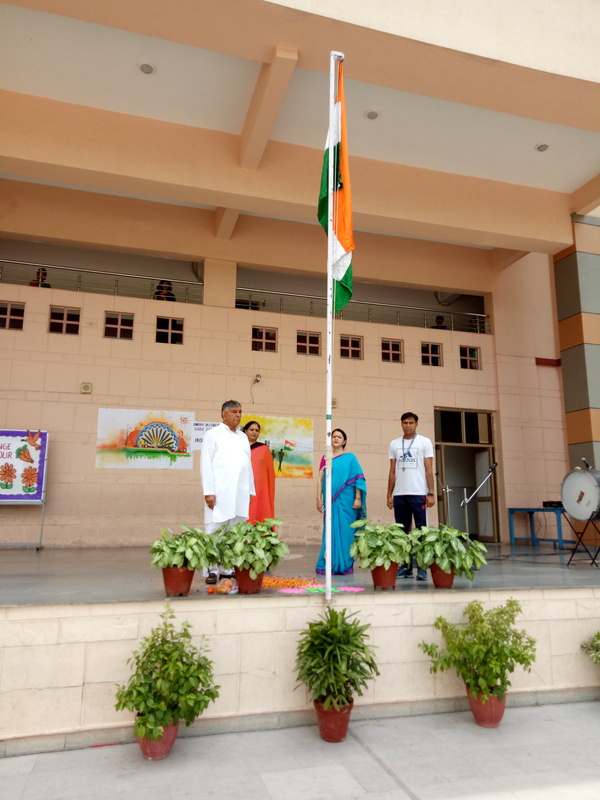 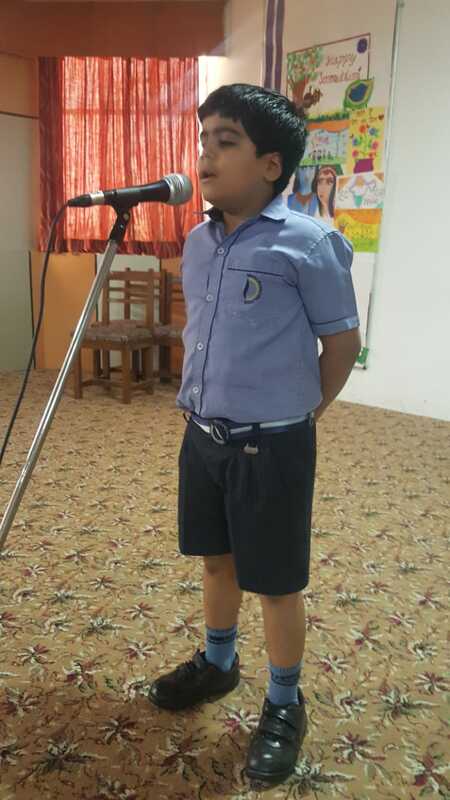 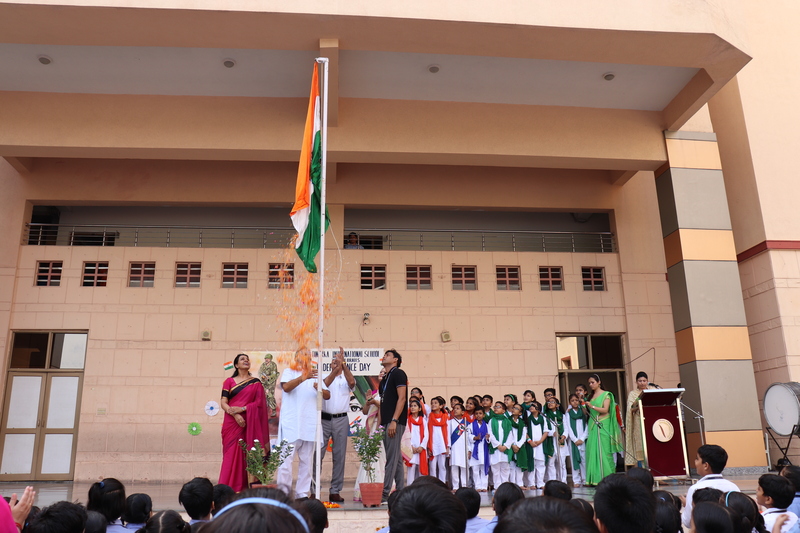 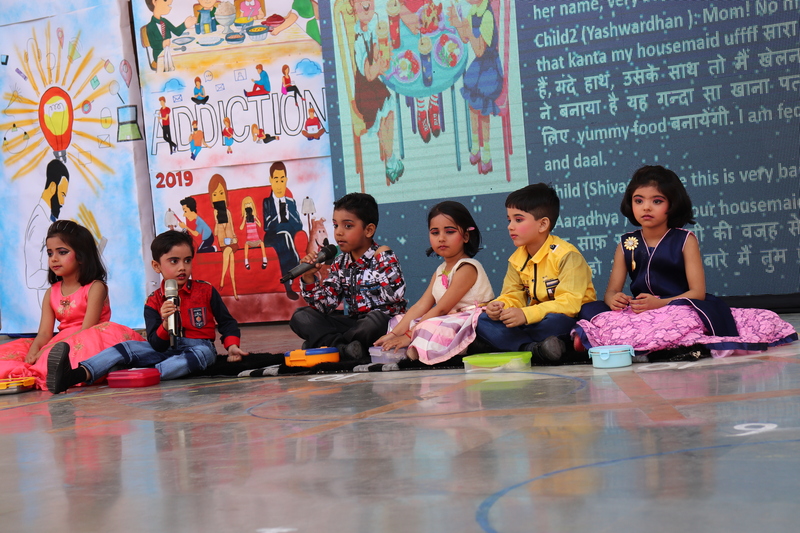 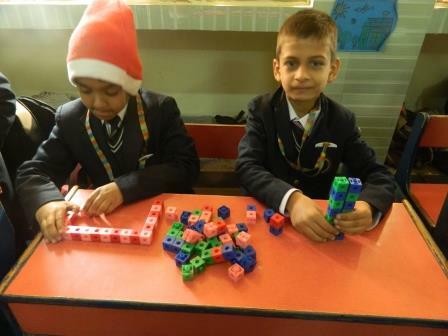 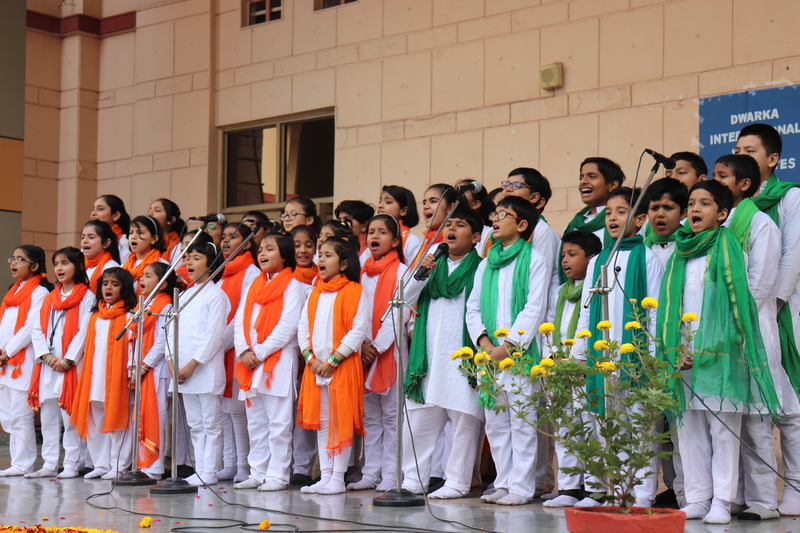 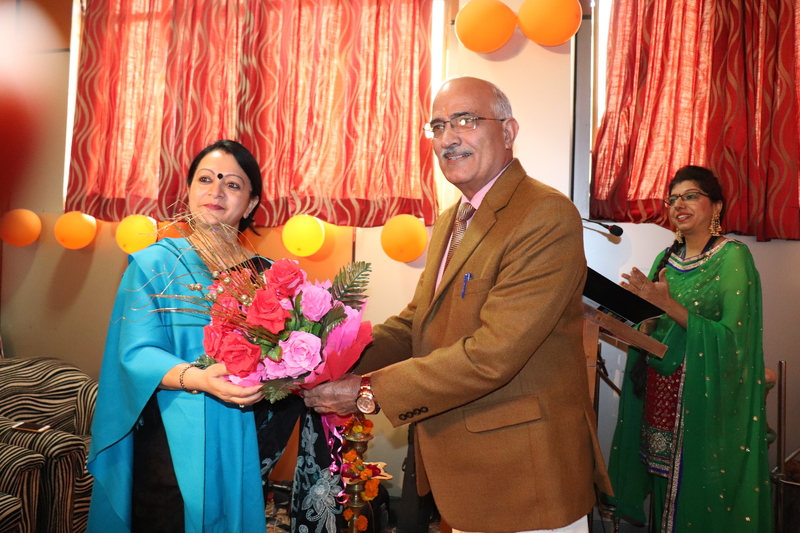 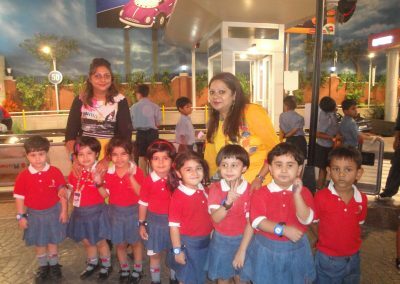 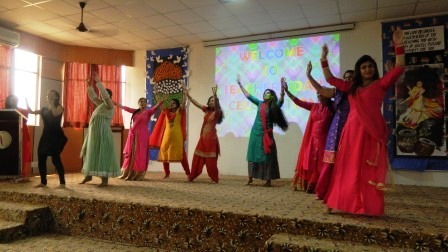 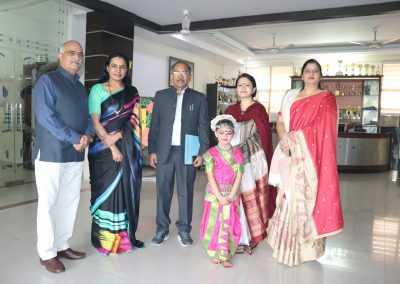 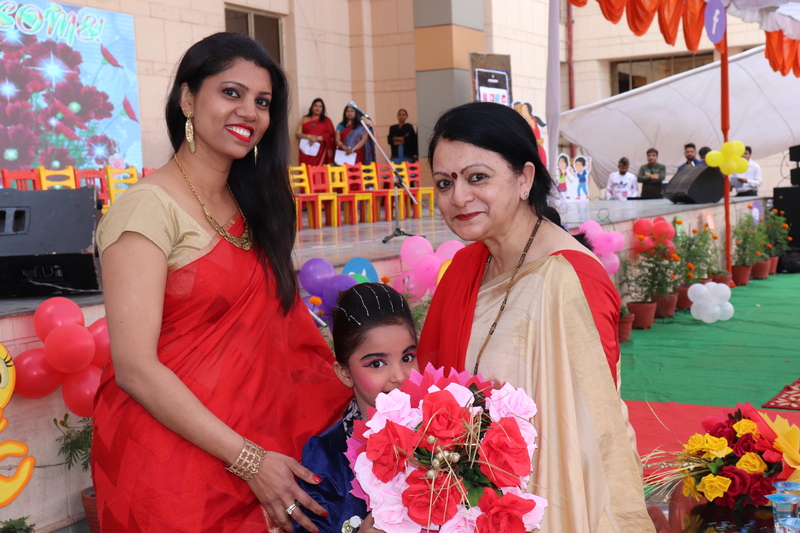 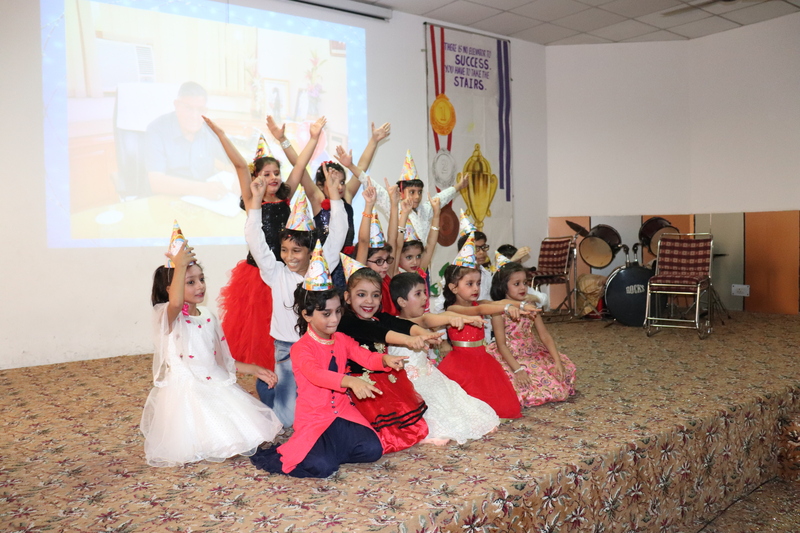 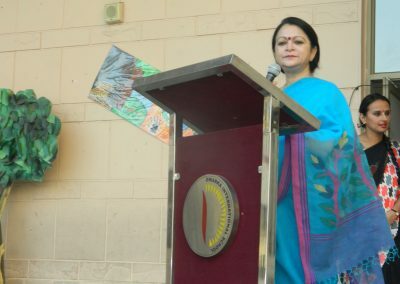 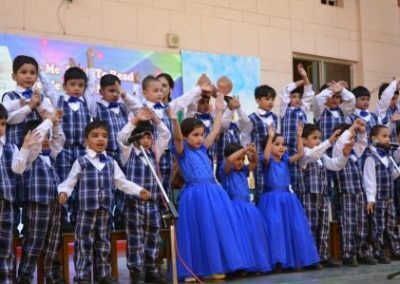 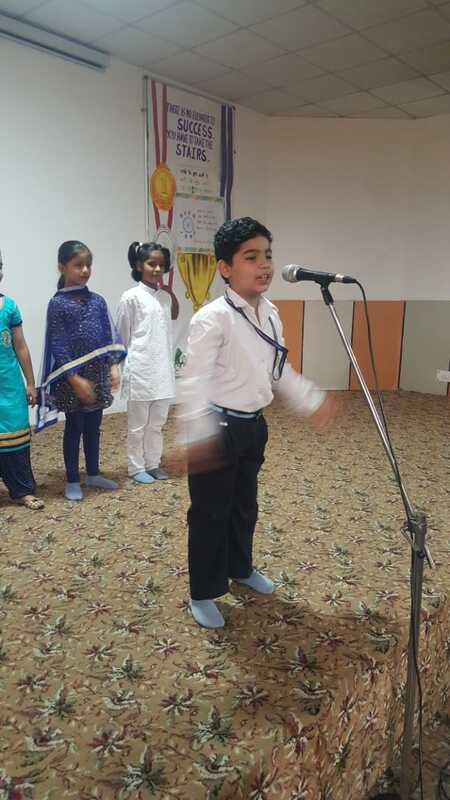 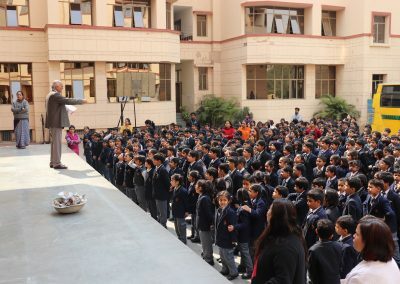 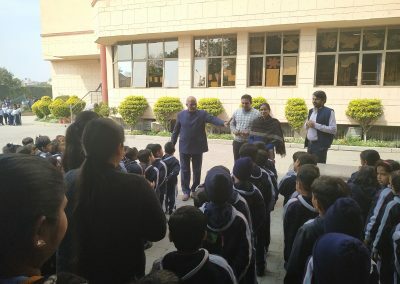 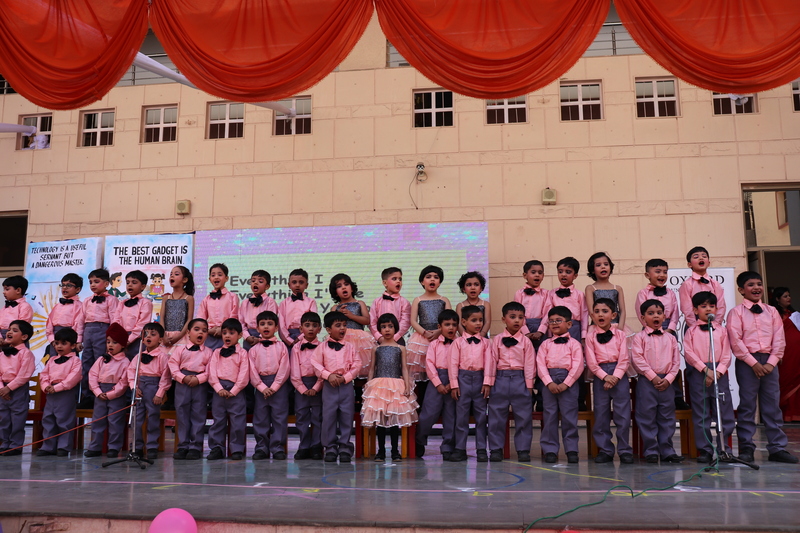 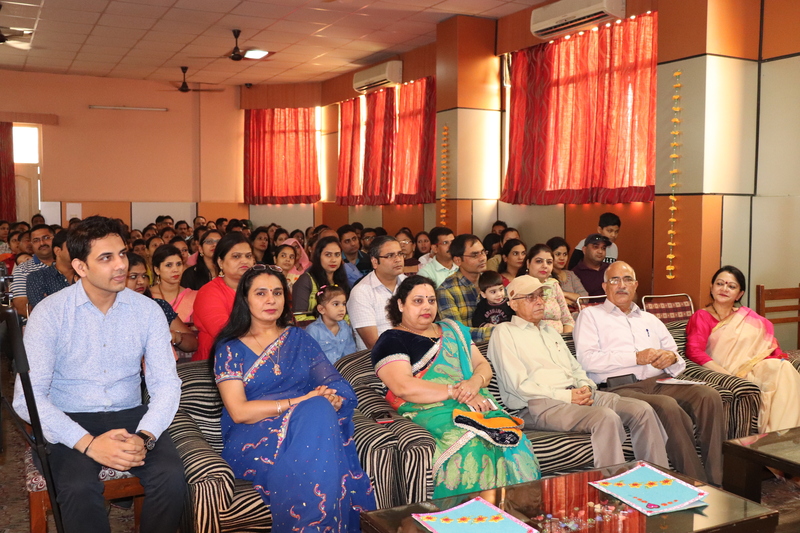 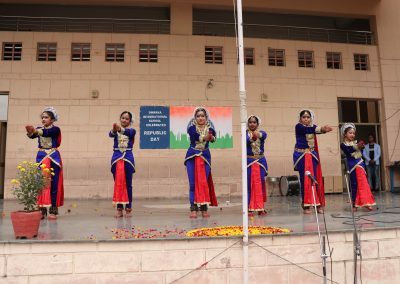 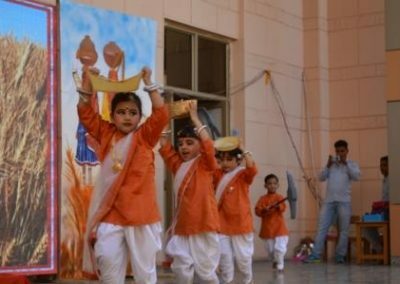 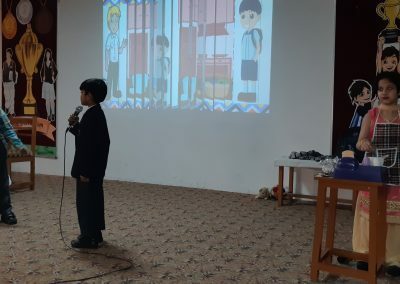 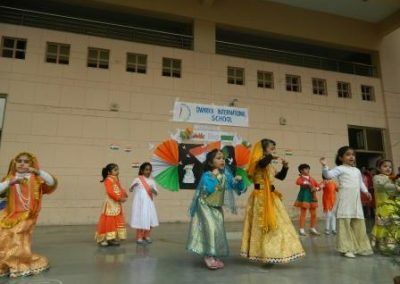 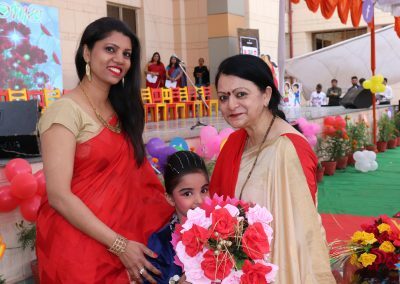 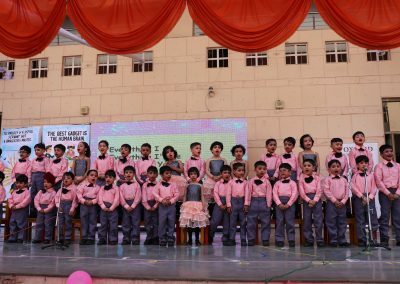 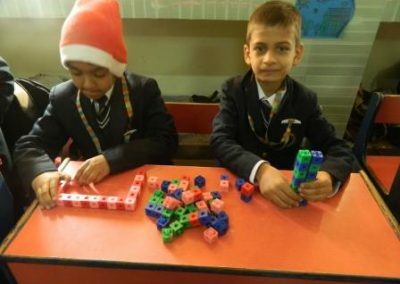 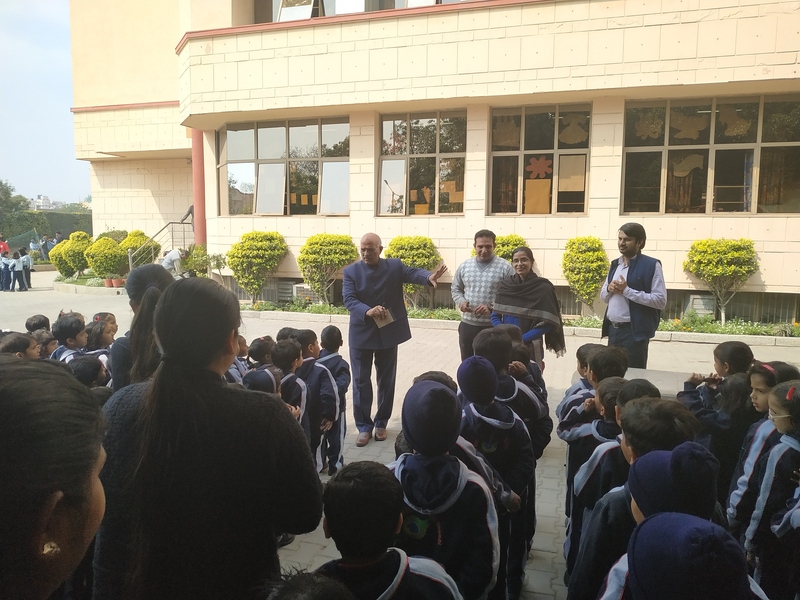 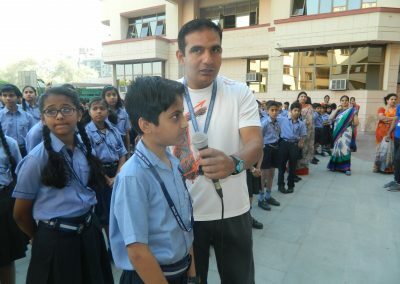 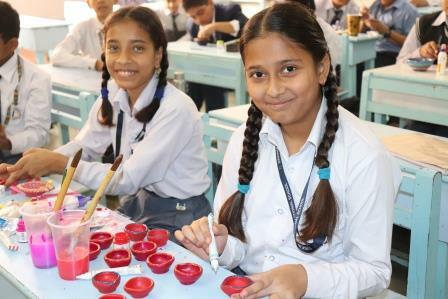 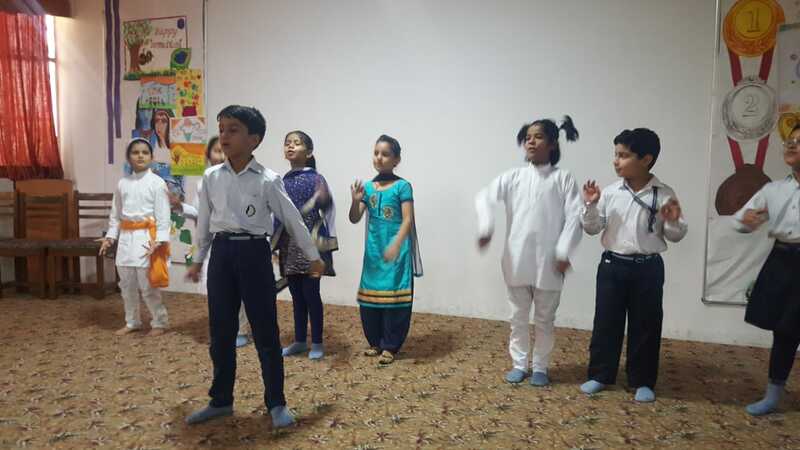 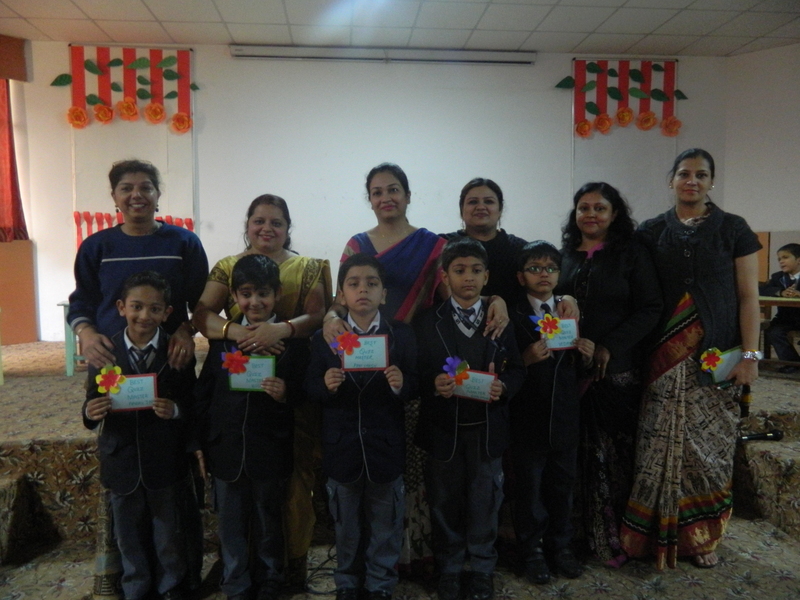 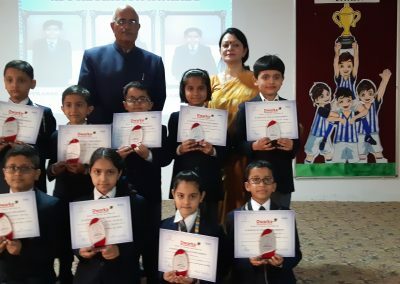 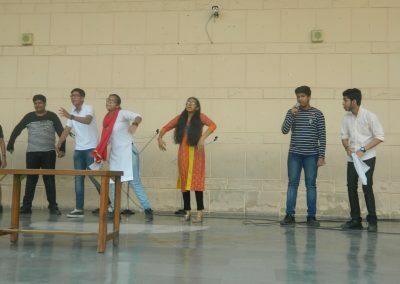 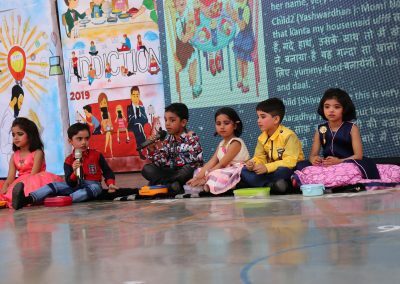 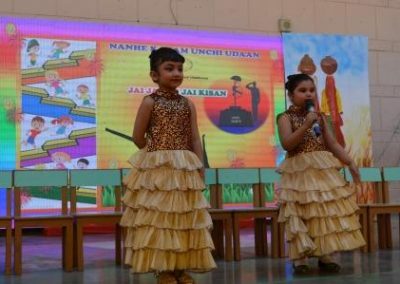 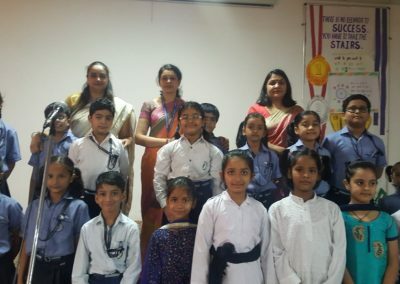 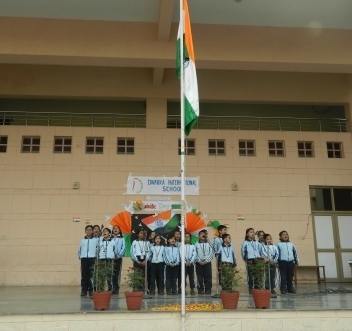 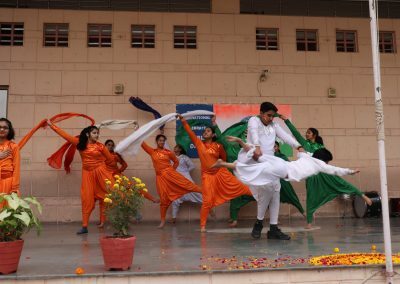 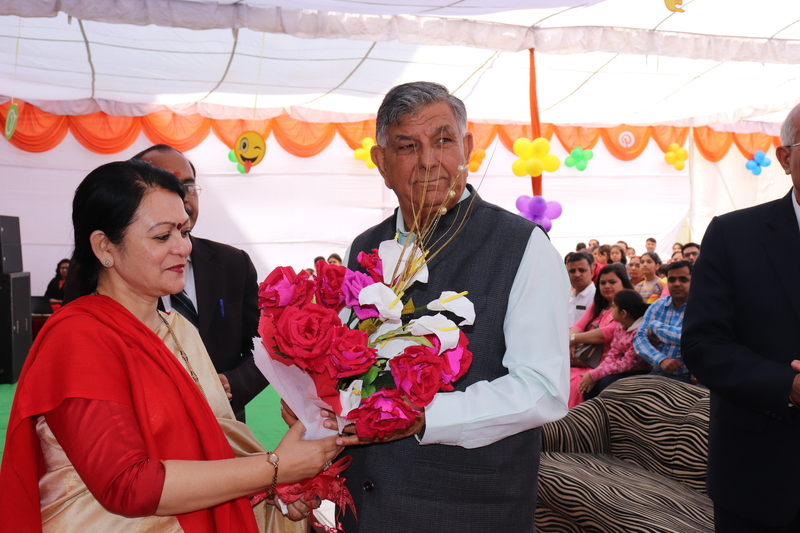 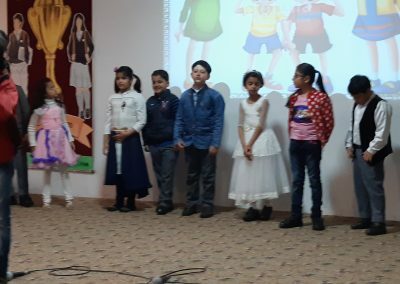 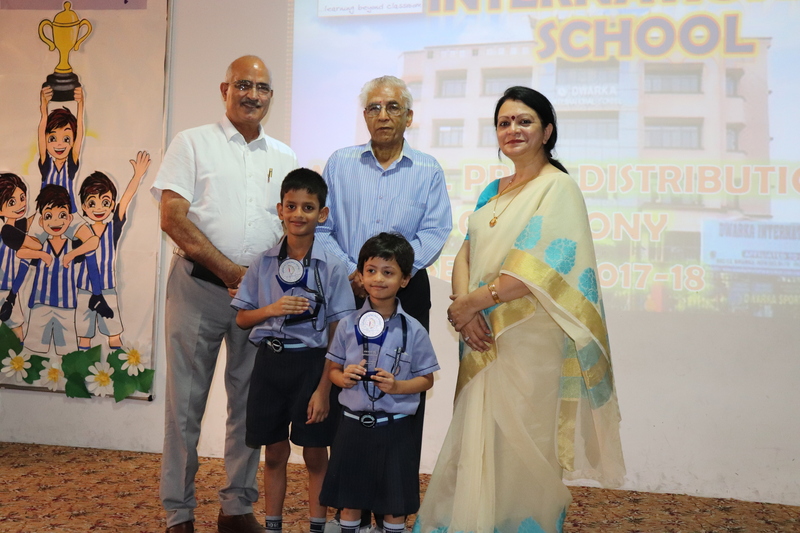 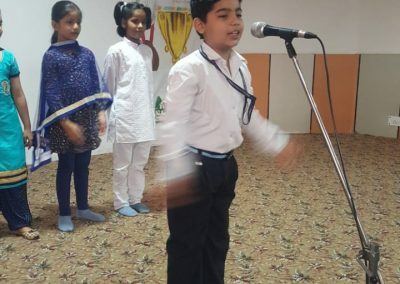 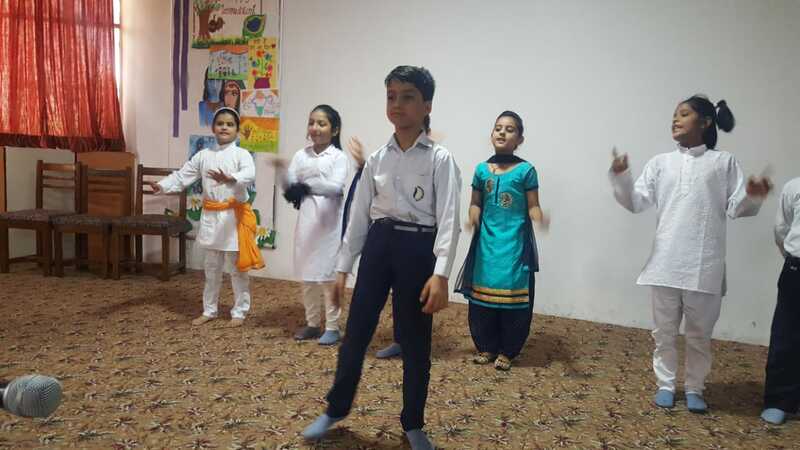 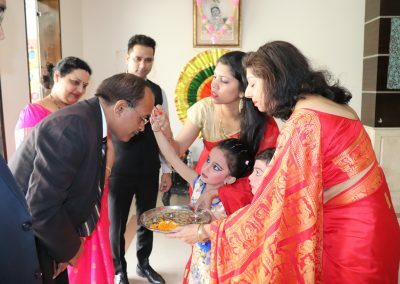 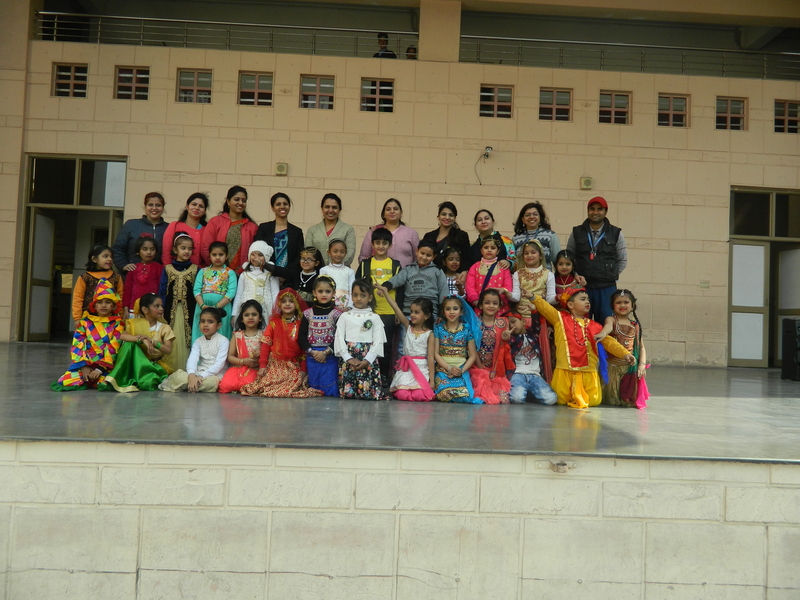 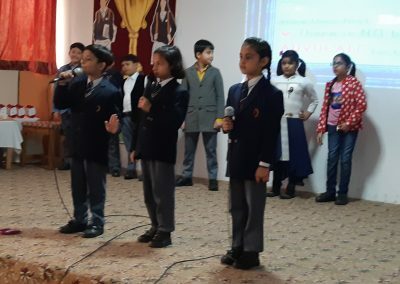 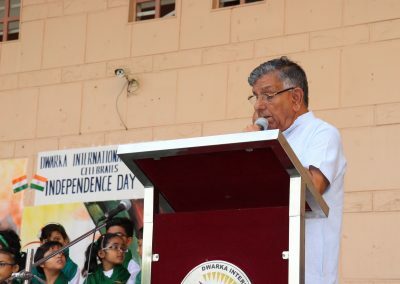 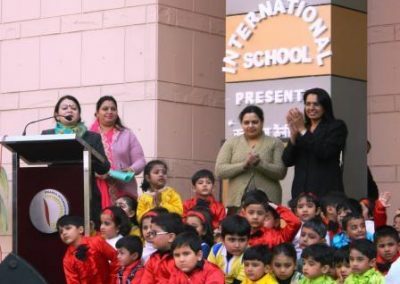 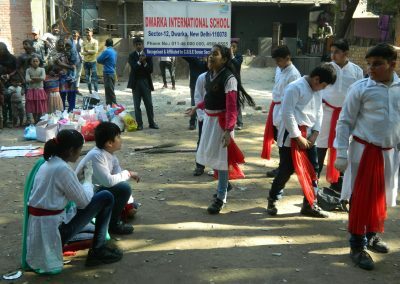 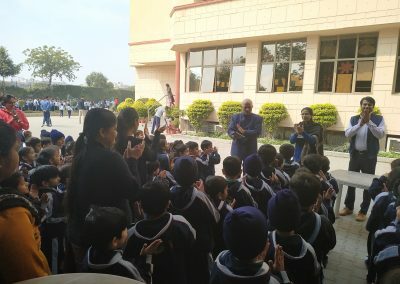 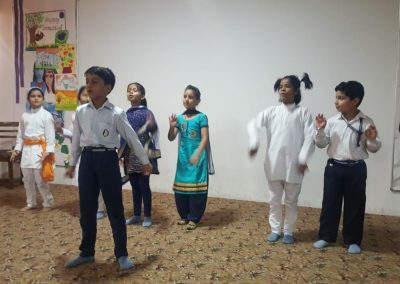 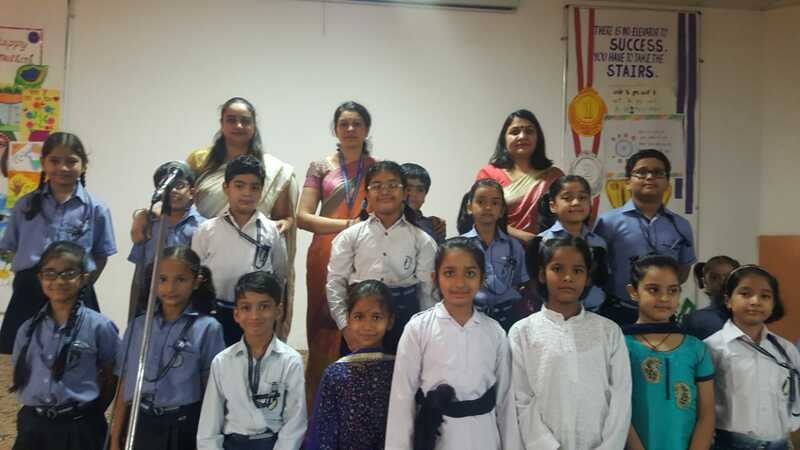 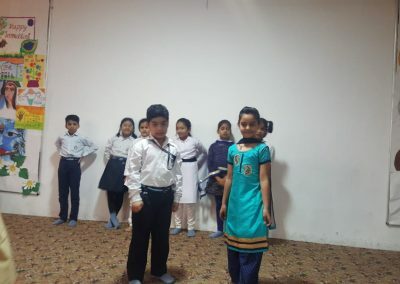 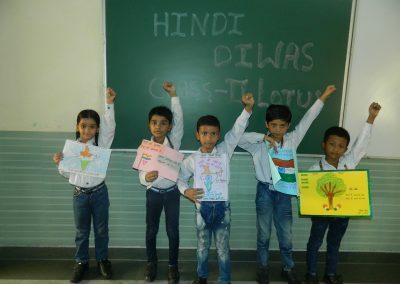 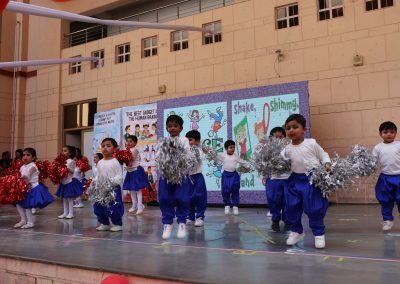 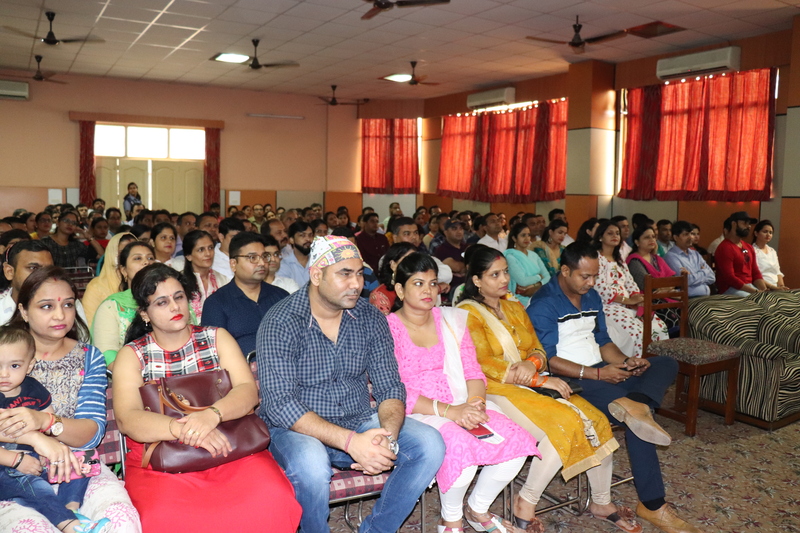 School celebrated Pre-primary day on March 16, 2019. 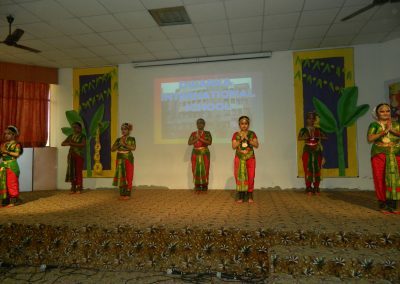 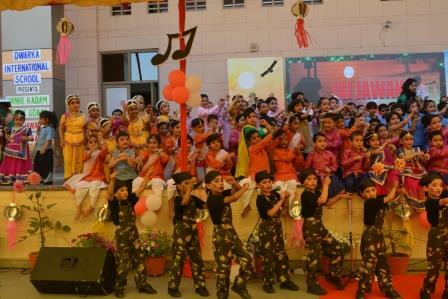 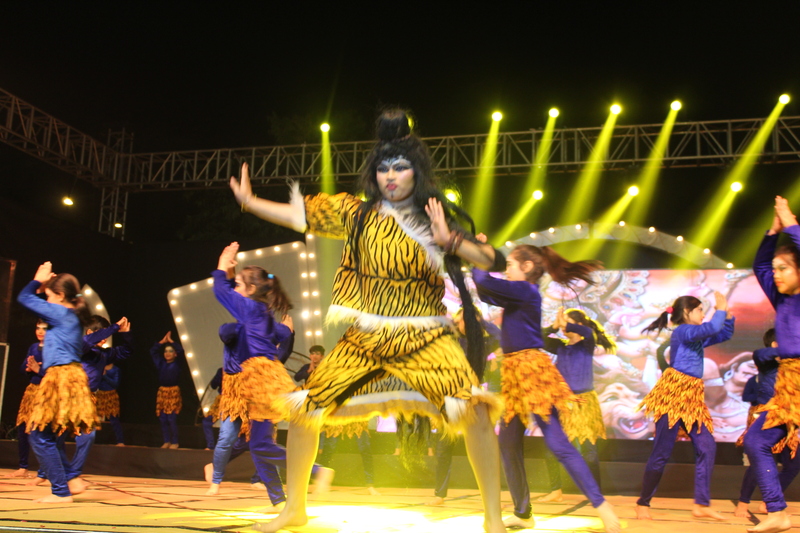 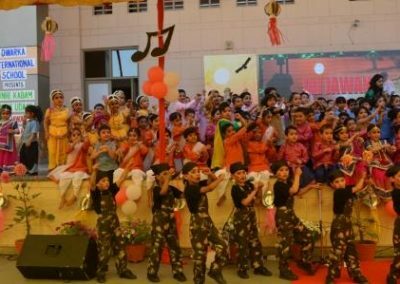 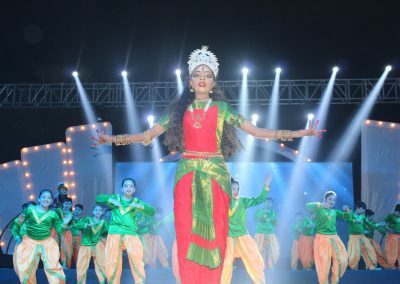 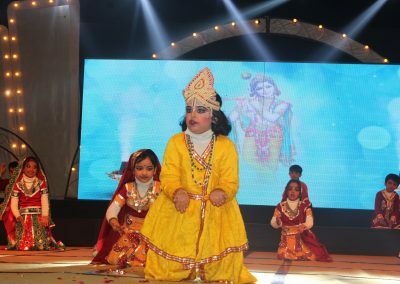 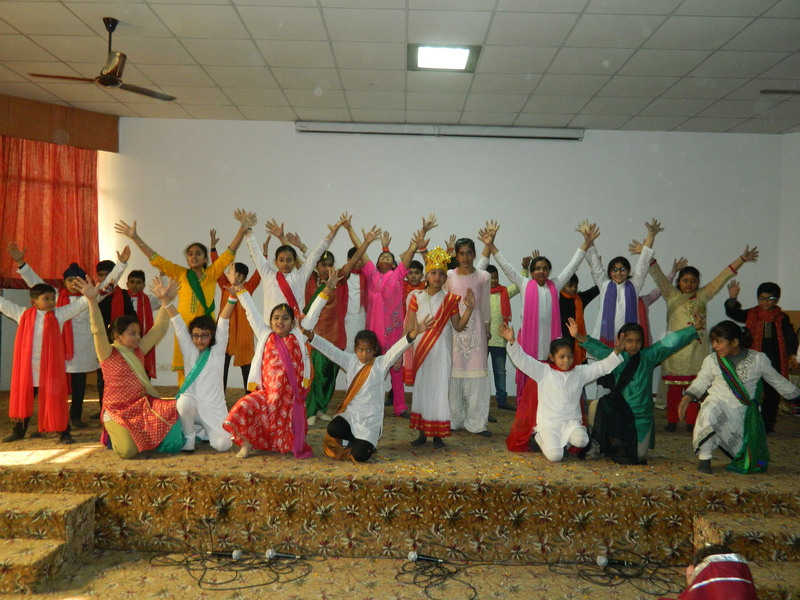 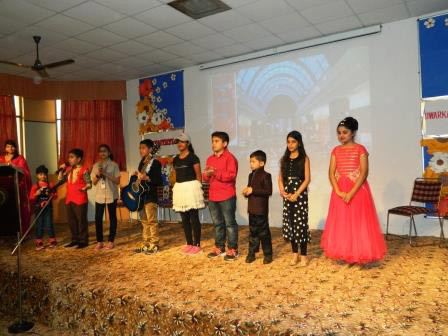 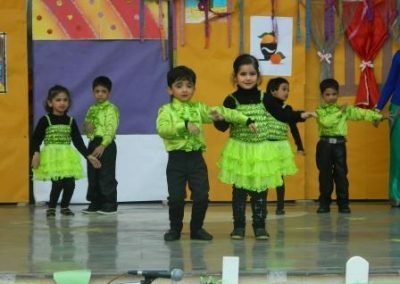 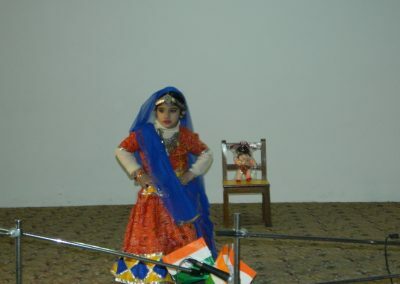 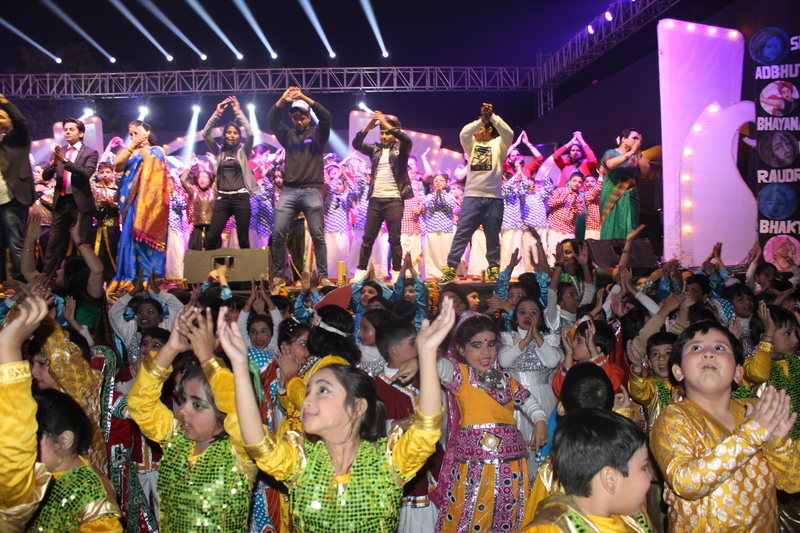 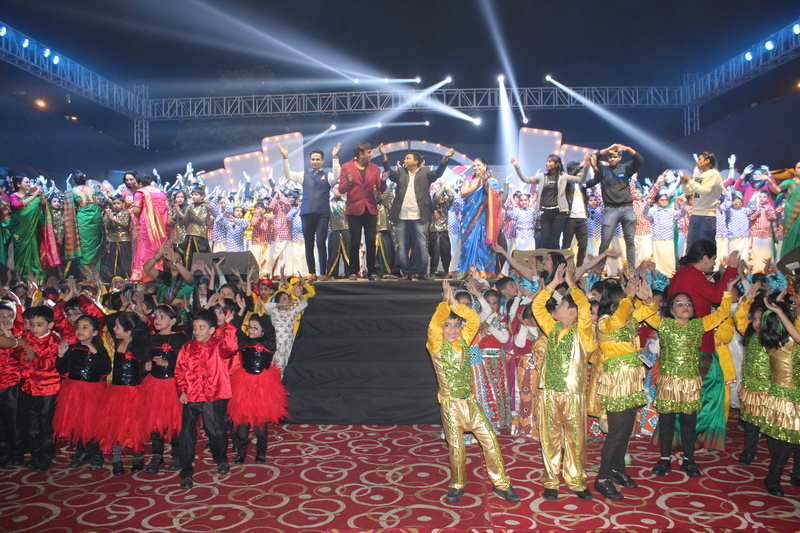 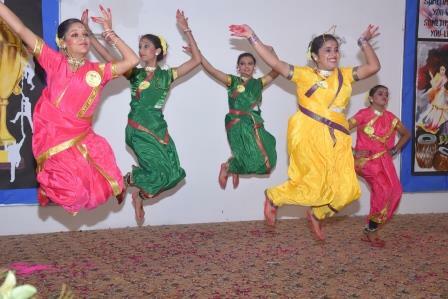 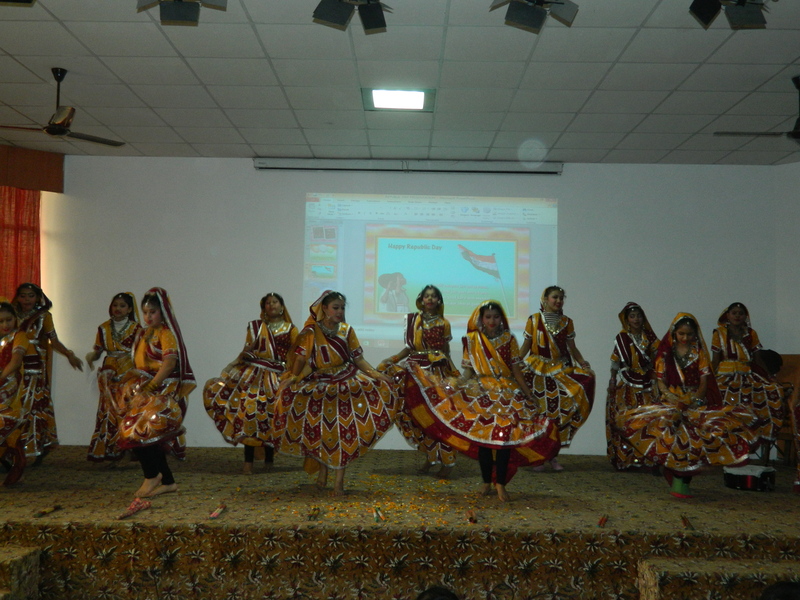 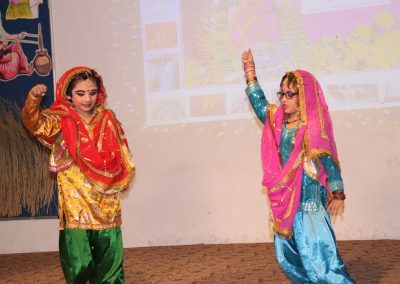 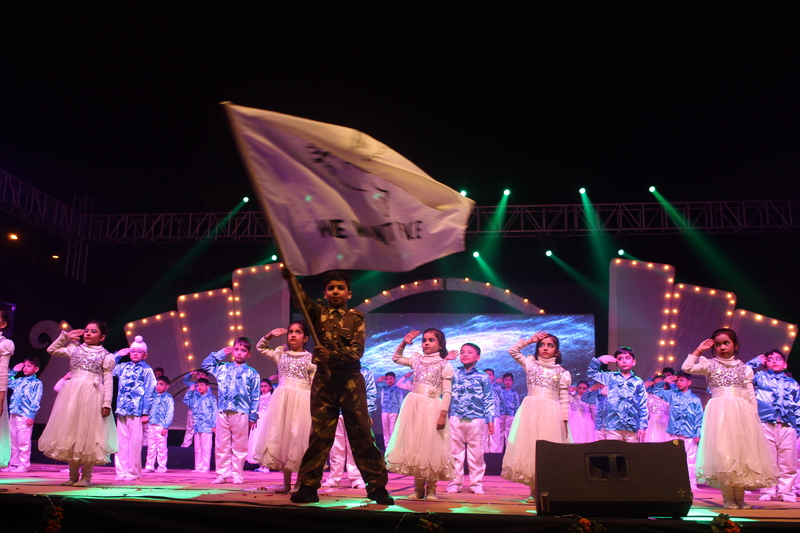 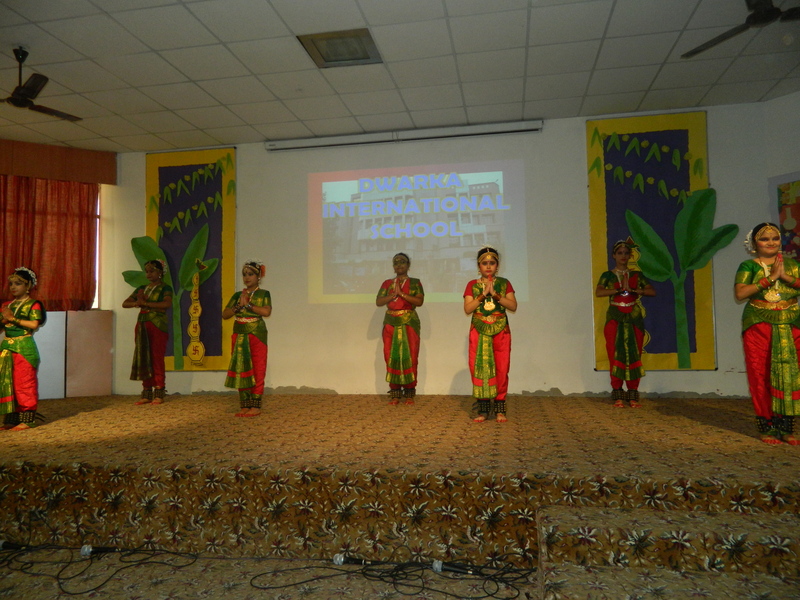 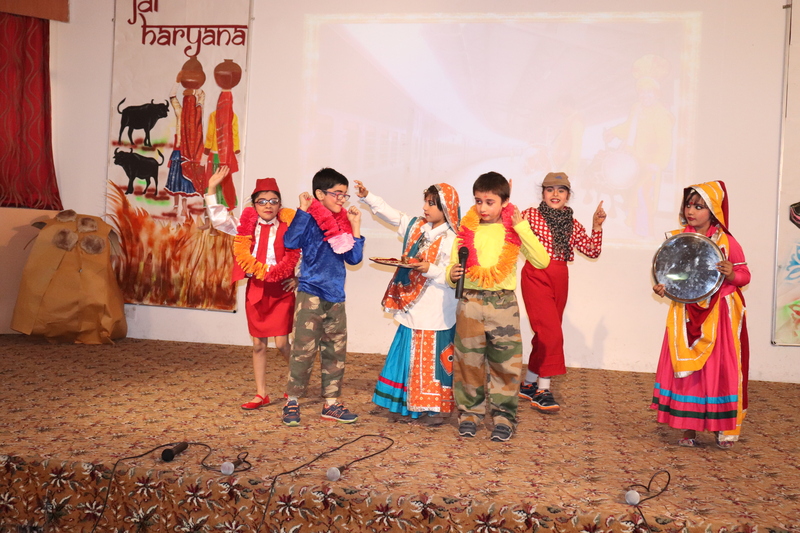 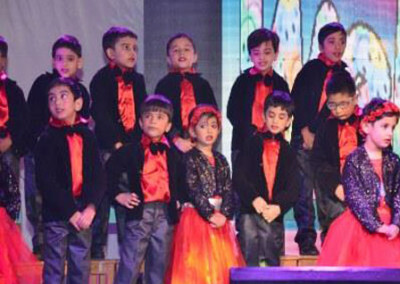 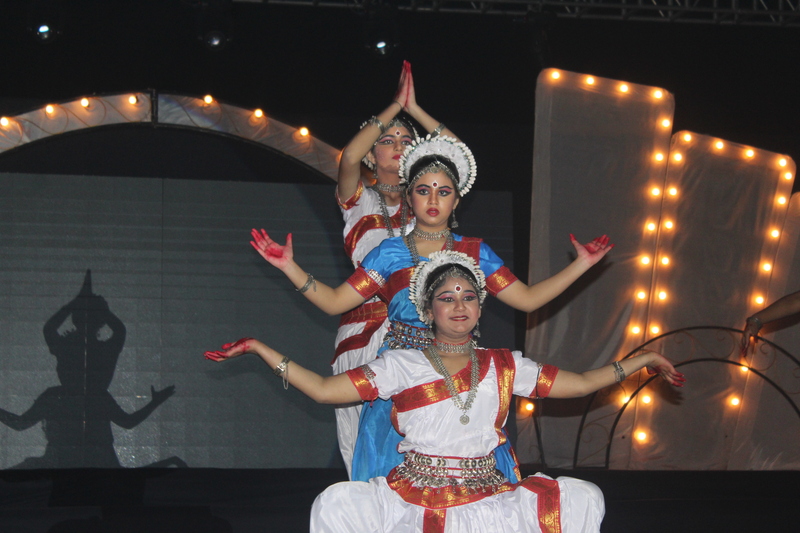 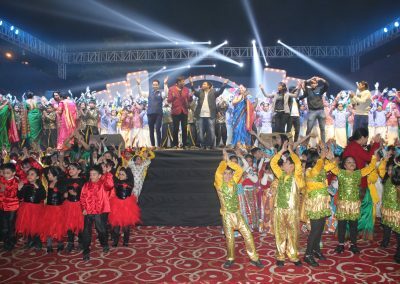 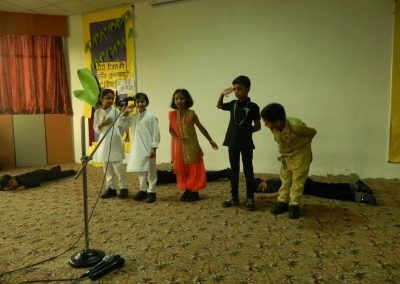 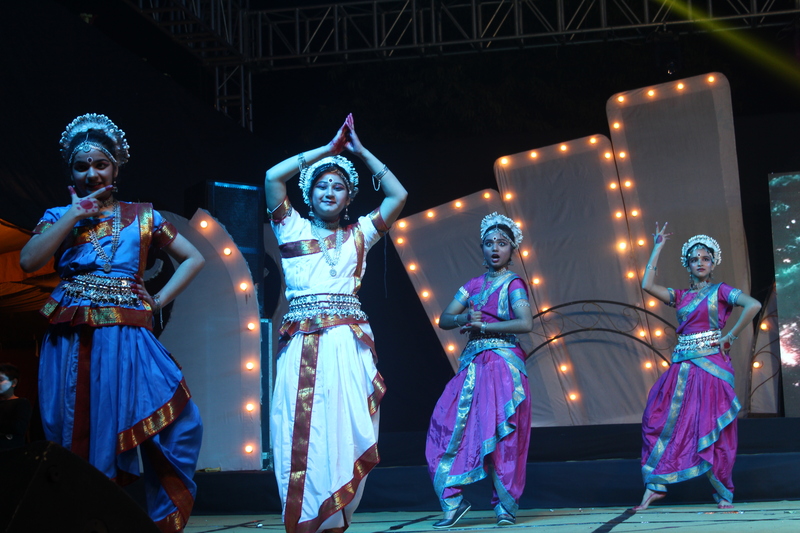 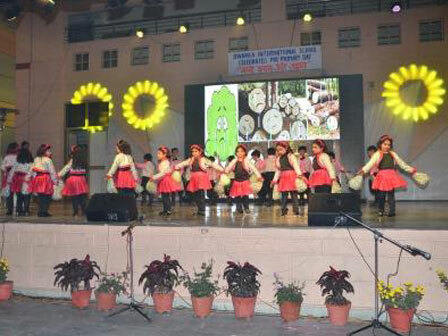 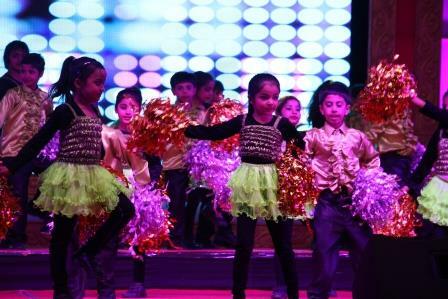 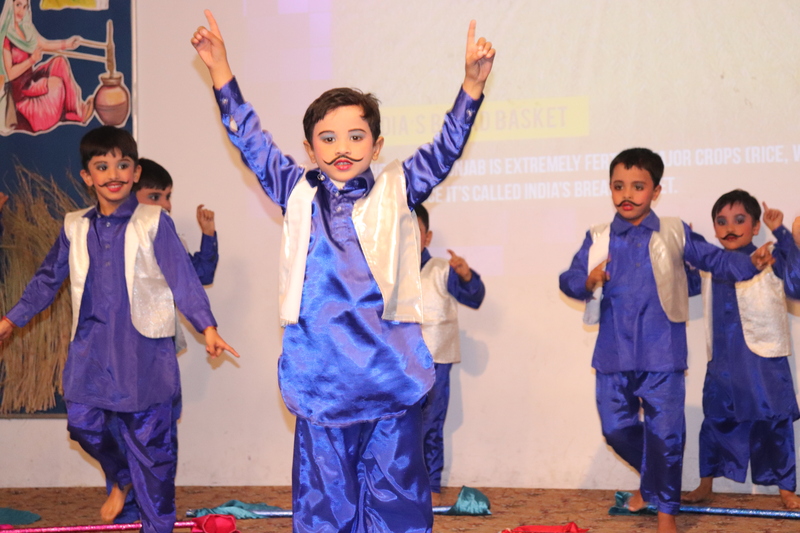 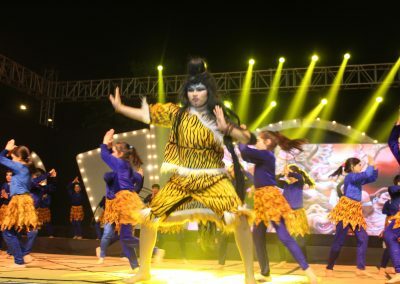 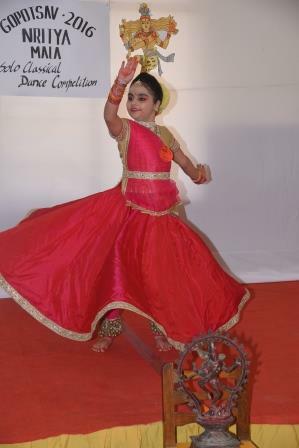 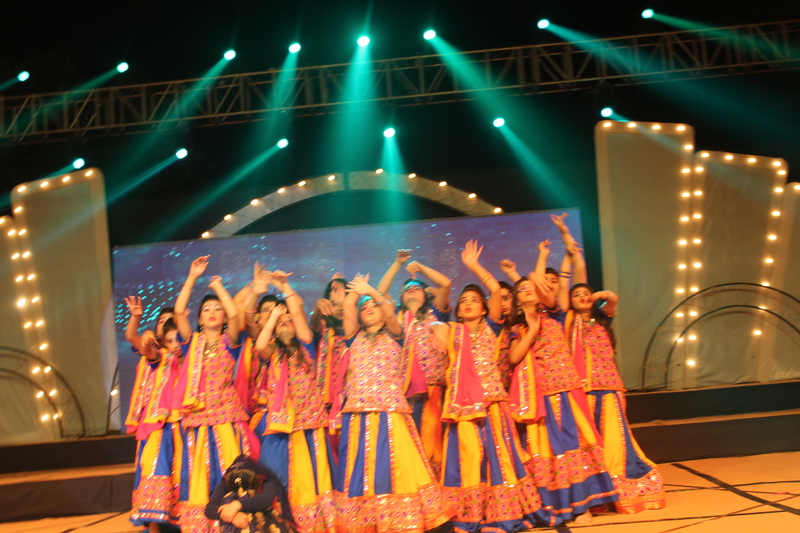 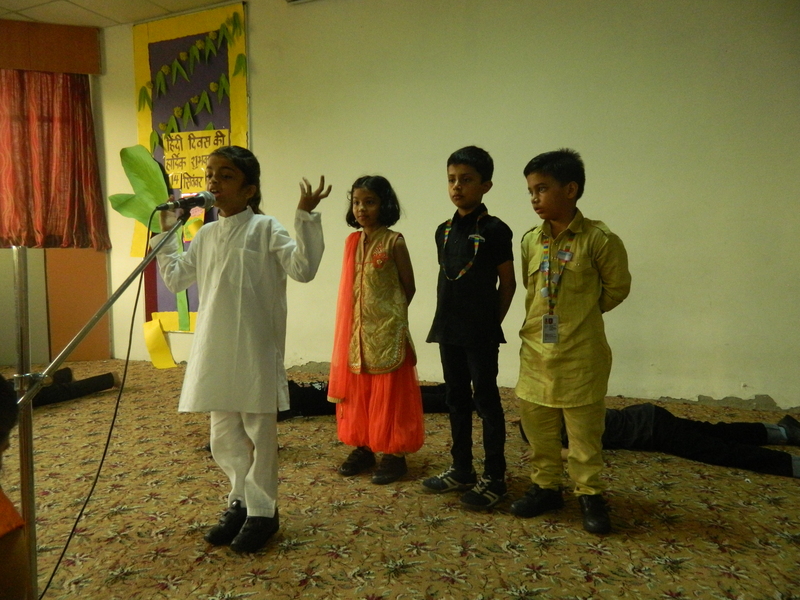 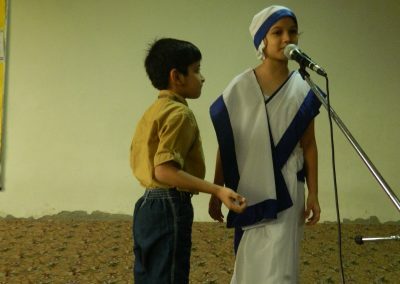 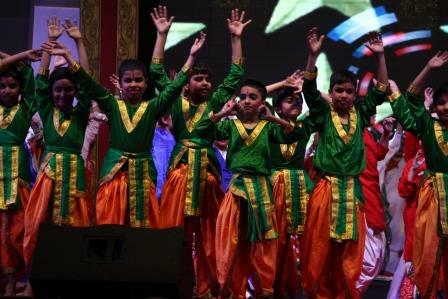 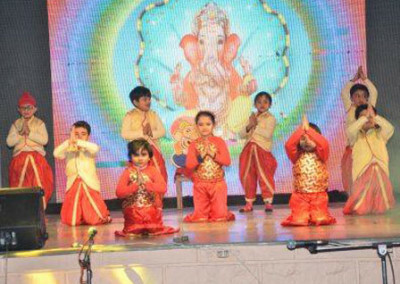 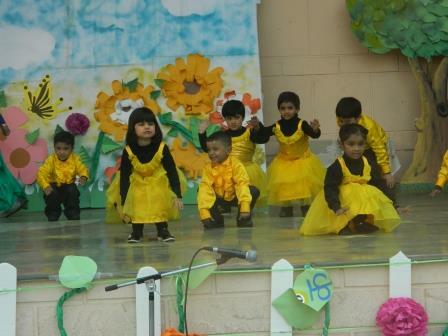 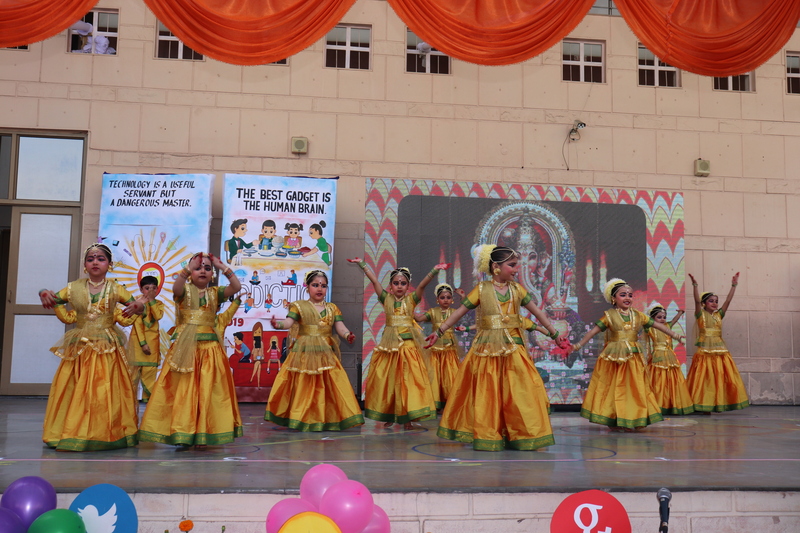 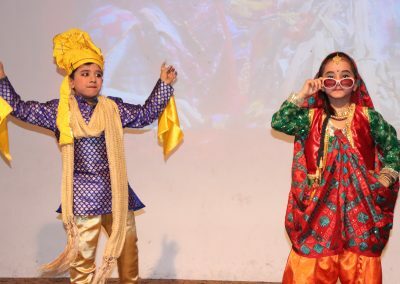 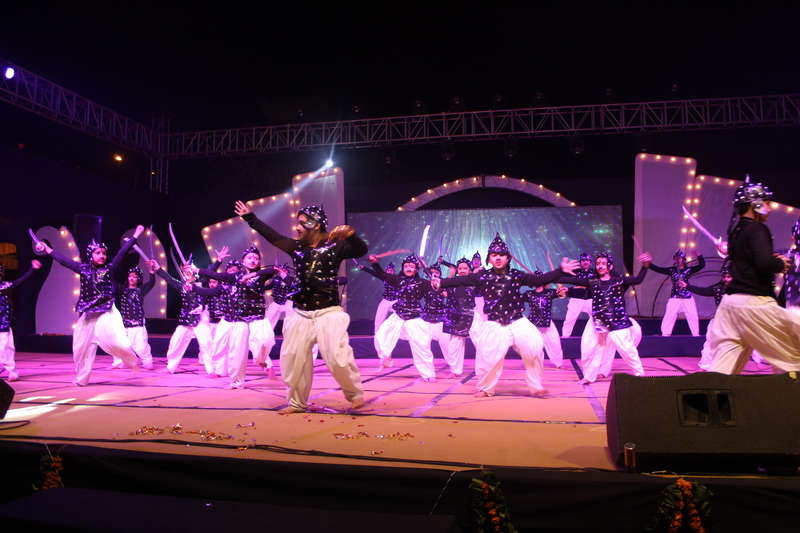 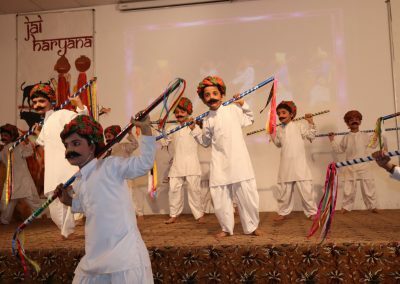 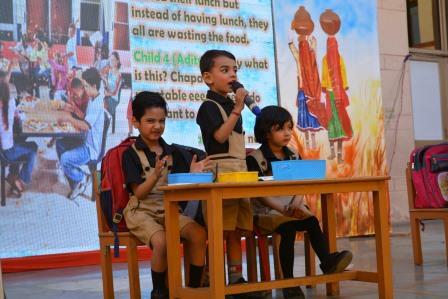 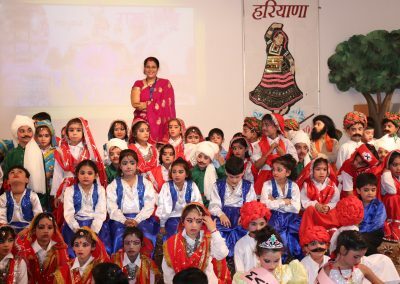 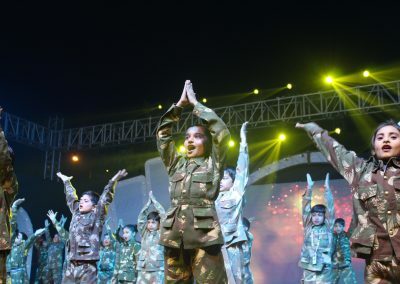 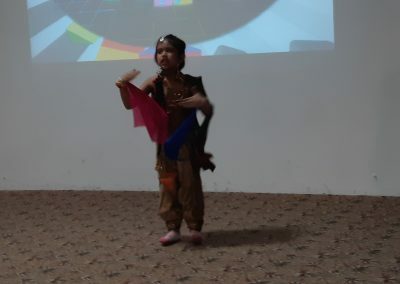 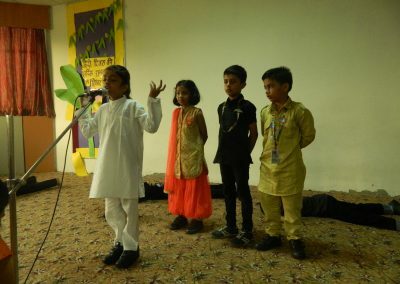 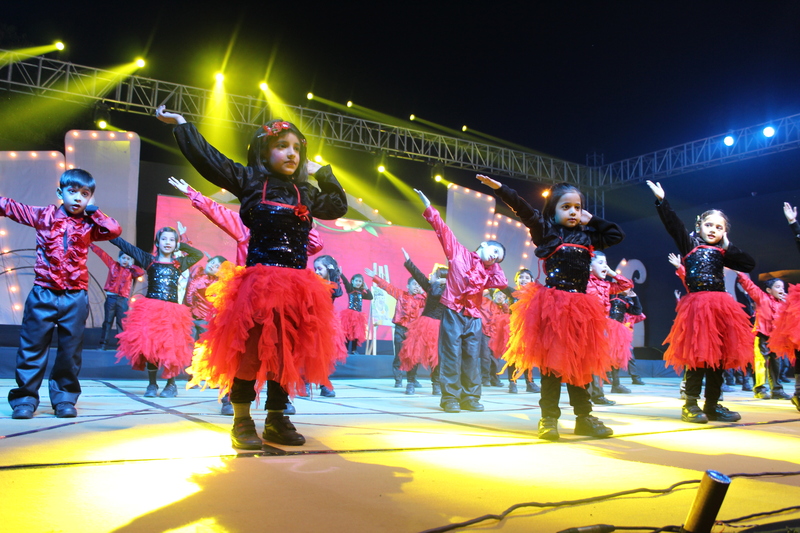 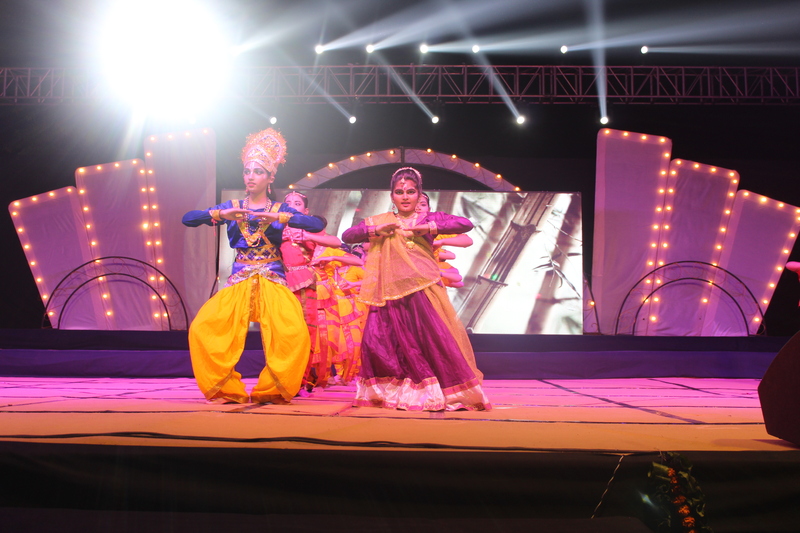 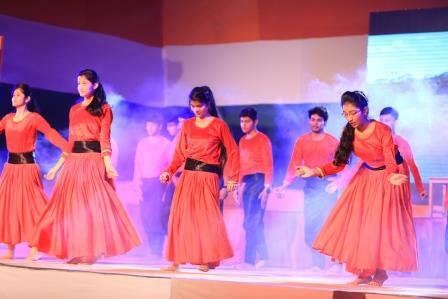 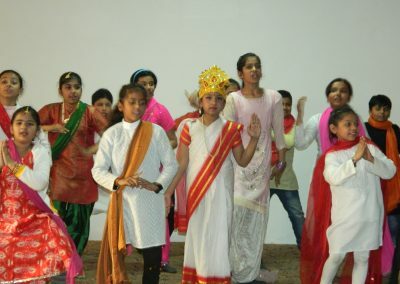 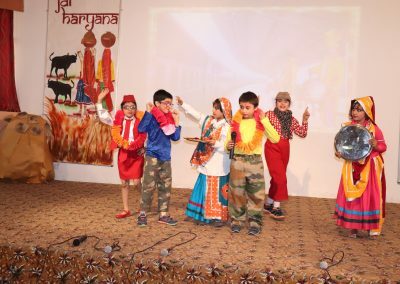 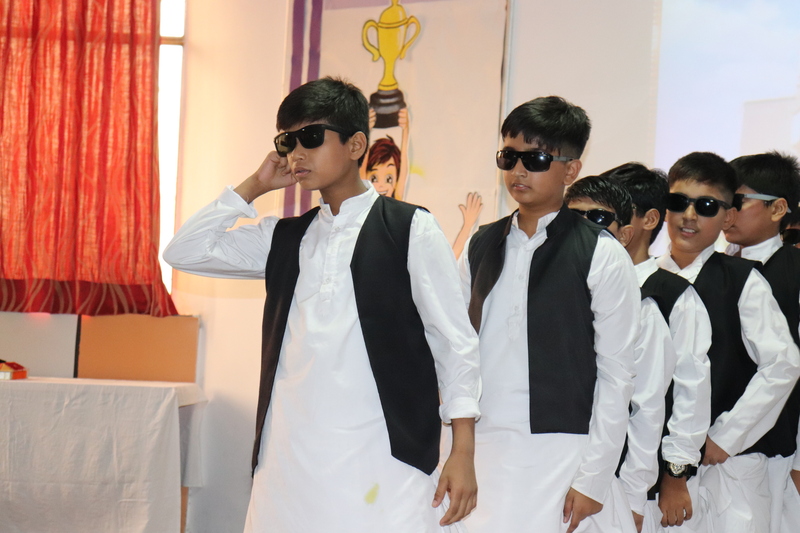 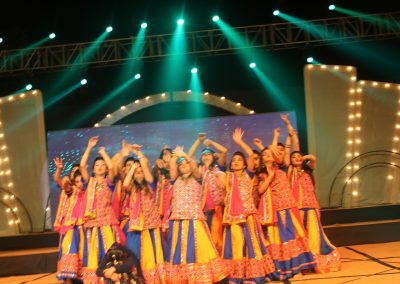 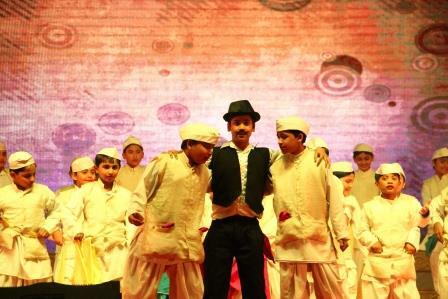 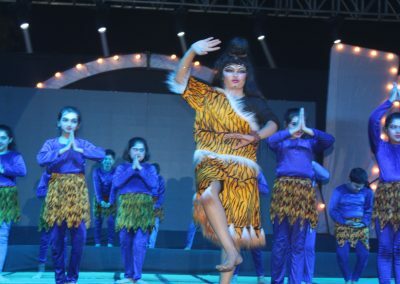 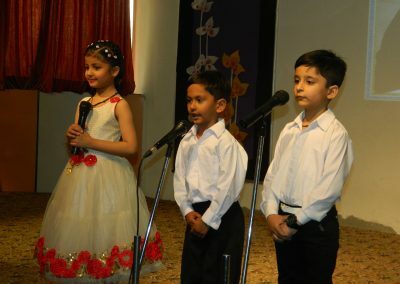 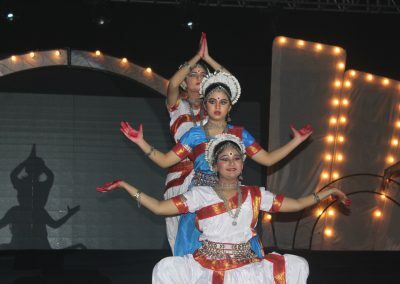 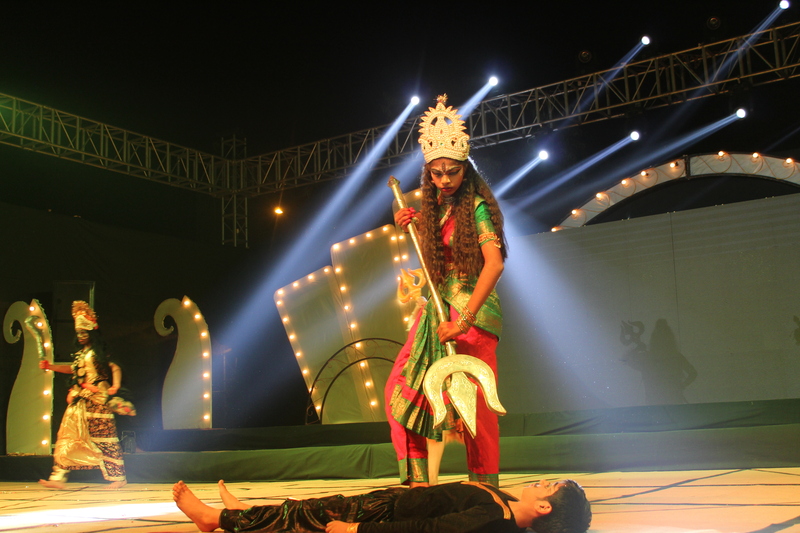 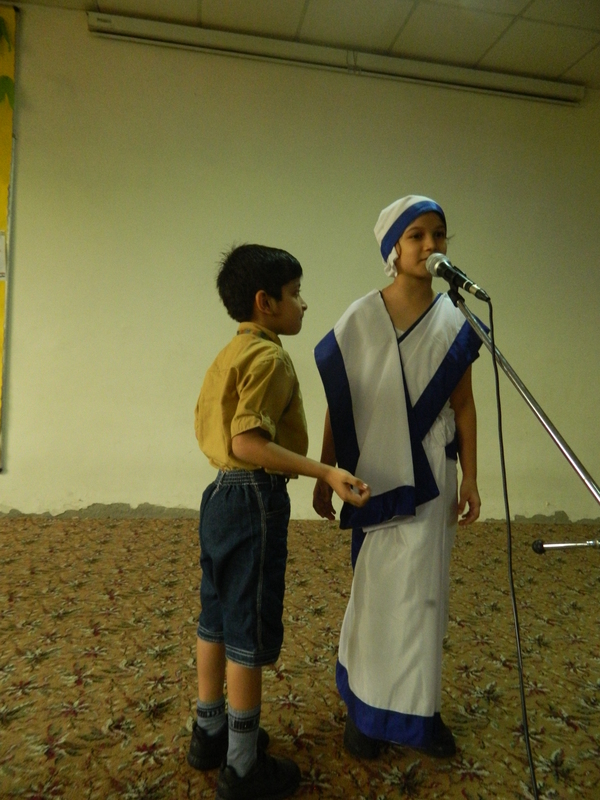 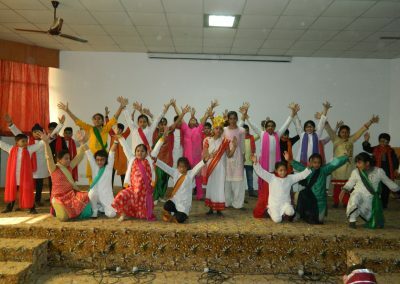 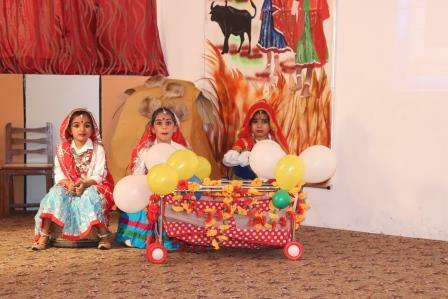 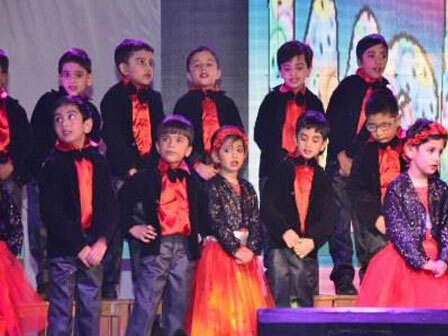 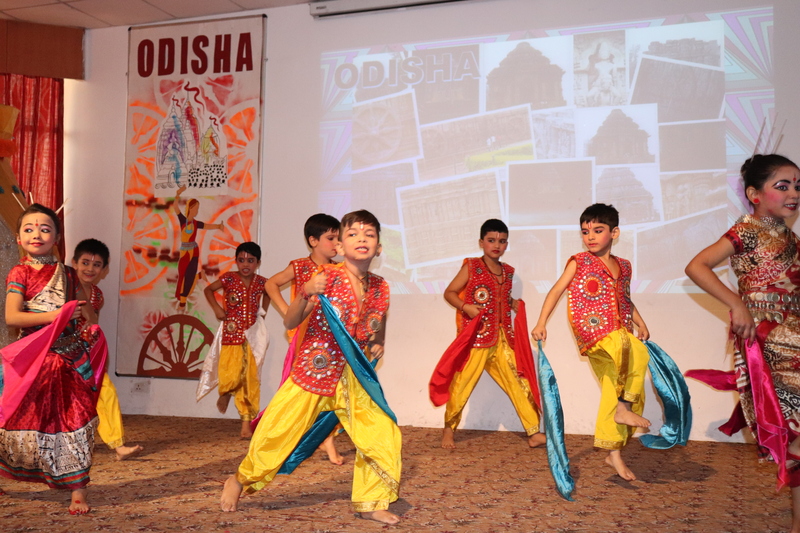 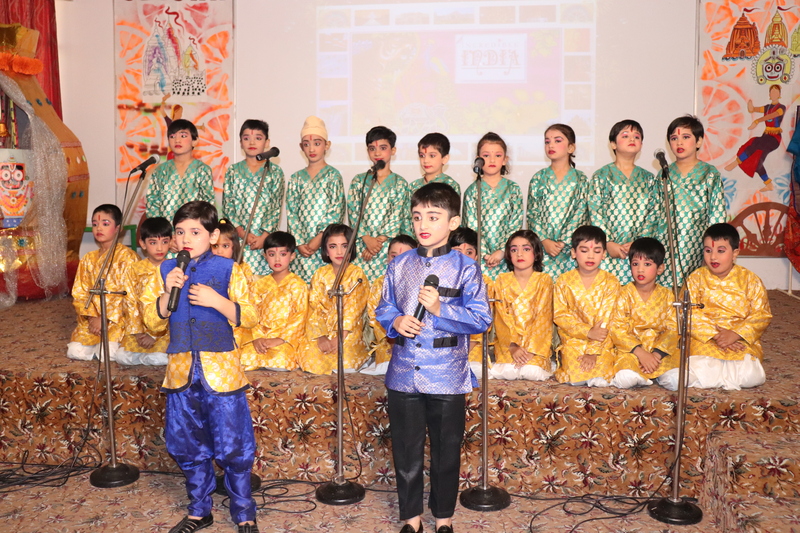 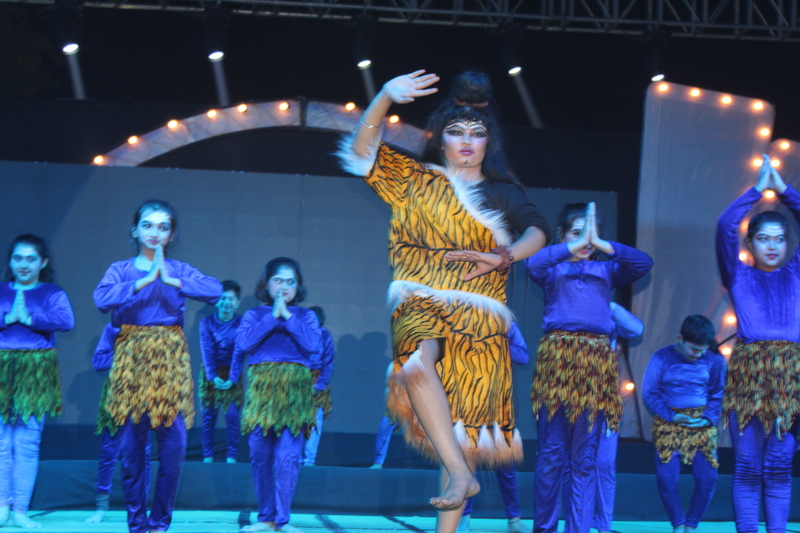 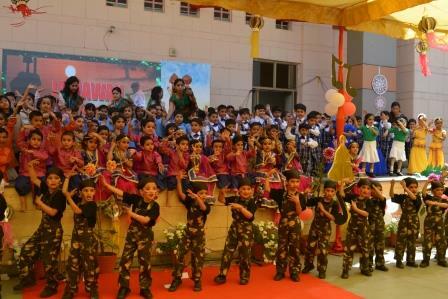 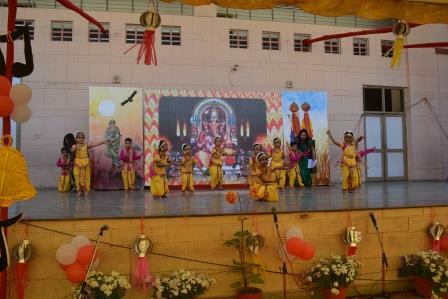 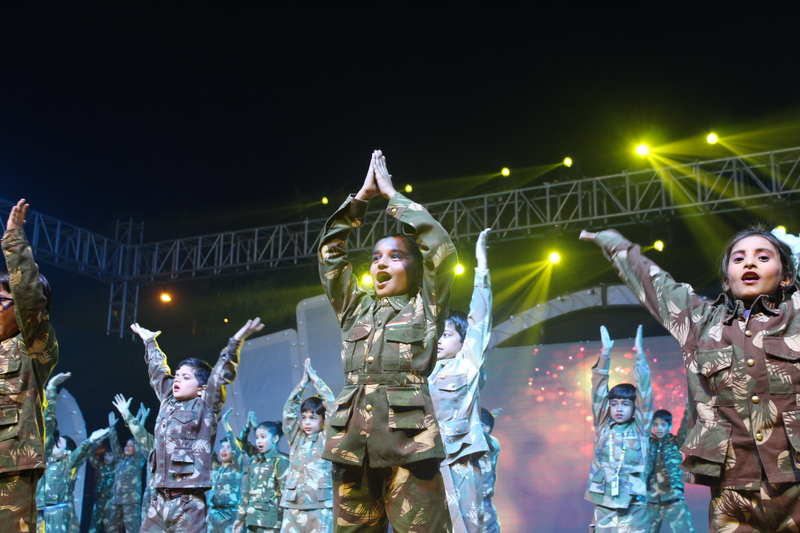 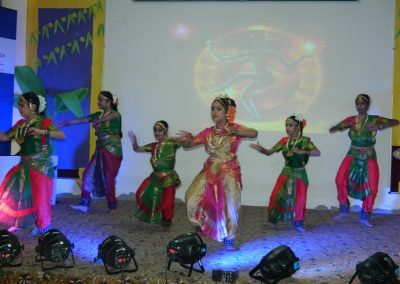 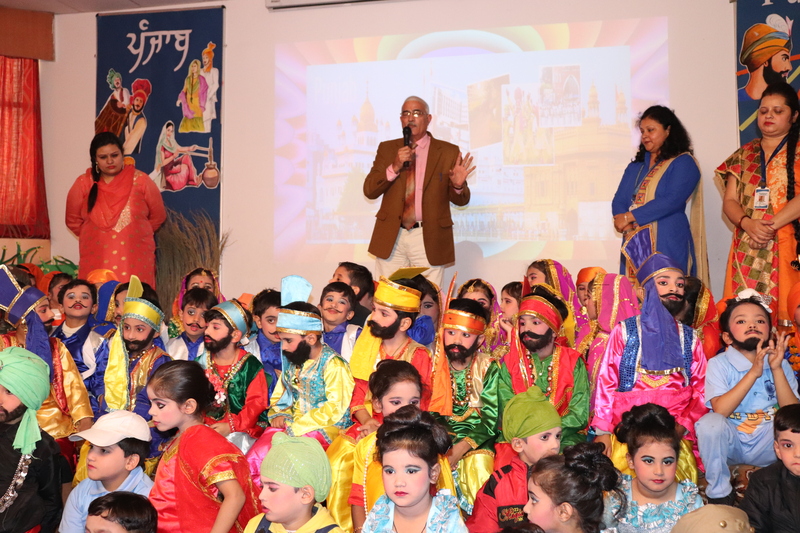 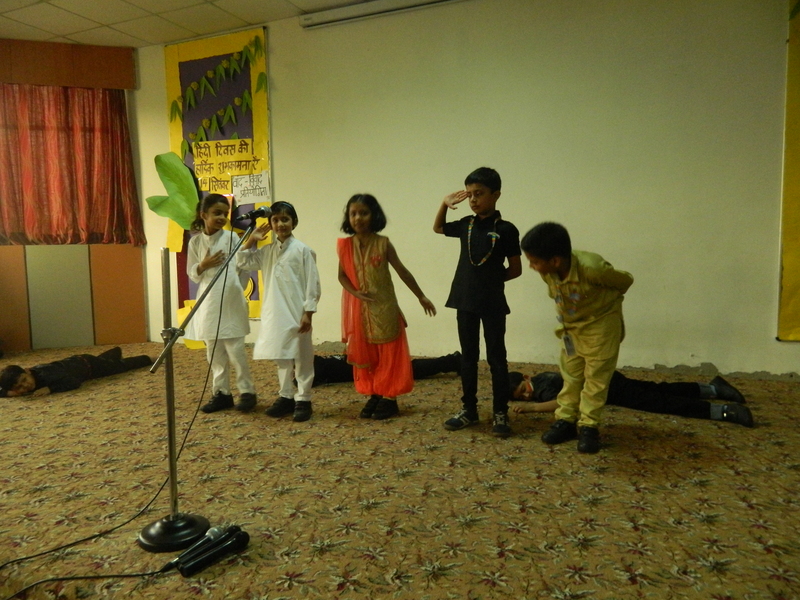 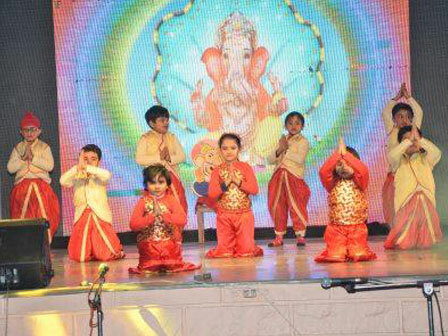 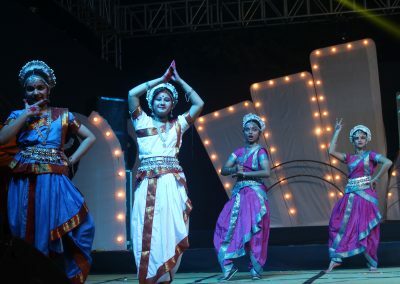 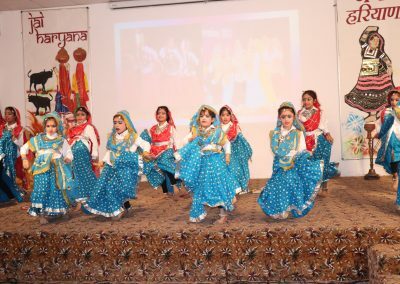 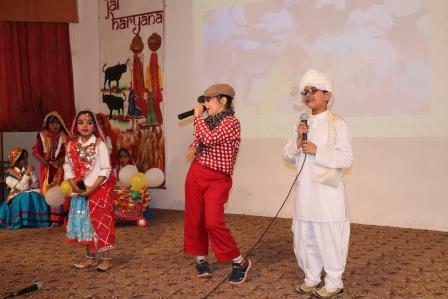 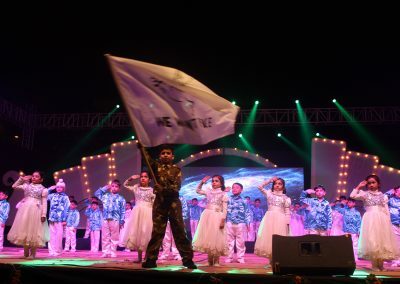 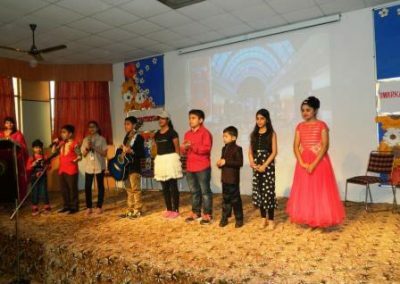 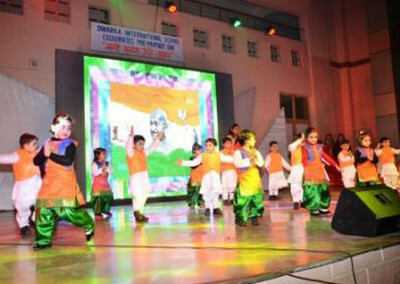 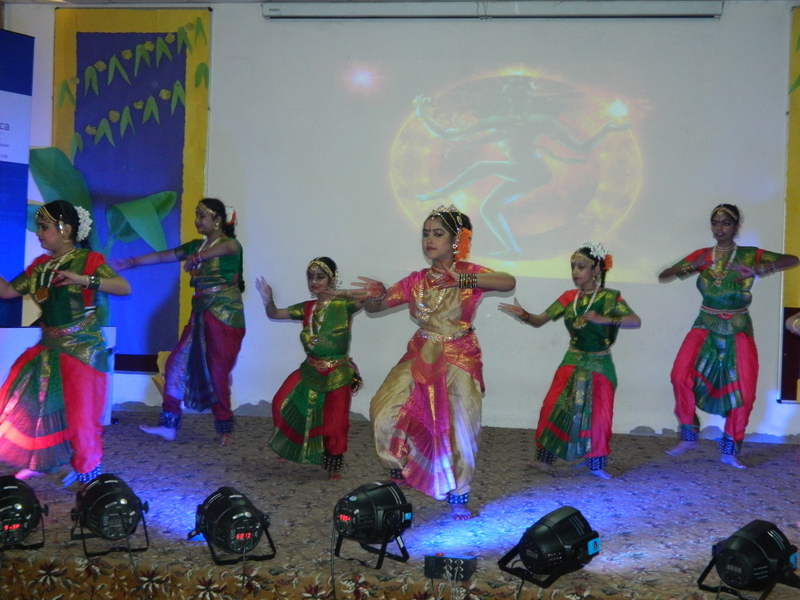 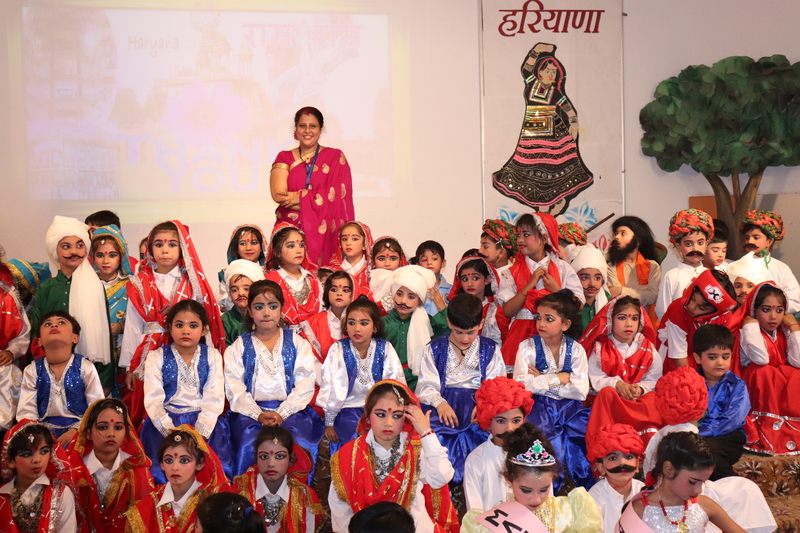 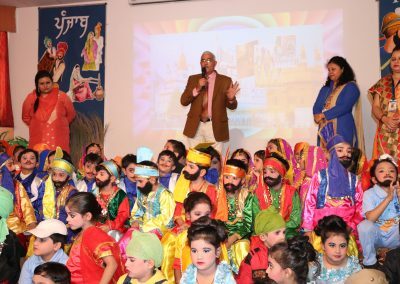 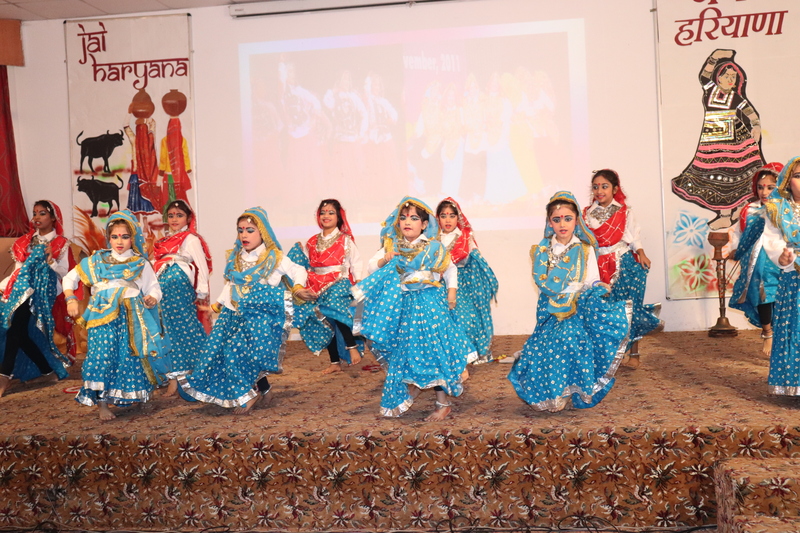 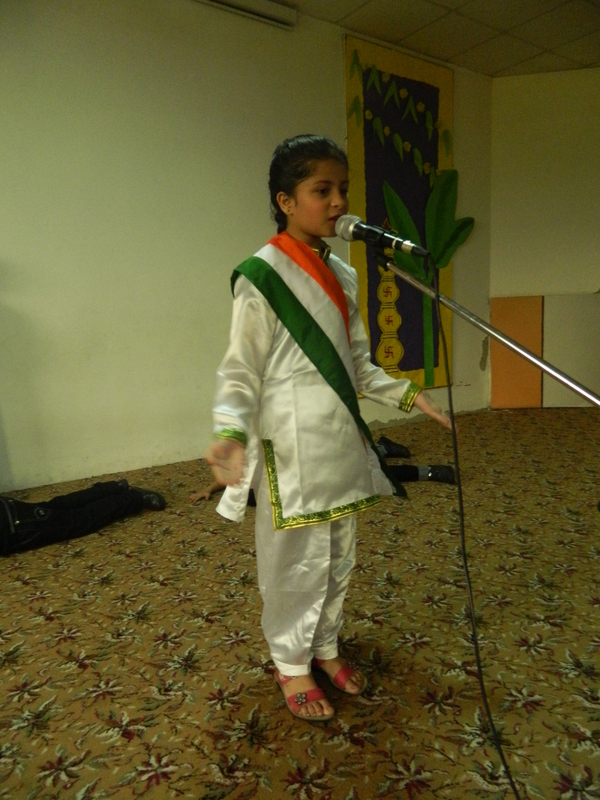 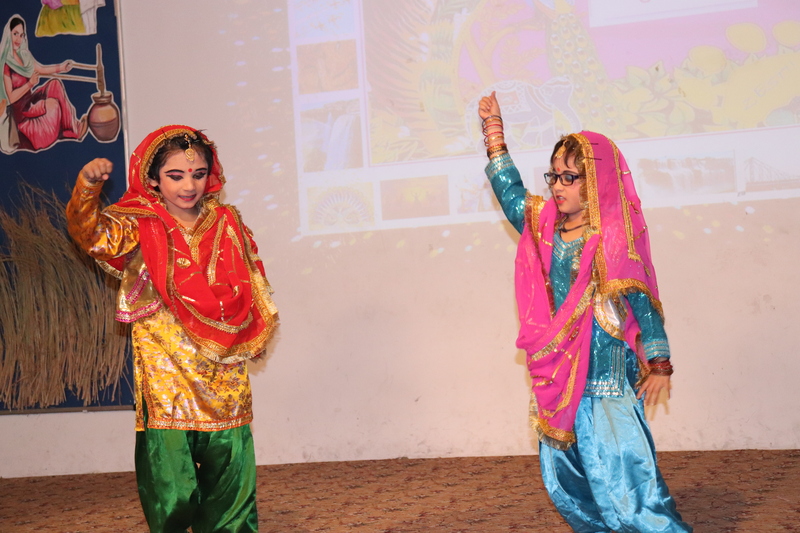 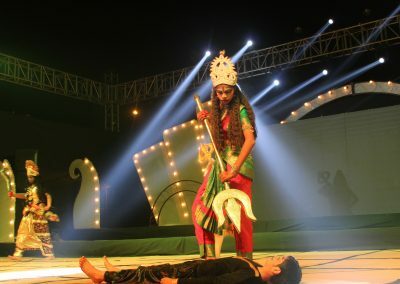 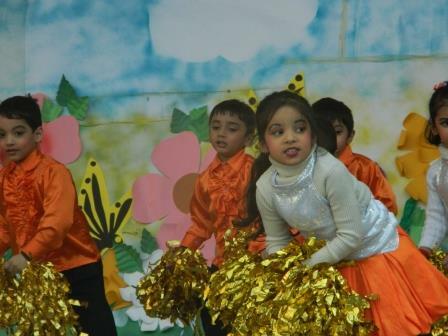 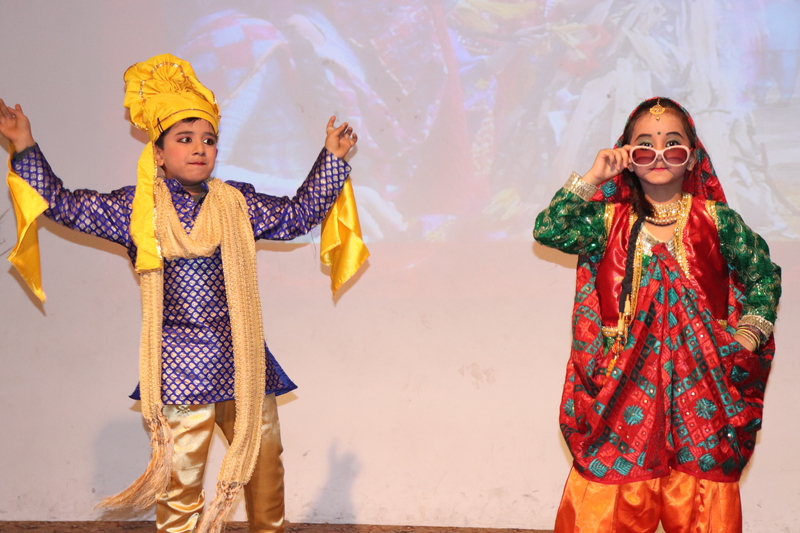 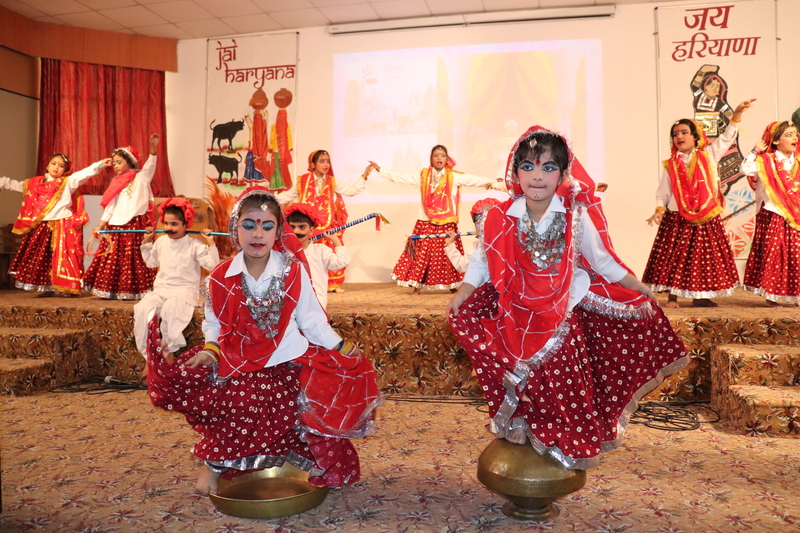 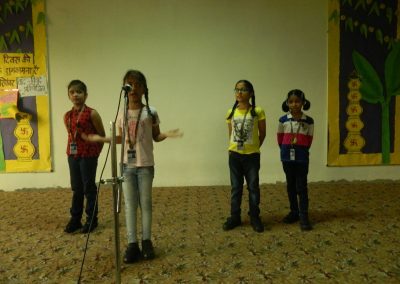 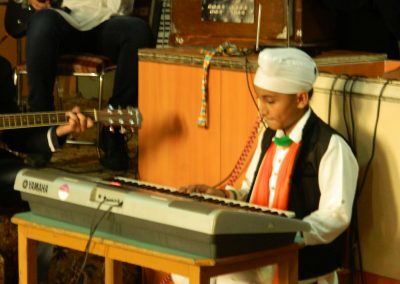 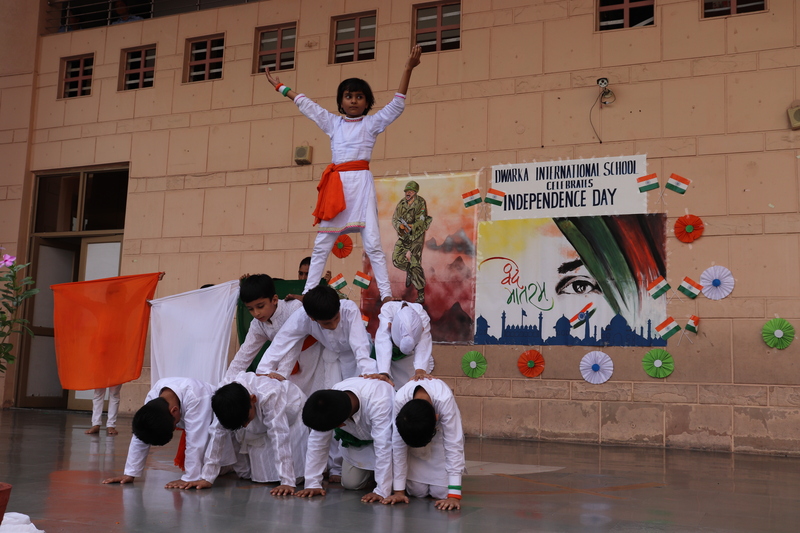 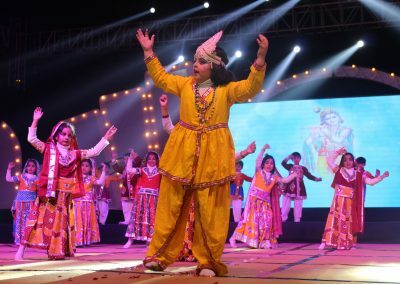 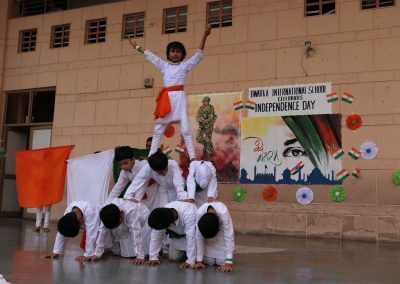 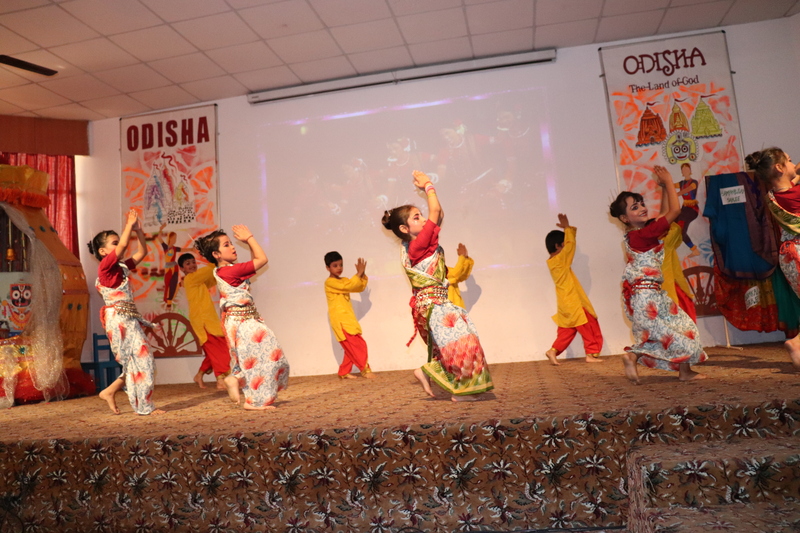 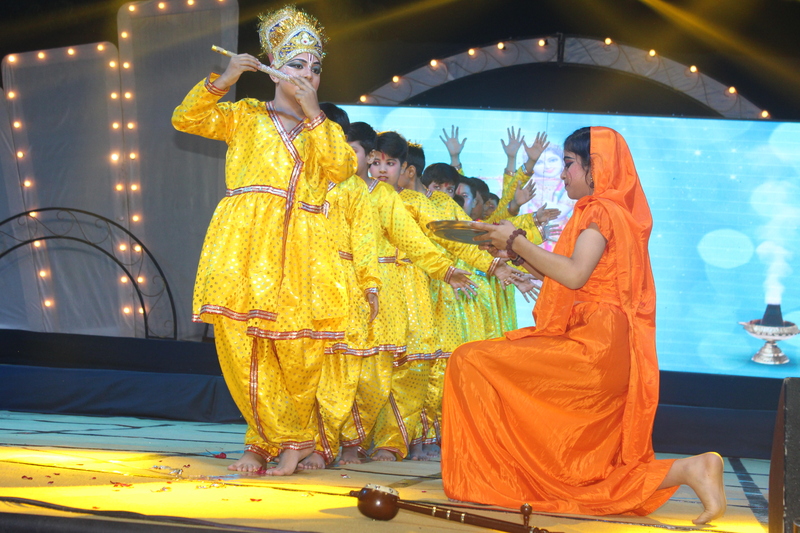 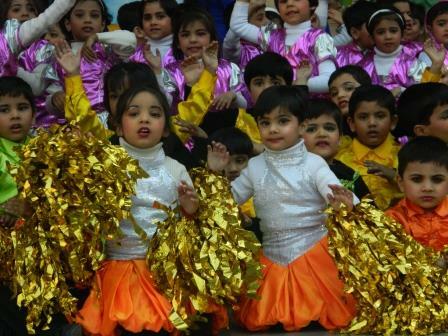 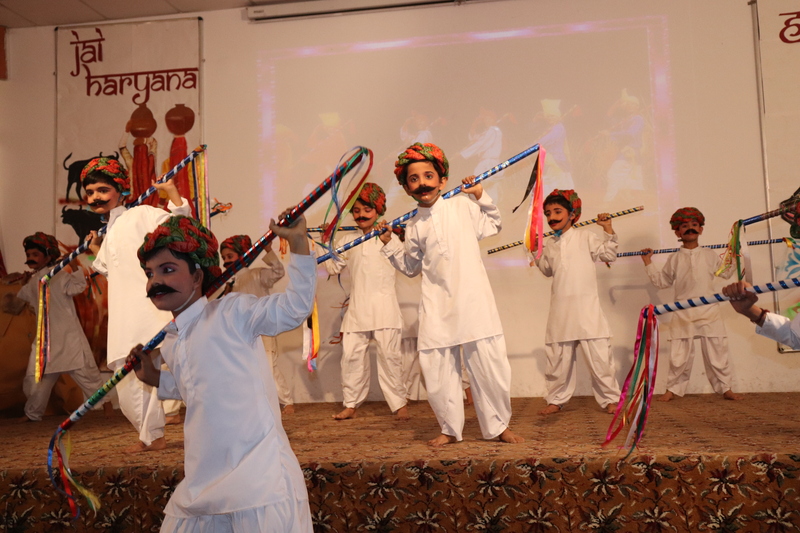 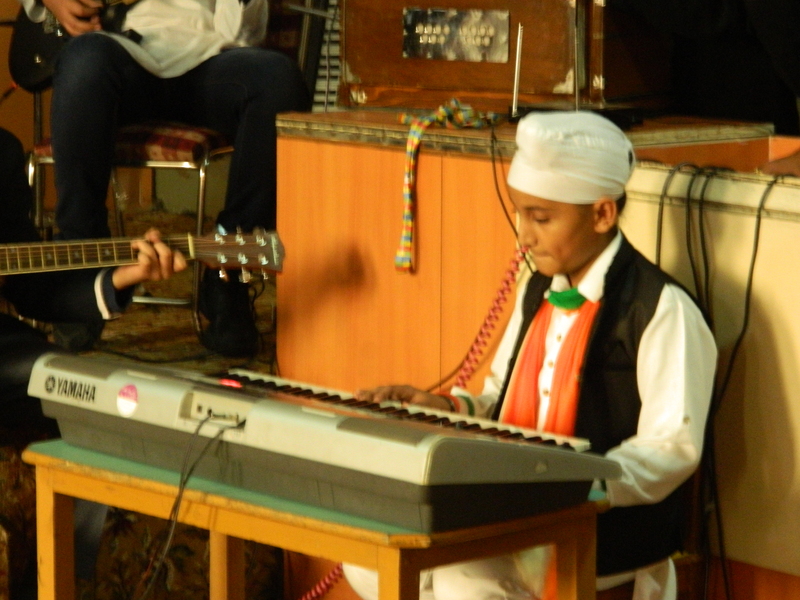 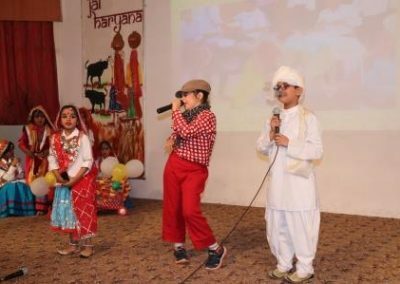 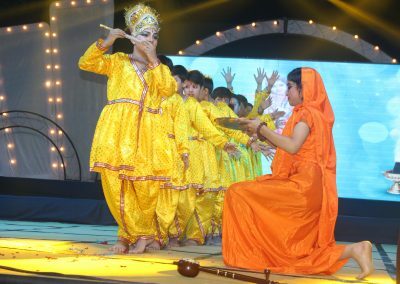 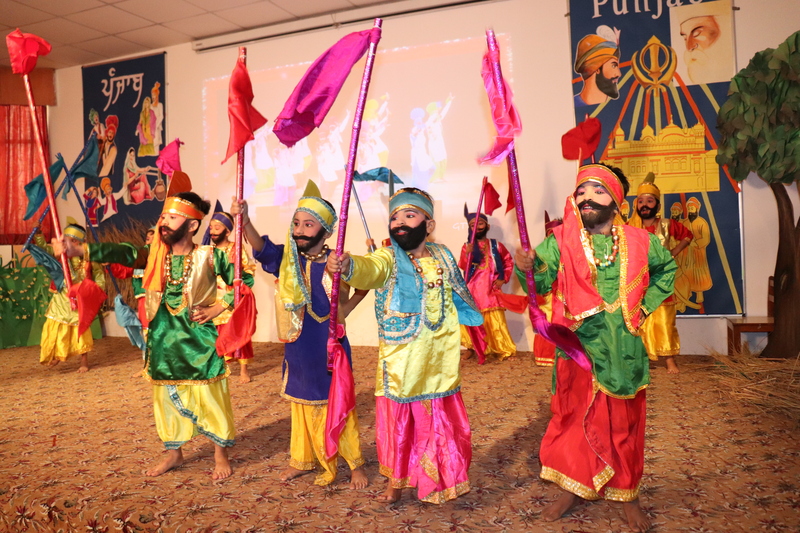 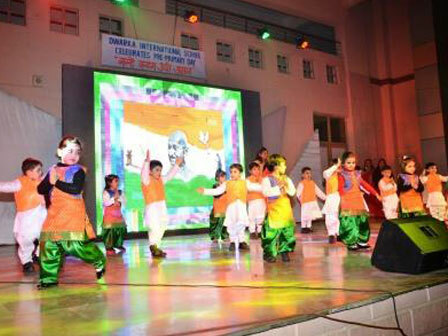 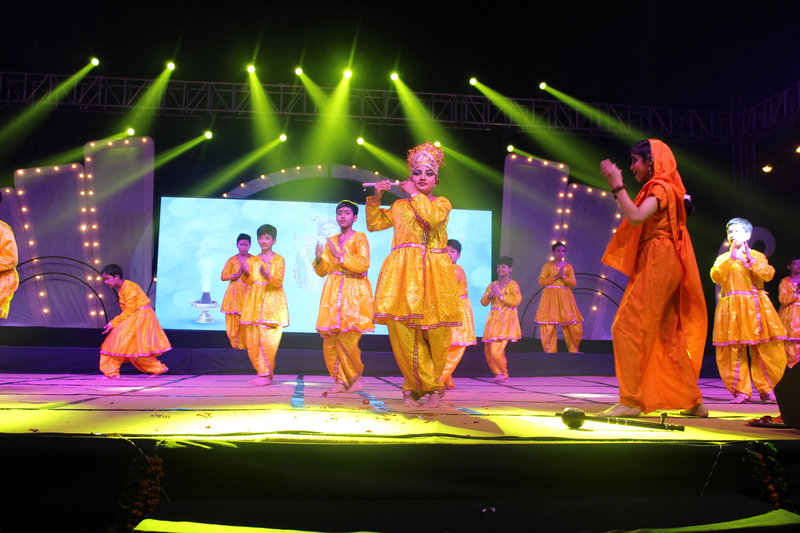 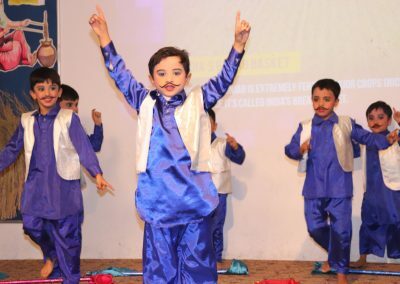 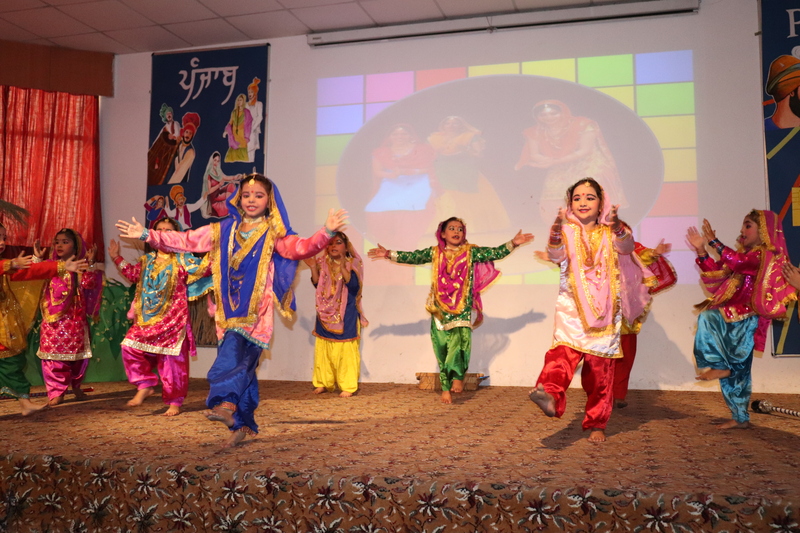 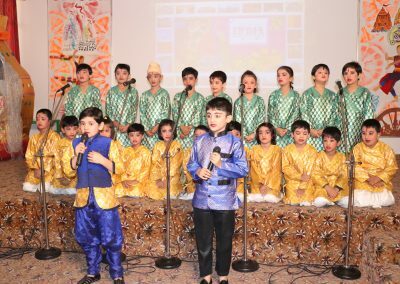 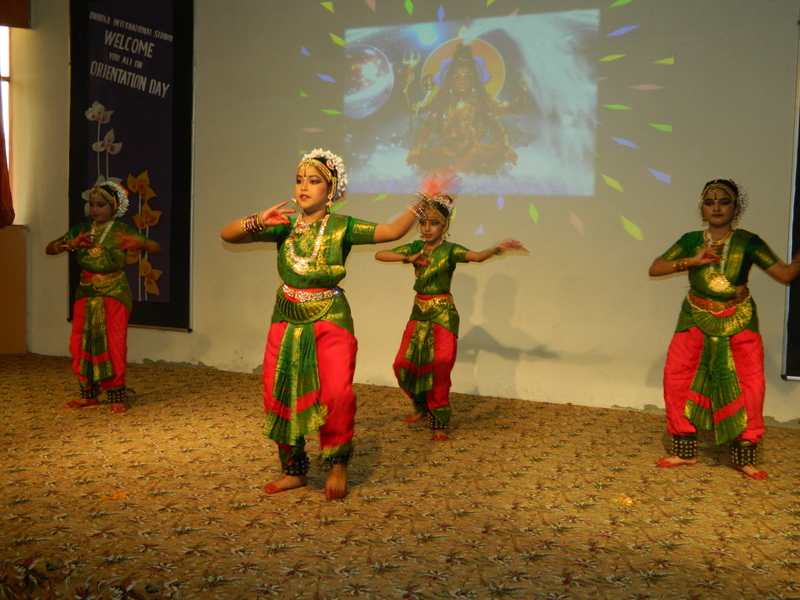 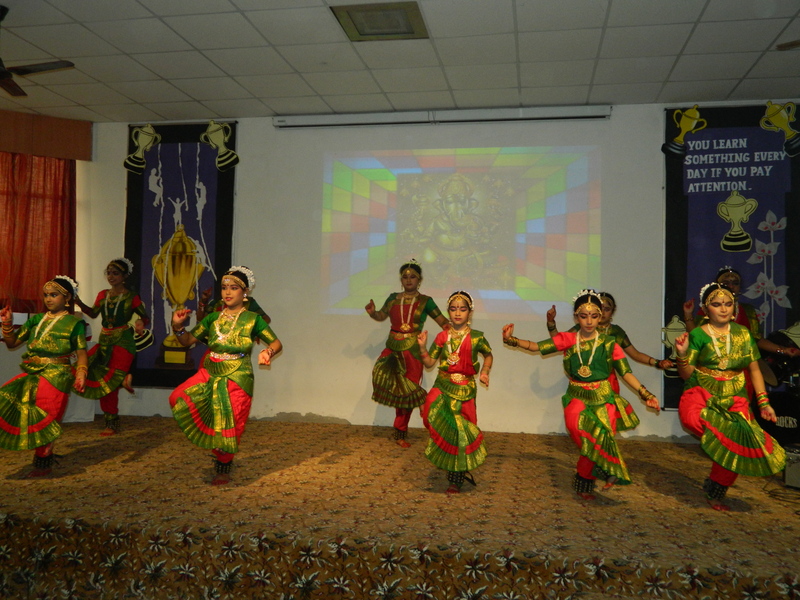 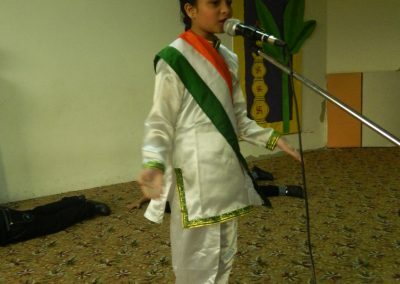 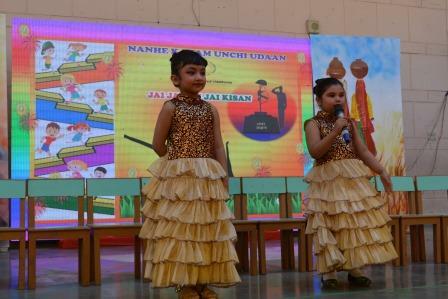 The show comprised colourful variety of performances by the budding talents from kindergarten. 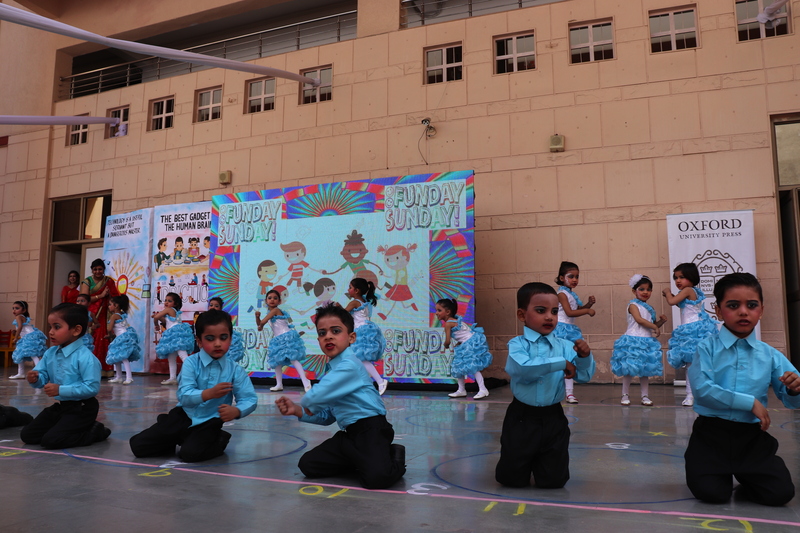 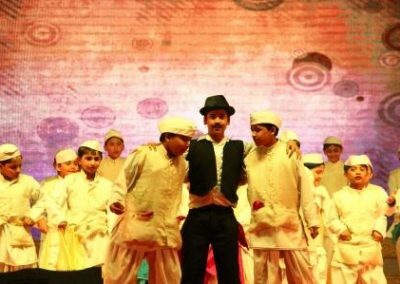 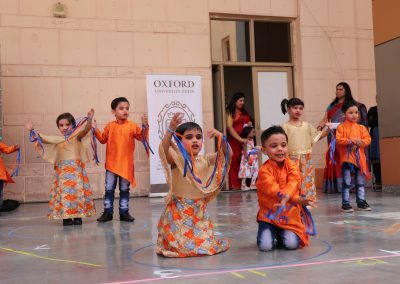 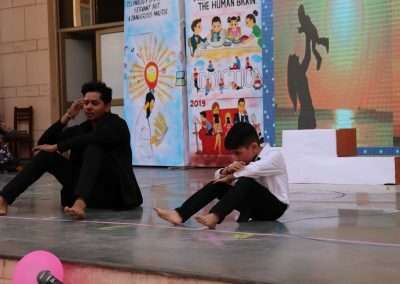 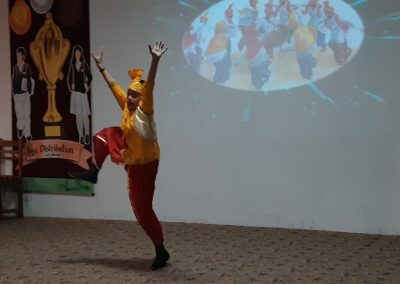 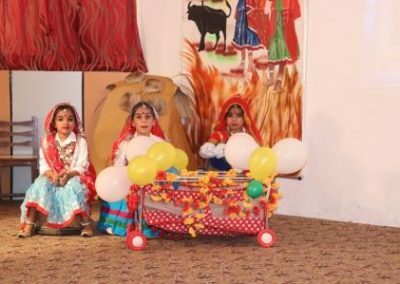 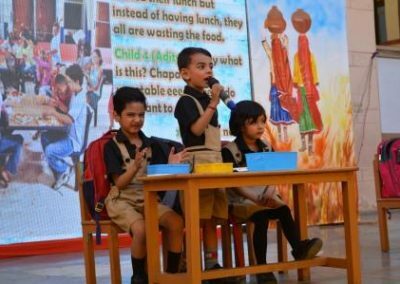 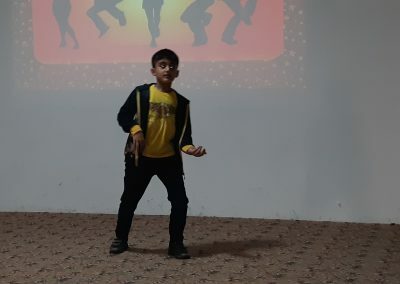 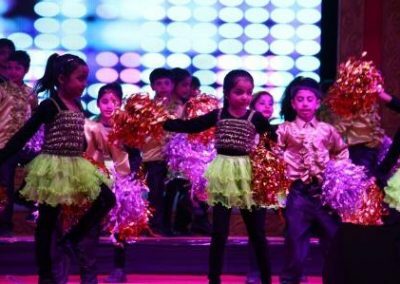 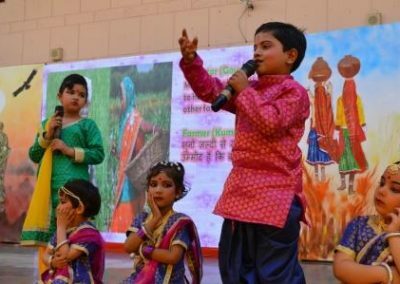 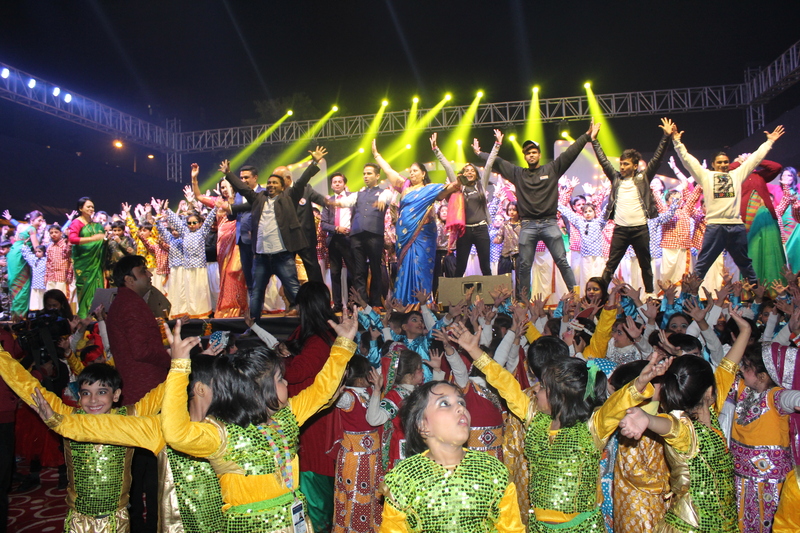 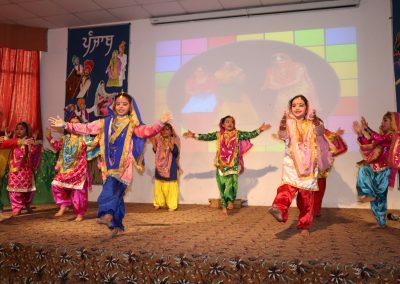 The programme with dance, skits and individual performances, beautifully displayed the musical, choreographical and acting talents of the tiny tots. 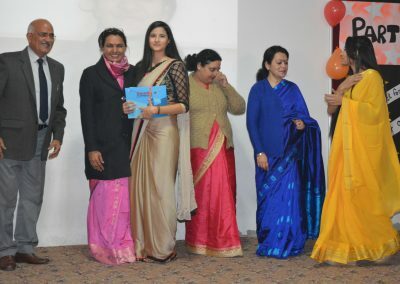 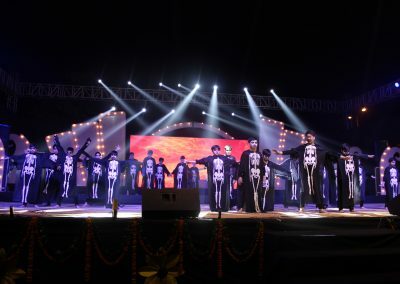 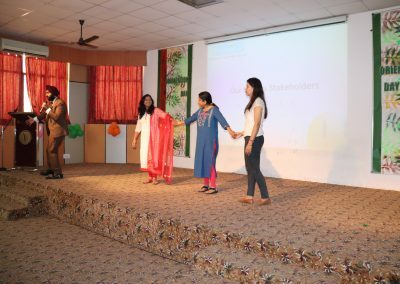 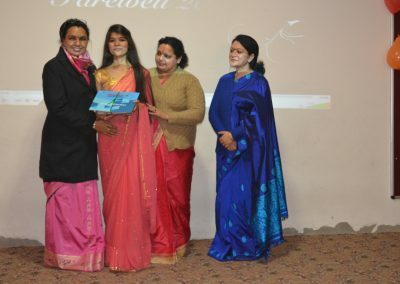 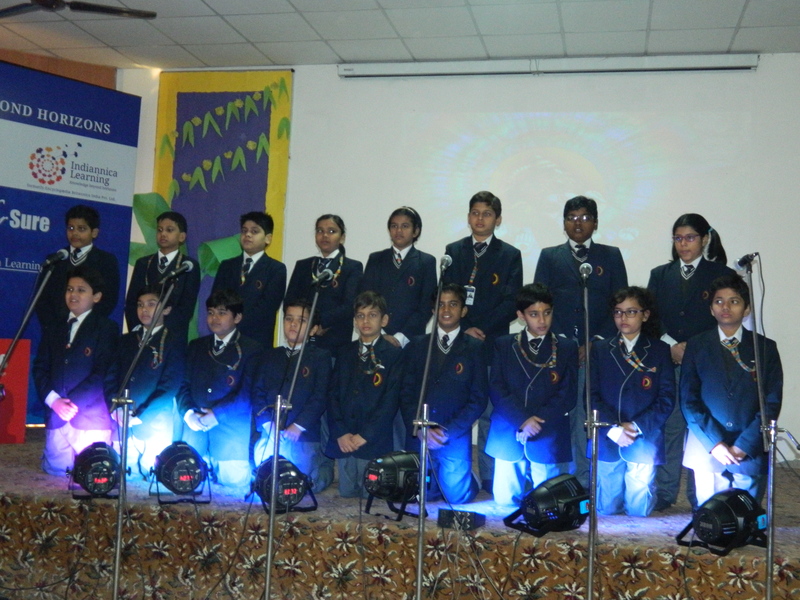 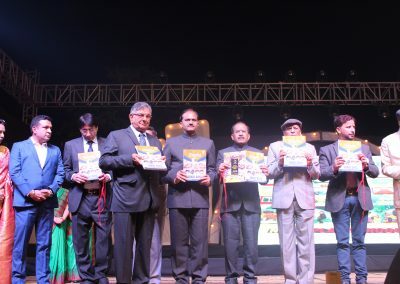 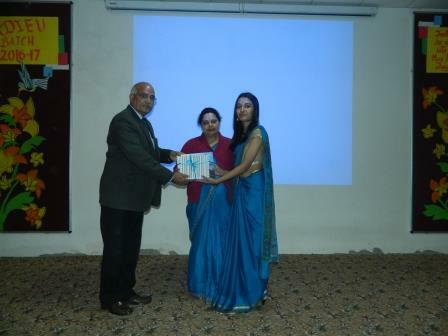 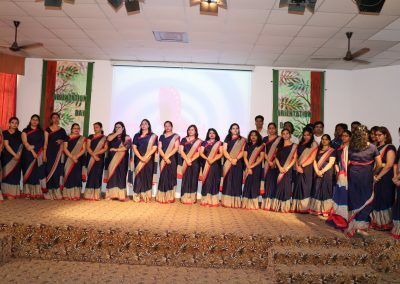 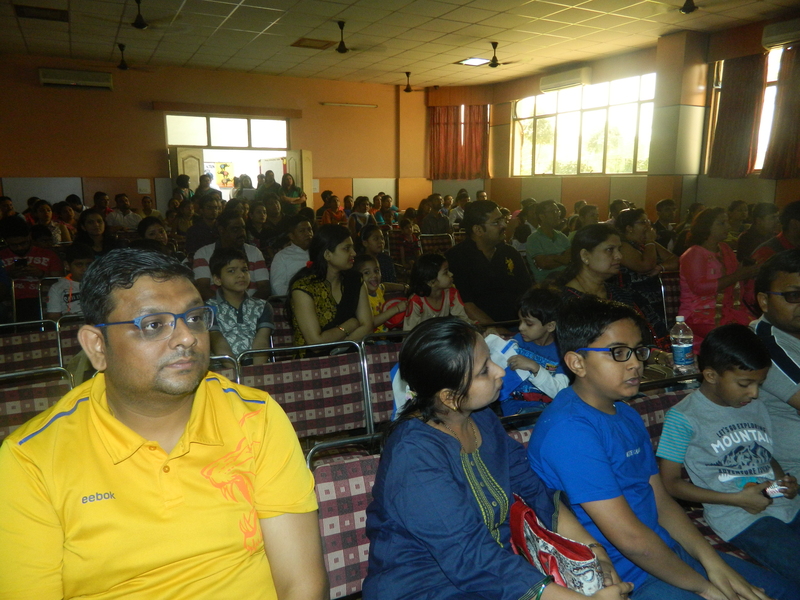 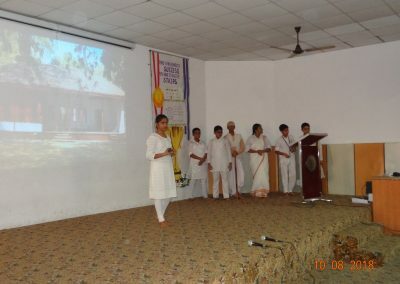 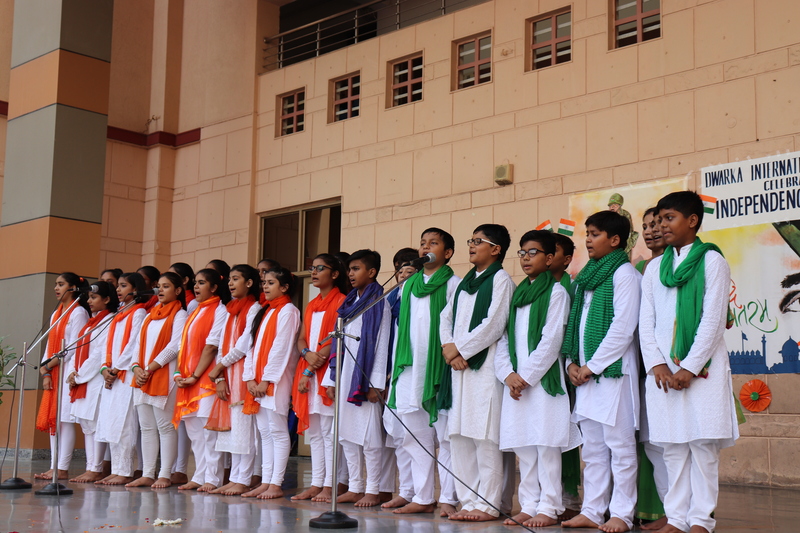 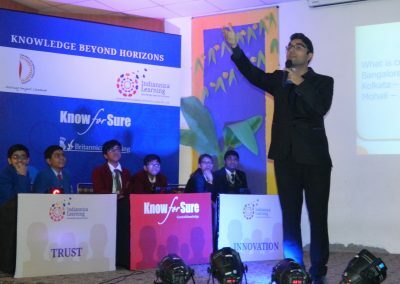 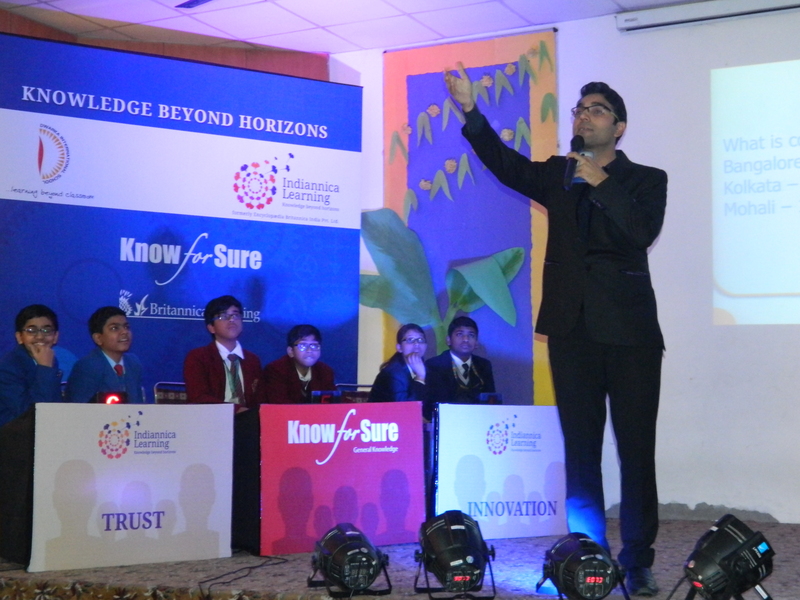 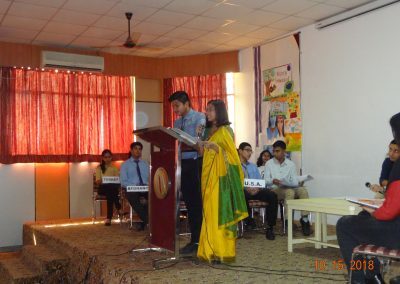 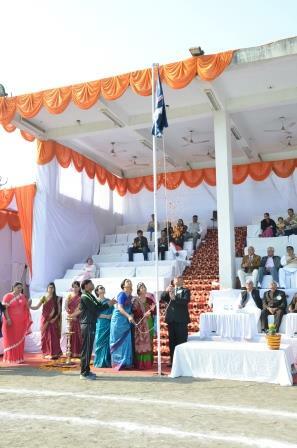 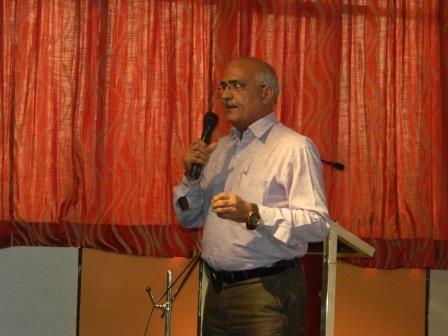 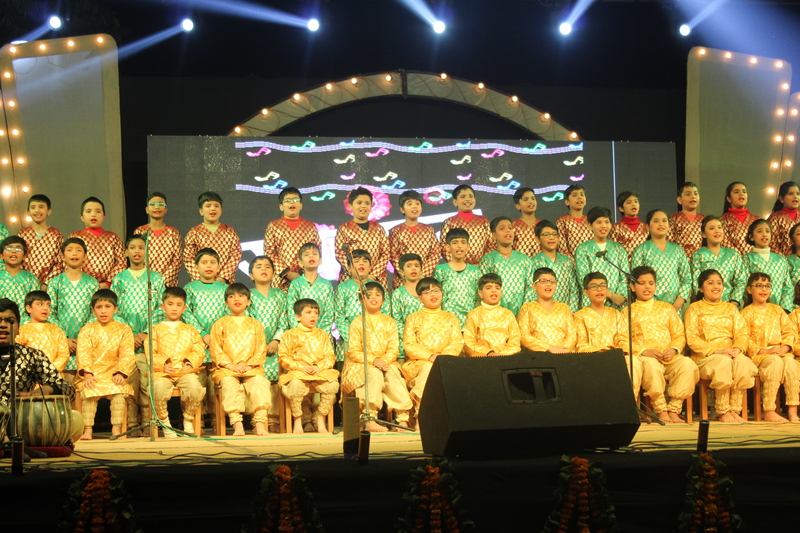 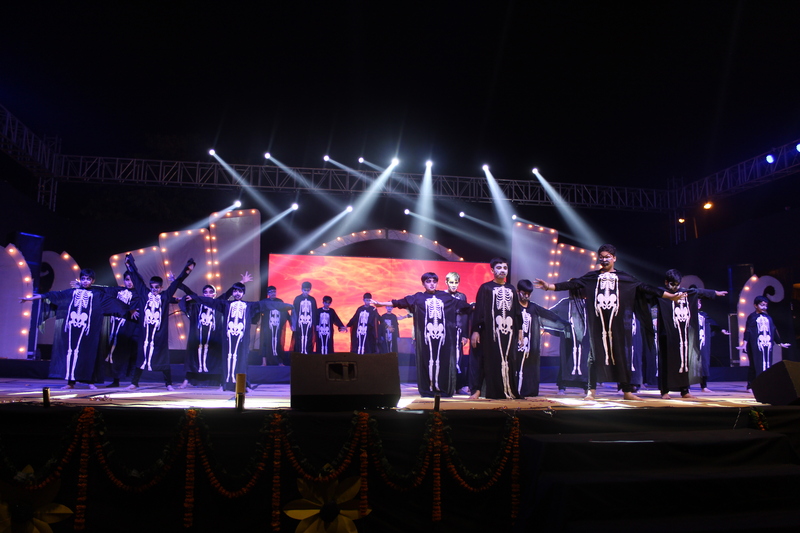 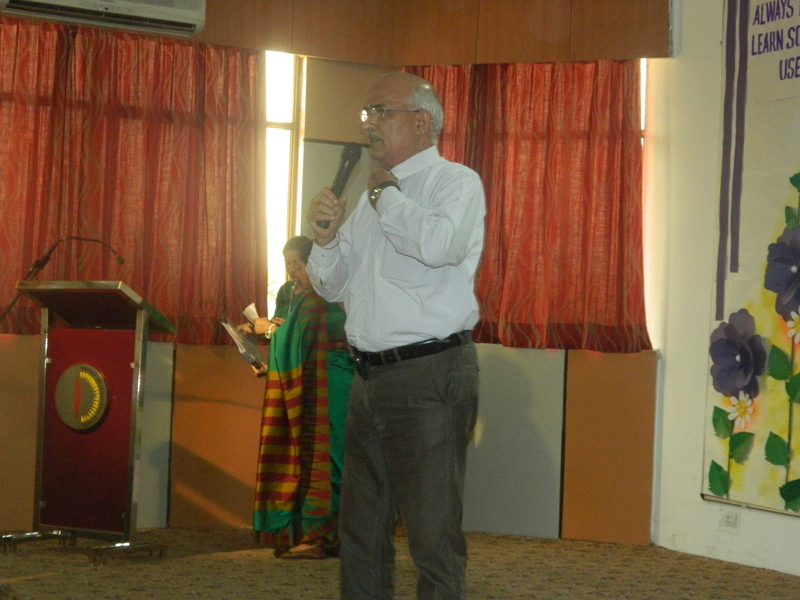 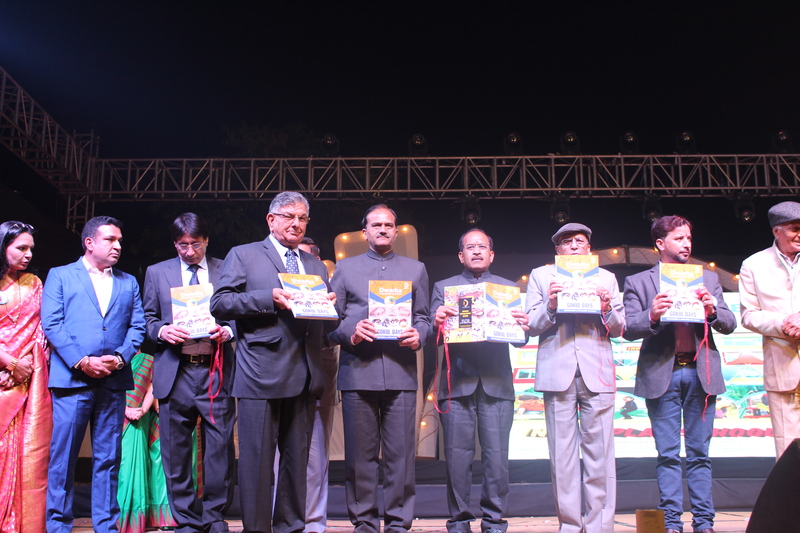 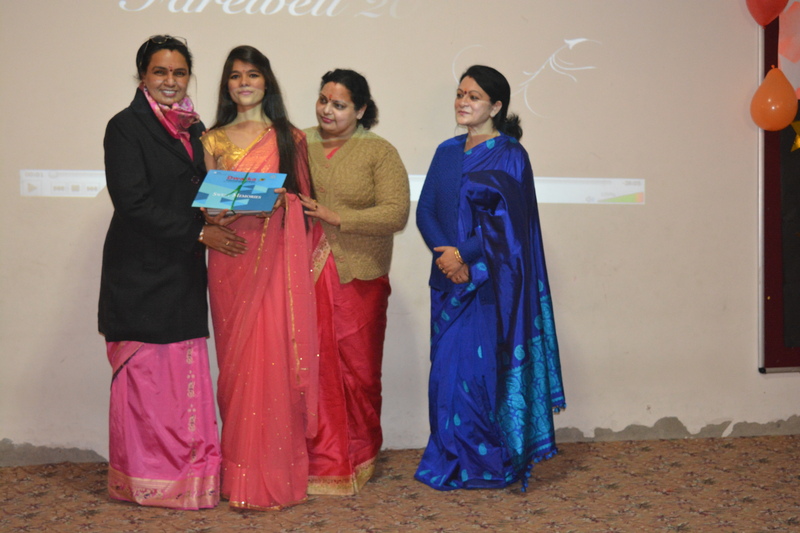 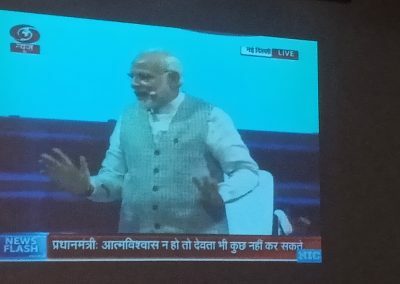 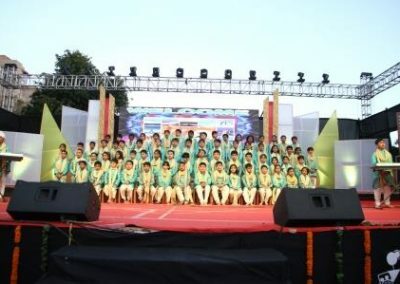 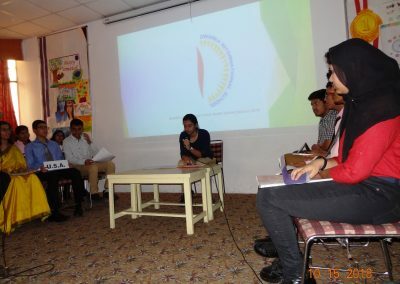 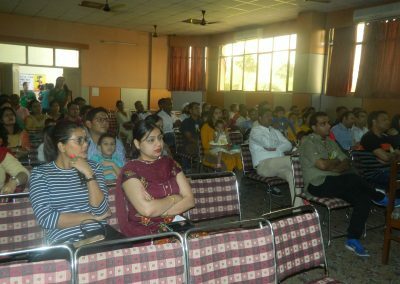 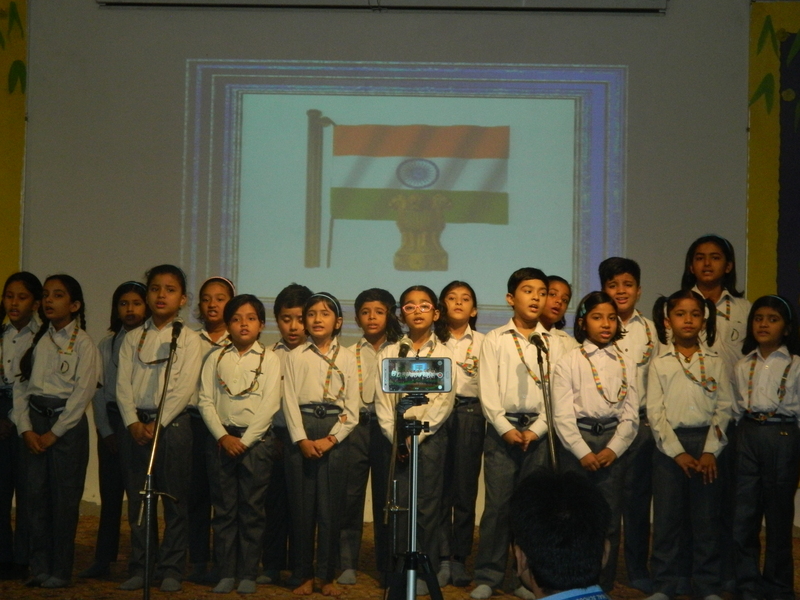 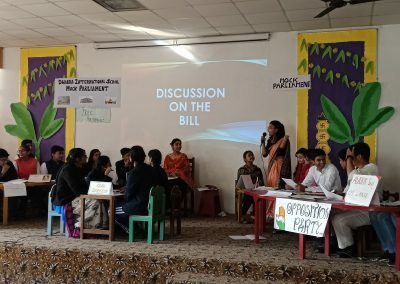 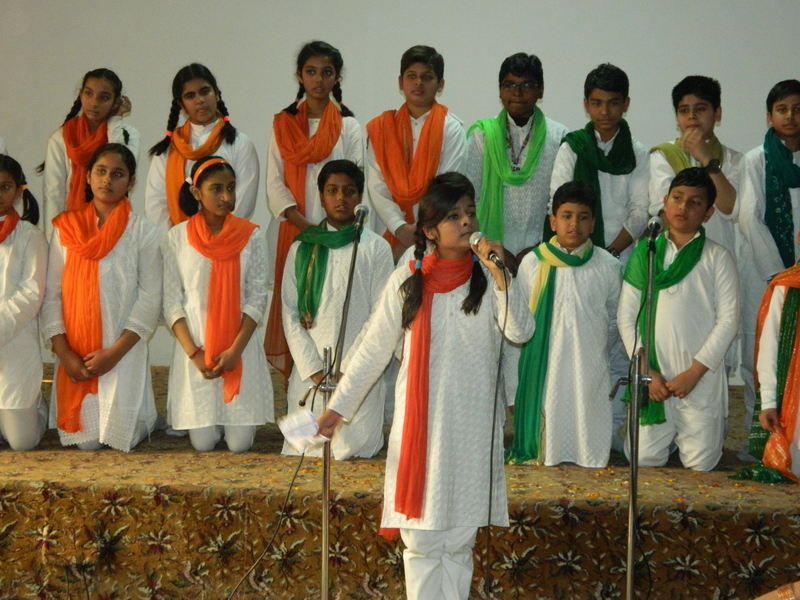 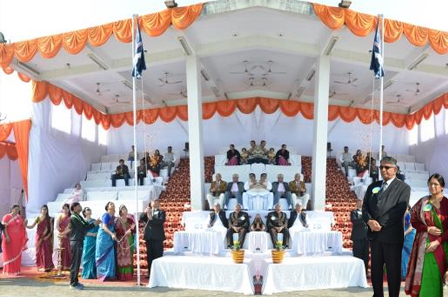 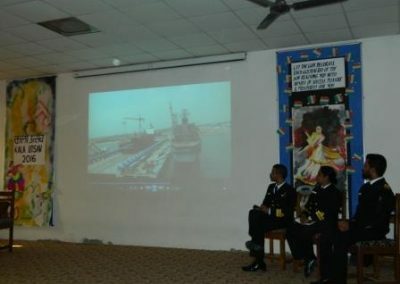 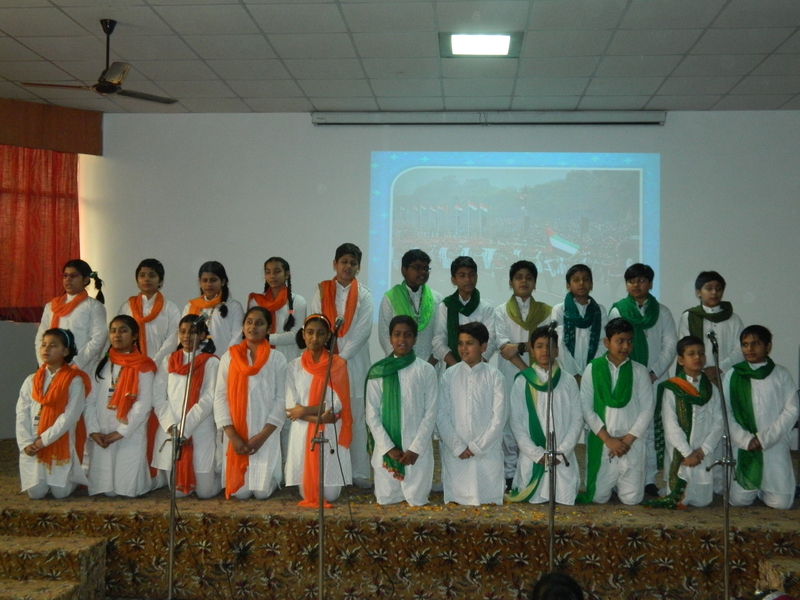 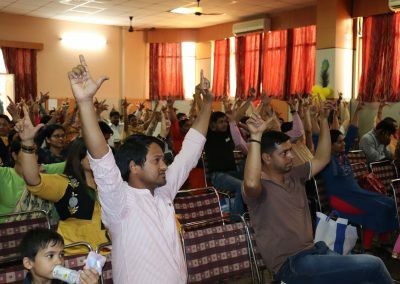 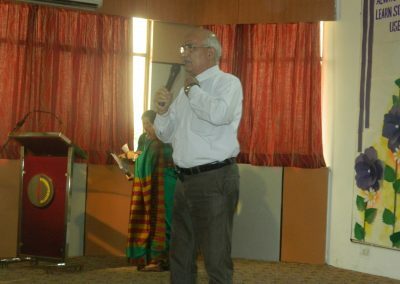 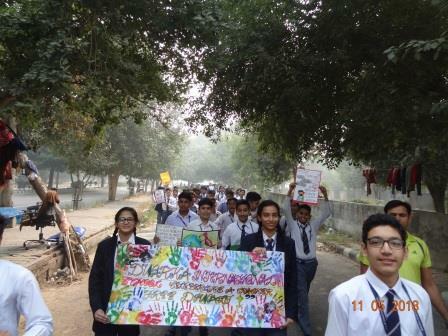 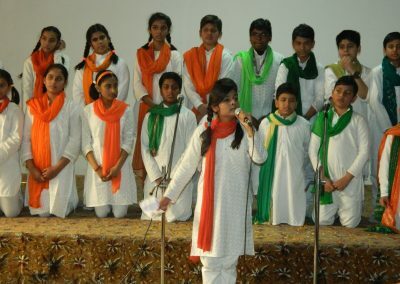 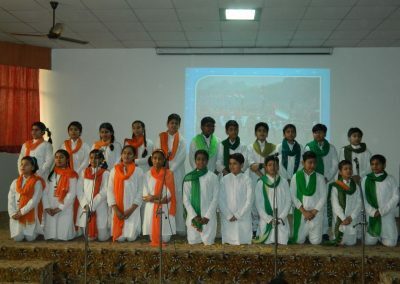 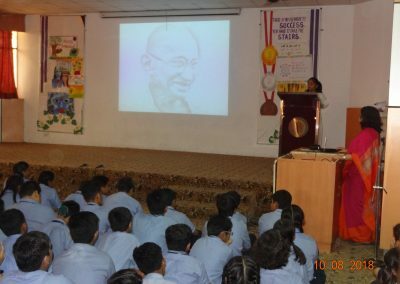 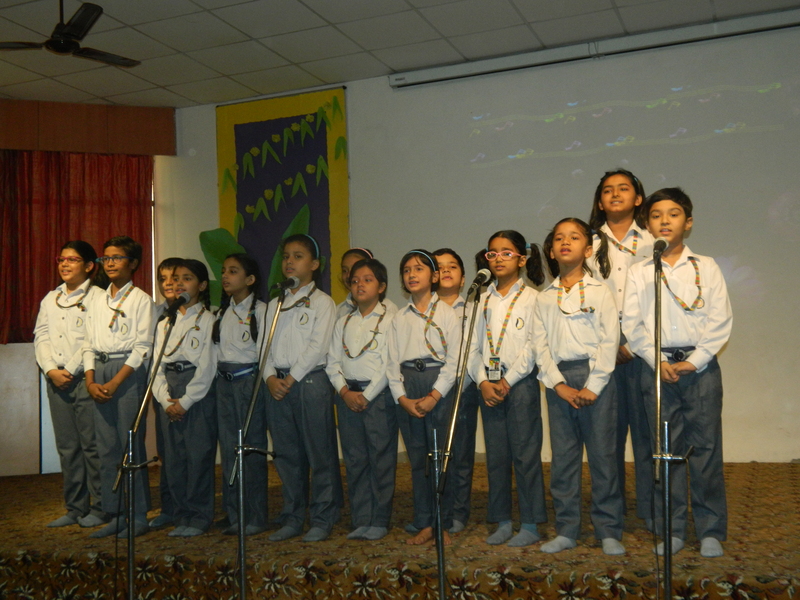 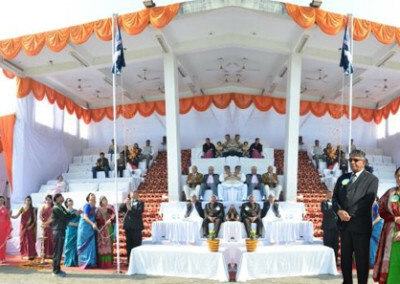 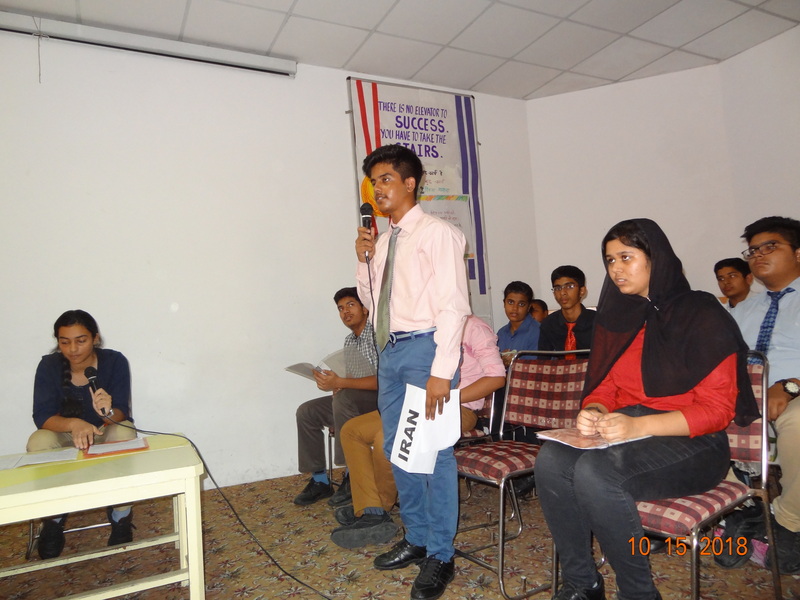 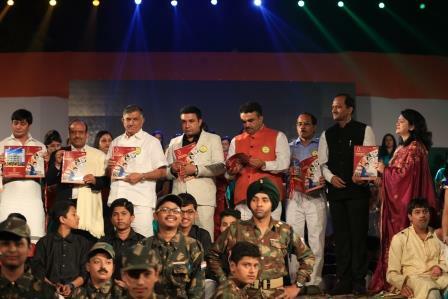 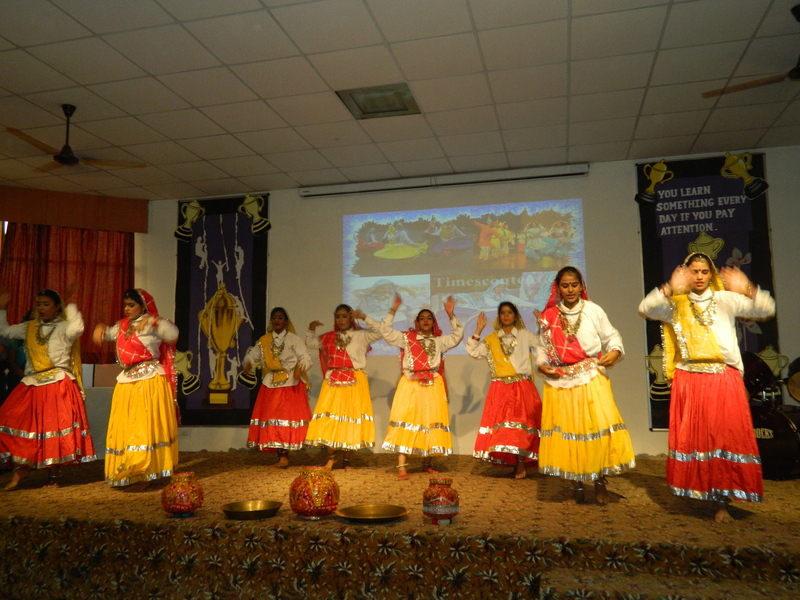 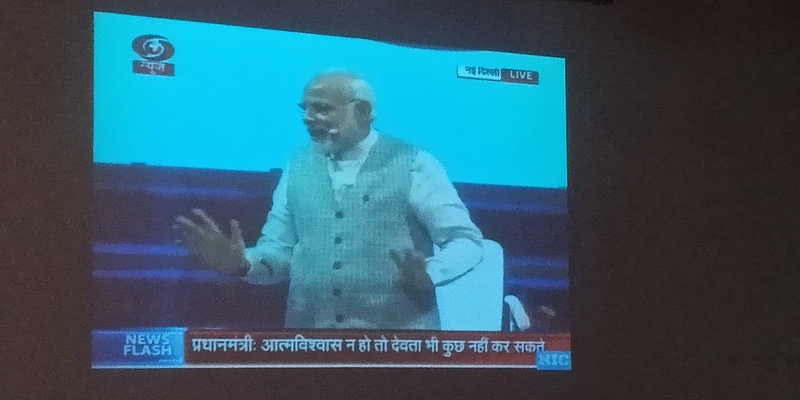 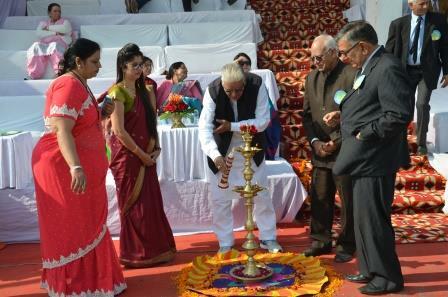 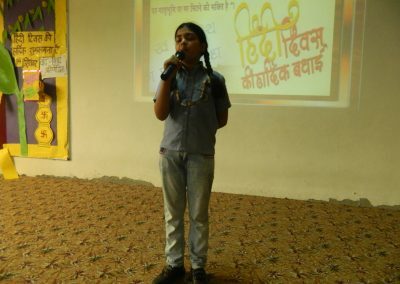 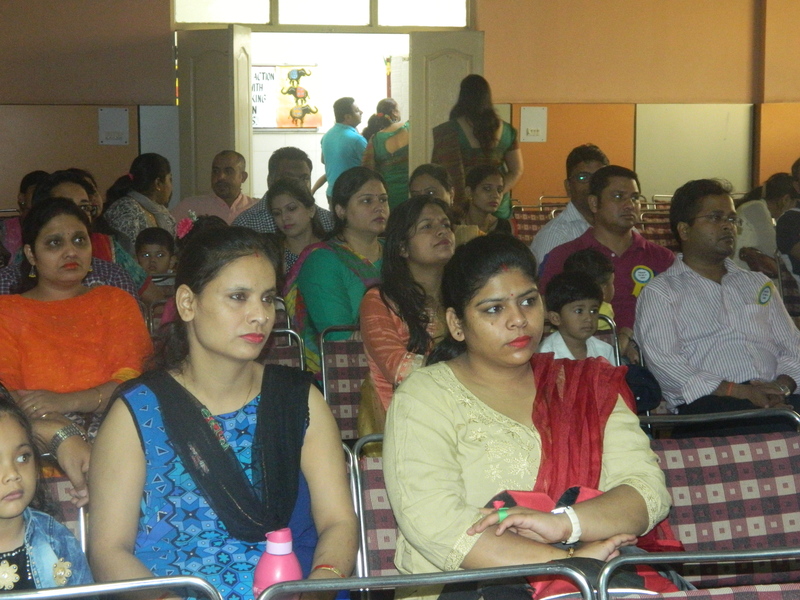 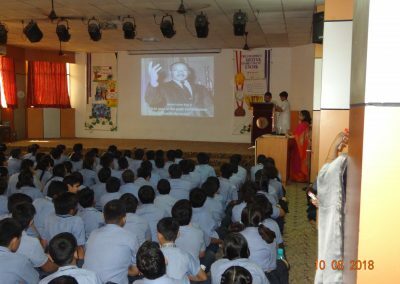 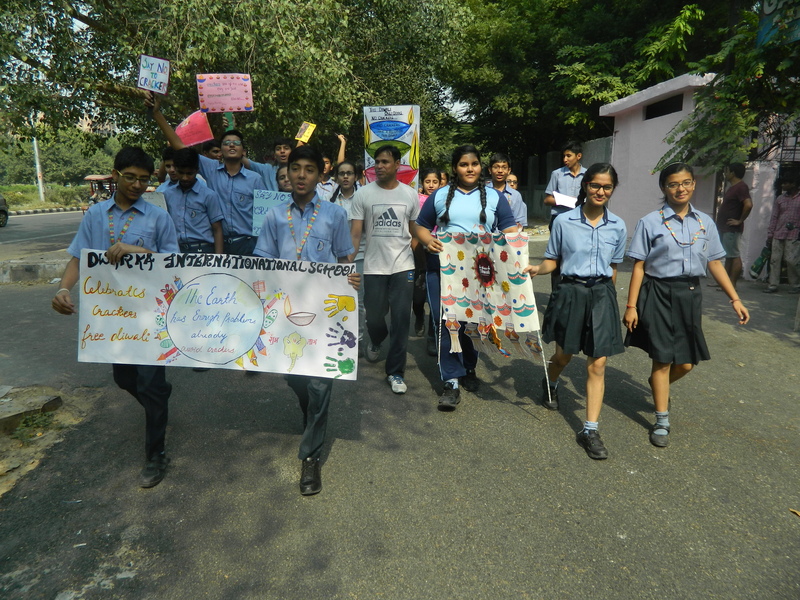 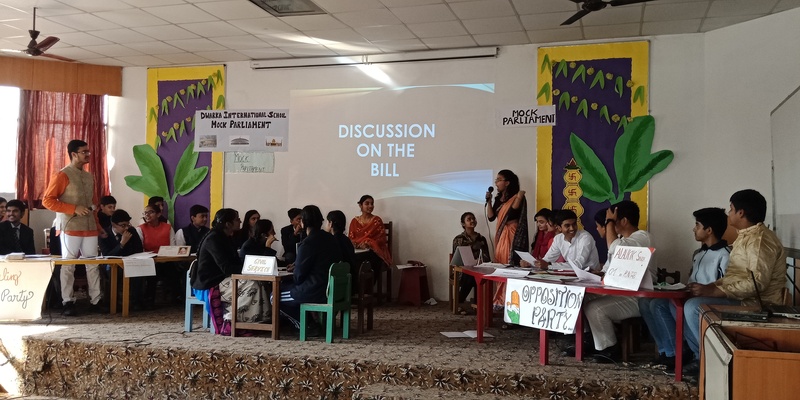 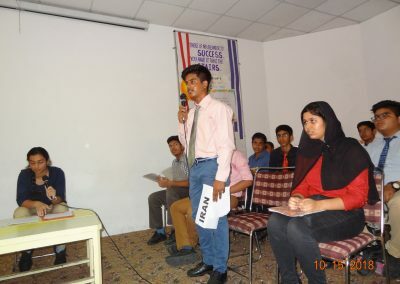 The theme of the programme was ‘TOGETHER….BUT ALONE’. 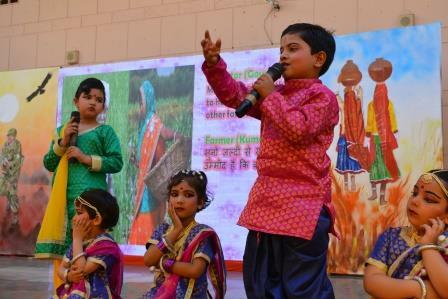 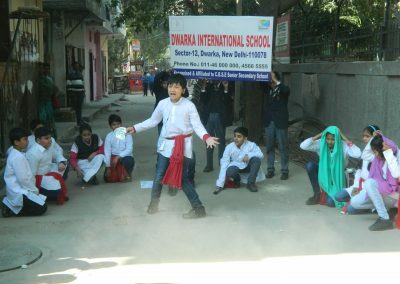 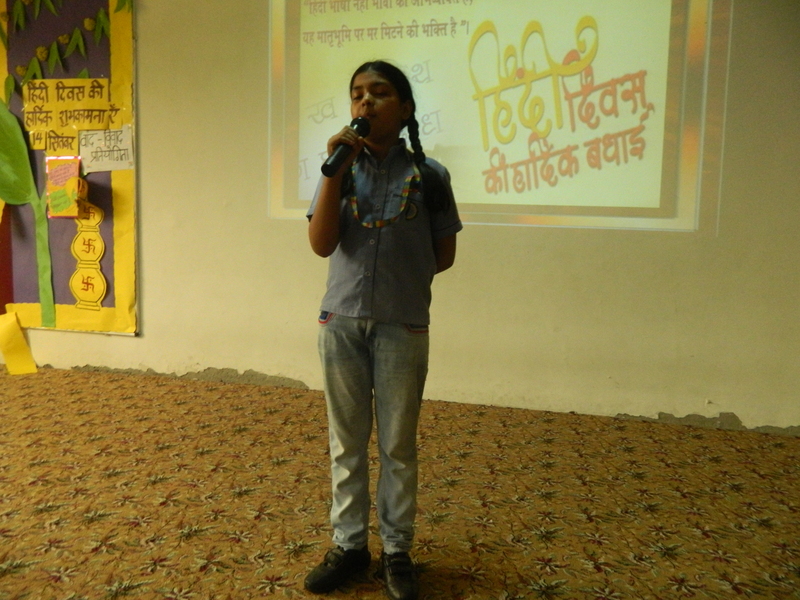 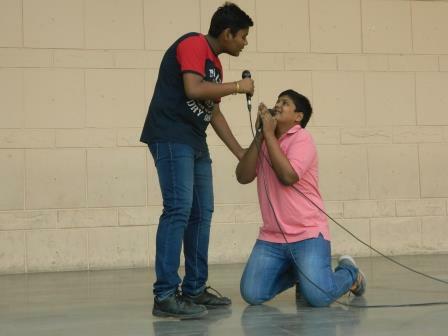 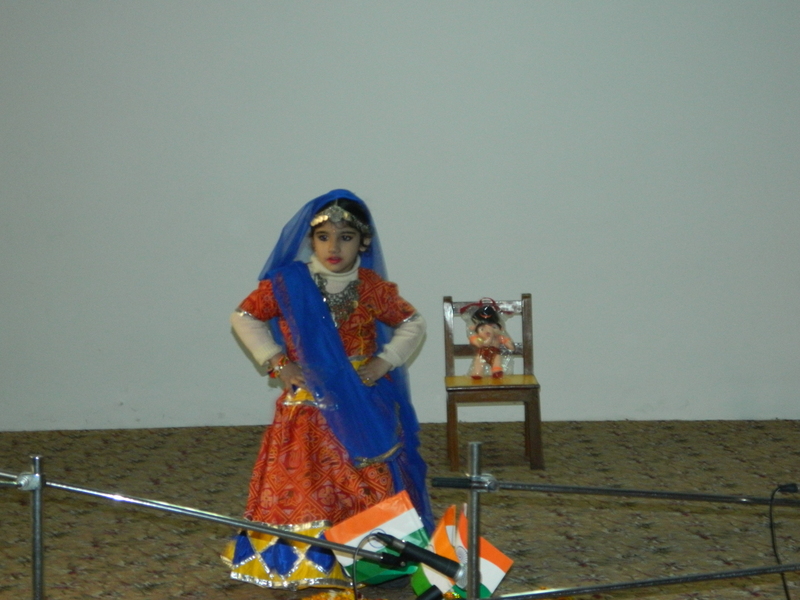 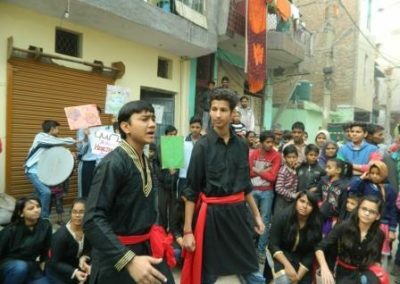 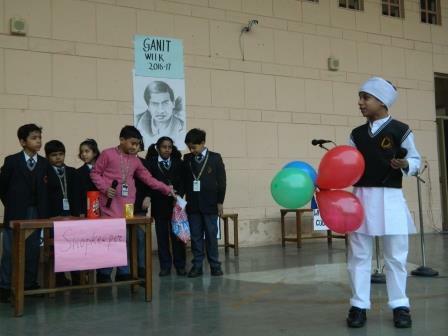 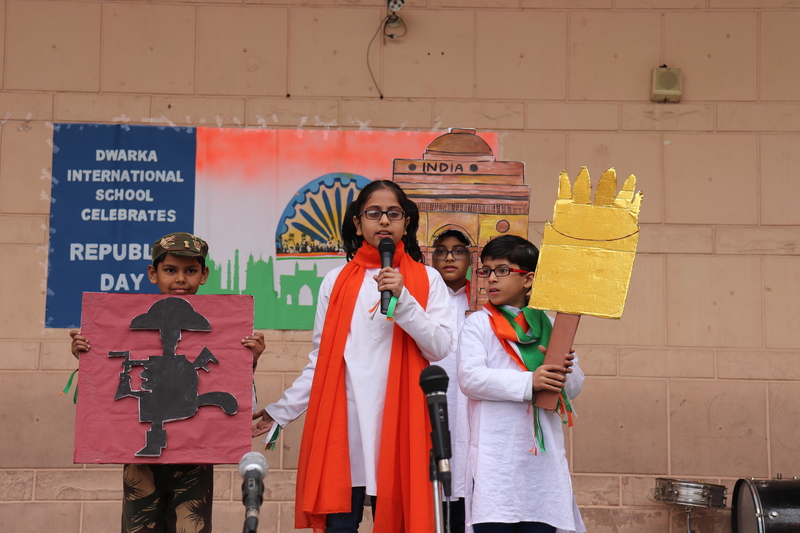 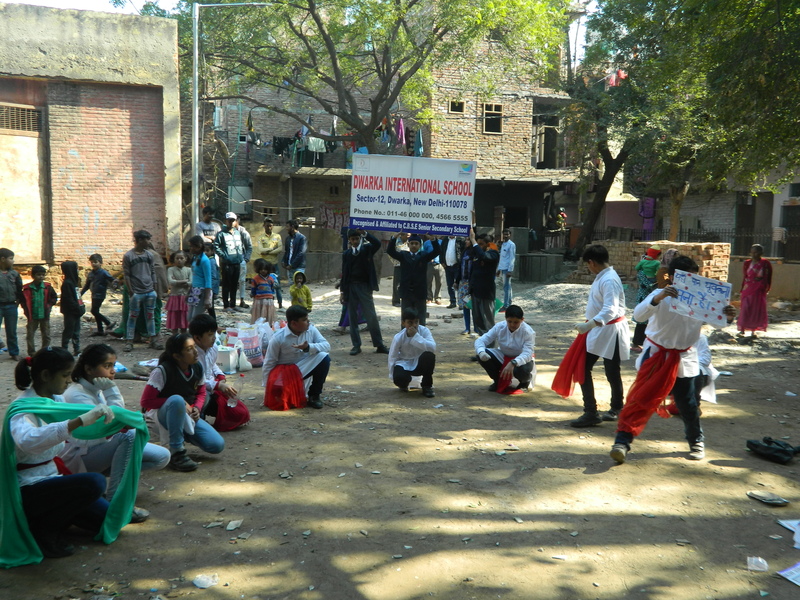 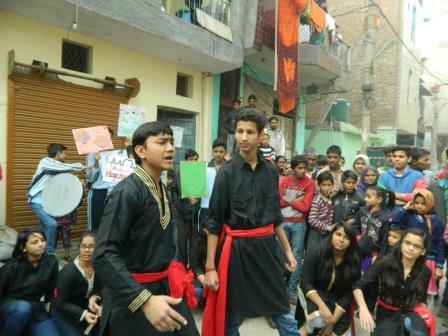 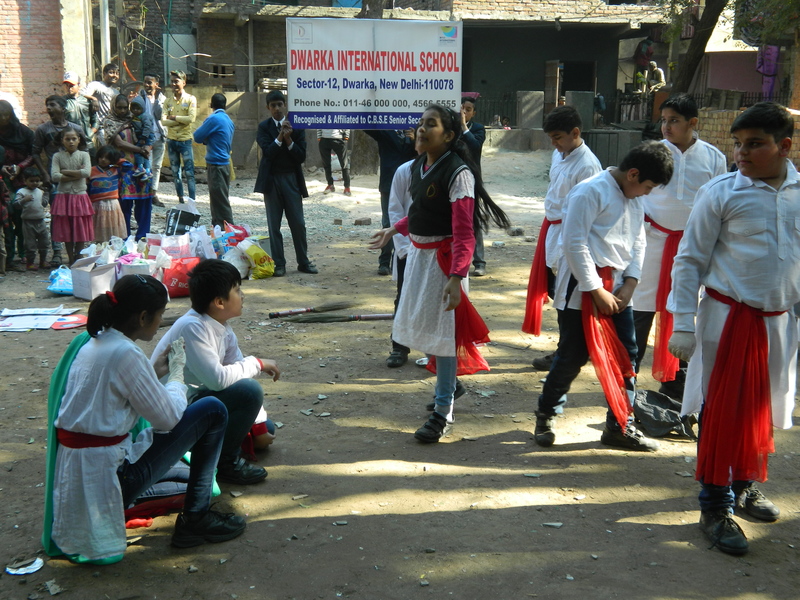 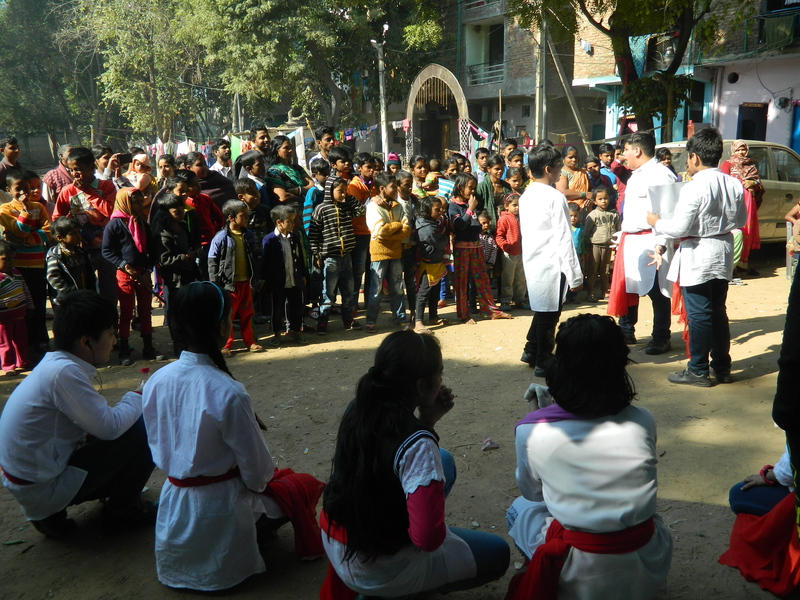 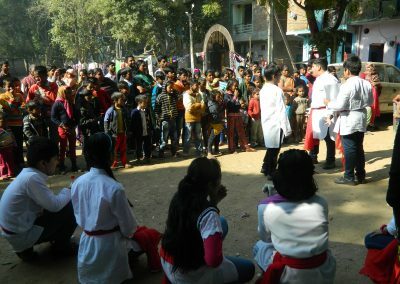 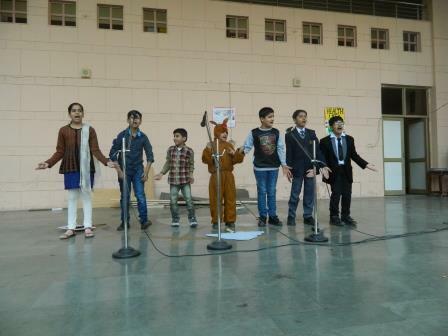 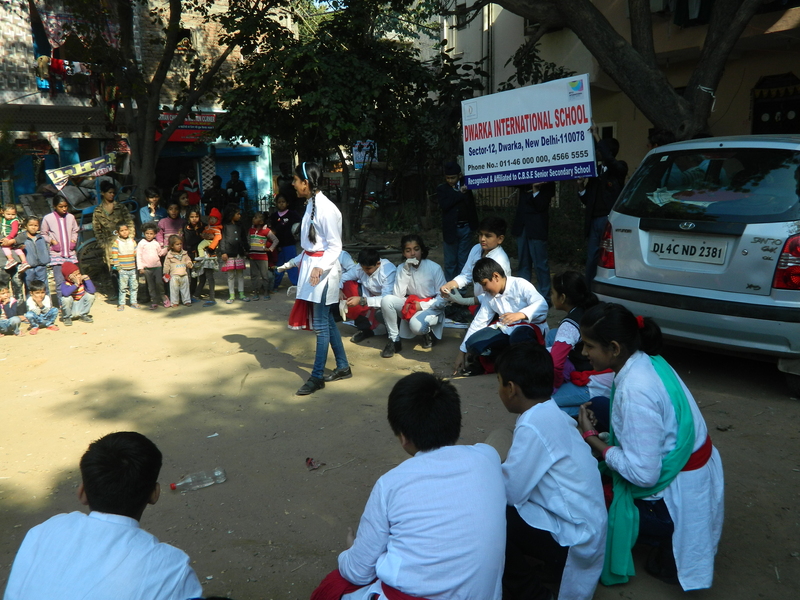 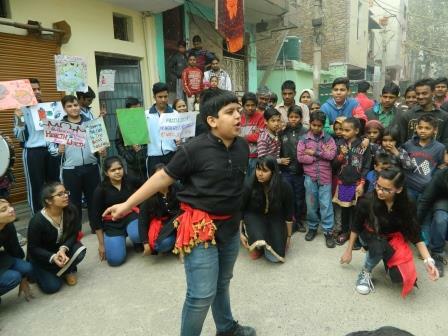 Children spread the message of togetherness, harmony, family bonding and less usage of gadgets through skit. 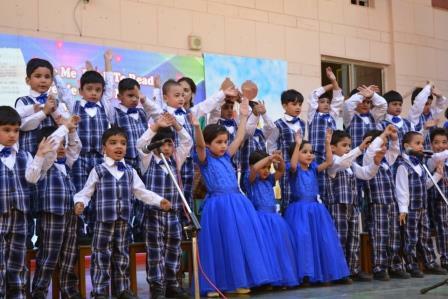 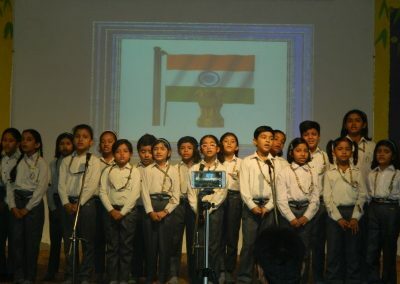 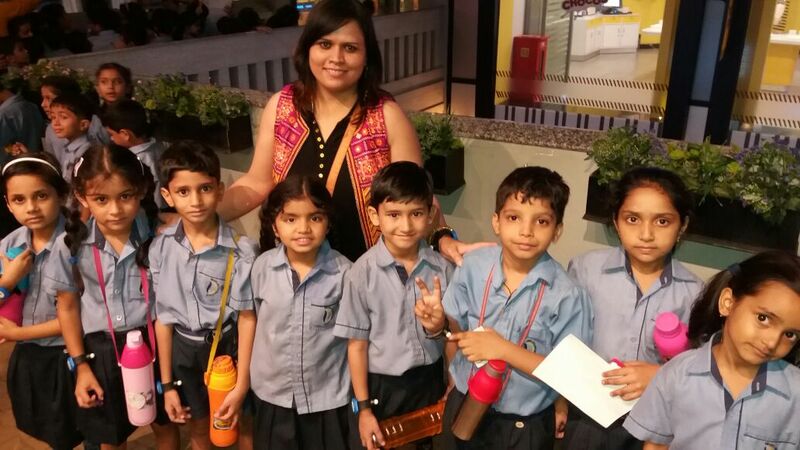 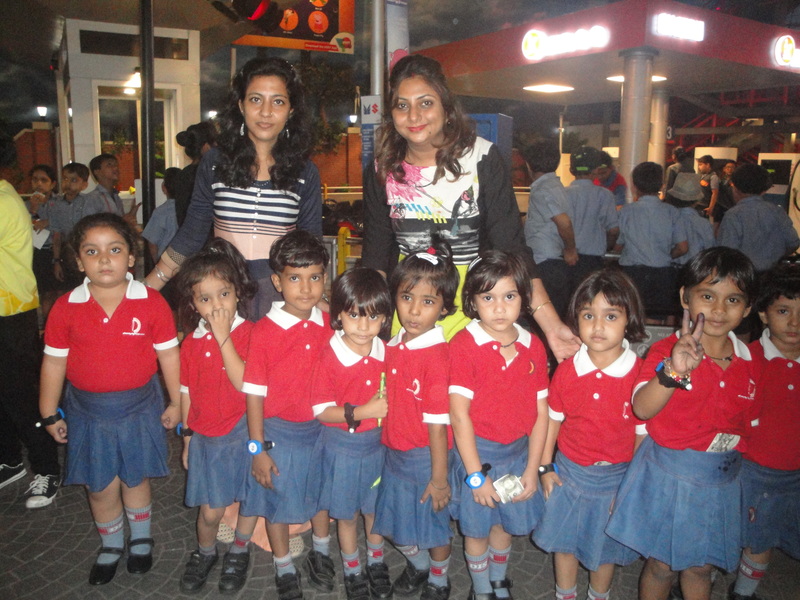 All the children of kindergarten took part in the programme. 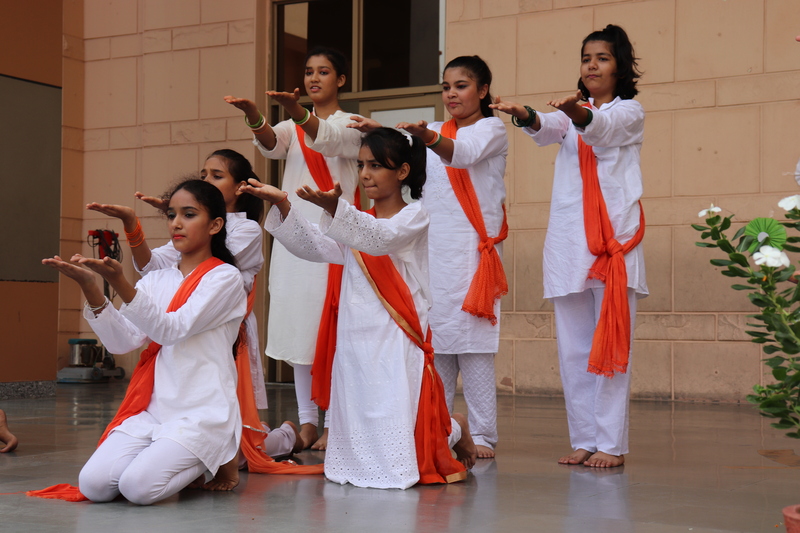 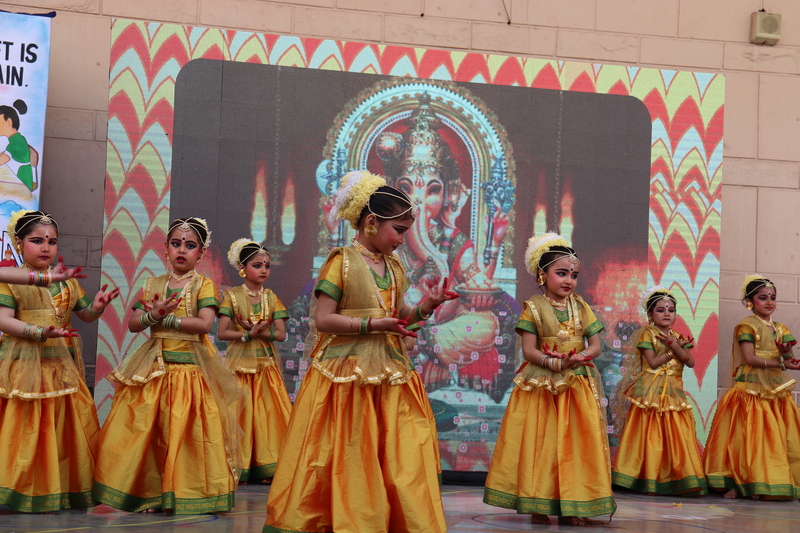 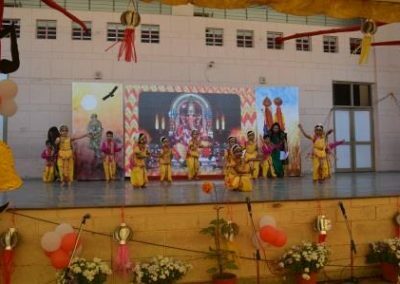 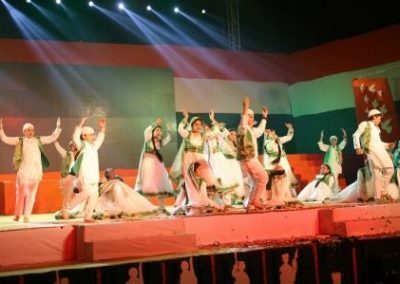 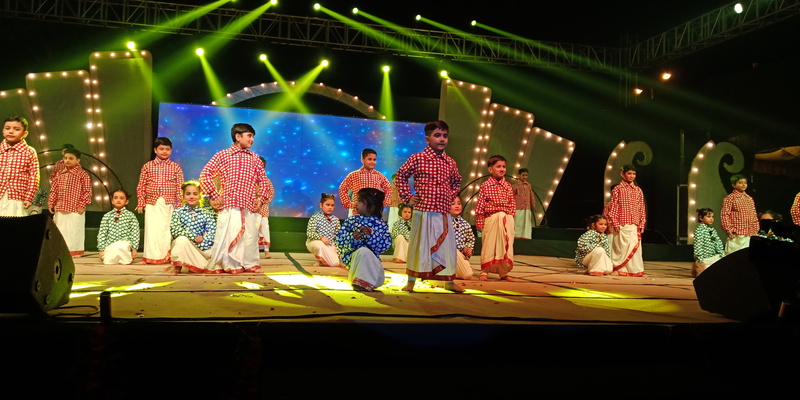 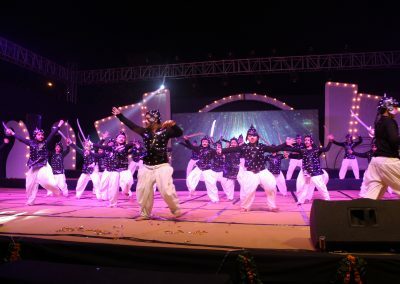 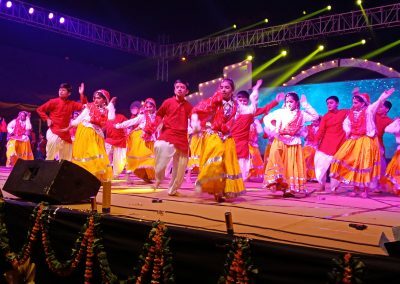 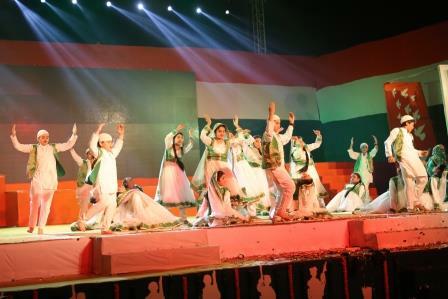 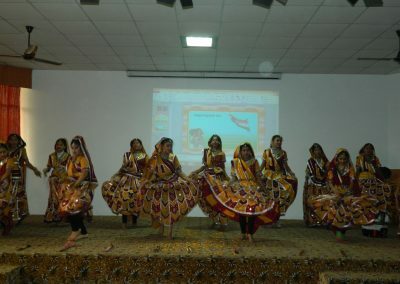 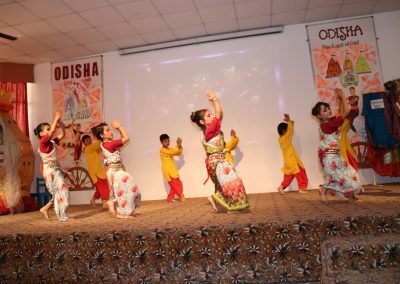 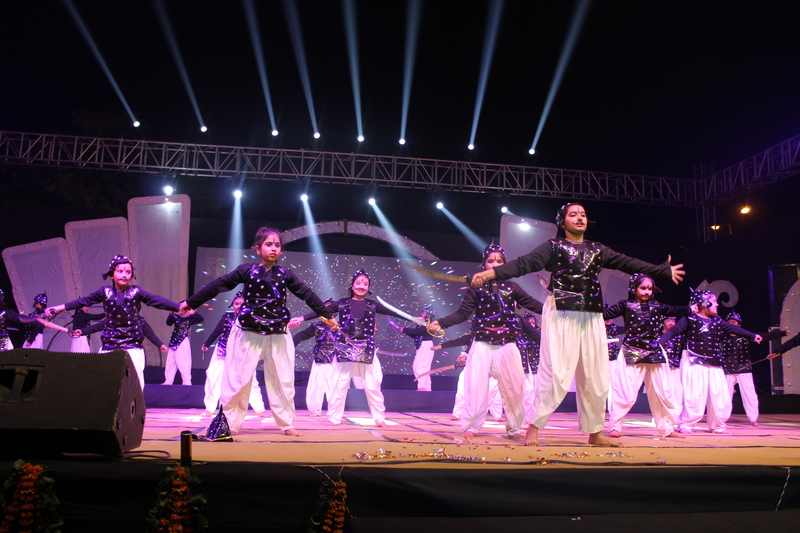 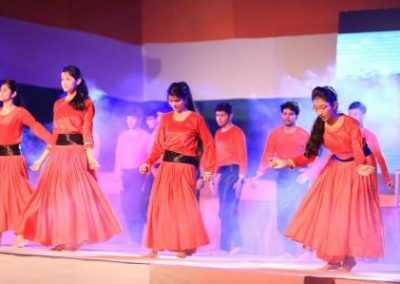 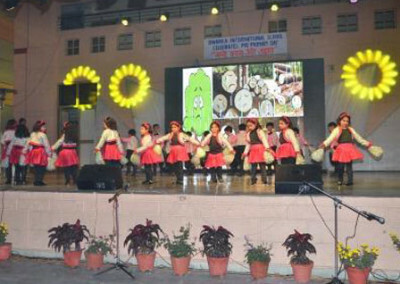 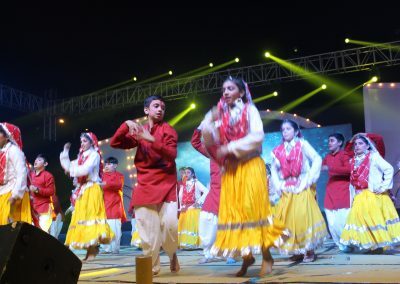 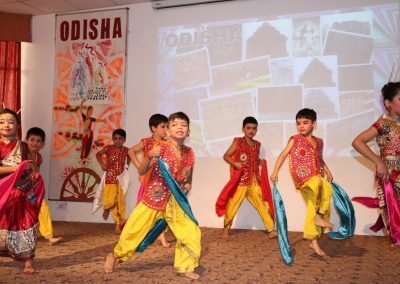 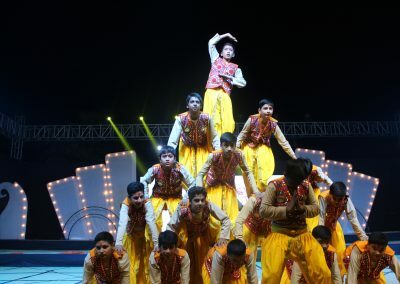 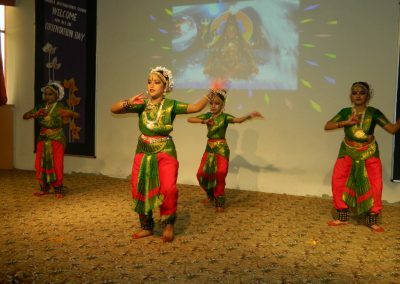 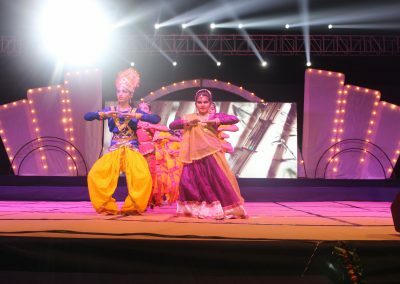 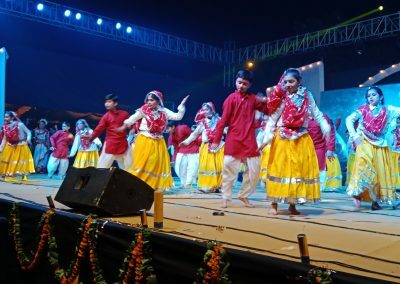 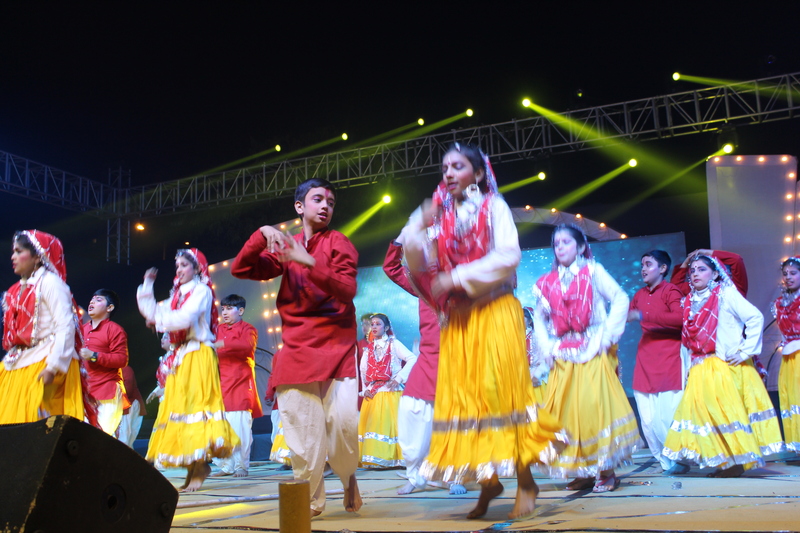 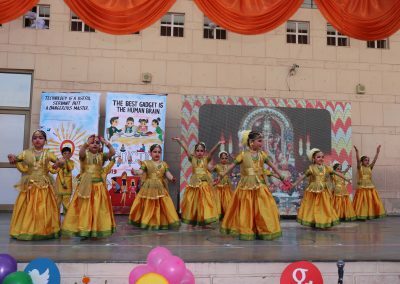 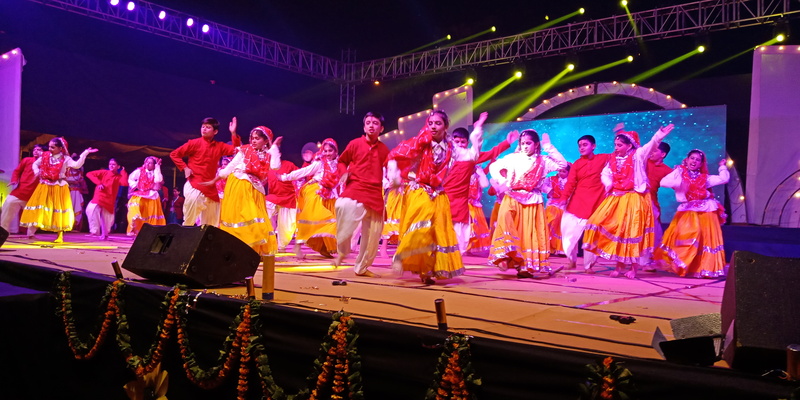 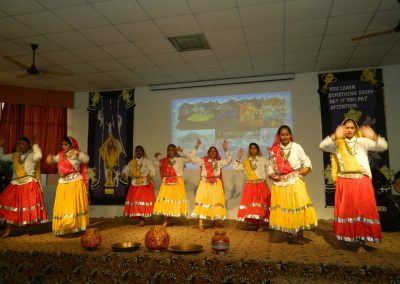 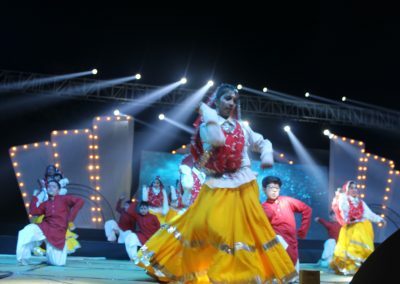 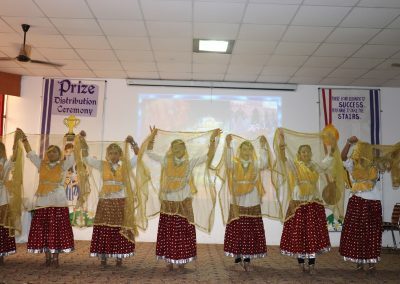 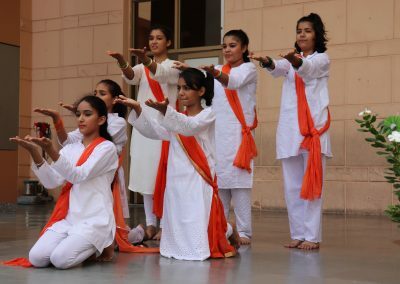 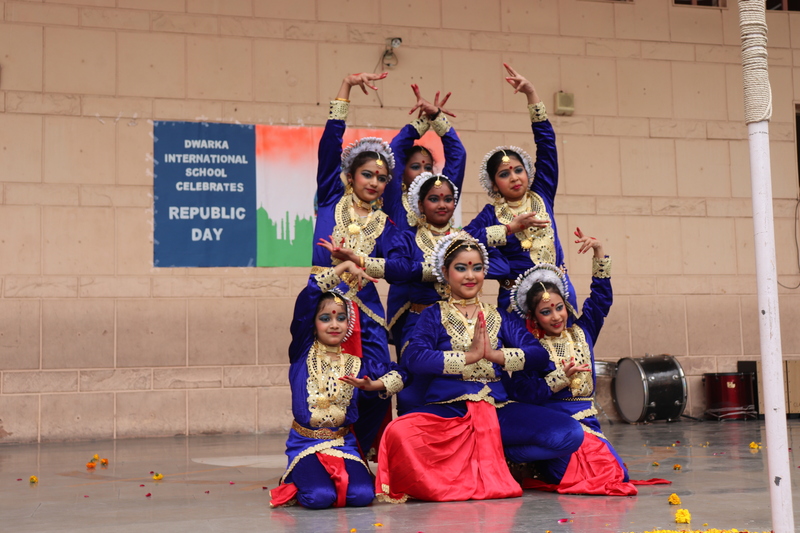 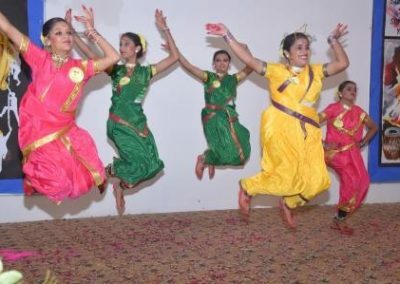 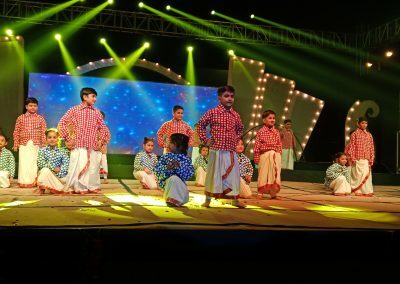 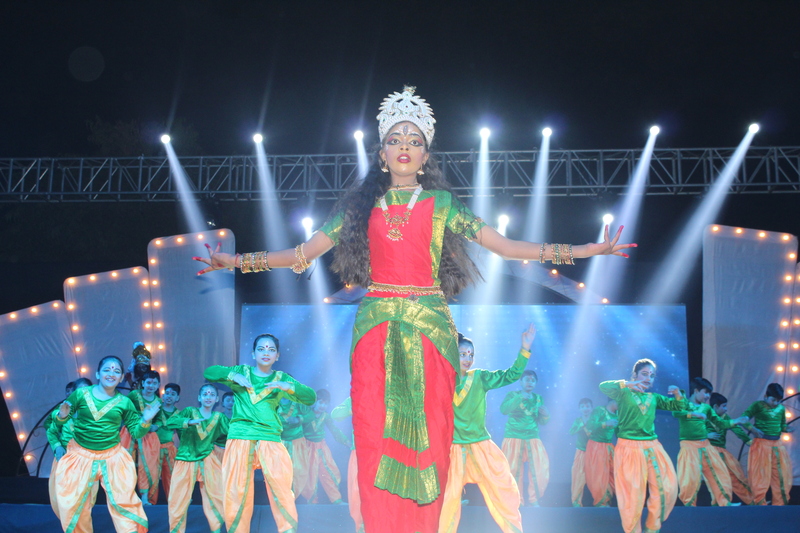 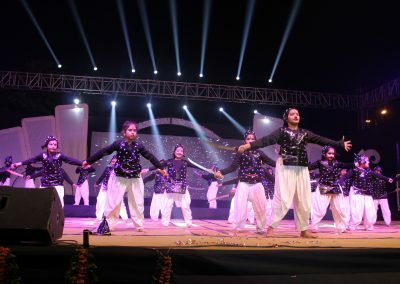 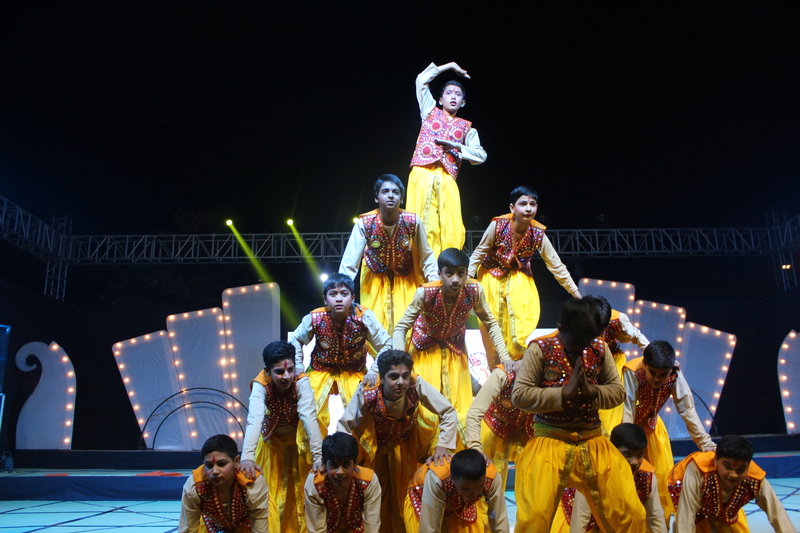 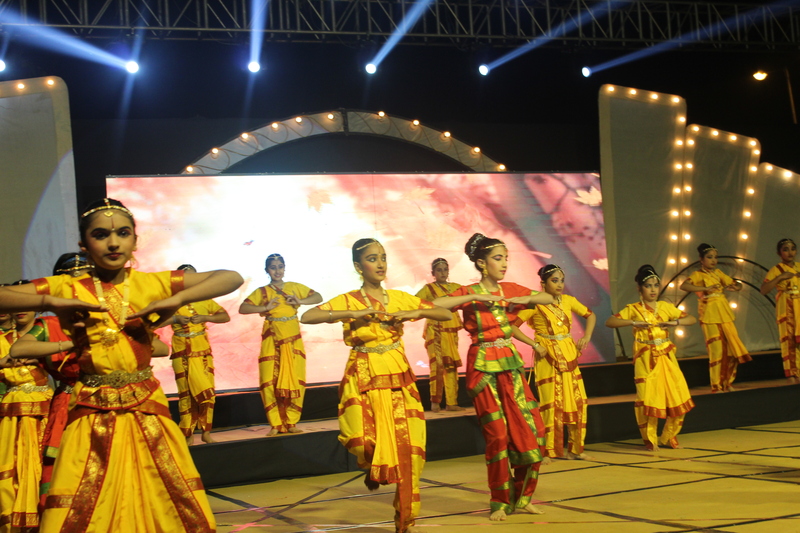 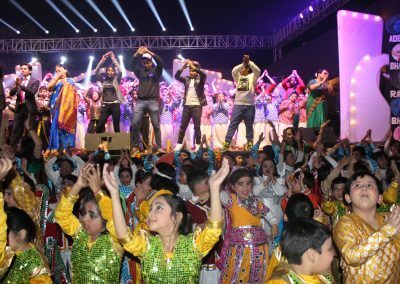 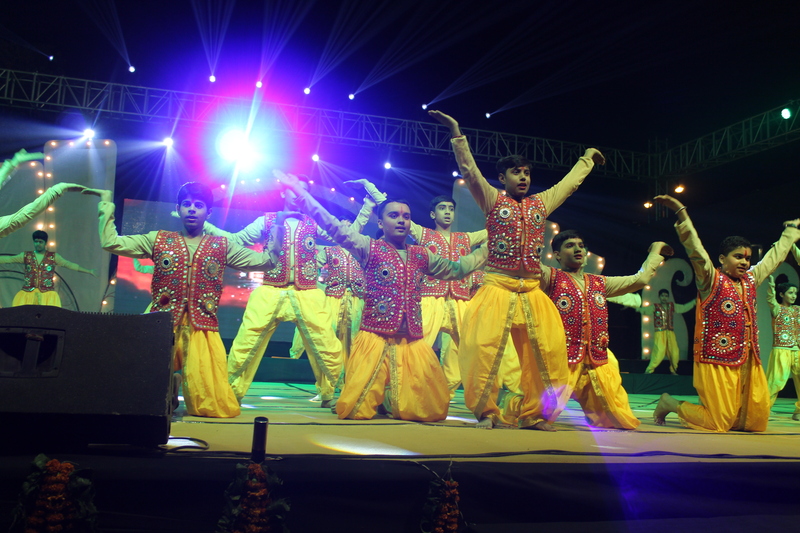 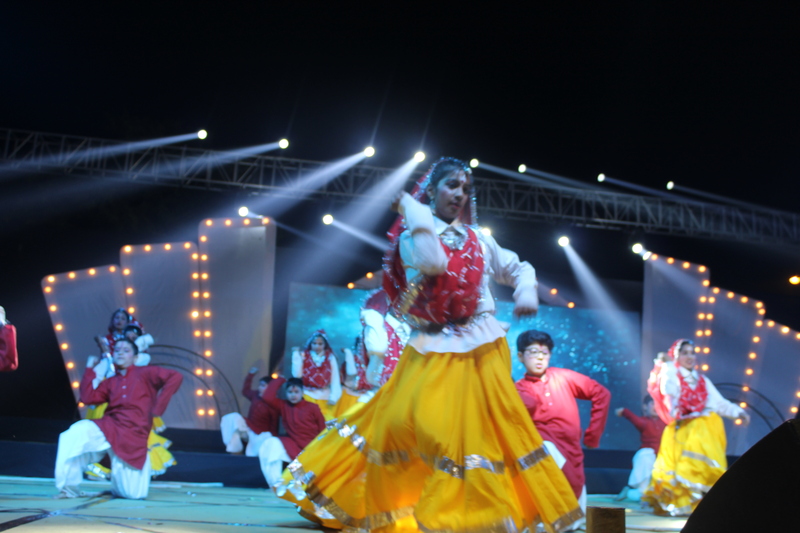 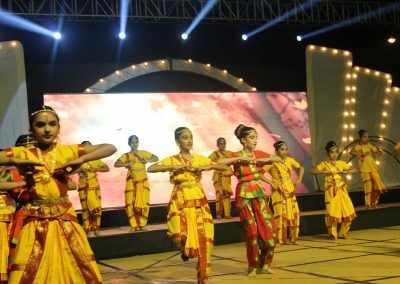 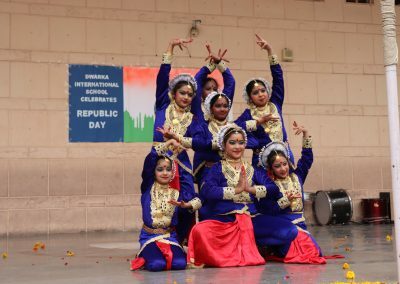 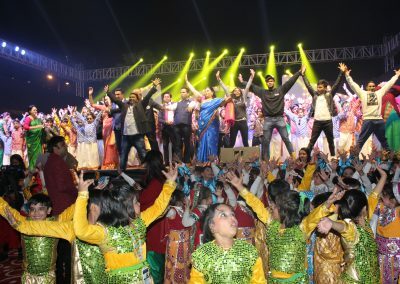 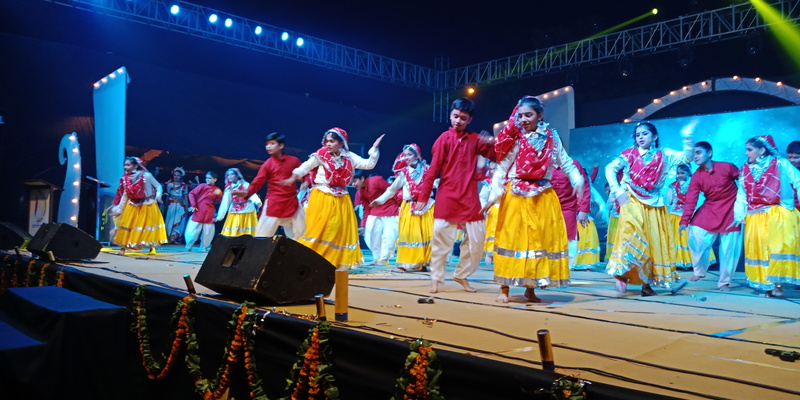 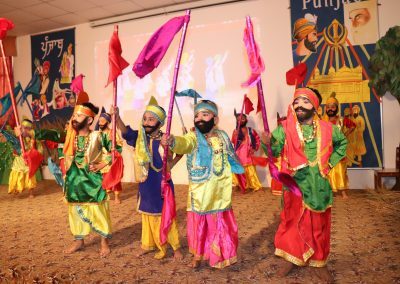 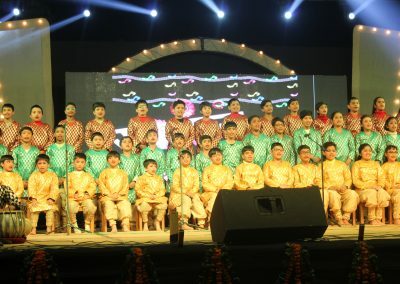 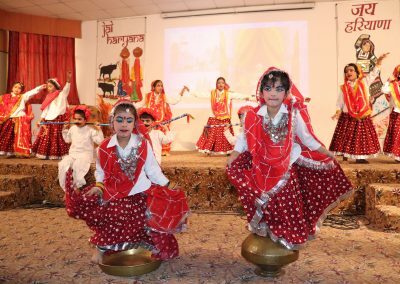 The dazzling display of dances by children with perfect steps to the tune and rhythm kept the audience glued to the stage. 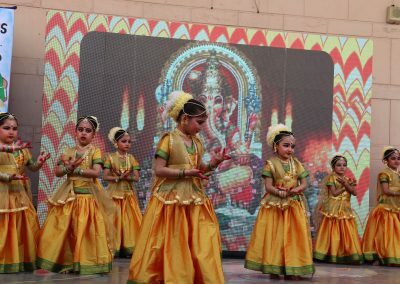 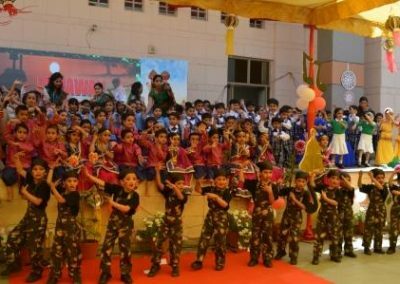 The function commenced with the welcome song by the tiny tots and thereafter children paid tribute to Lord Ganesha with ‘Ganesh Vandana’. 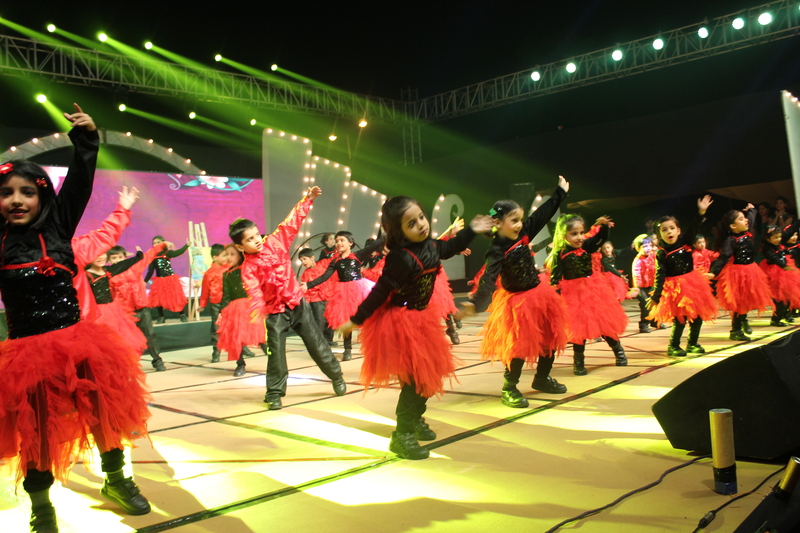 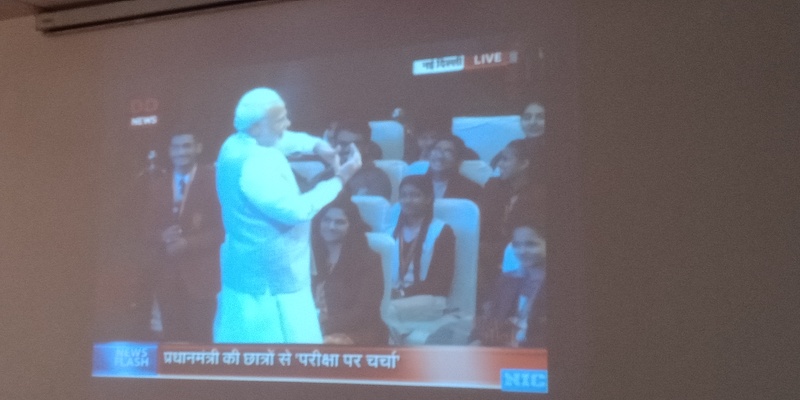 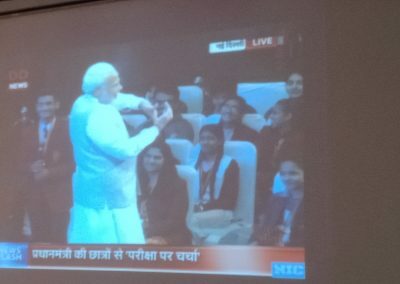 The highlight of the programme was the little ones conducting the entire programme themselves with élan. 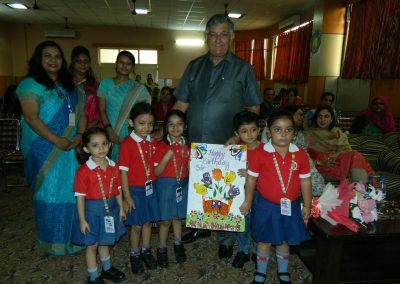 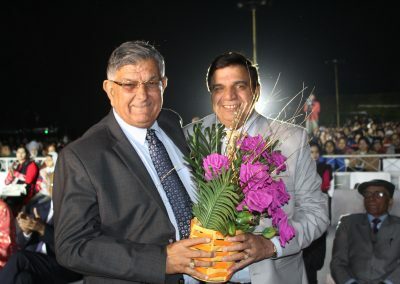 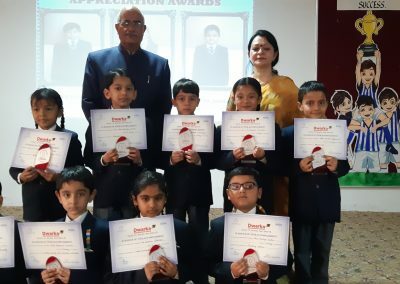 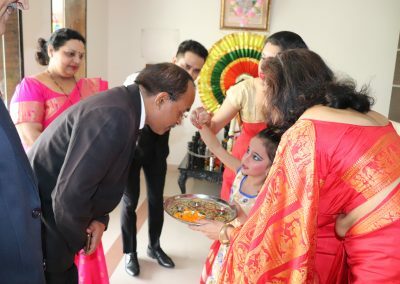 On conclusion of the performances, the Chief Guest for the event, Mr S.K.Singh felicitated the tiny tots and staff for putting up an excellent show. 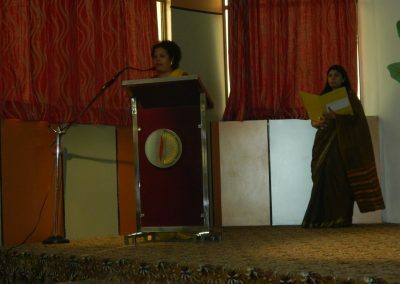 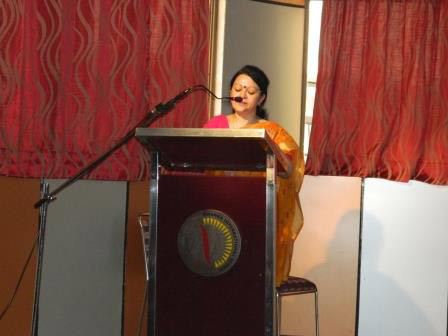 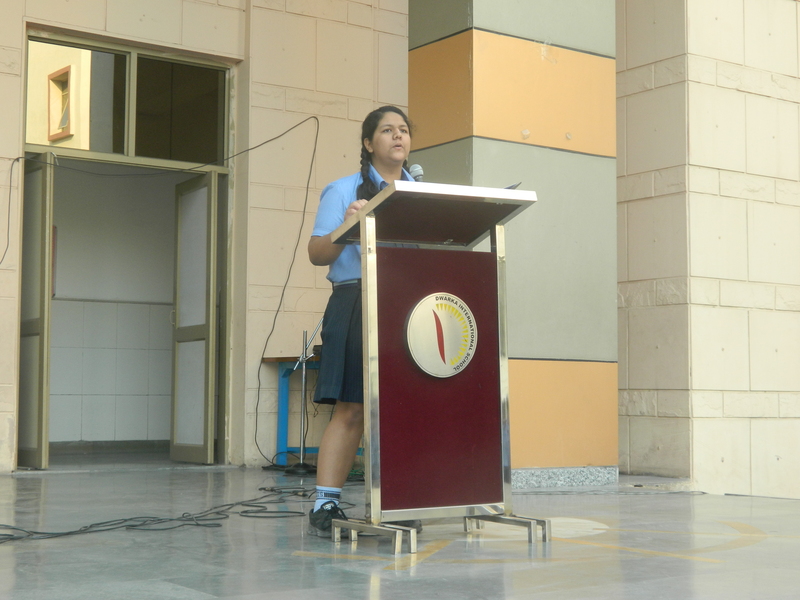 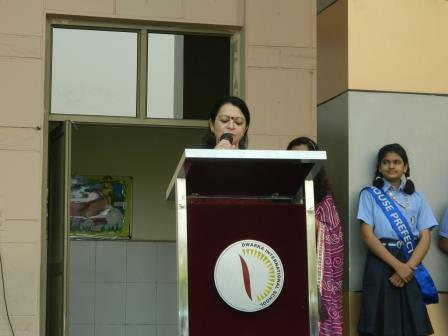 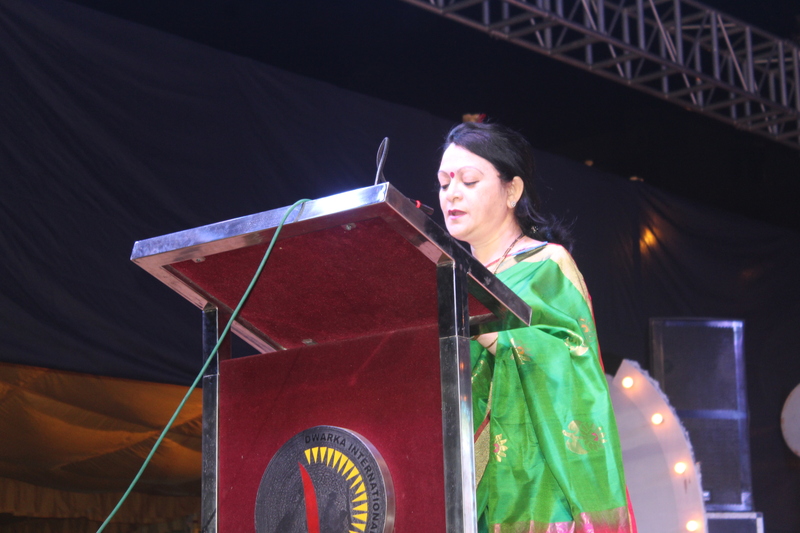 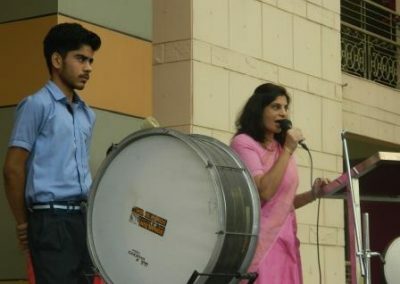 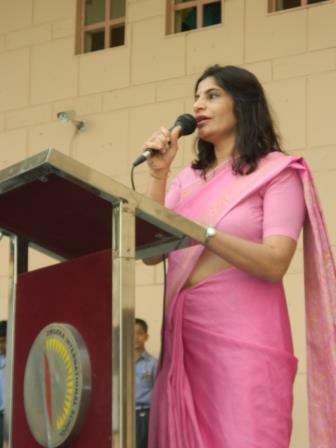 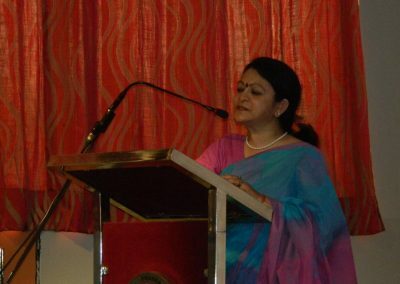 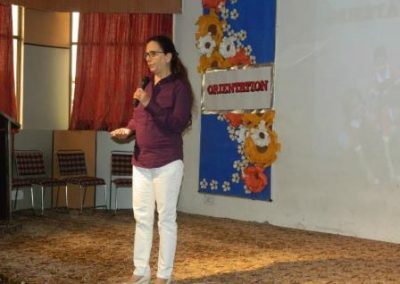 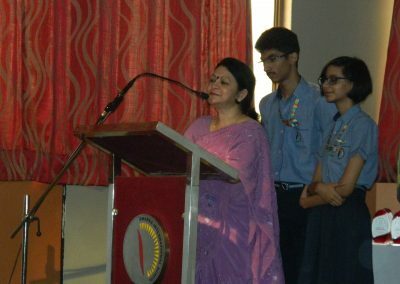 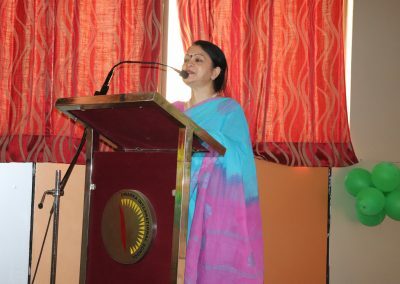 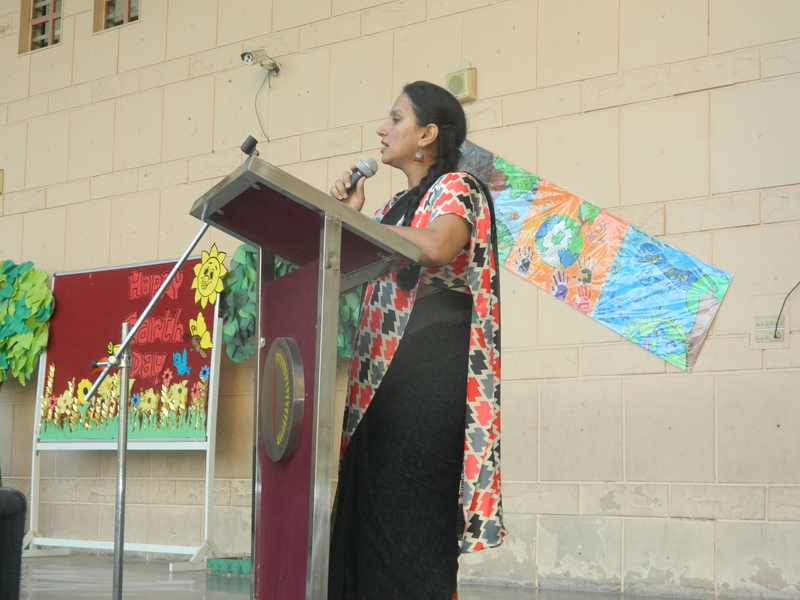 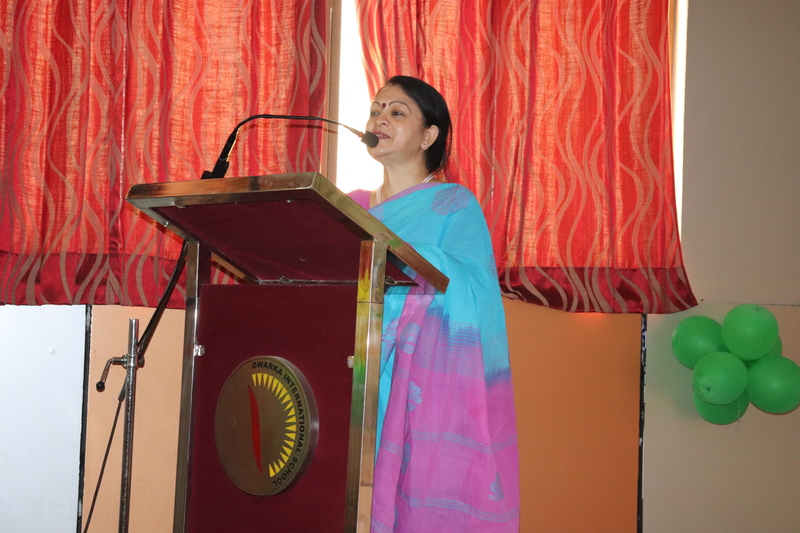 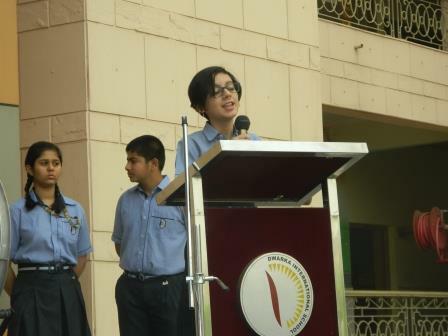 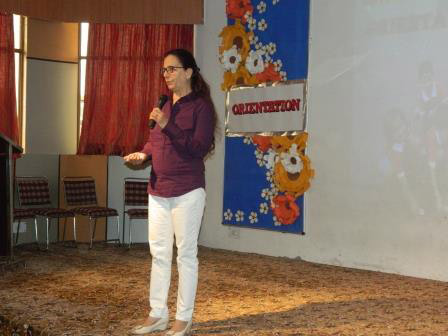 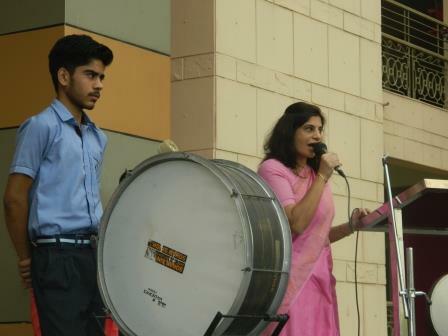 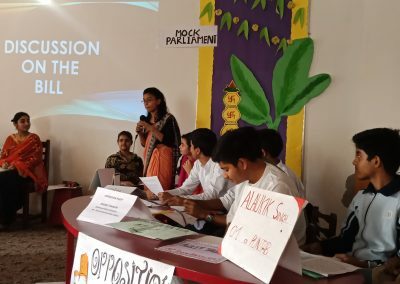 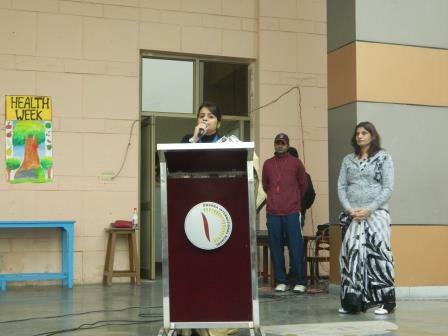 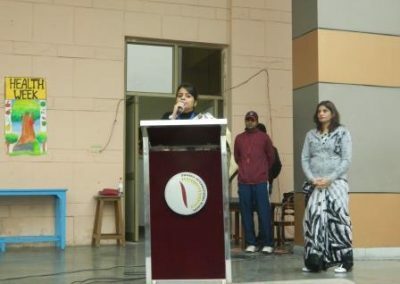 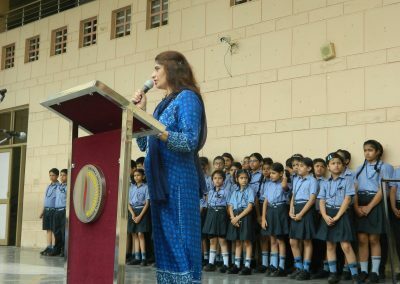 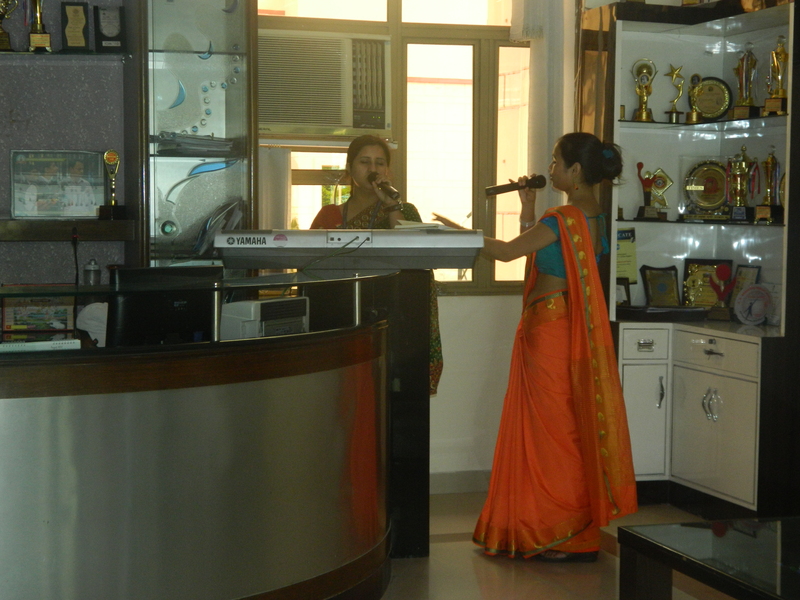 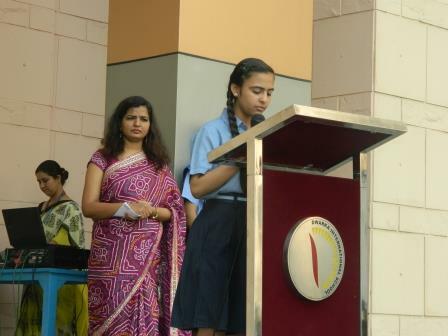 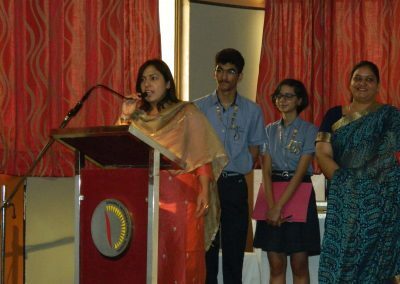 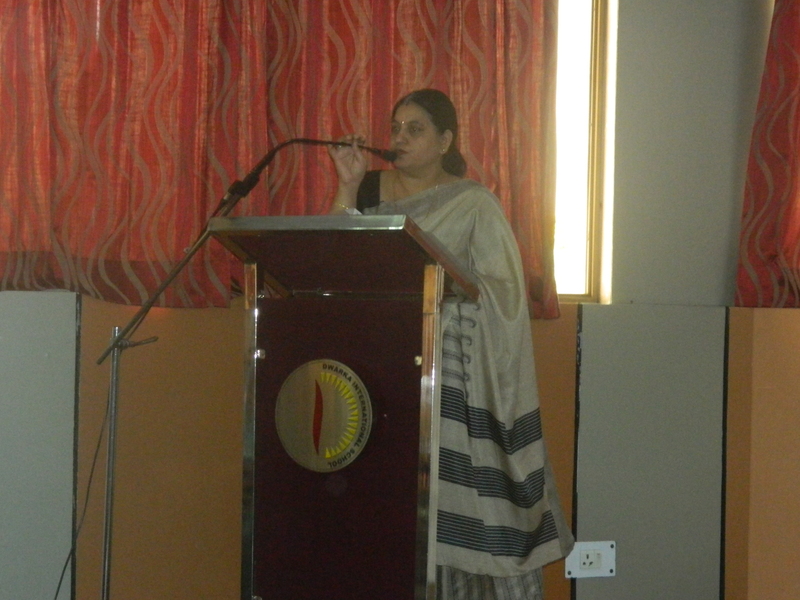 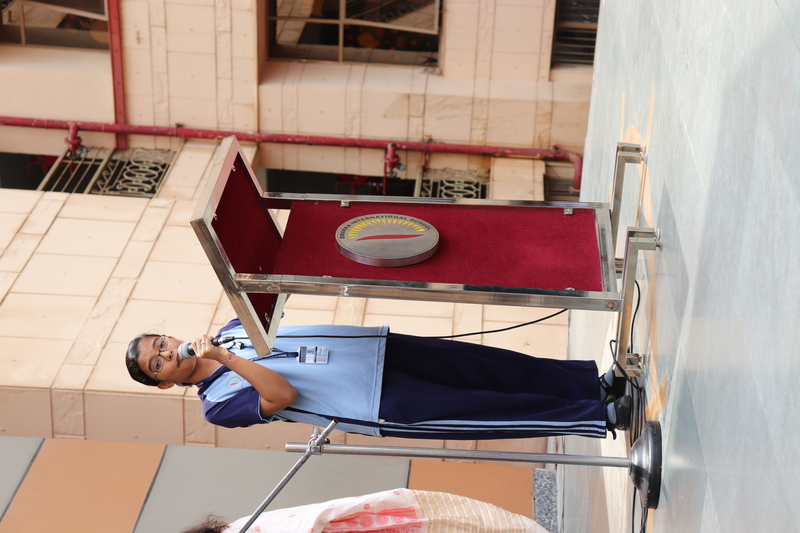 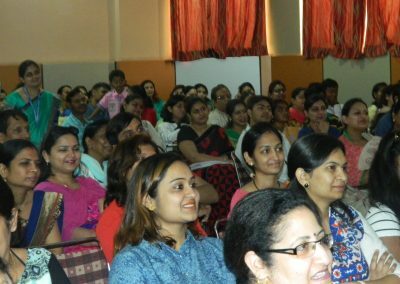 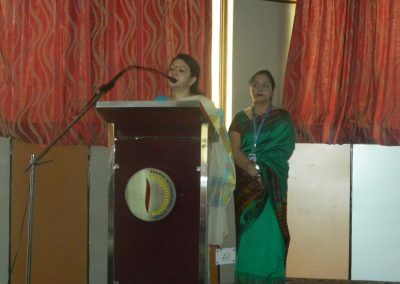 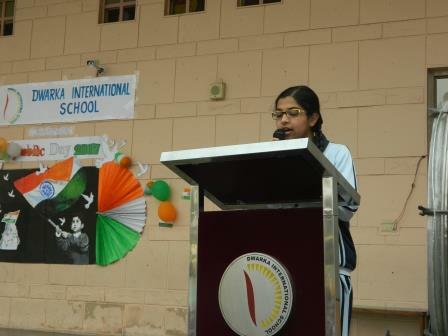 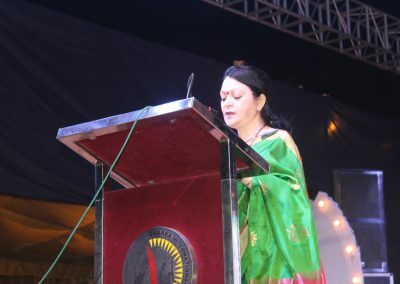 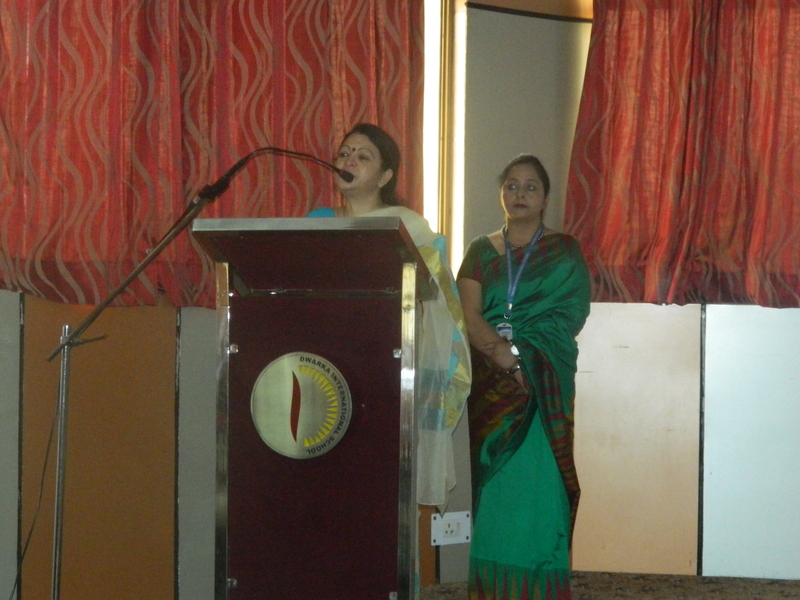 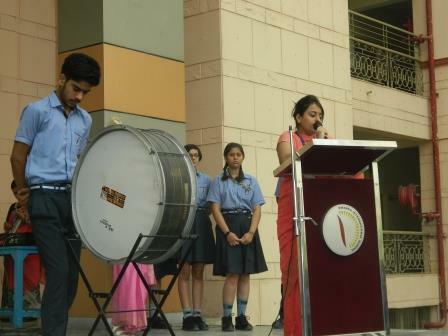 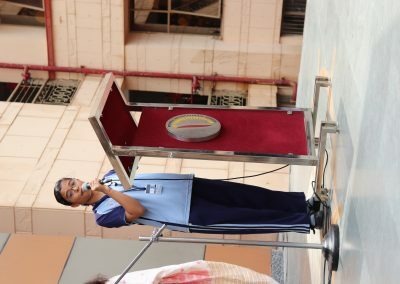 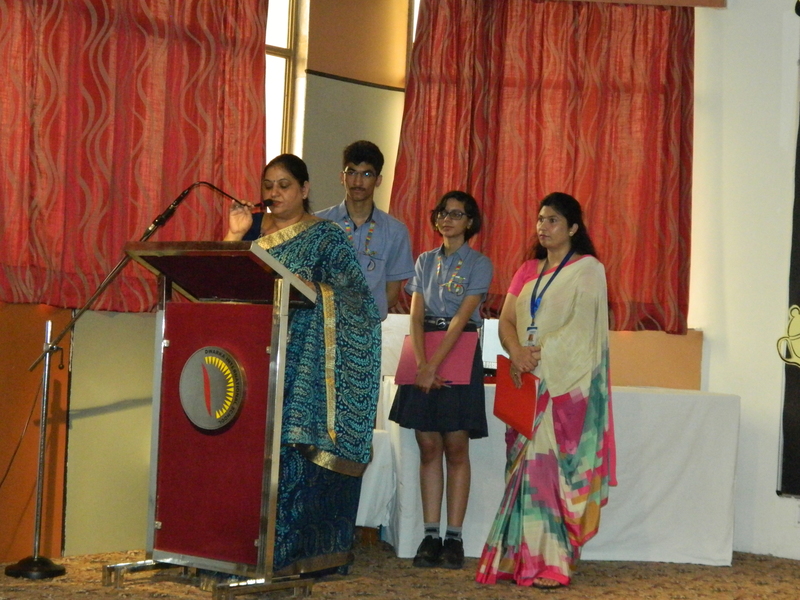 The Principal Mrs Poonam jha Ma’am address the gathering with the school report. 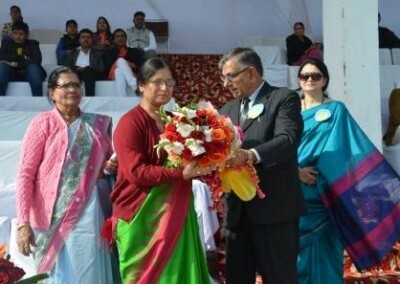 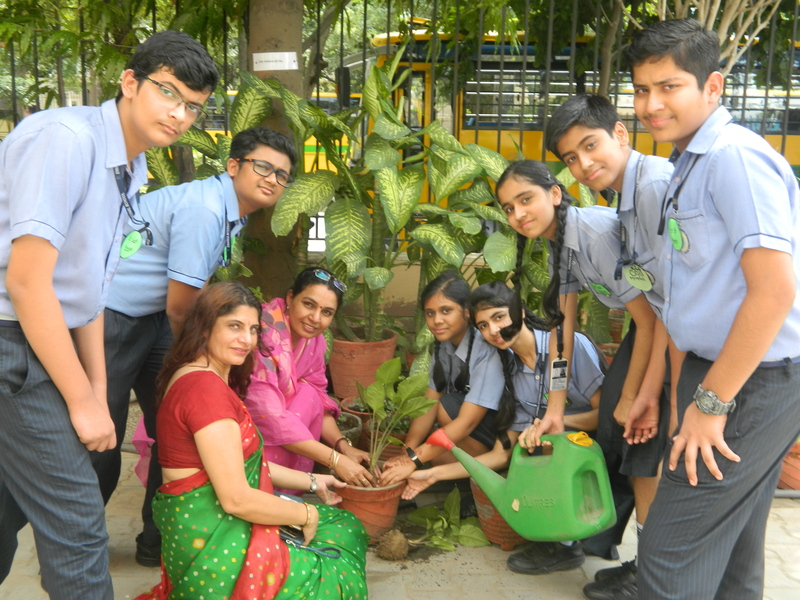 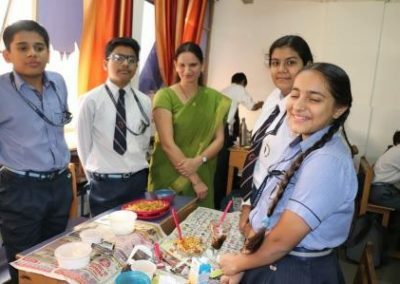 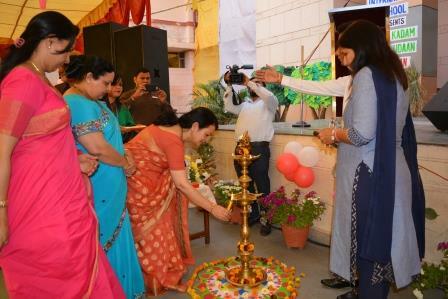 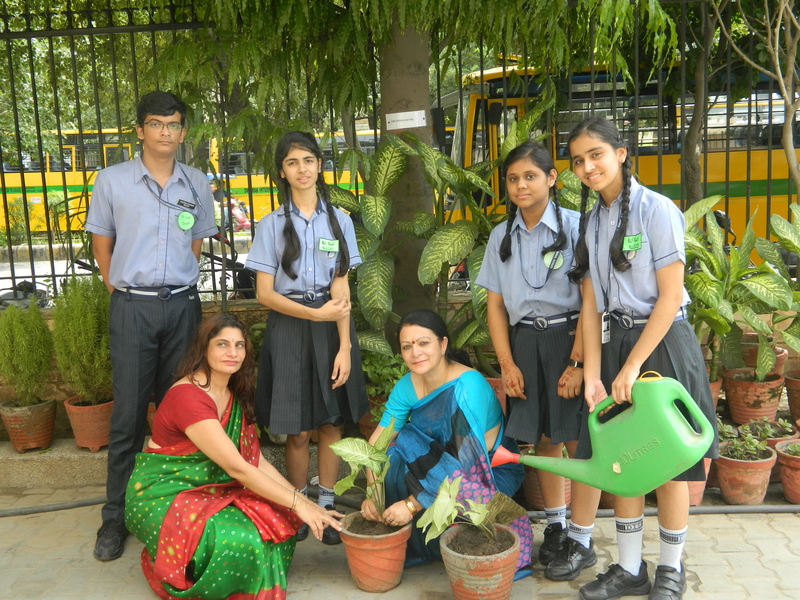 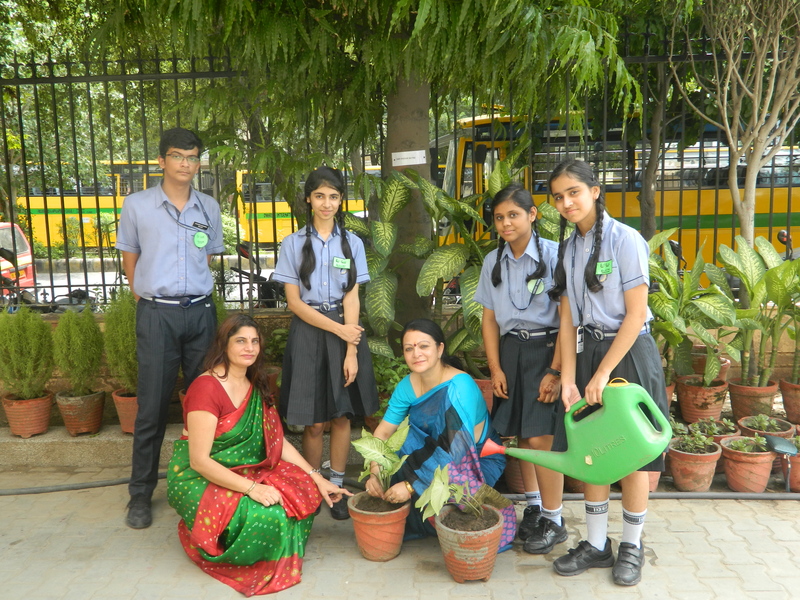 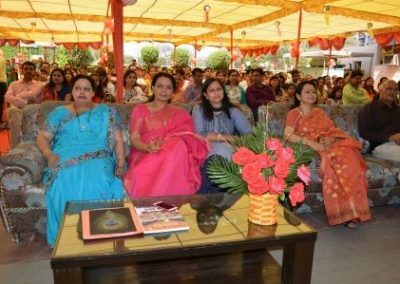 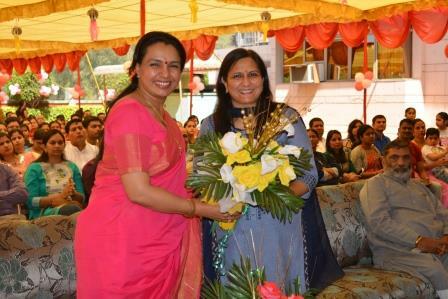 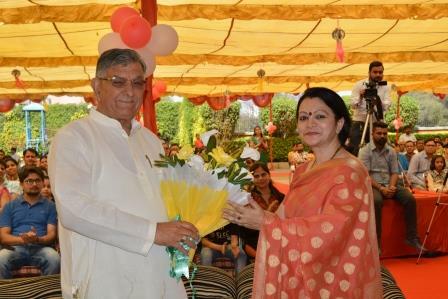 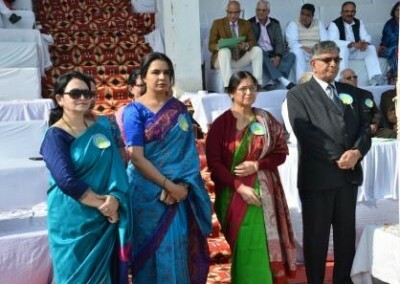 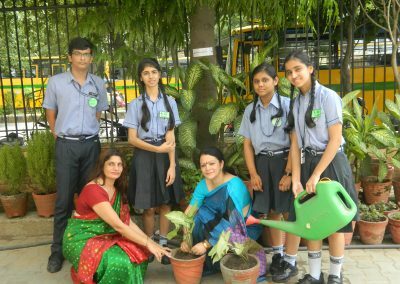 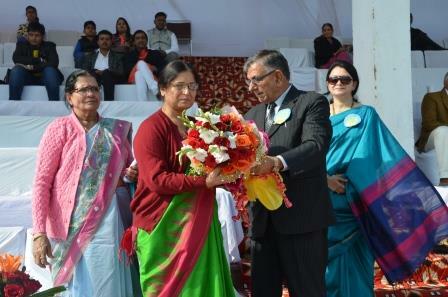 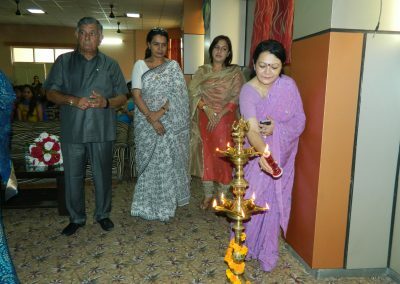 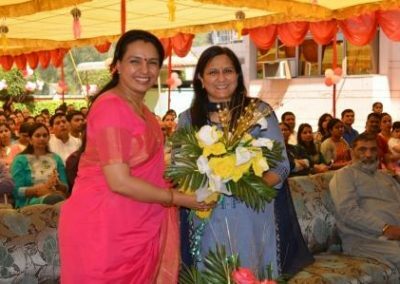 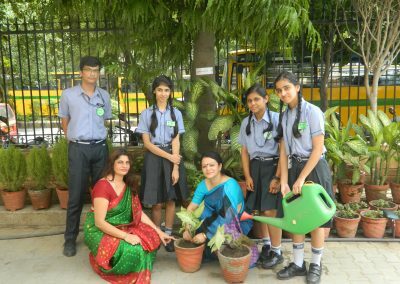 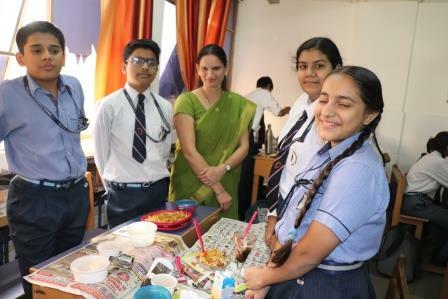 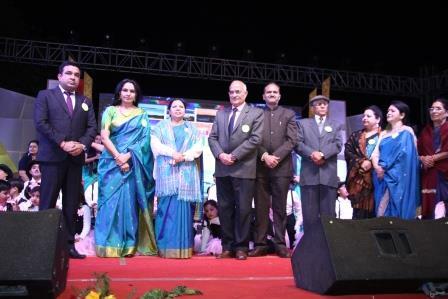 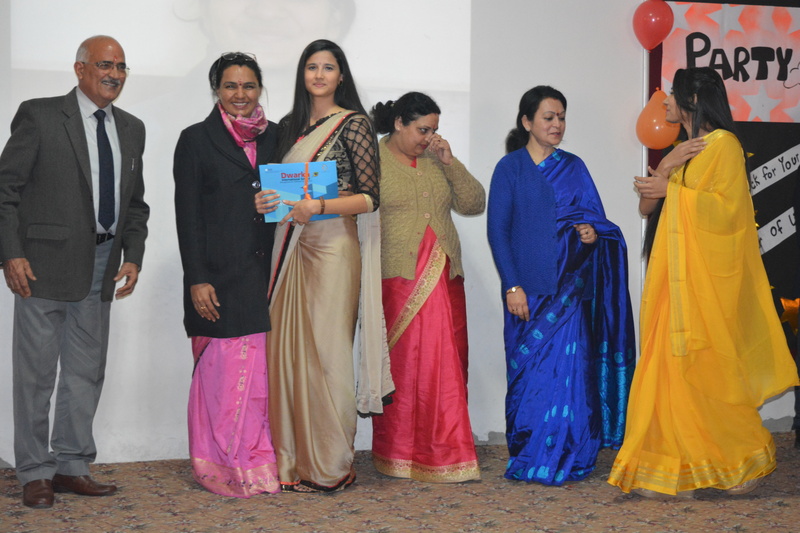 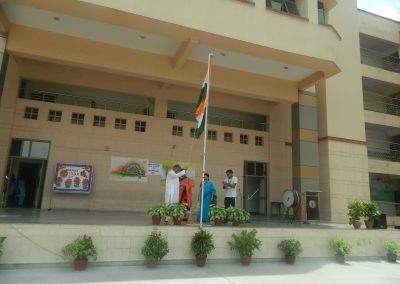 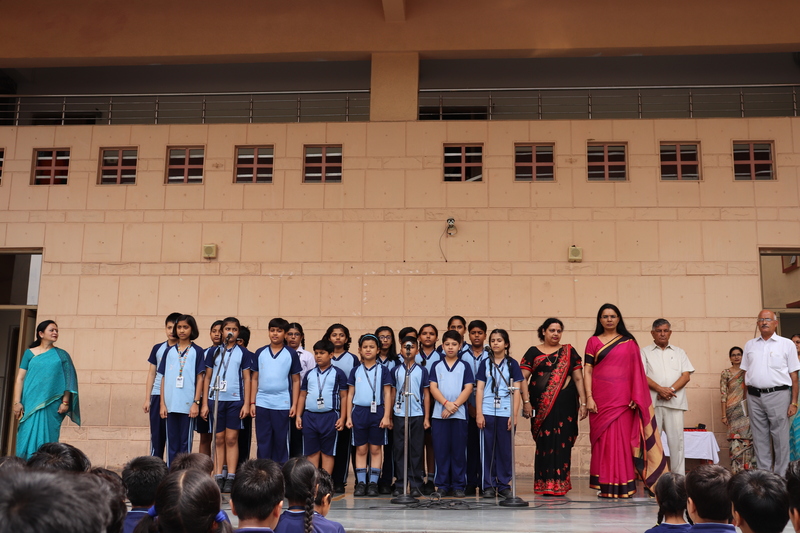 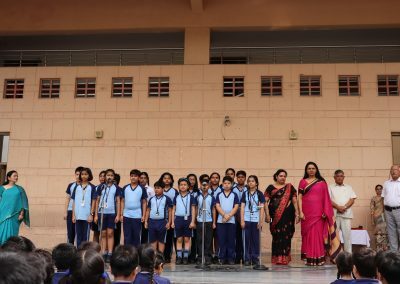 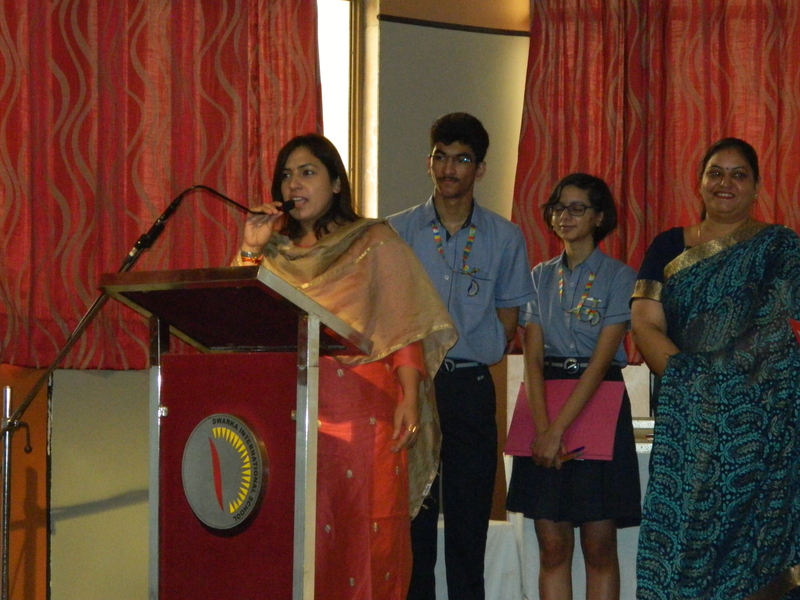 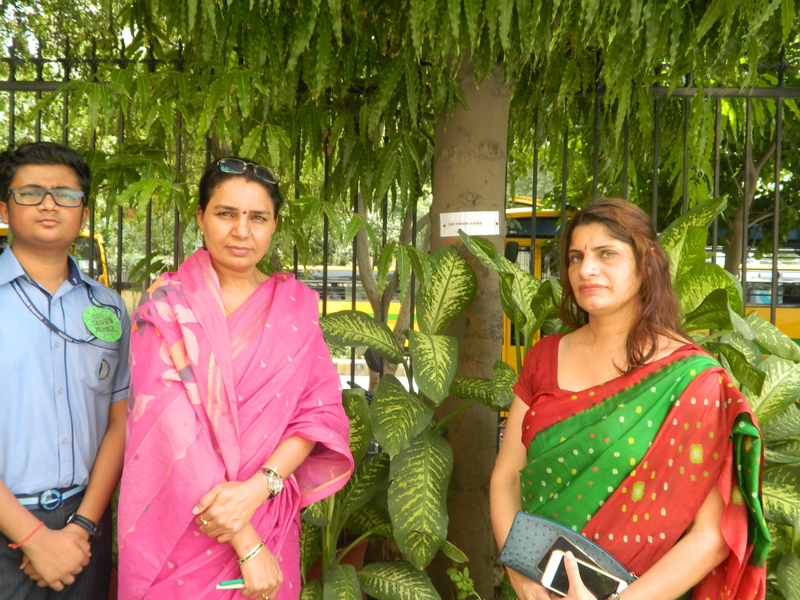 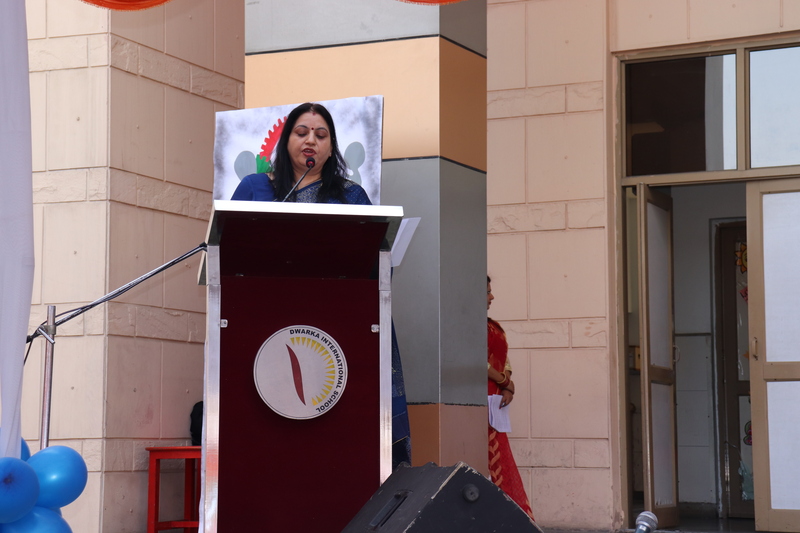 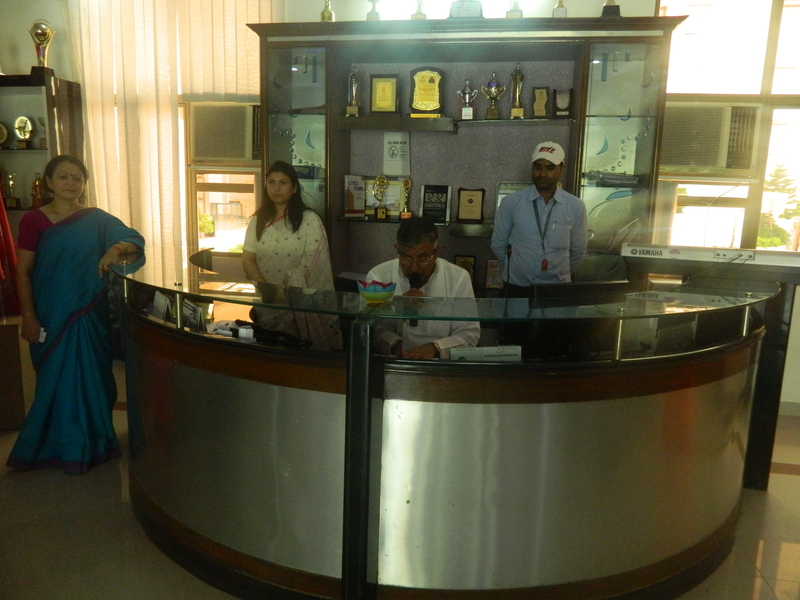 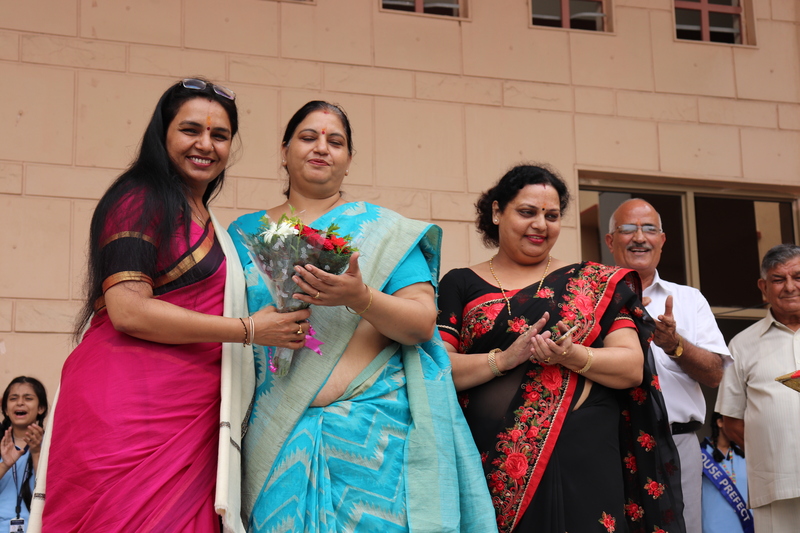 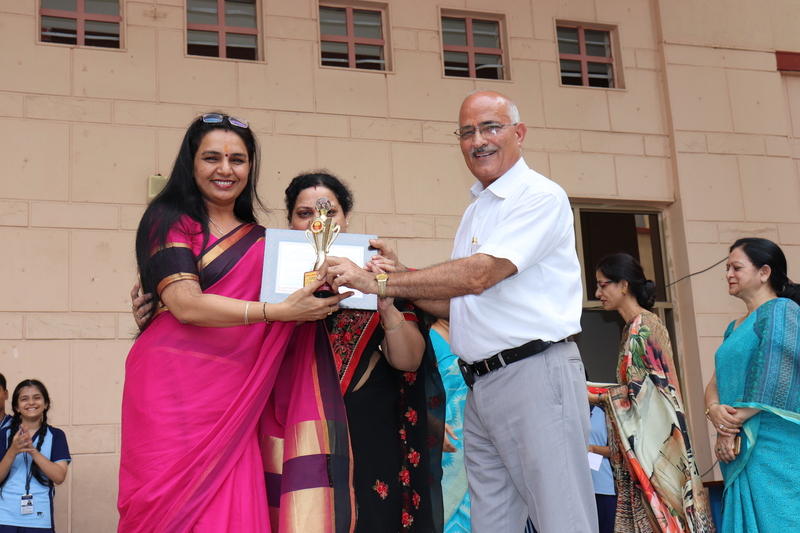 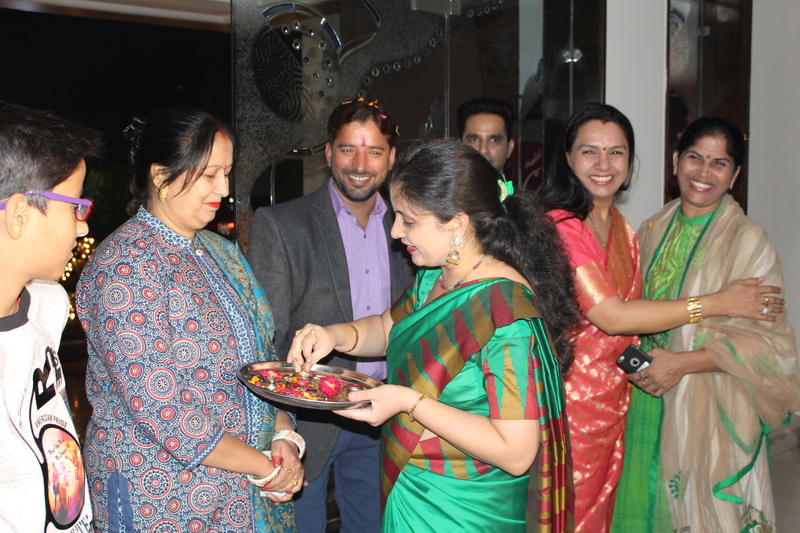 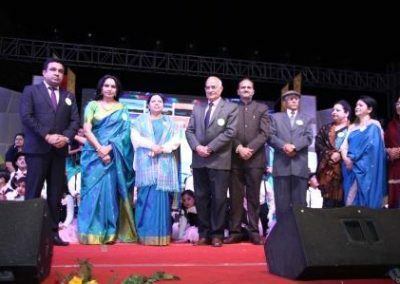 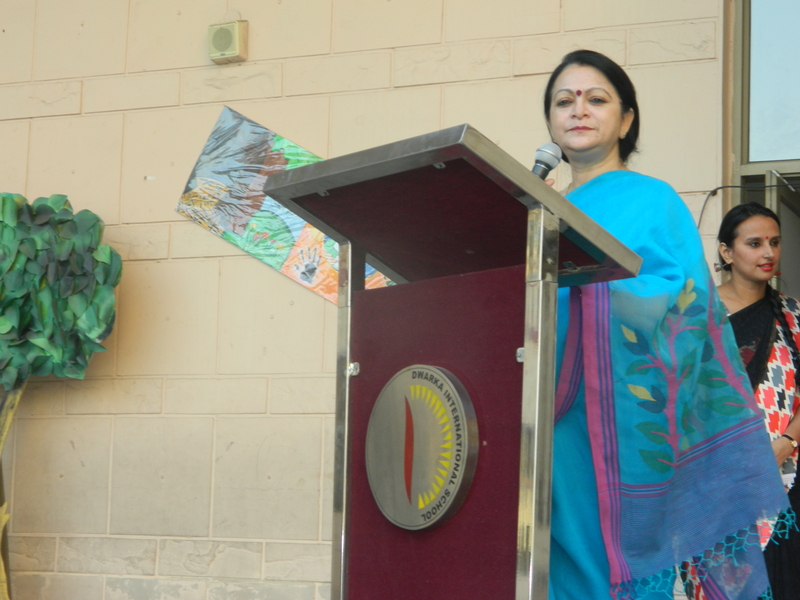 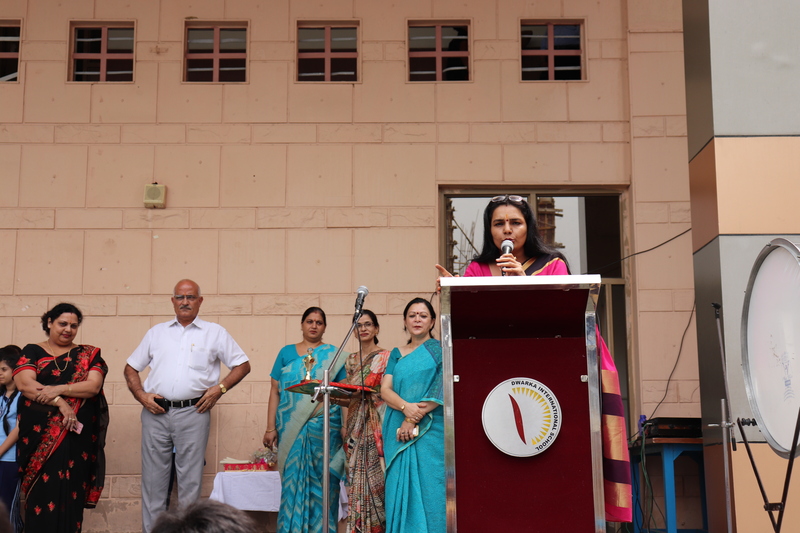 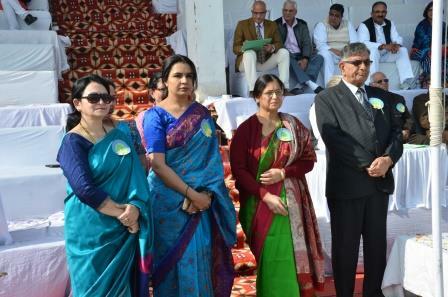 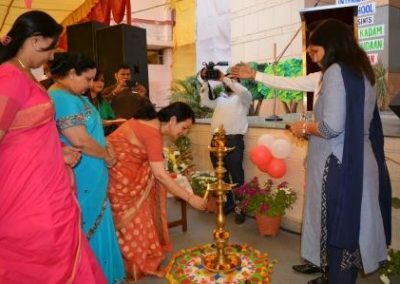 The Headmistress Mrs Archana Rathi Ma’am welcomed the guest and dignitaries along with the school management. 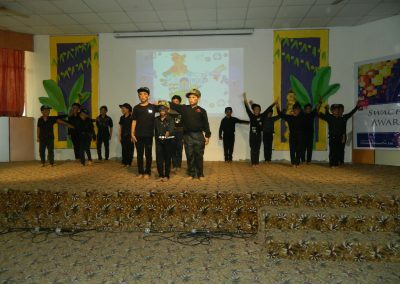 The show was heartwarming indeed. 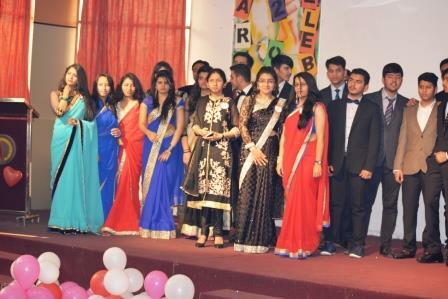 It stole the hearts of all present. 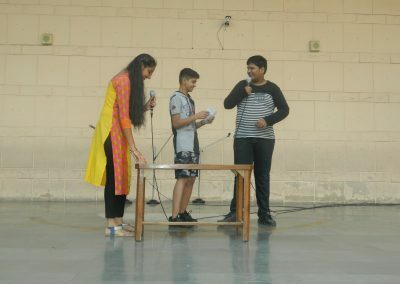 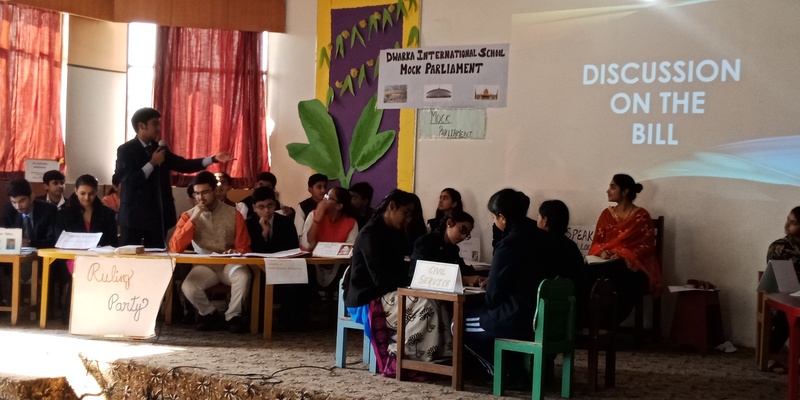 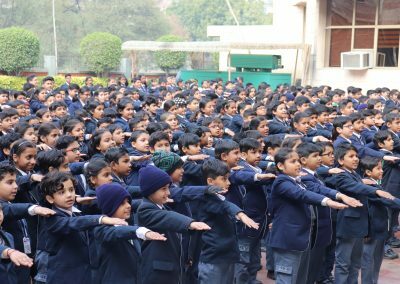 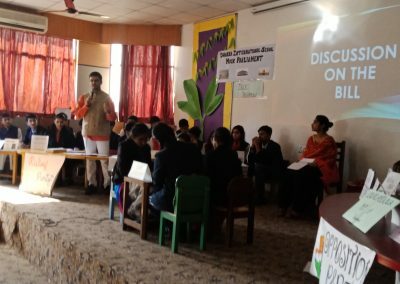 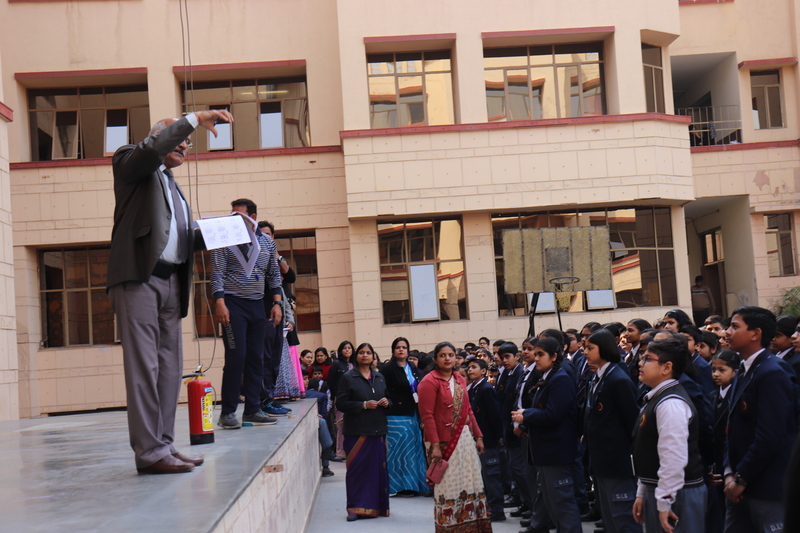 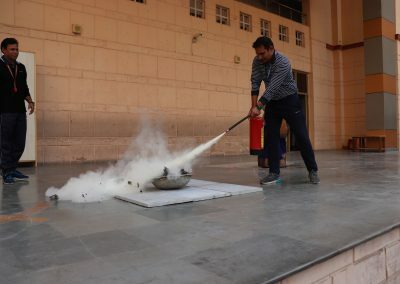 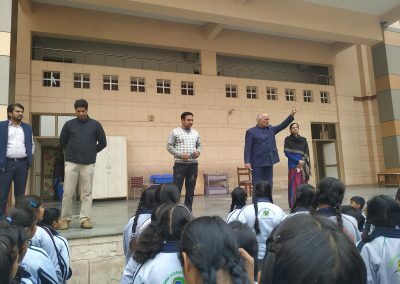 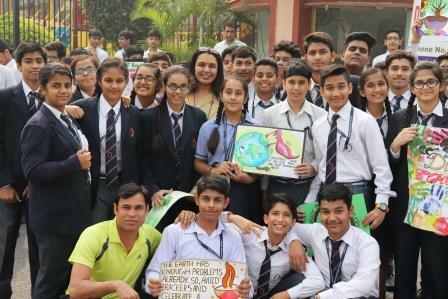 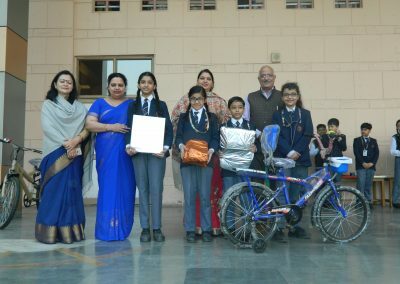 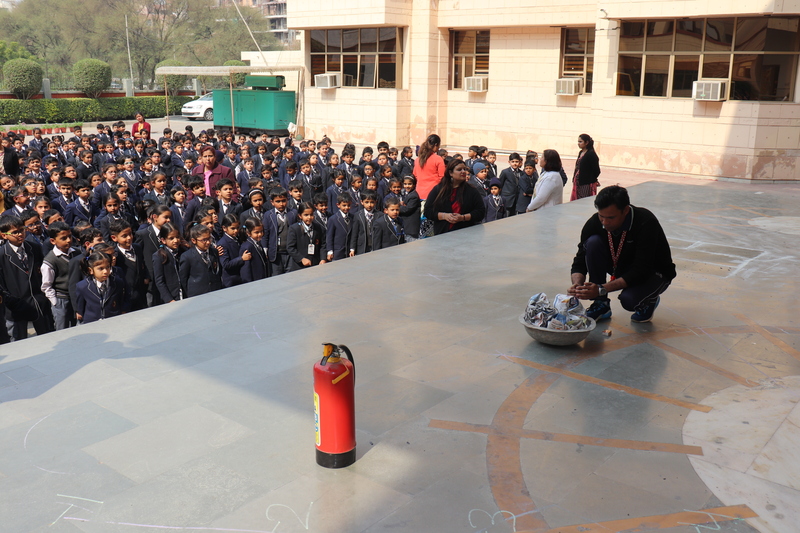 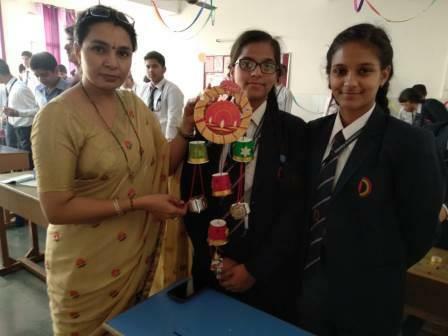 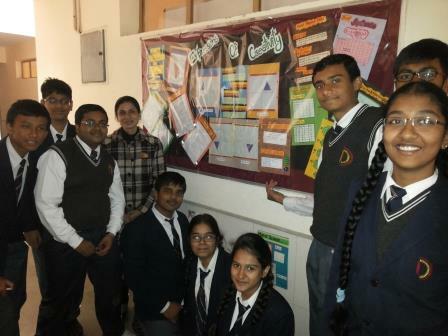 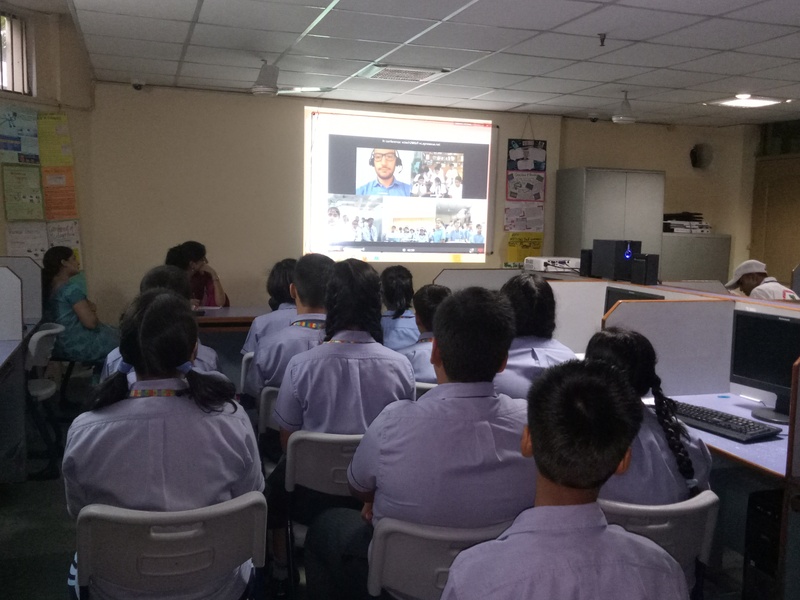 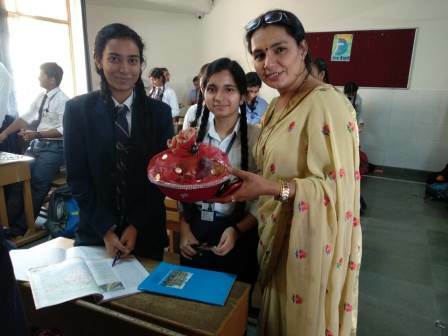 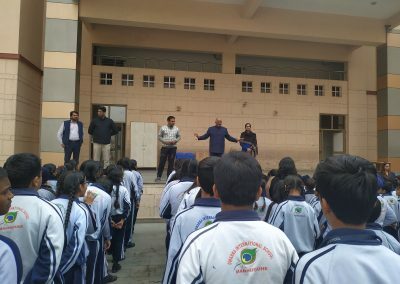 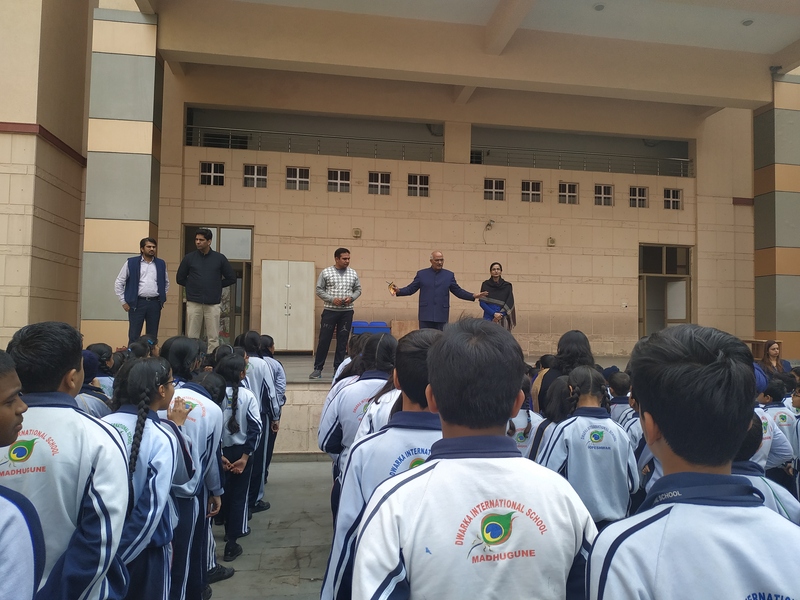 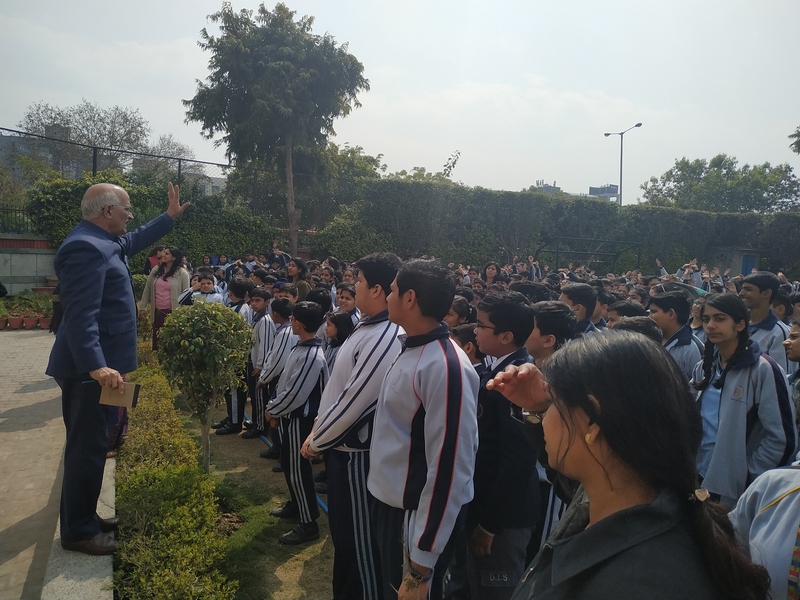 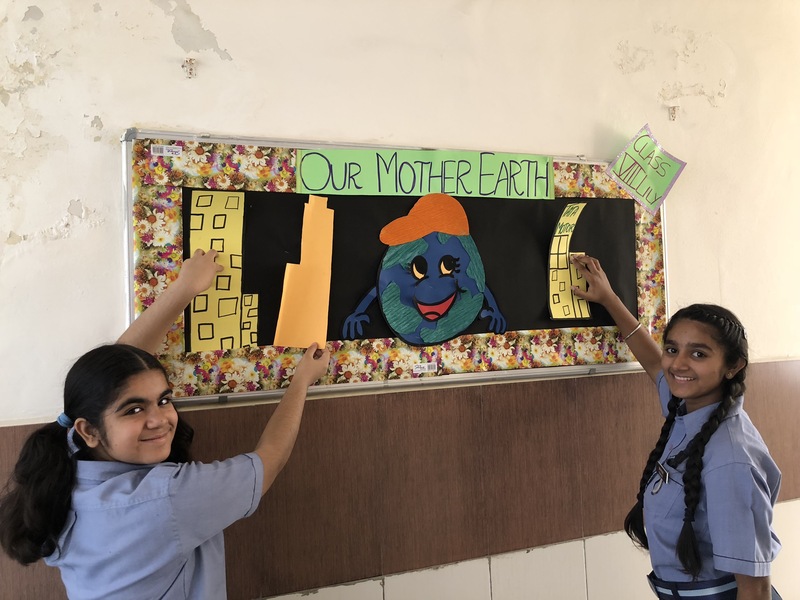 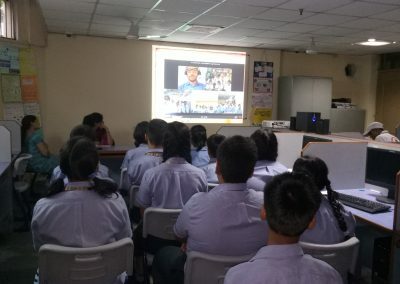 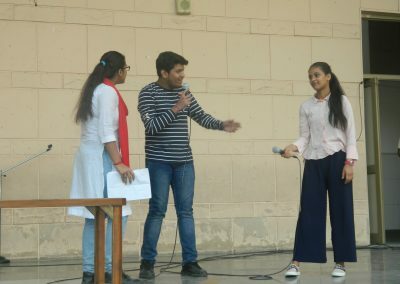 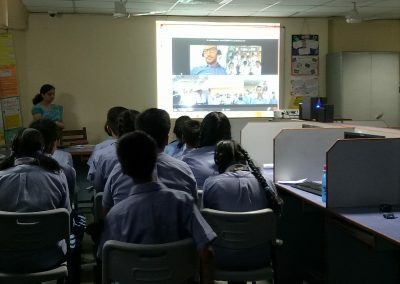 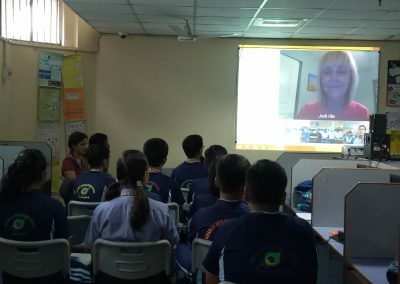 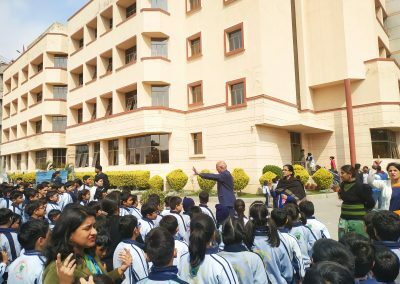 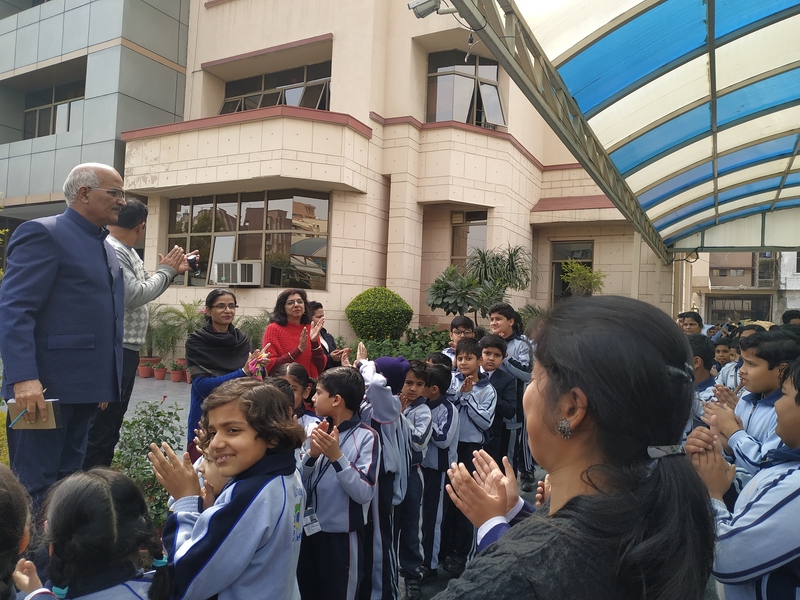 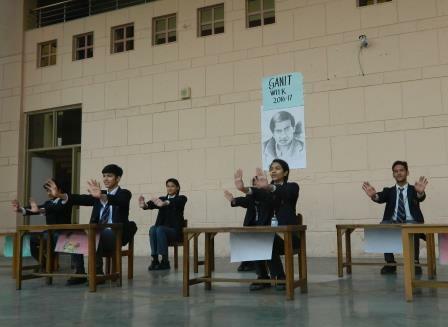 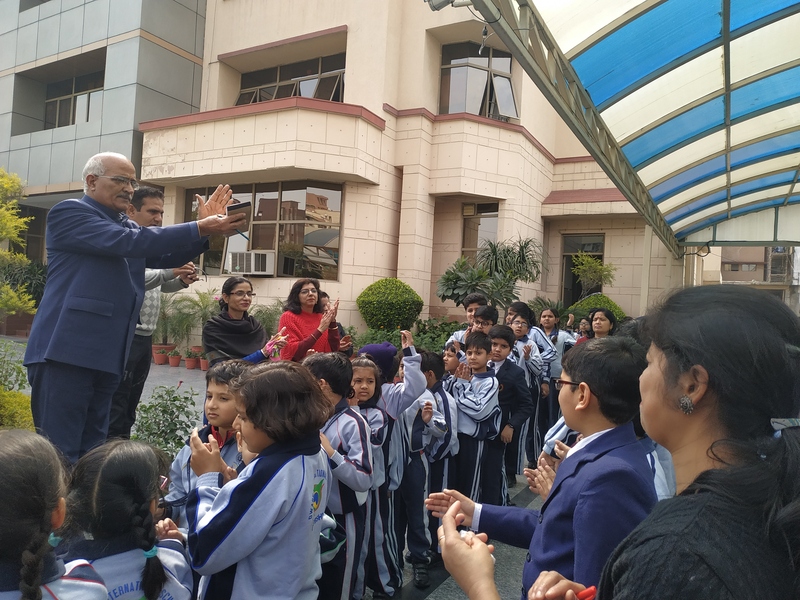 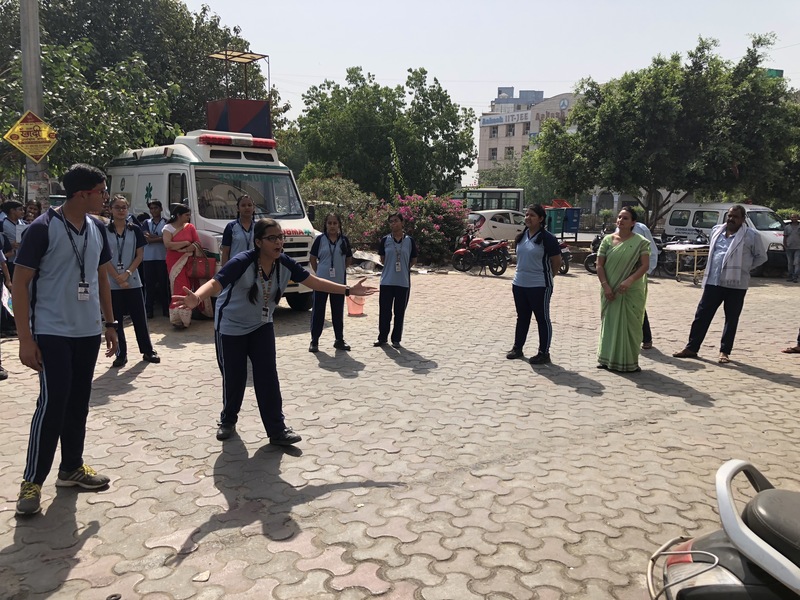 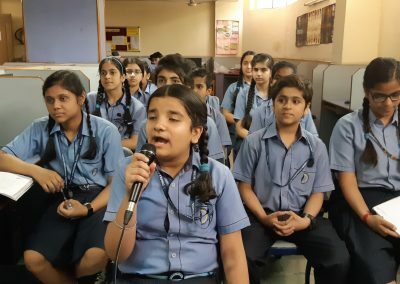 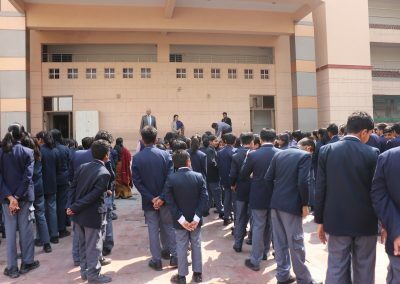 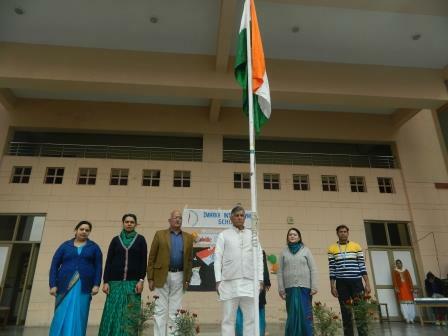 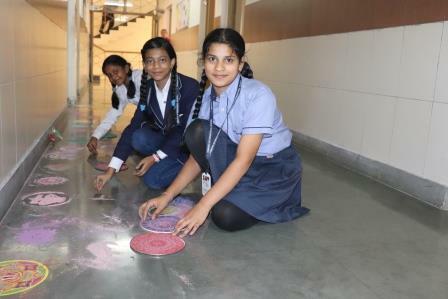 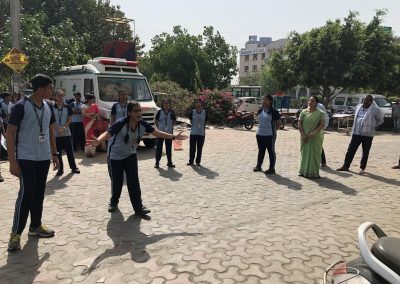 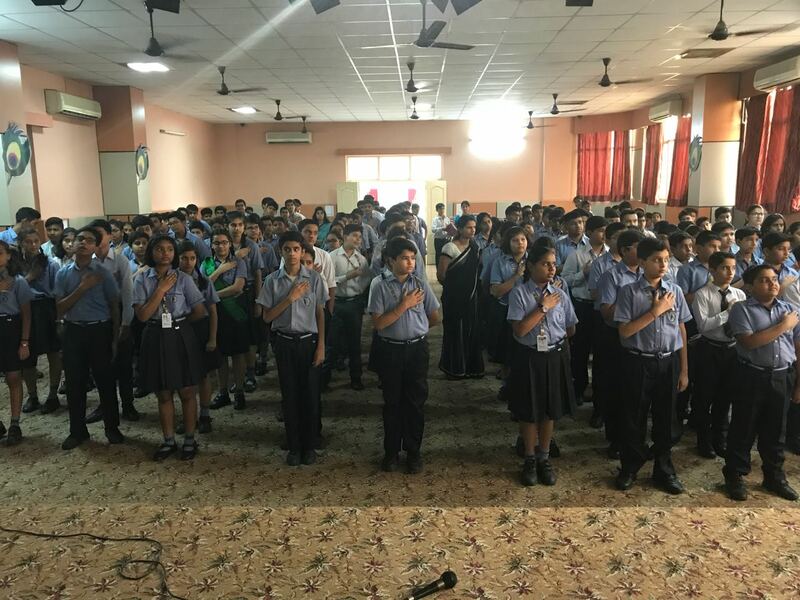 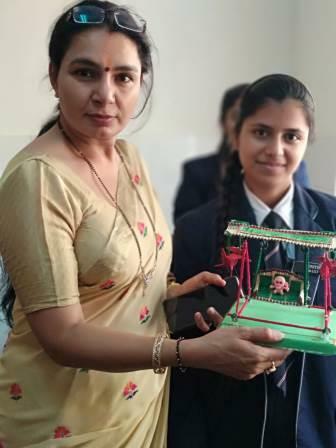 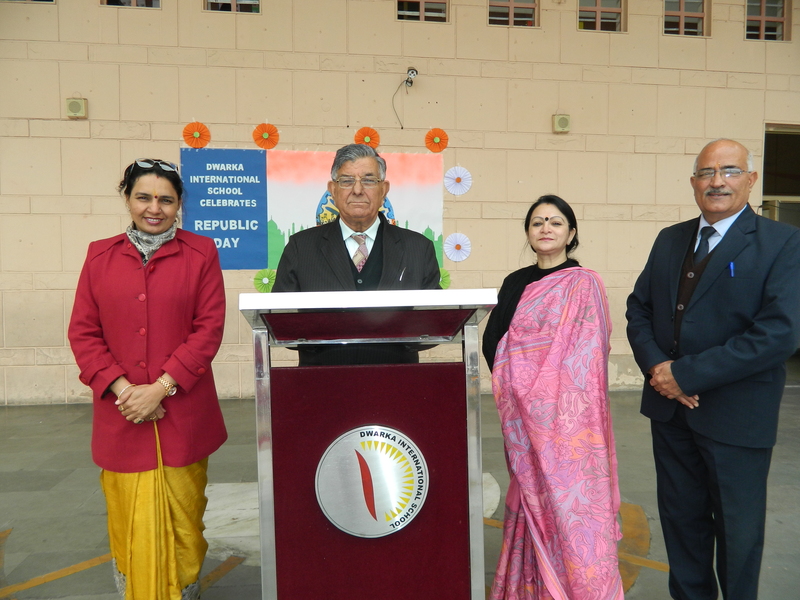 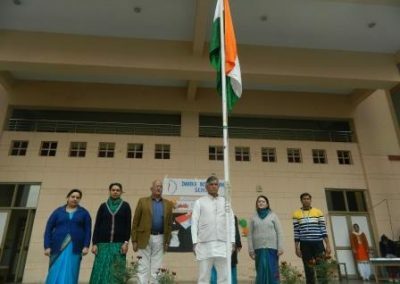 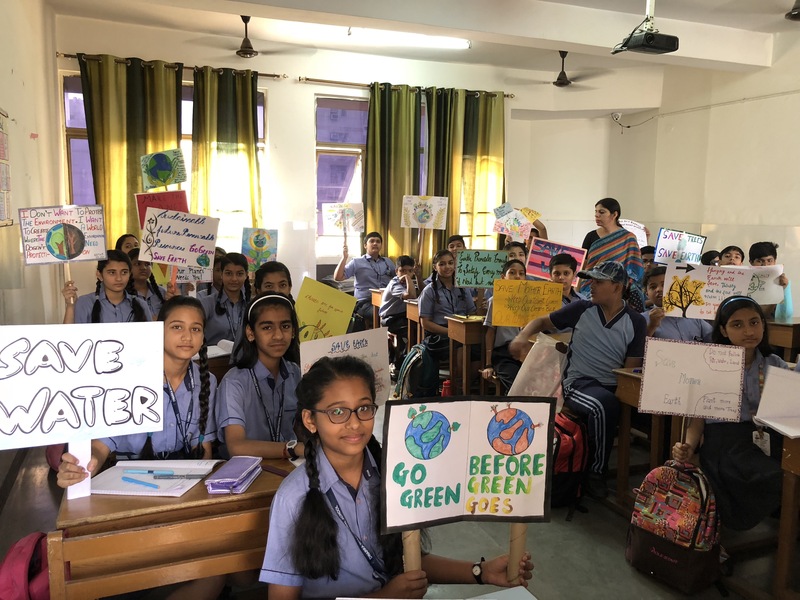 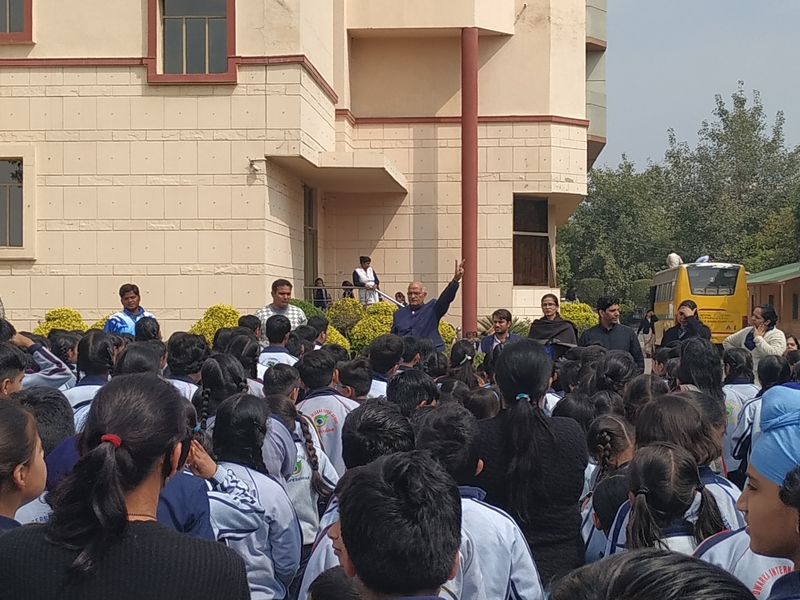 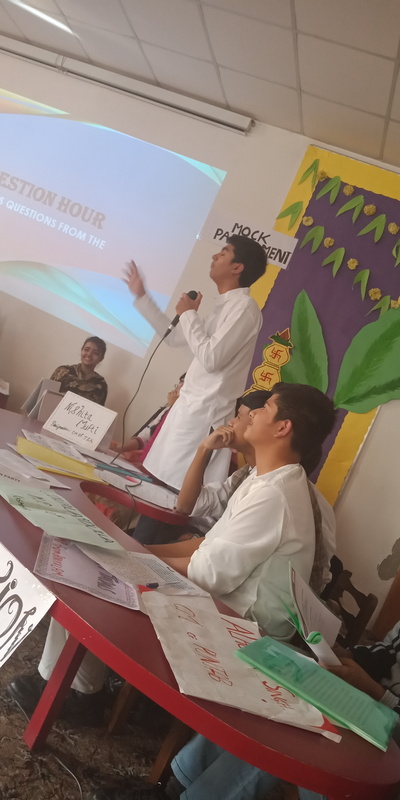 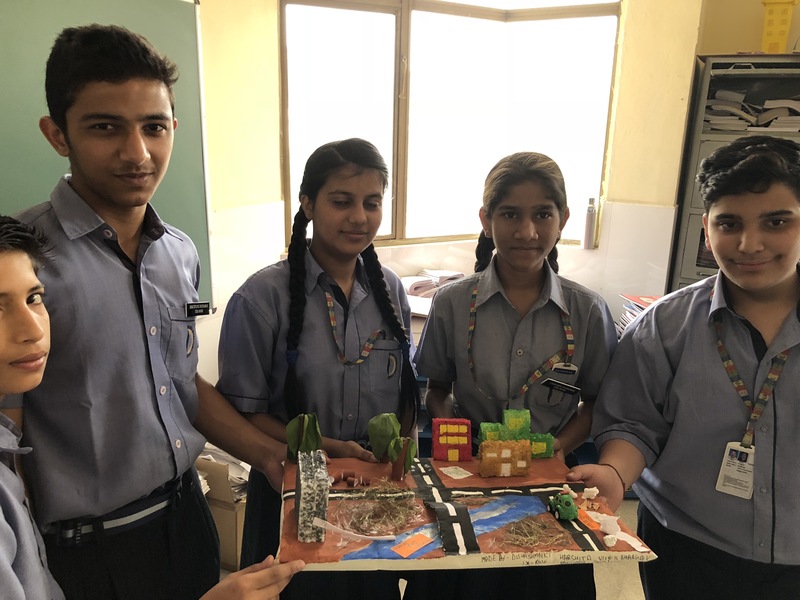 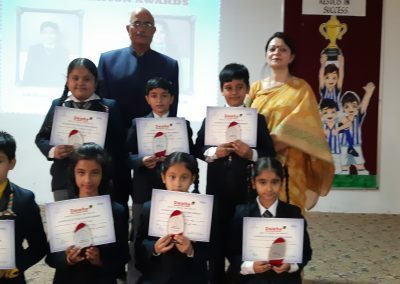 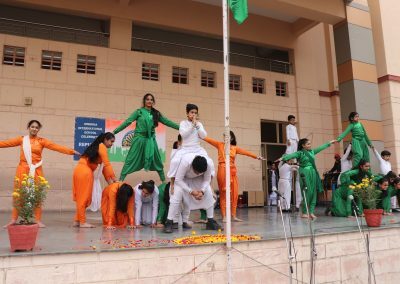 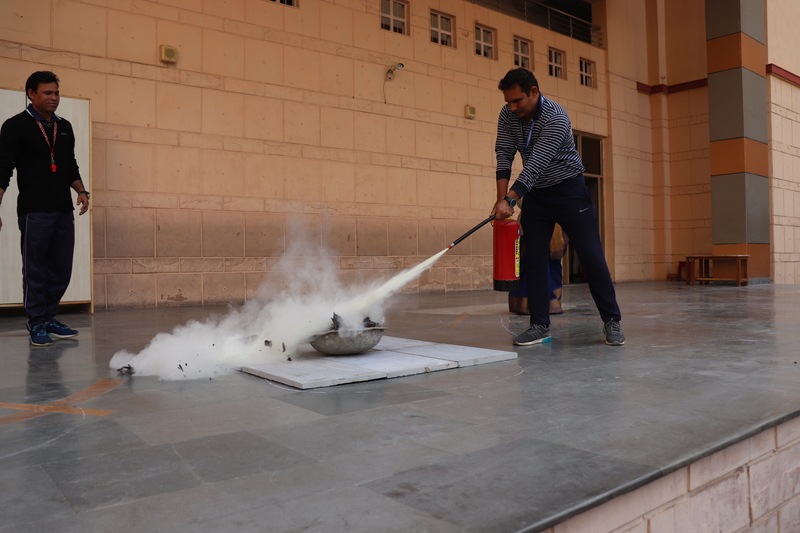 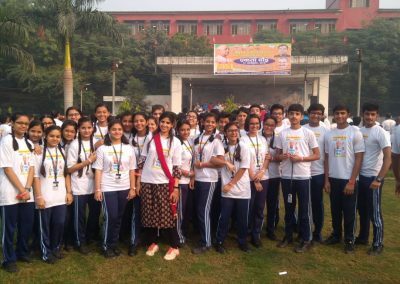 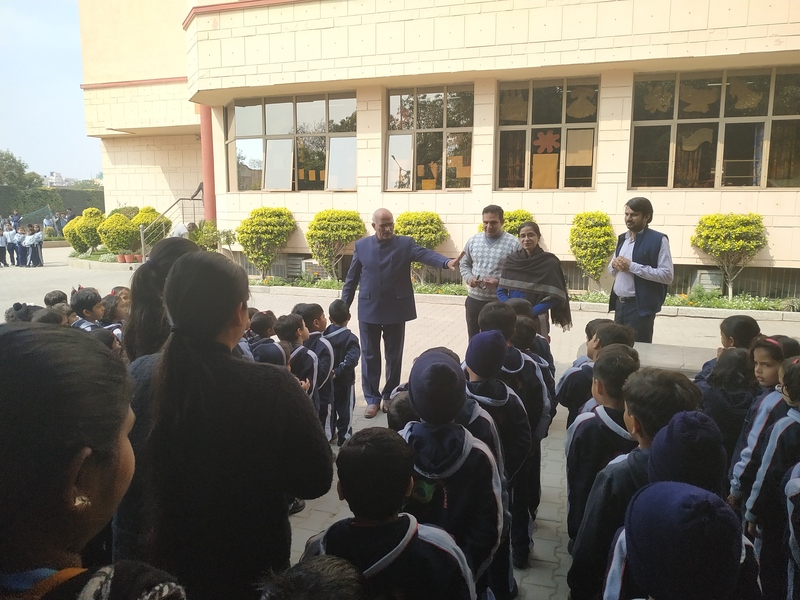 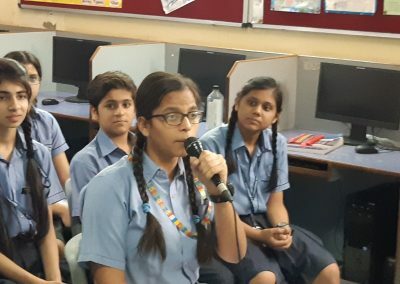 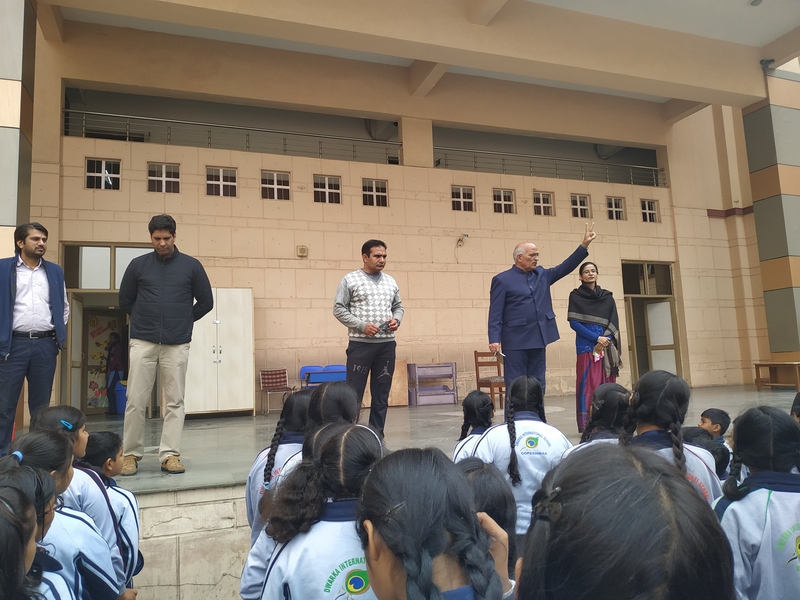 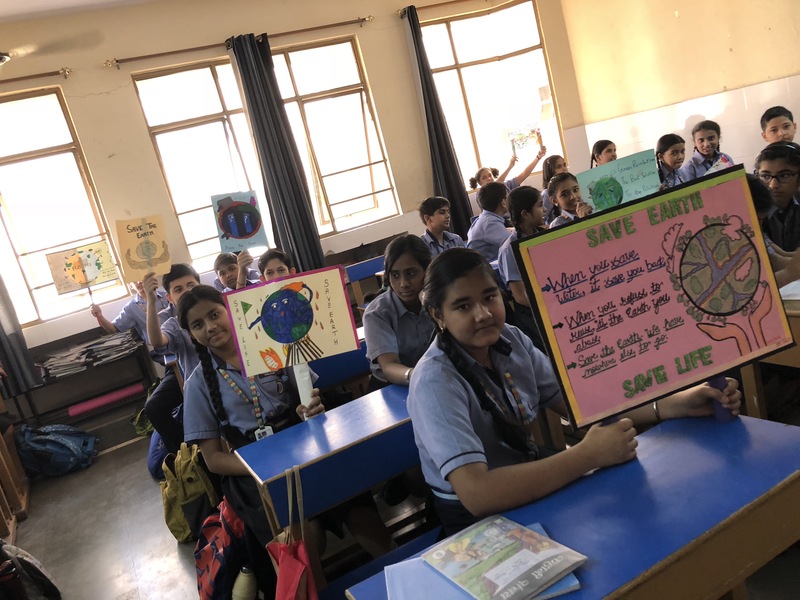 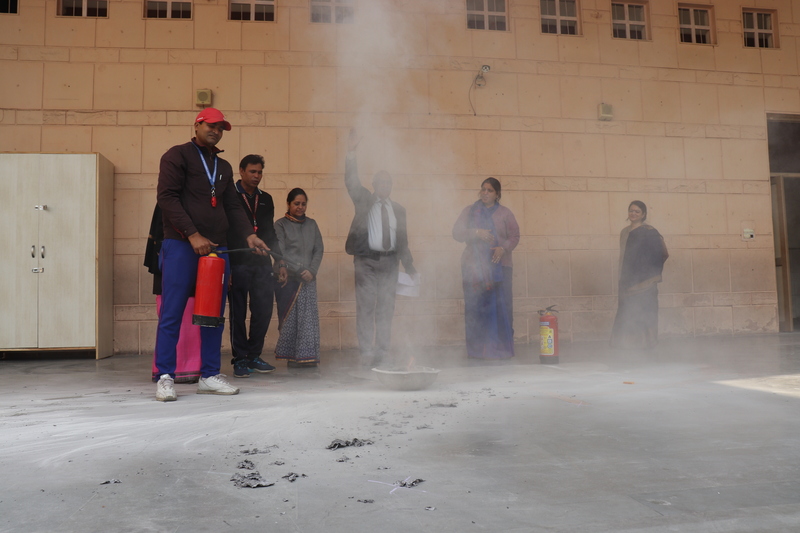 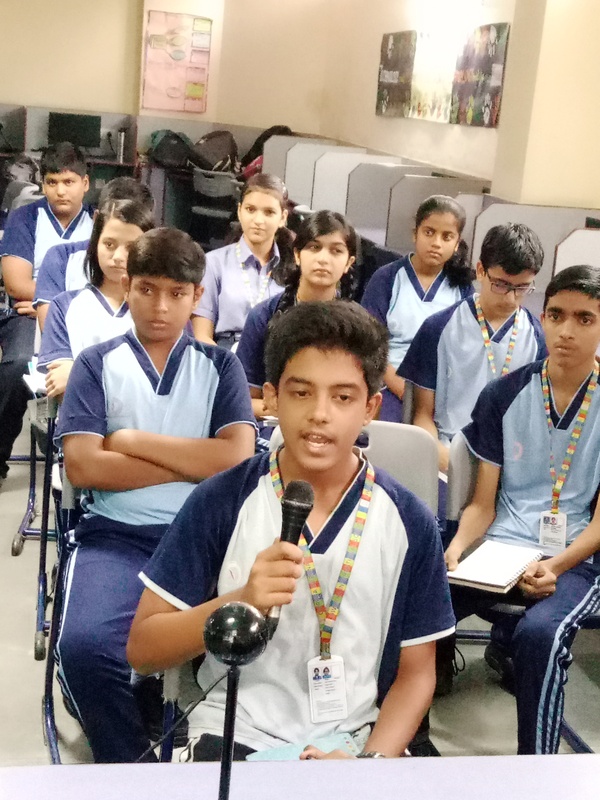 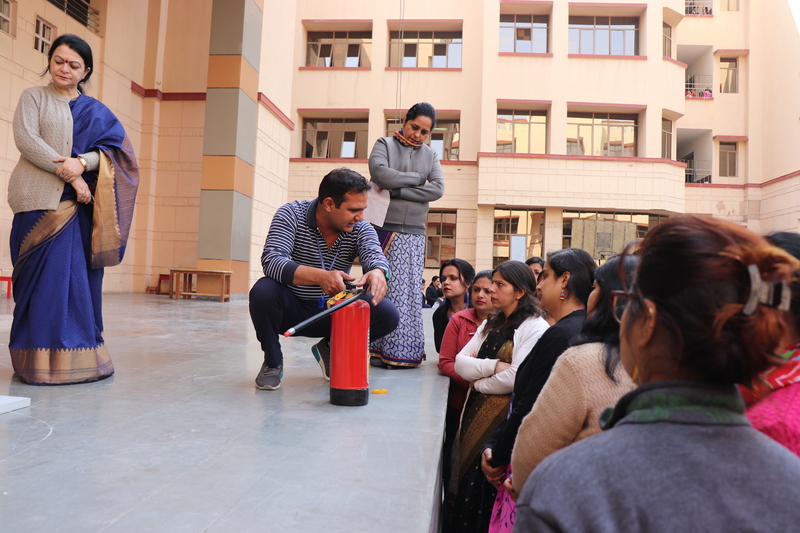 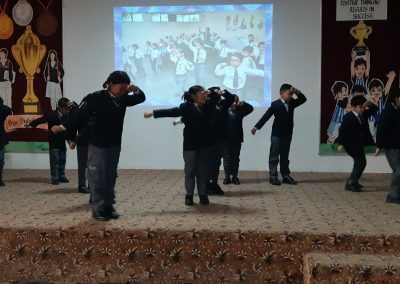 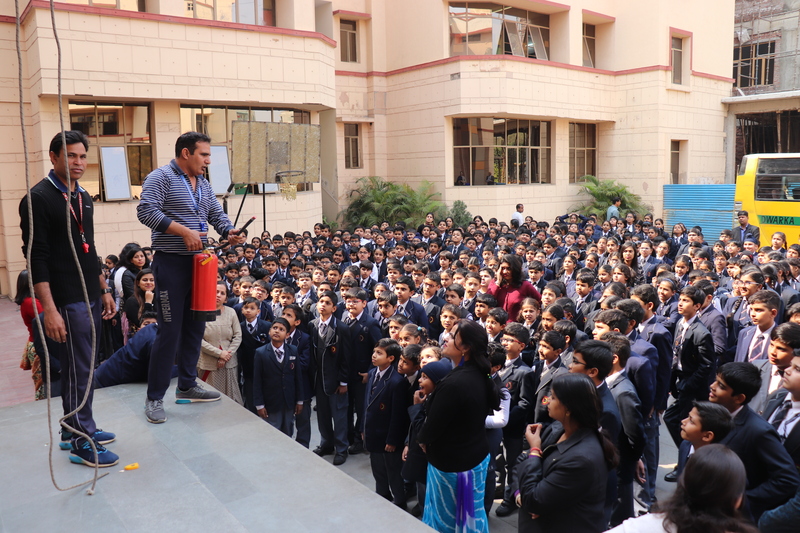 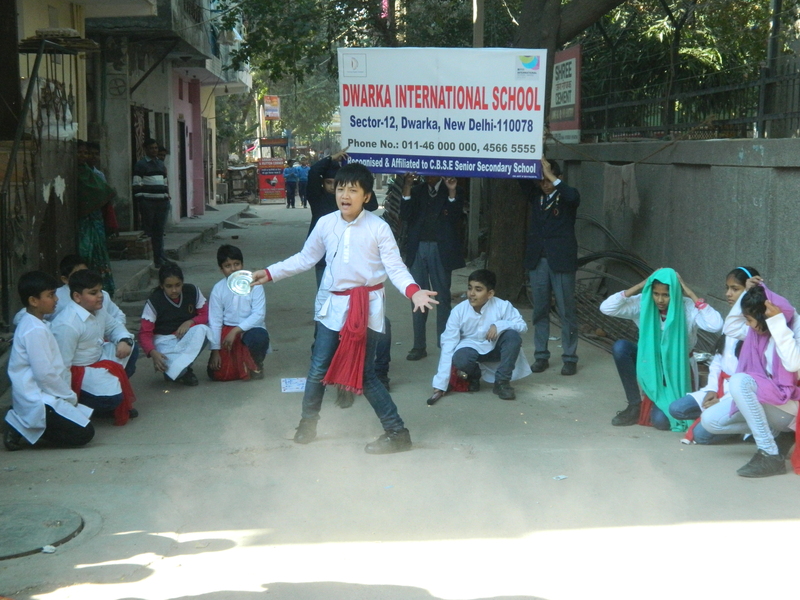 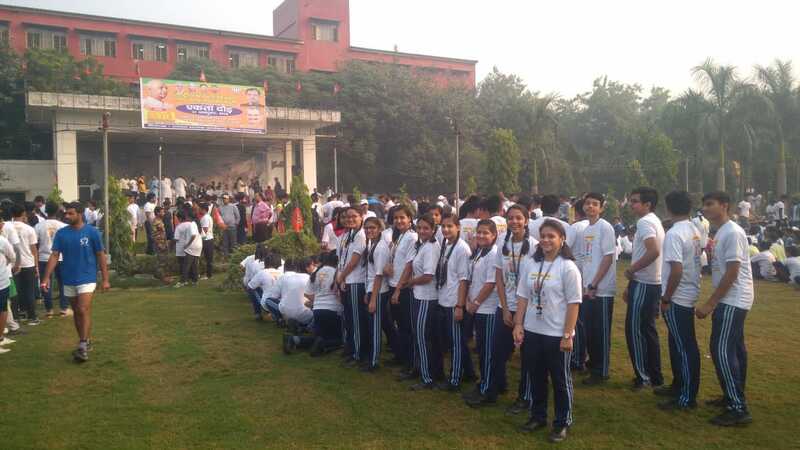 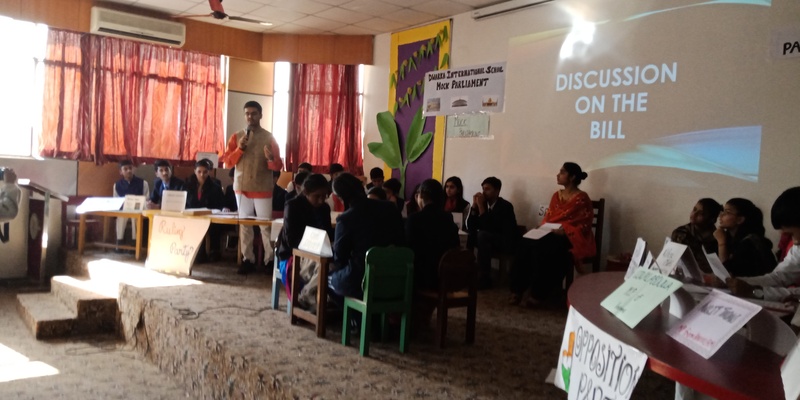 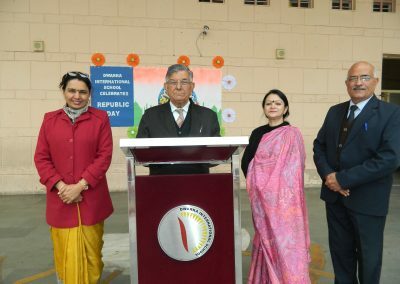 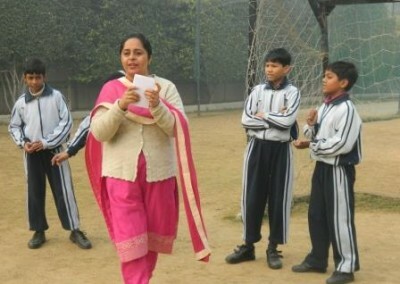 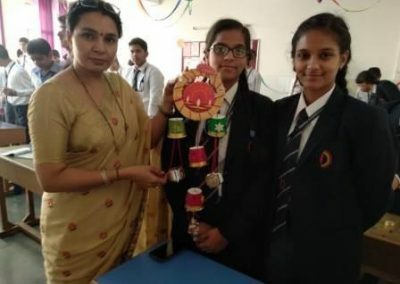 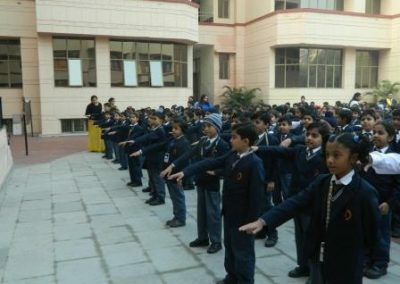 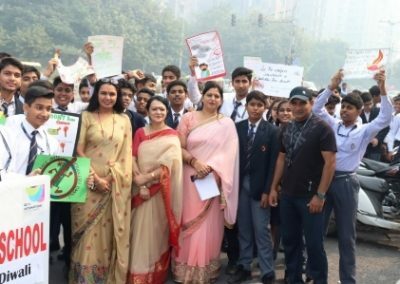 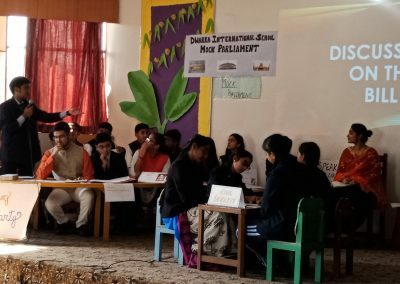 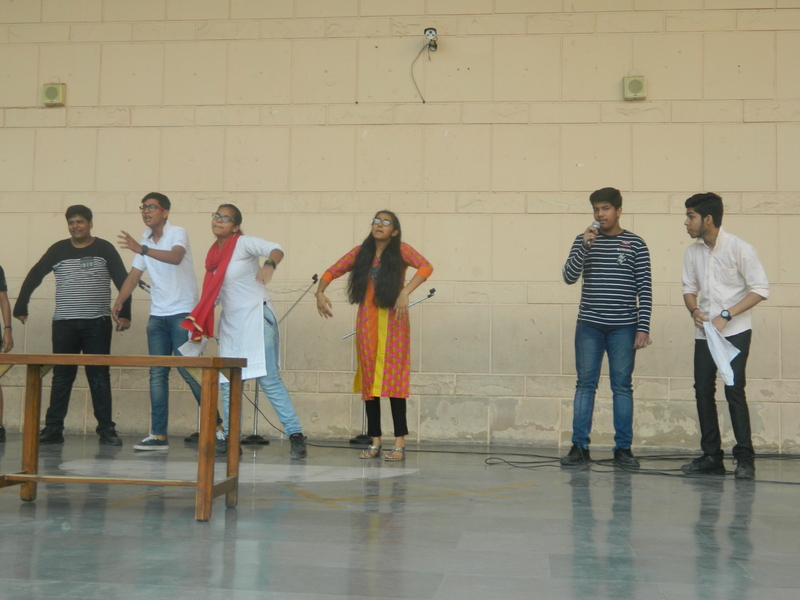 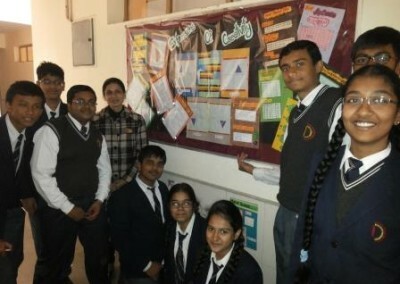 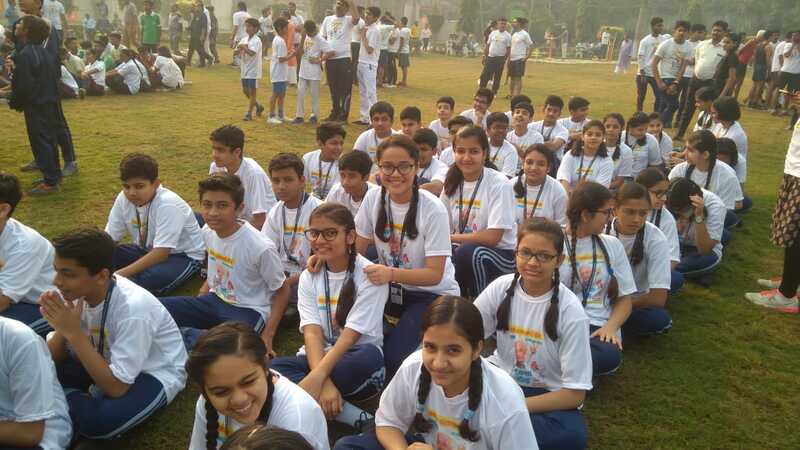 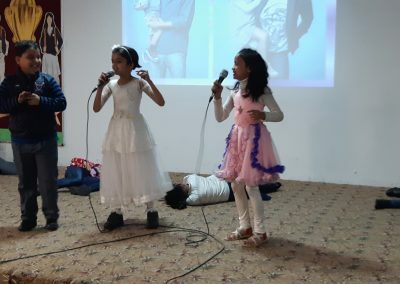 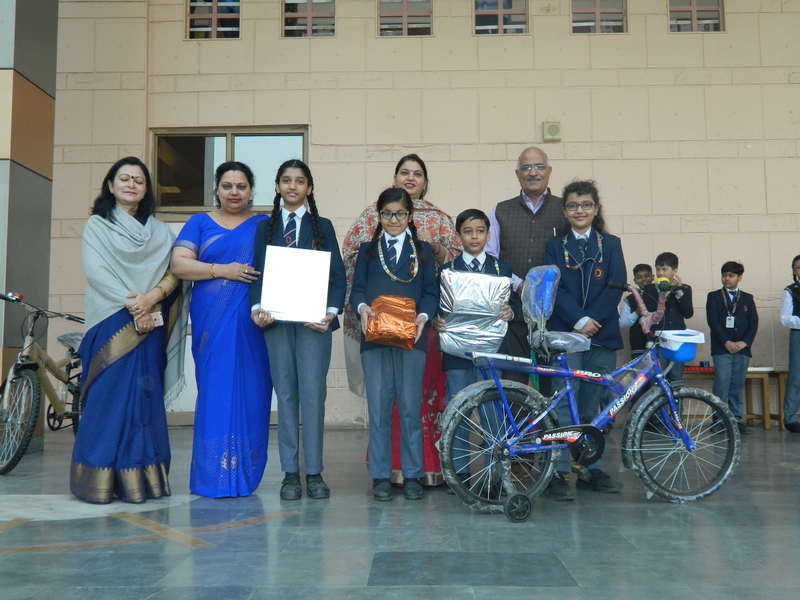 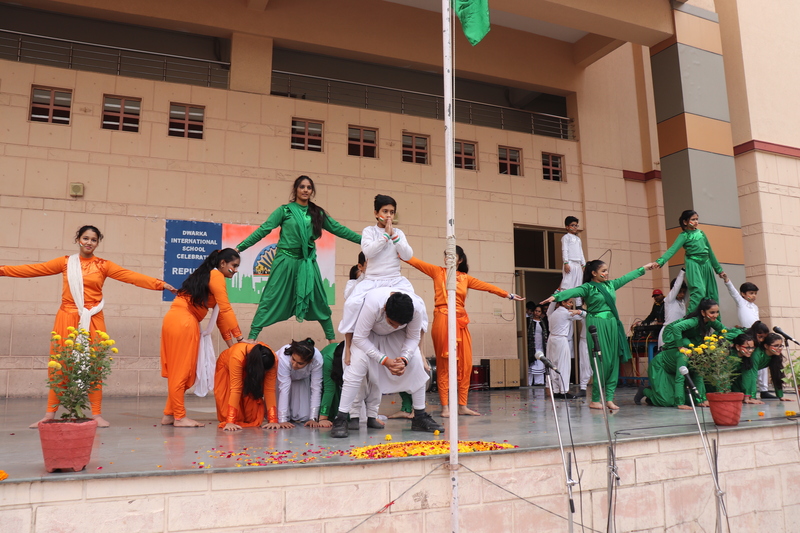 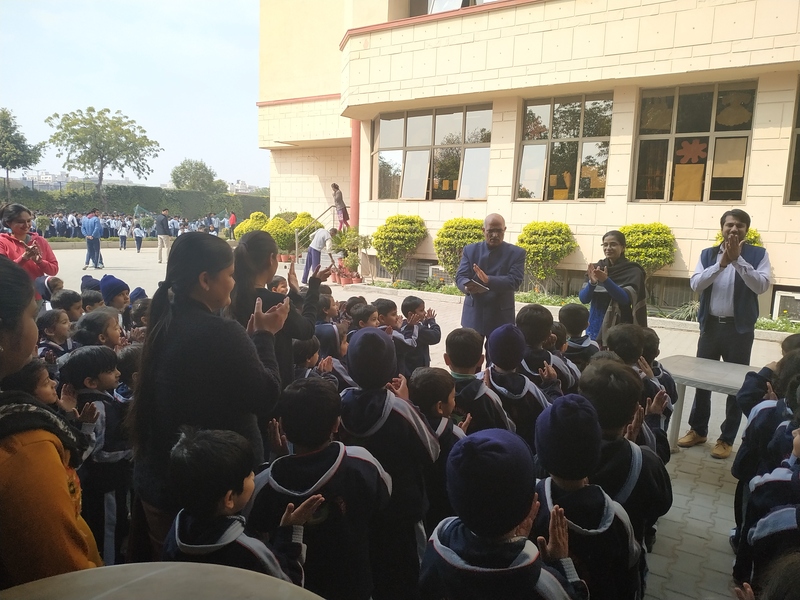 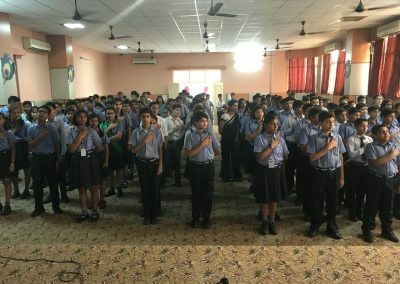 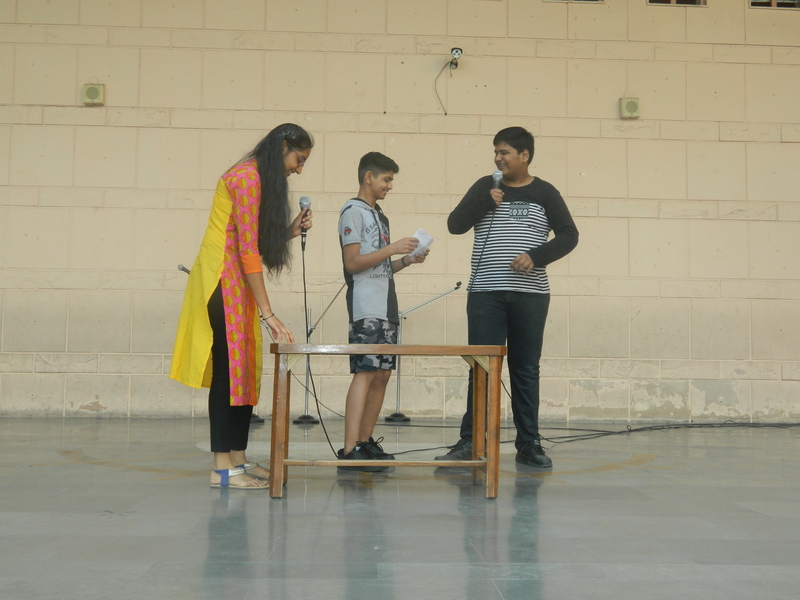 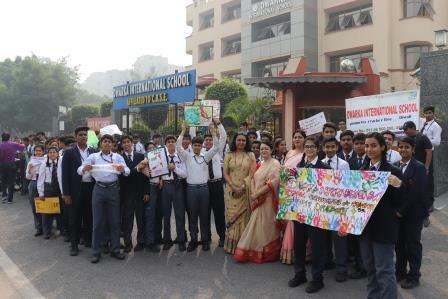 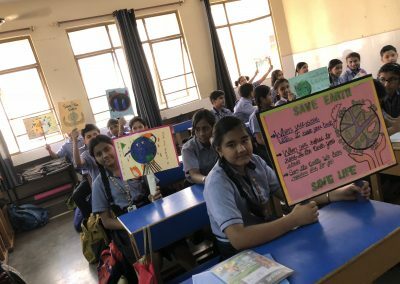 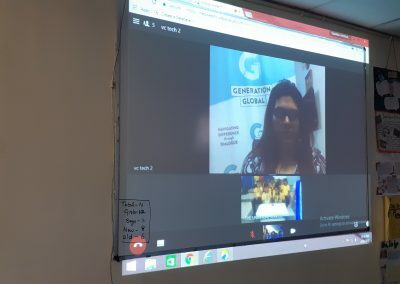 Dwarka International School conducted a Mock Earthquake Drill on February 27th 2019 in the school premises .The exercise took place in the gracious presence of honorable Education Advisor Mr. Rajbir Singh Gahlot, Principal Ms. Poonam Jha , Headmistress Ms. Archana Rathi. It was an informative and fruitful drill. 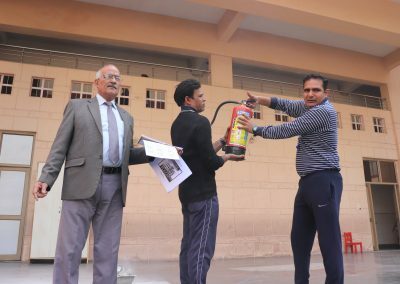 The first thing that Disaster Management Team educated while managing these kinds of disasters was to evacuate the building using stairs by walking and leaving the belongings there and then. 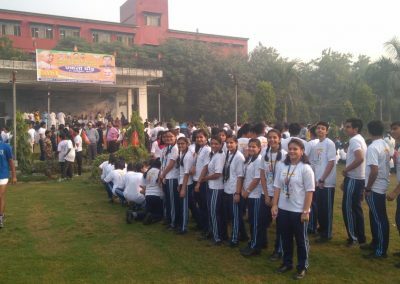 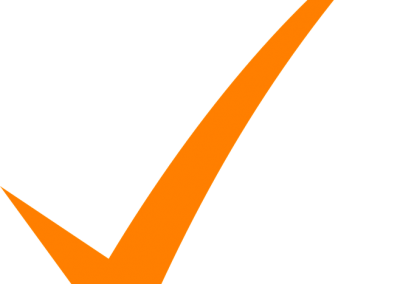 They further suggested that running should be avoided to evade stampede so as to reach an open area away from the building. 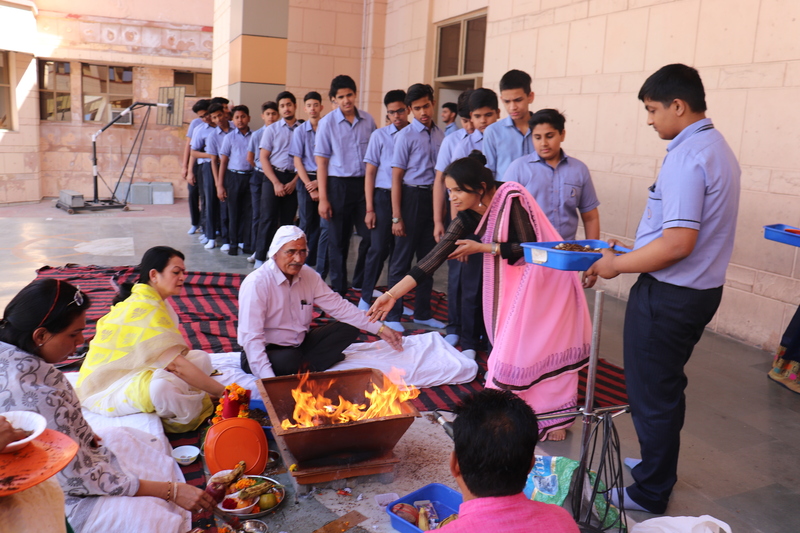 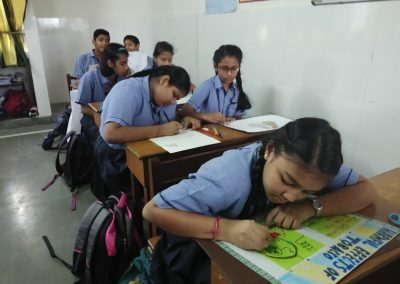 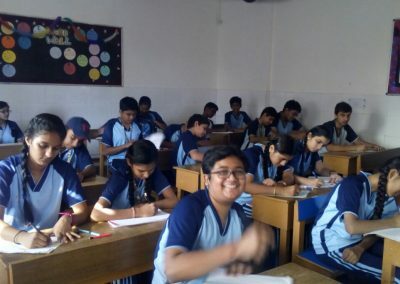 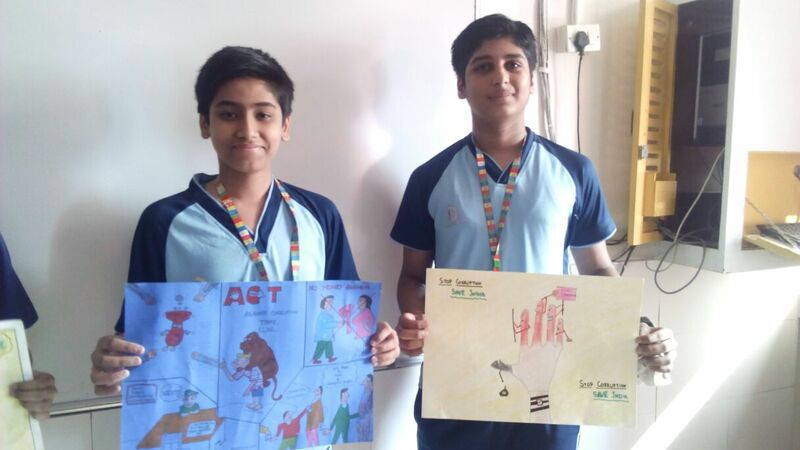 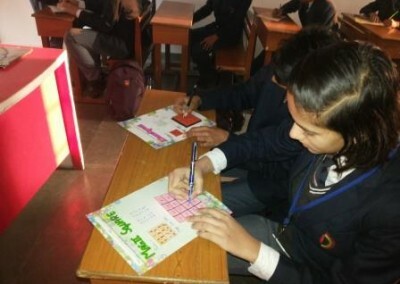 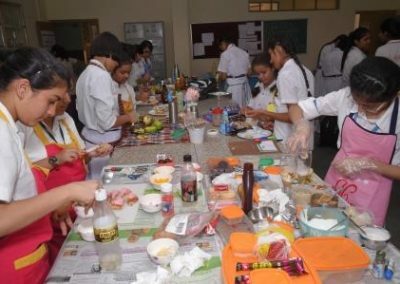 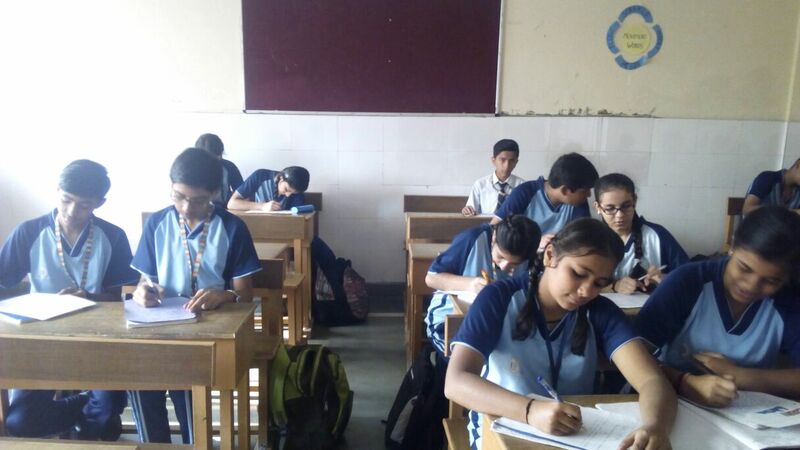 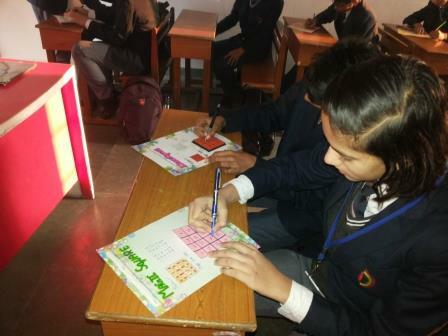 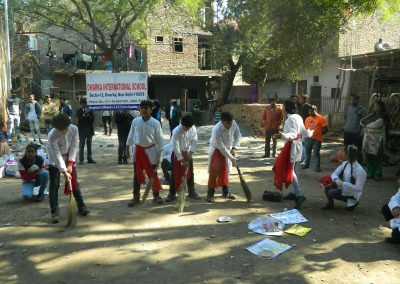 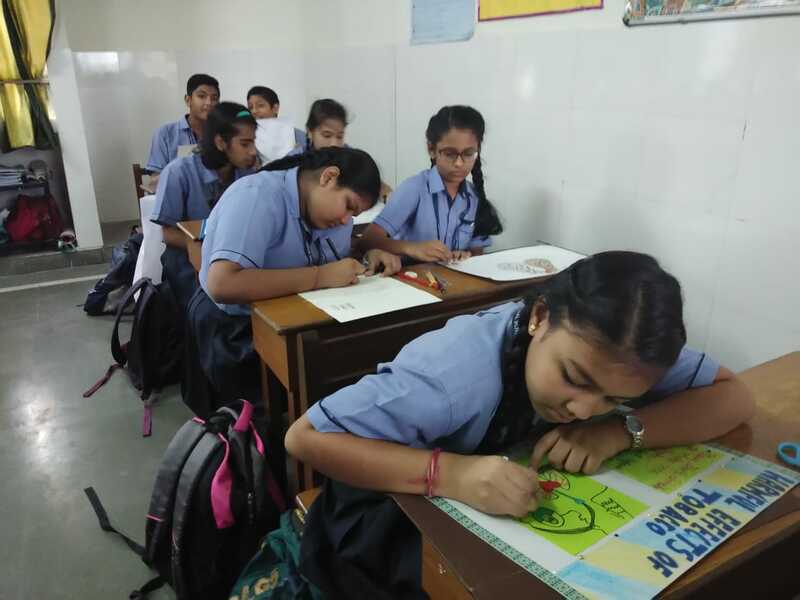 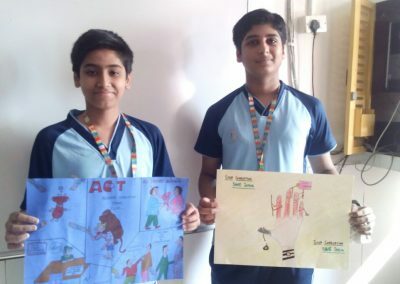 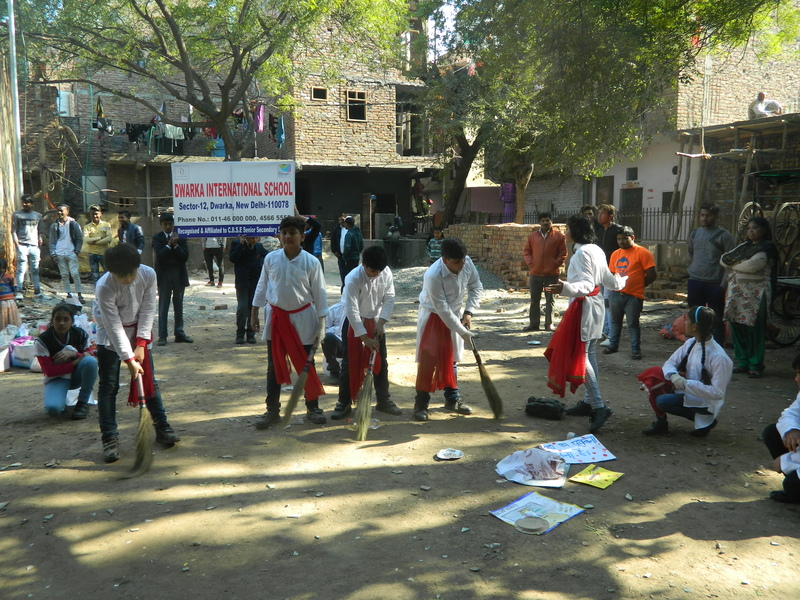 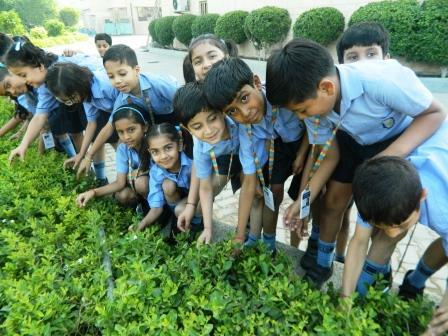 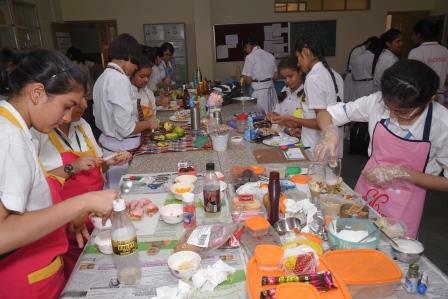 Students along with their teachers were given different tasks of operations to undertake during the drill. 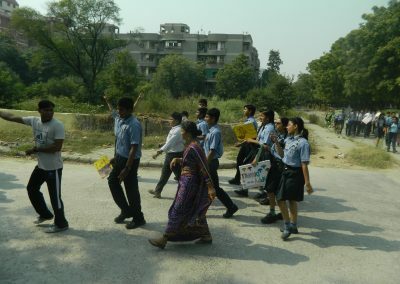 A search and rescue team comprising students and teachers played a very significant role in the drill. 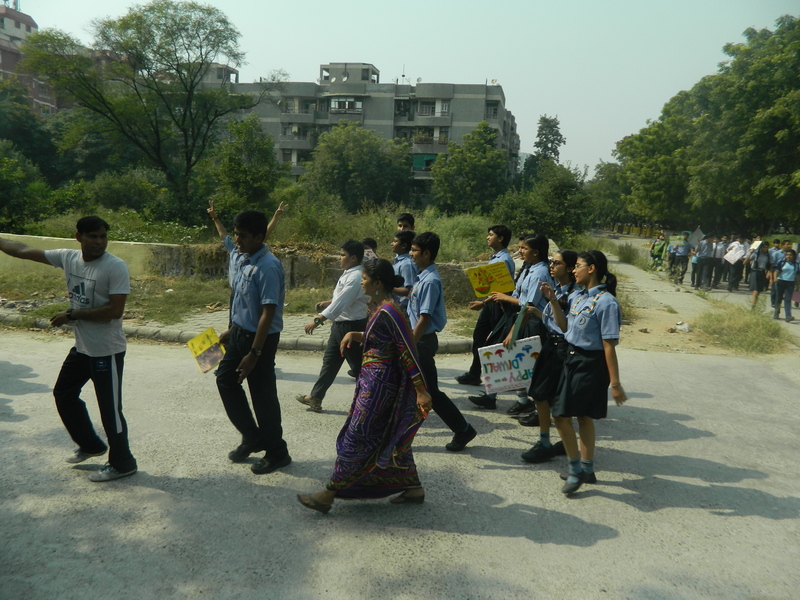 As instructed they looked for the injured around so that immediate first aid help could be provided. 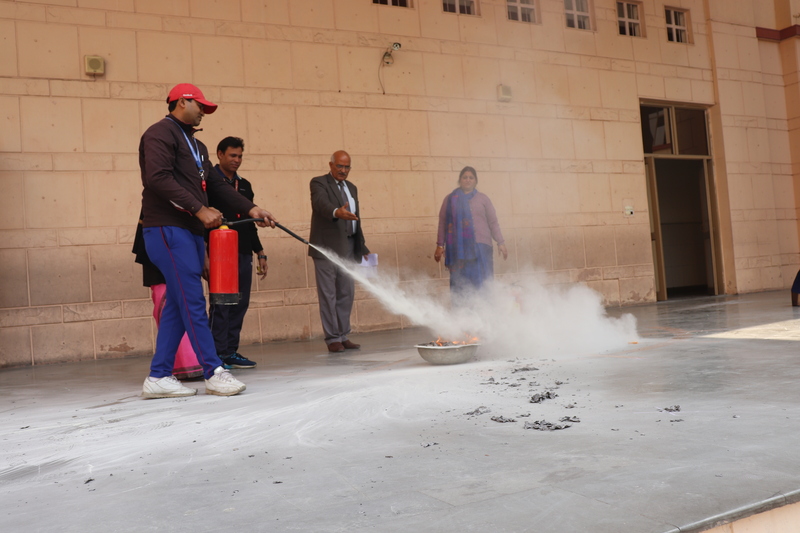 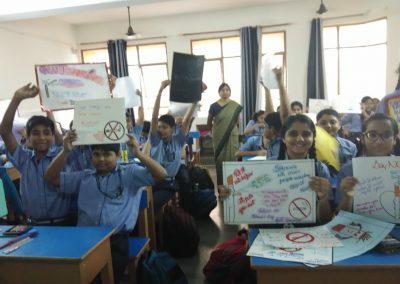 The students were advised to follow simple rules while evacuating as for example they were asked to crawl and come out of the room if smoke is very dense and if somebody catches fire then he should be made to roll with body covered with any cloth like; blanket, curtain, bed sheet etc. 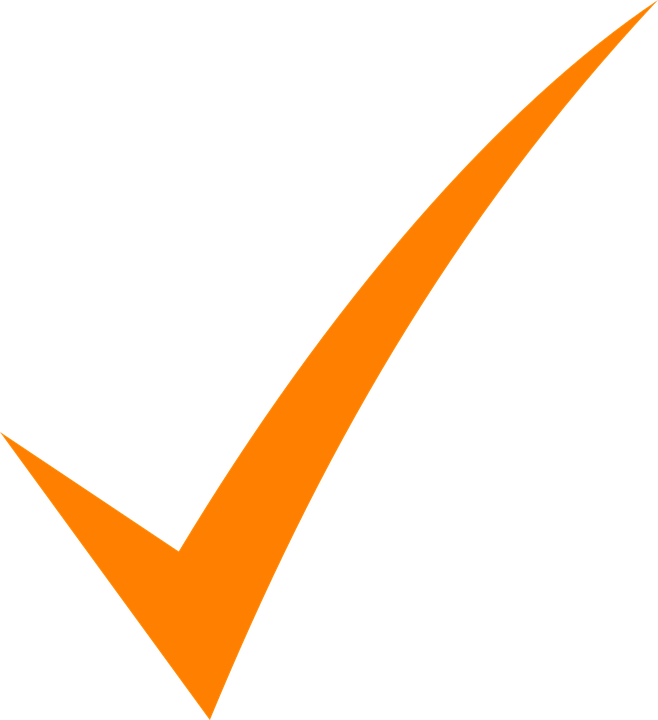 This mode of action was demonstrated by a Physical Education teacher for the students. 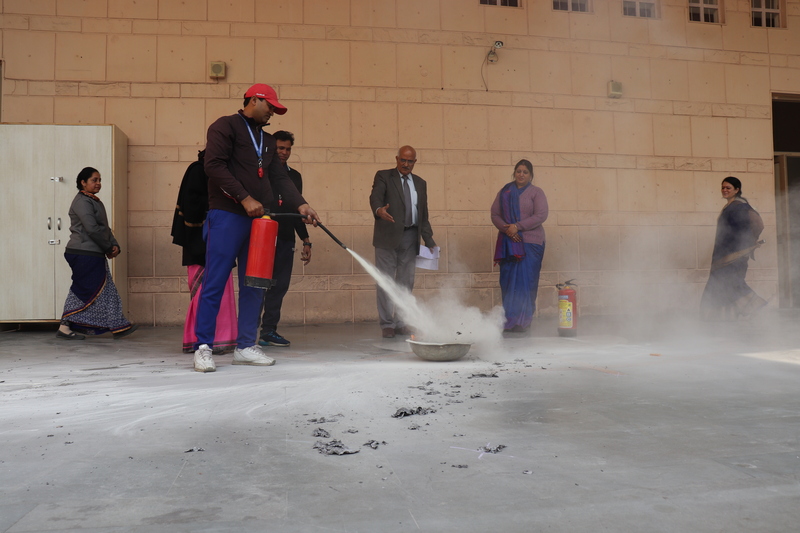 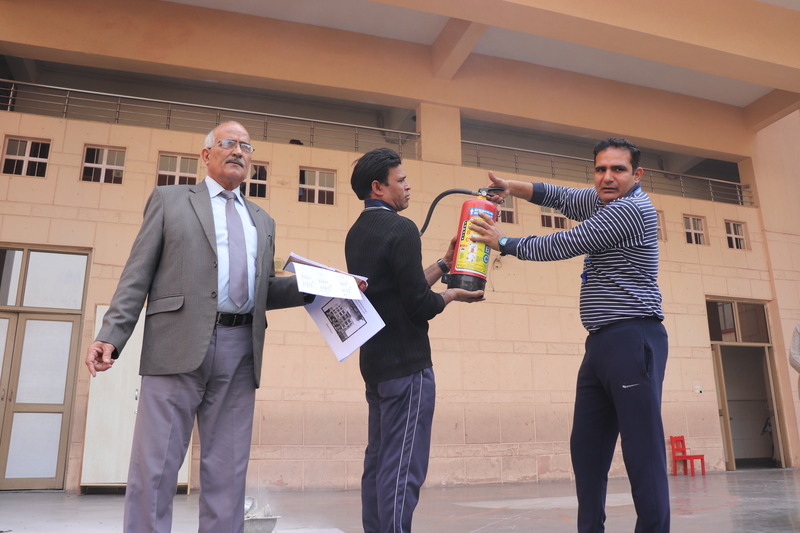 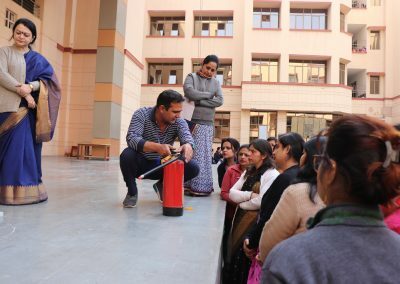 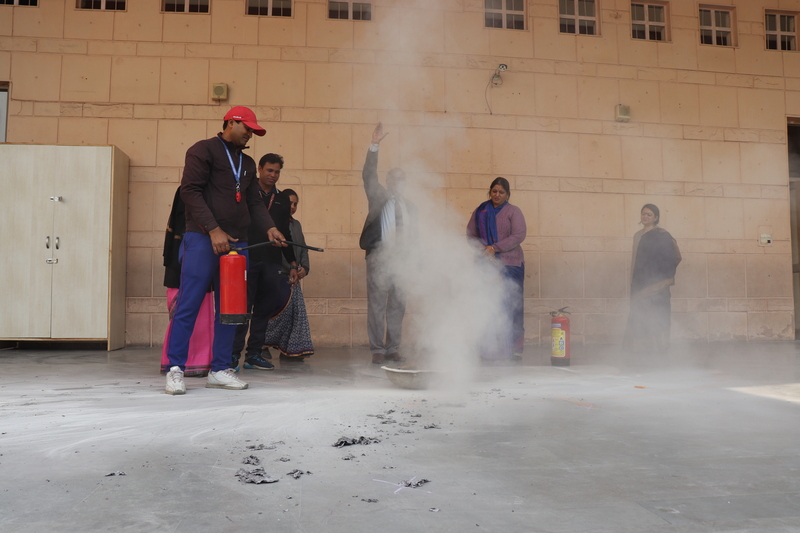 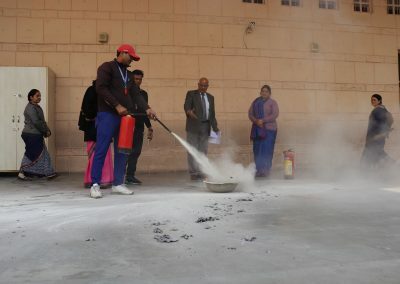 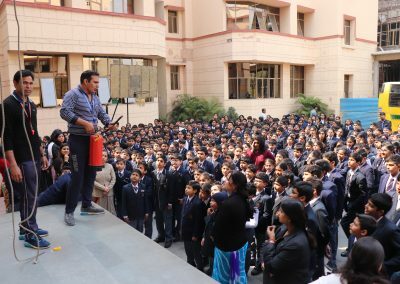 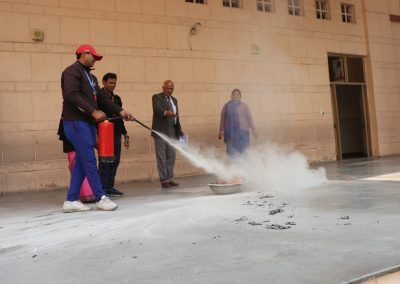 The team also displayed the method of using fire extinguishers. 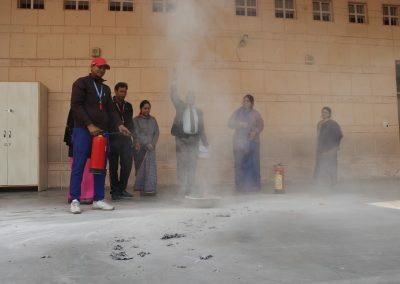 At last the expert team provided some important guidelines to teachers about the drill. 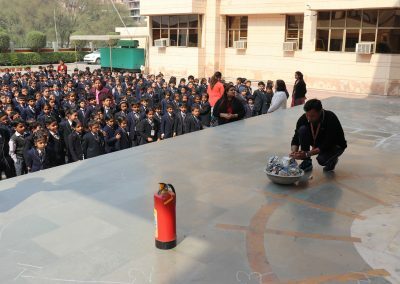 They gave the instructions about the dos and don’ts during the disaster. 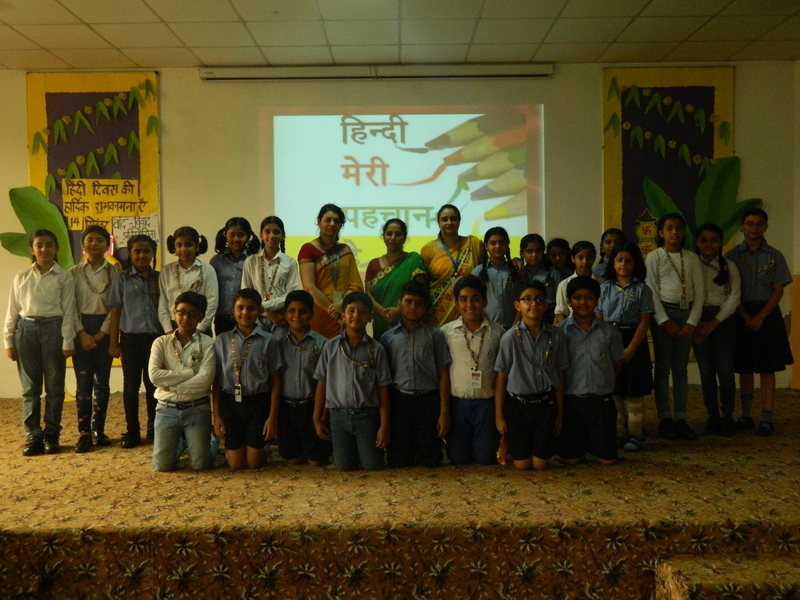 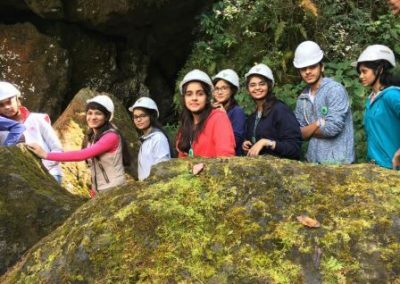 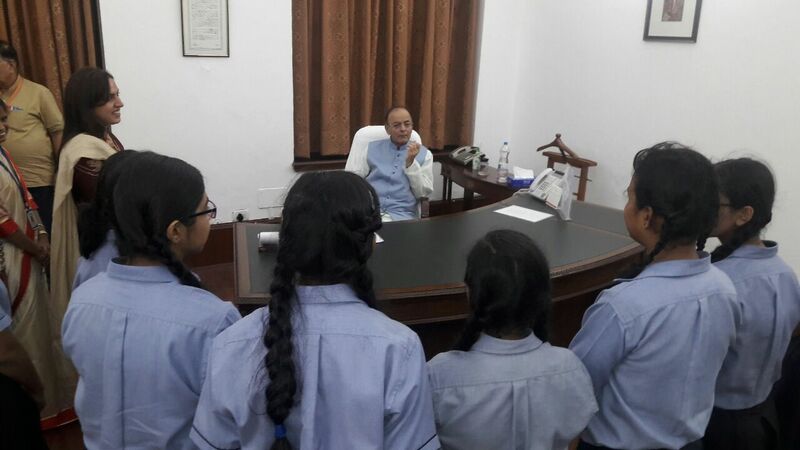 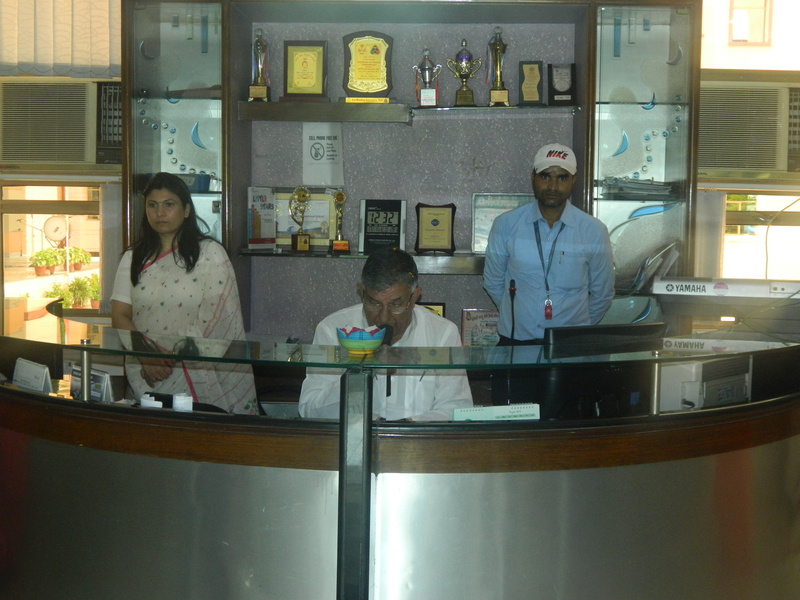 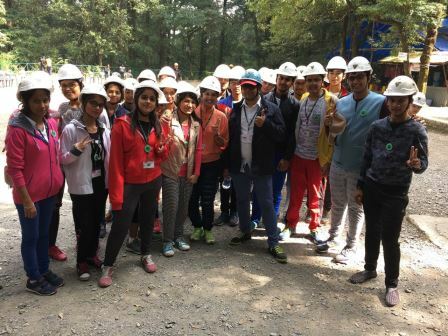 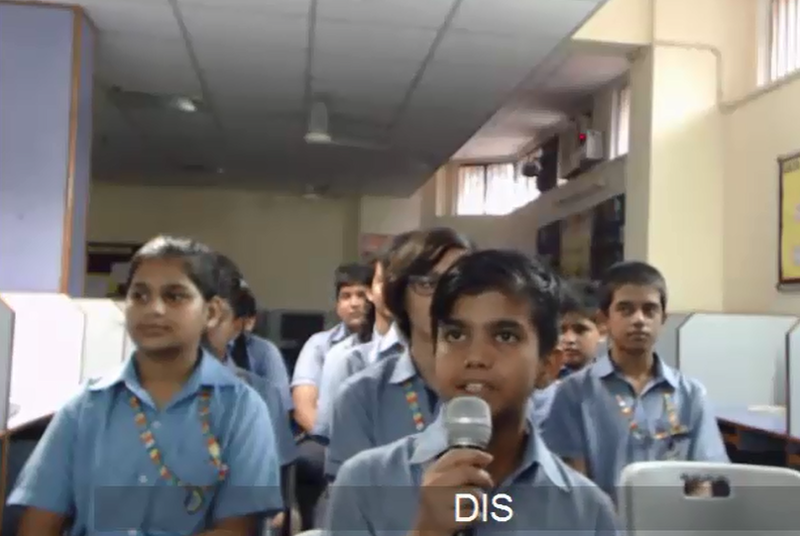 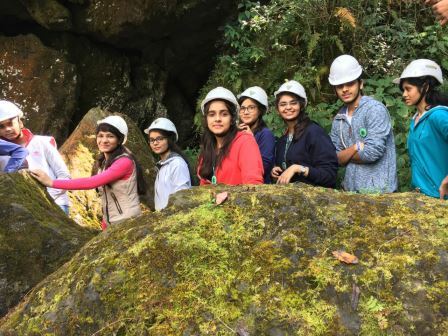 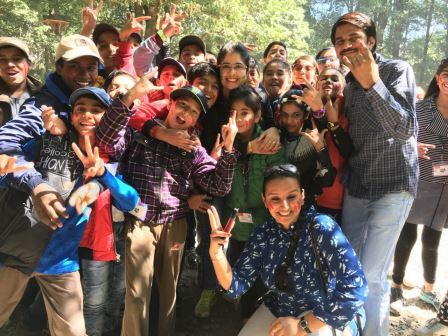 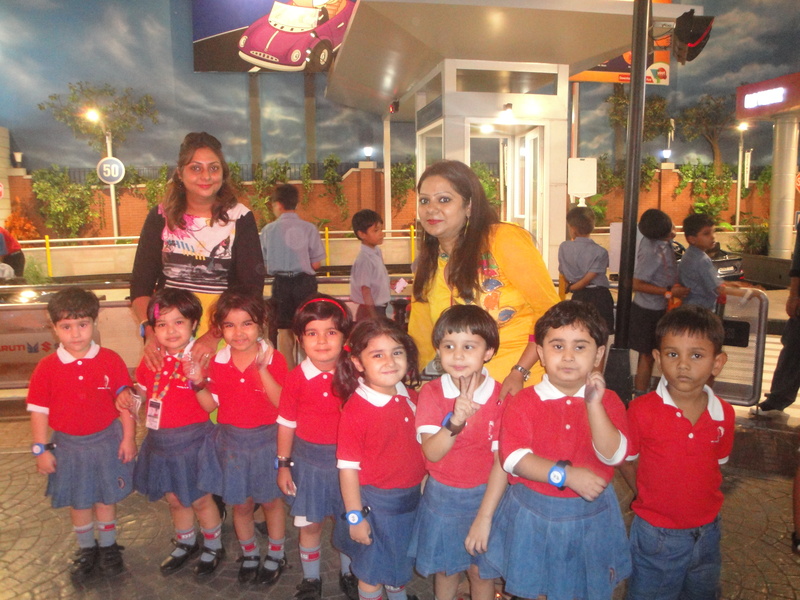 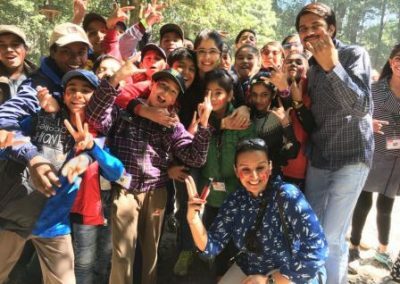 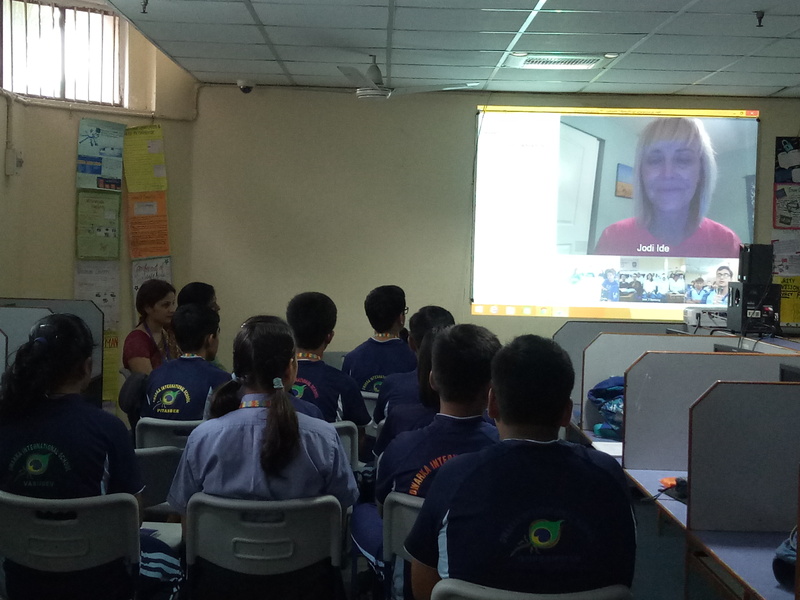 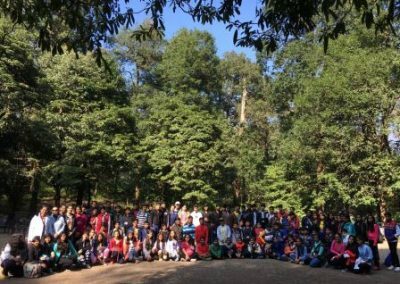 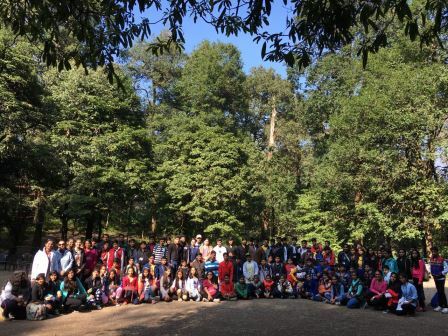 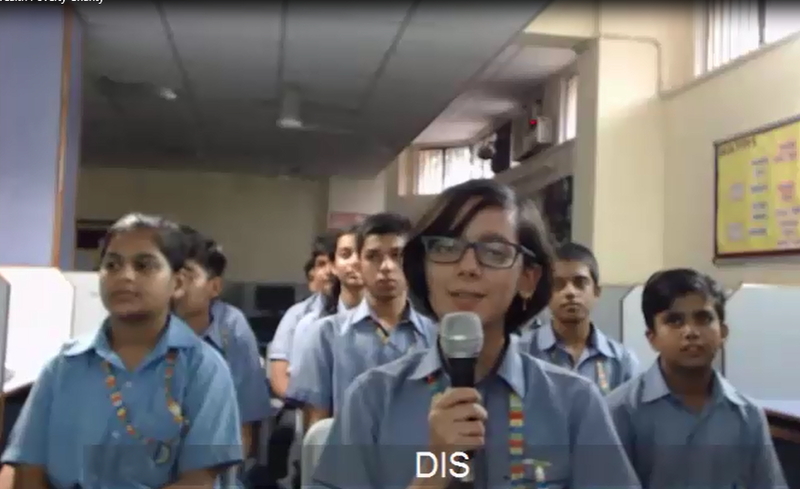 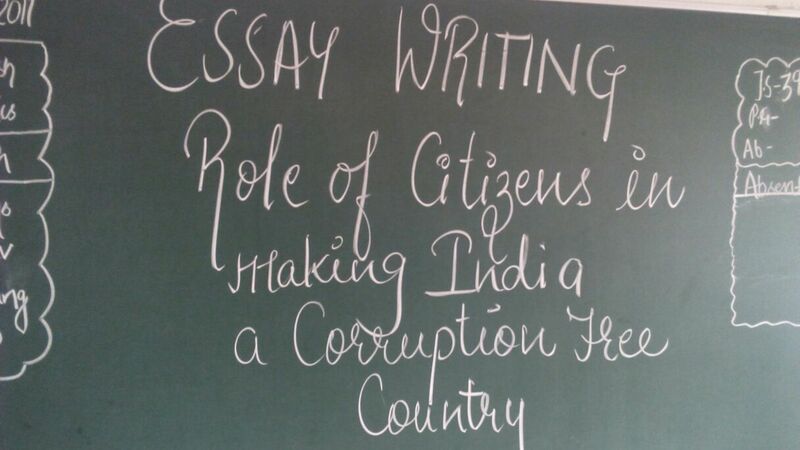 Overall it was an enriching experience for the students as well as teachers. 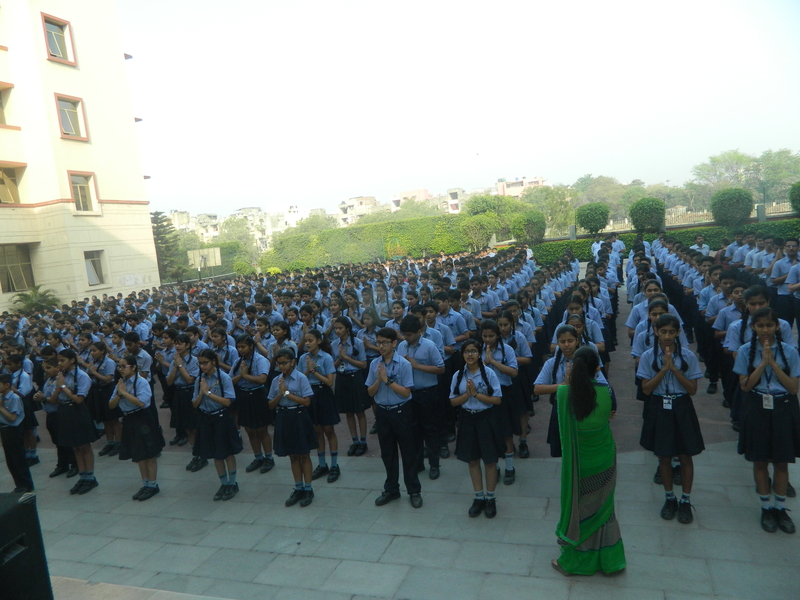 They participated in the drill enthusiastically. 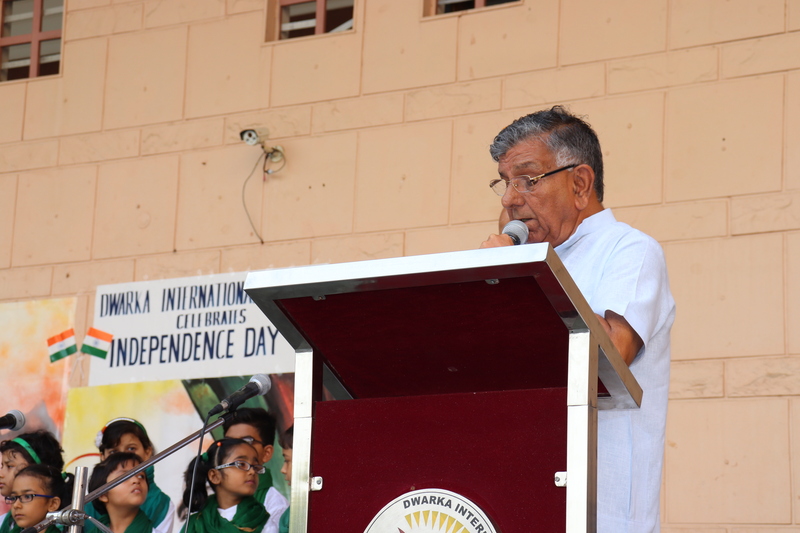 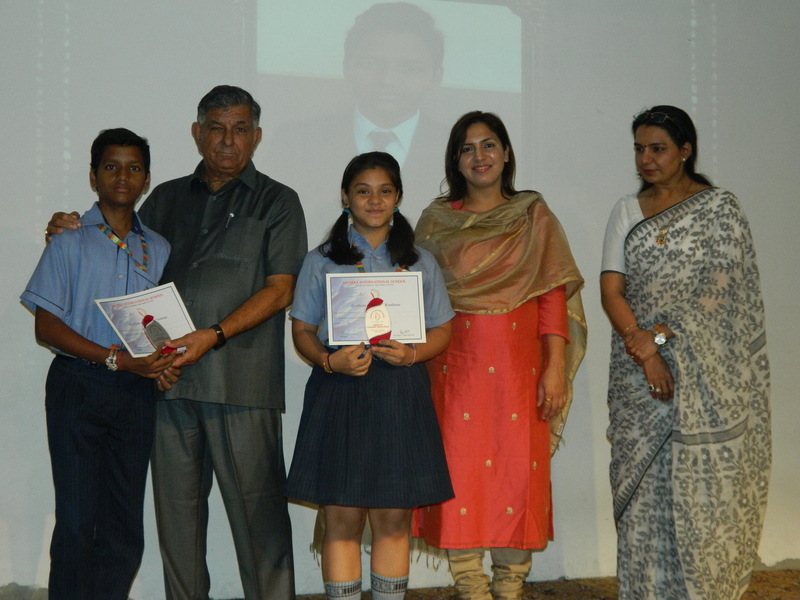 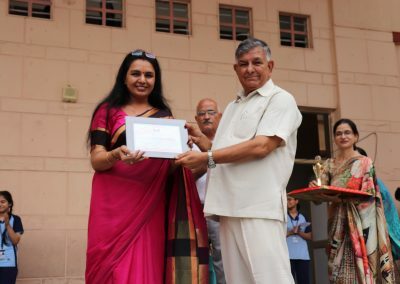 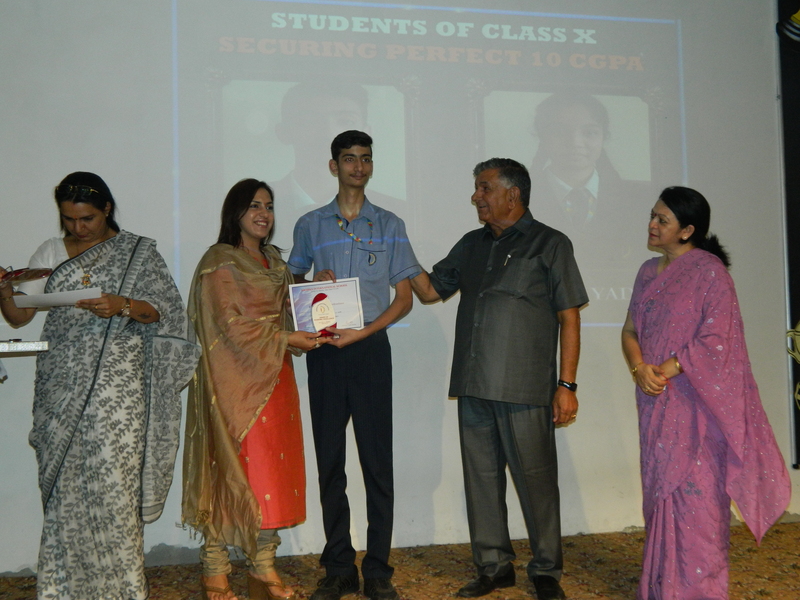 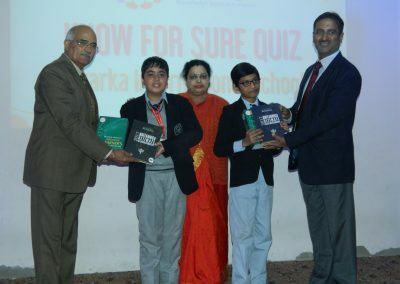 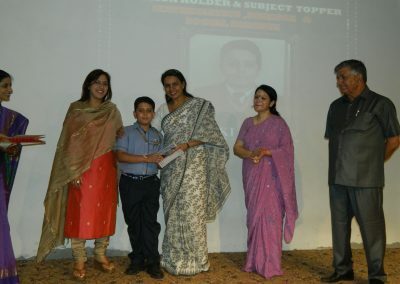 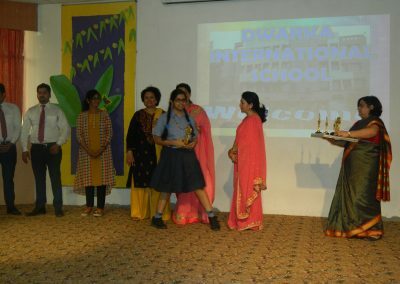 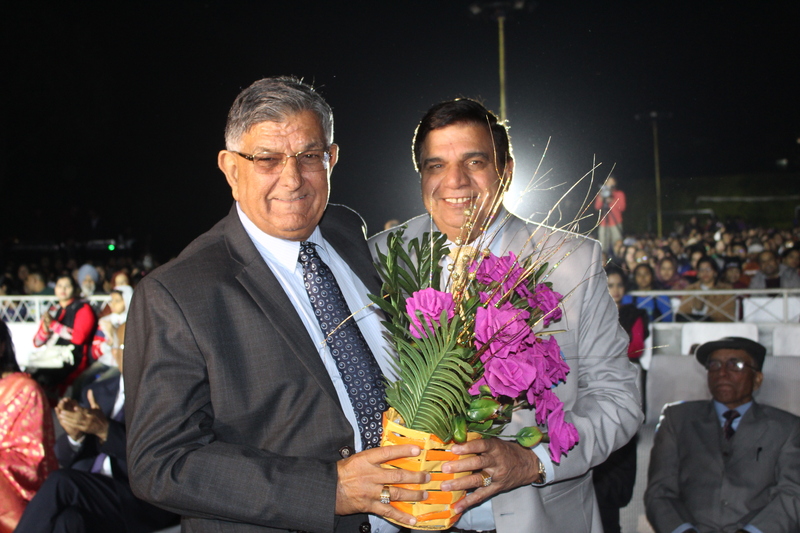 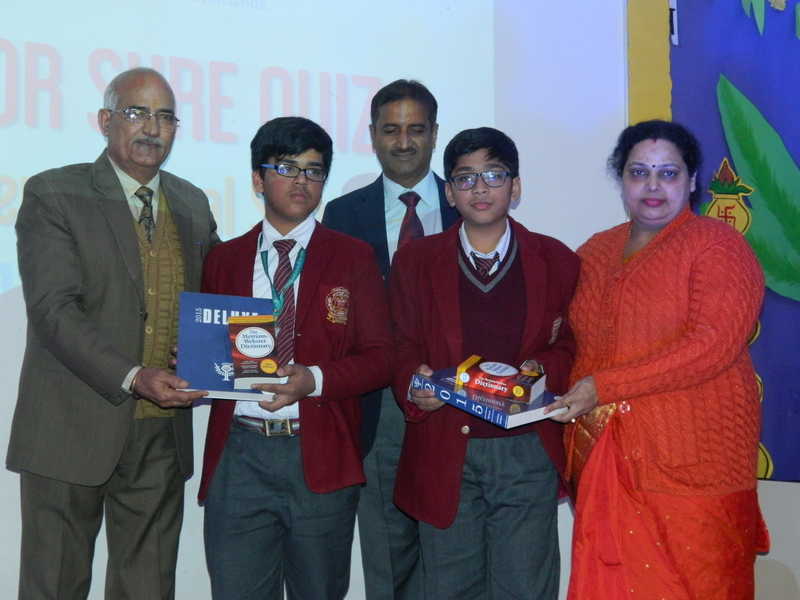 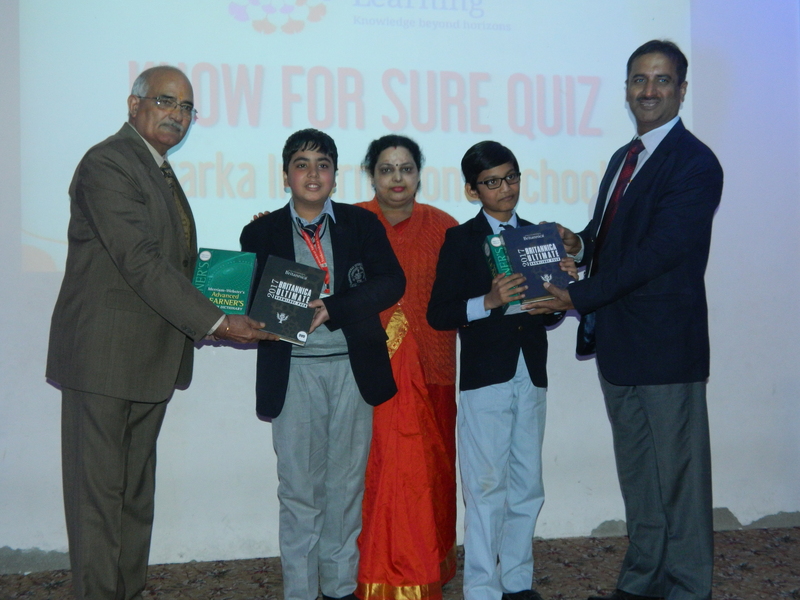 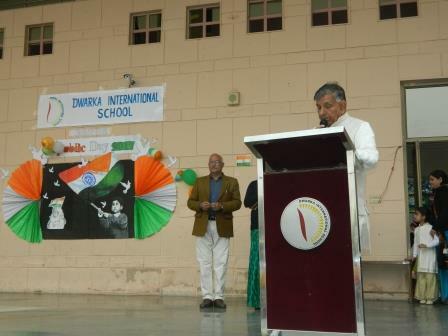 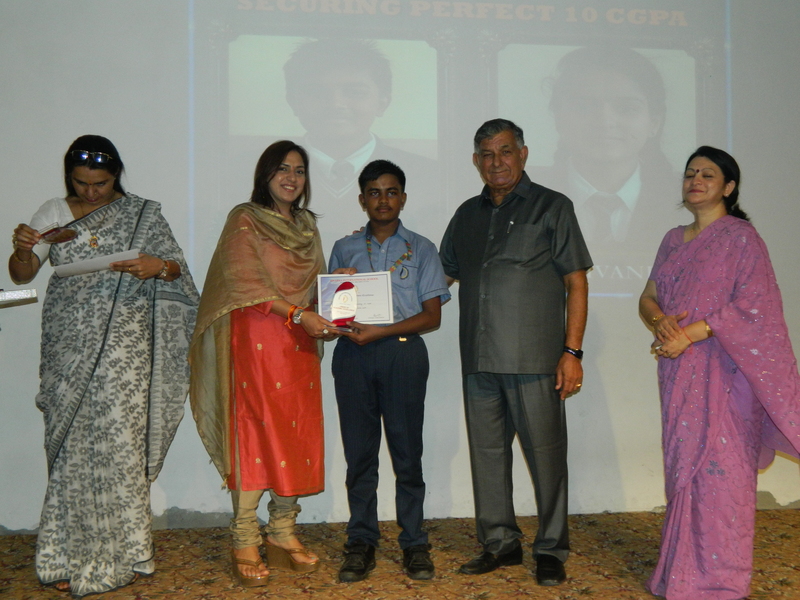 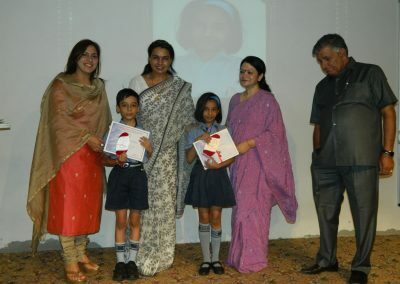 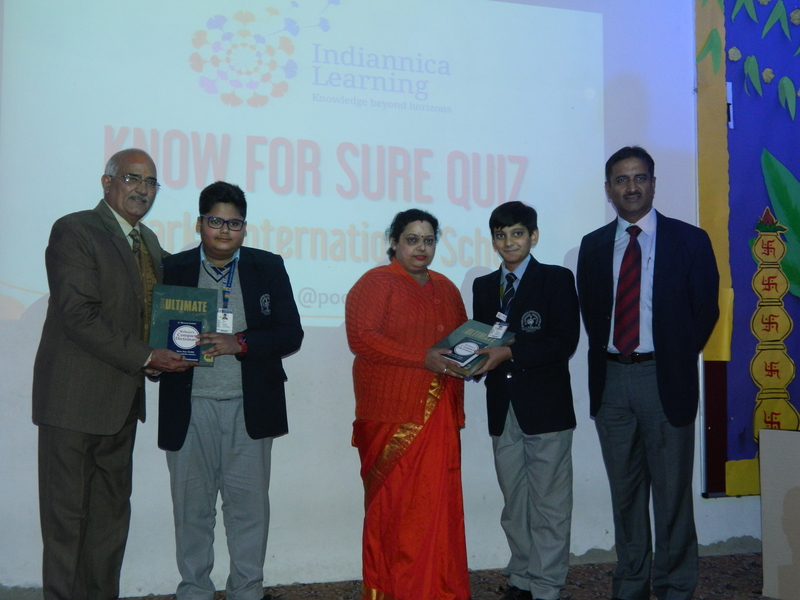 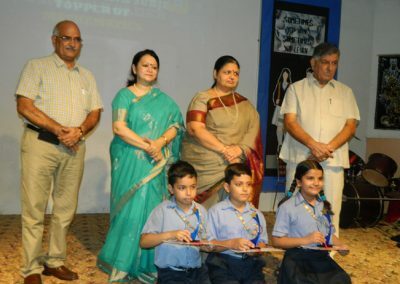 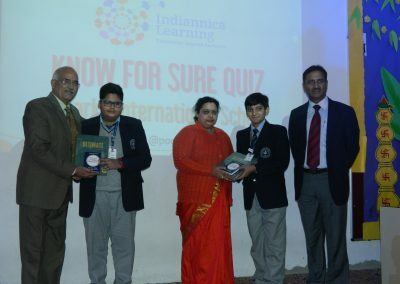 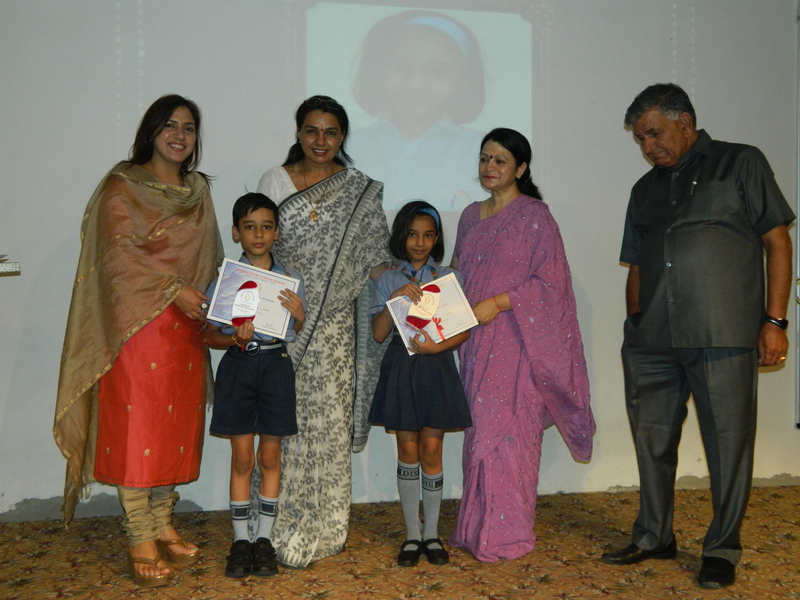 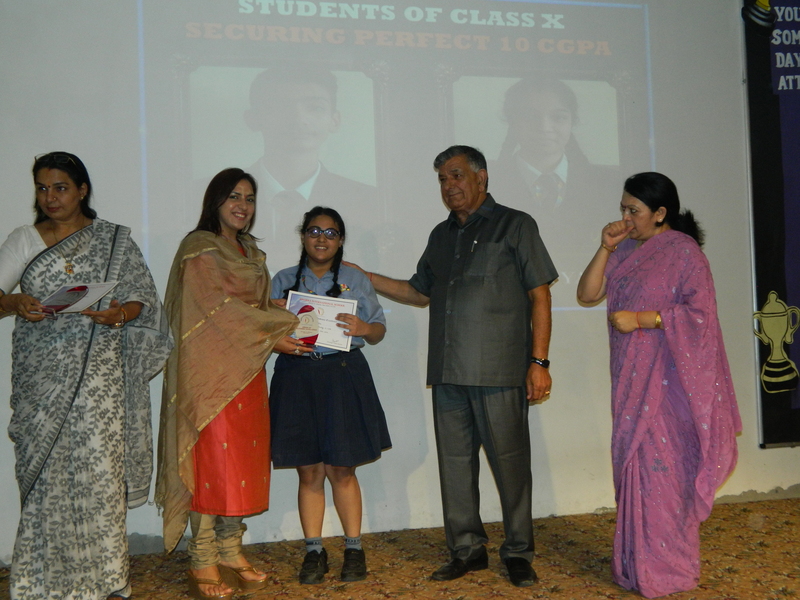 The Management as well as the Principal lauded the efforts of the students and staff. 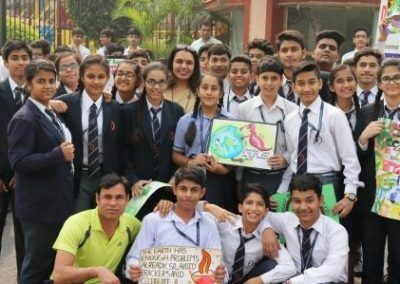 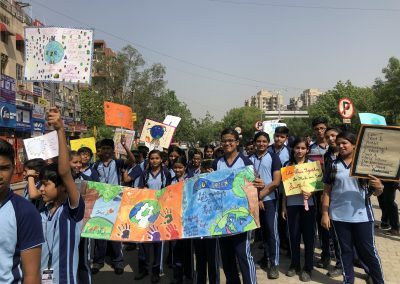 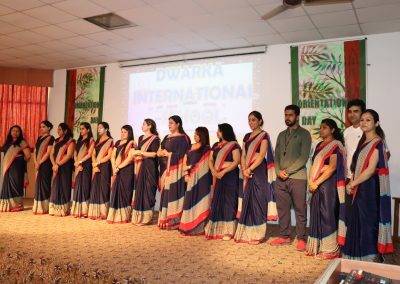 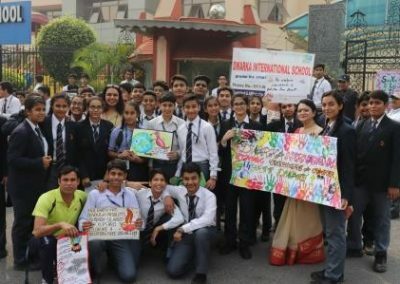 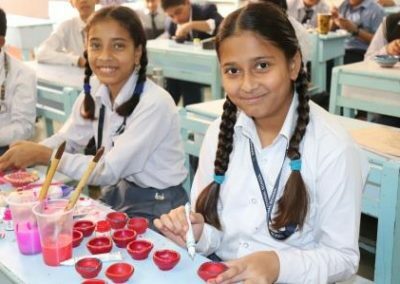 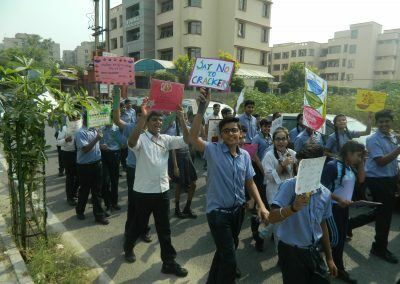 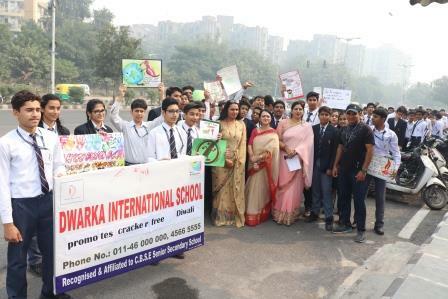 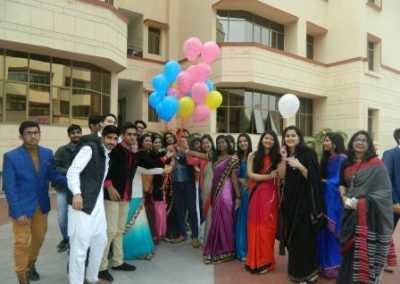 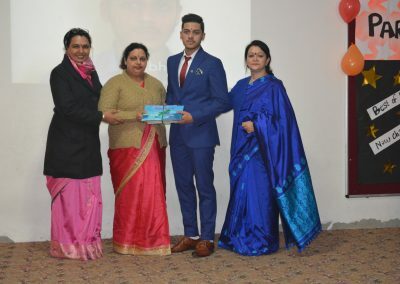 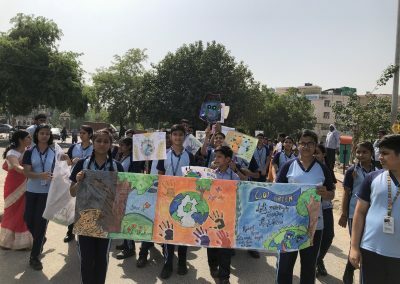 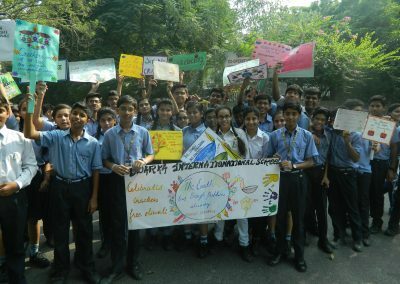 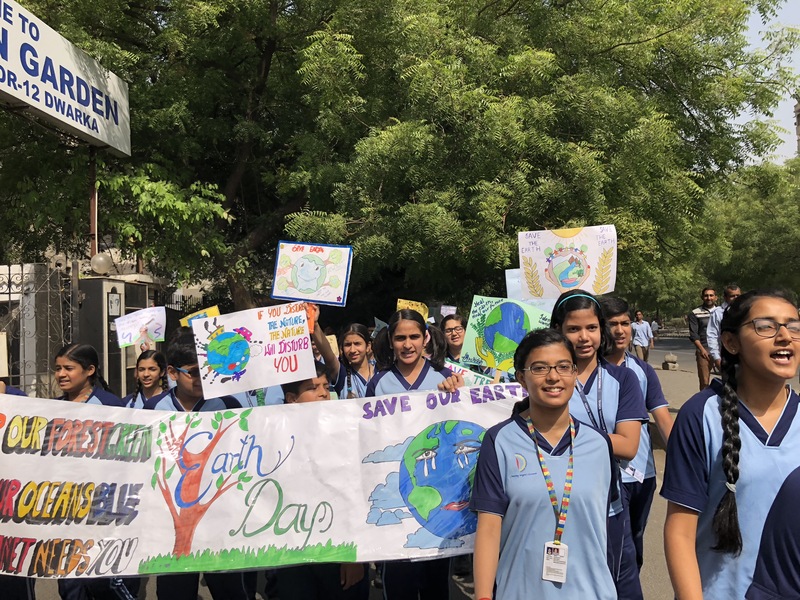 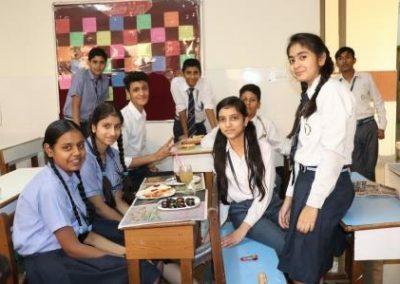 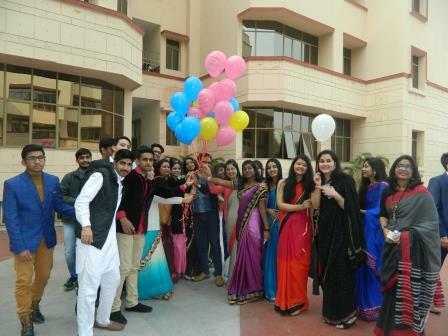 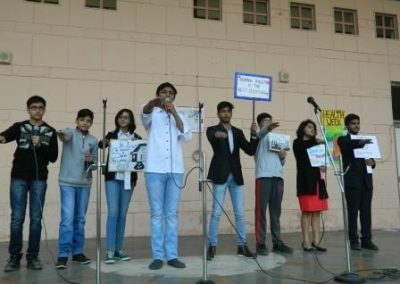 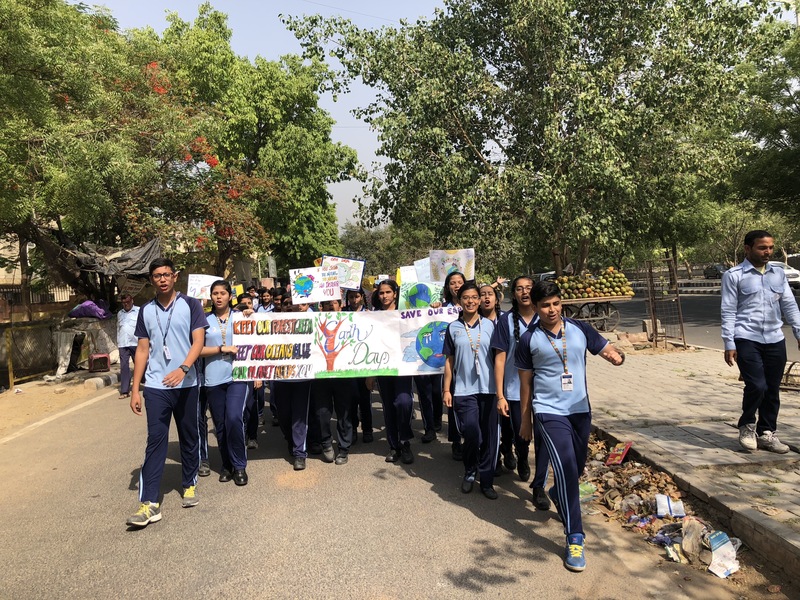 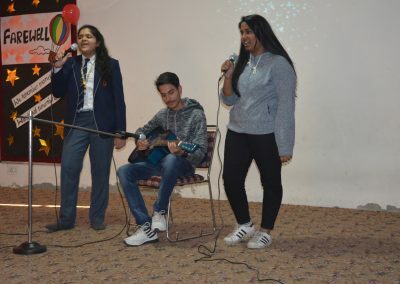 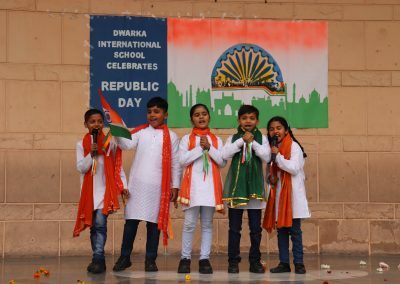 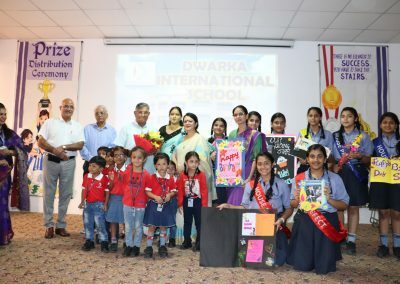 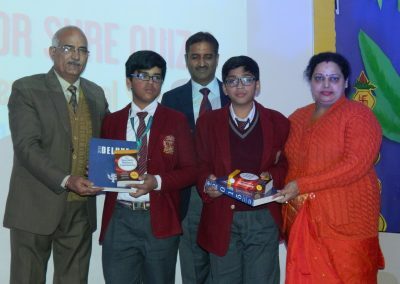 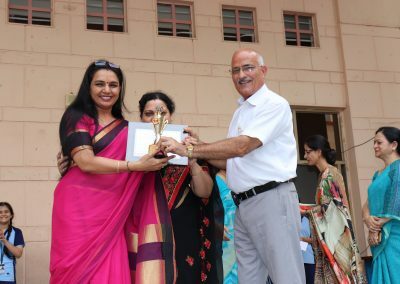 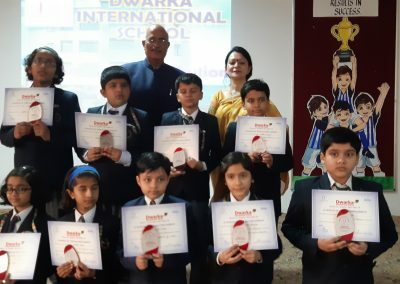 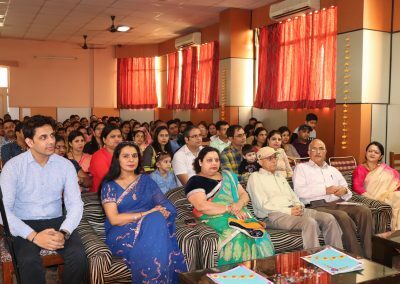 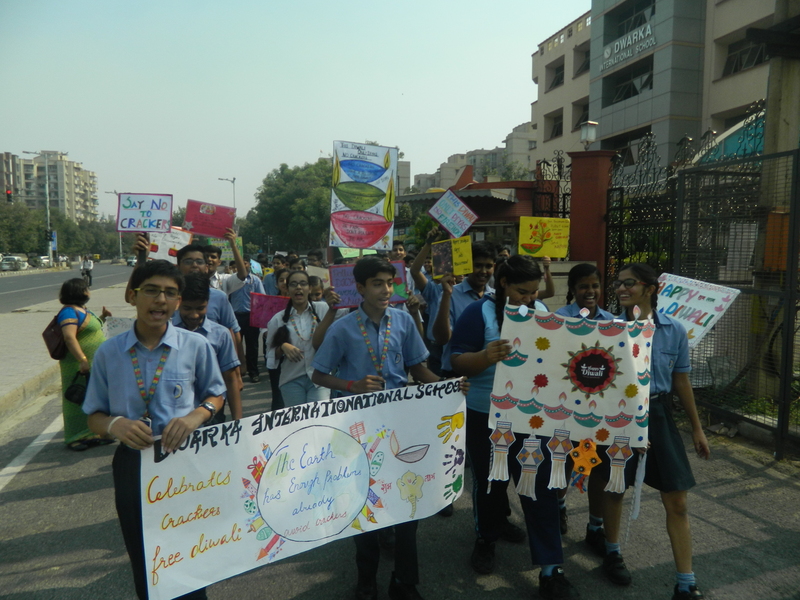 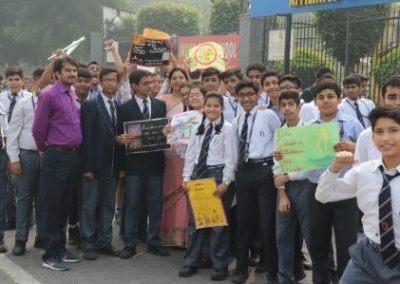 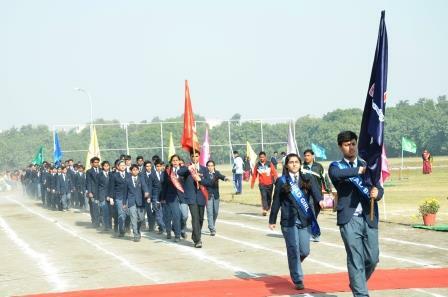 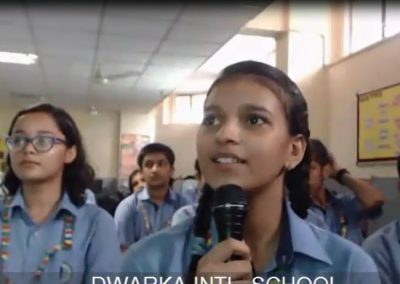 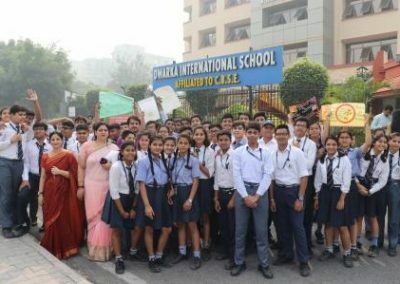 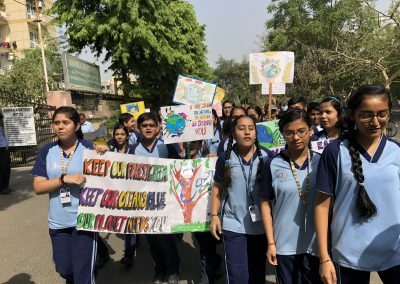 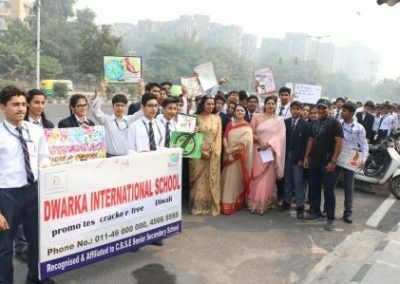 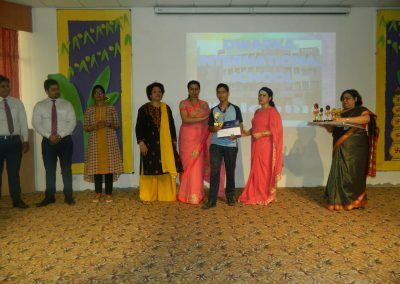 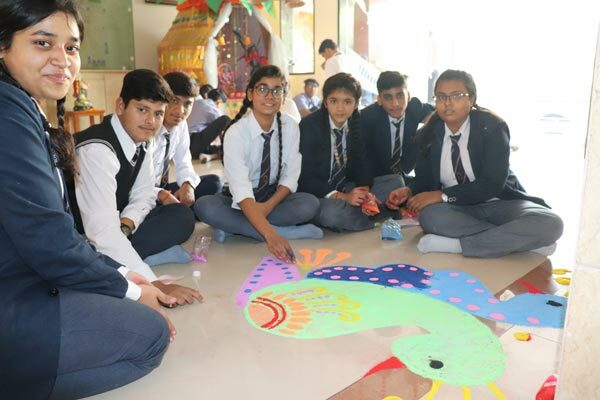 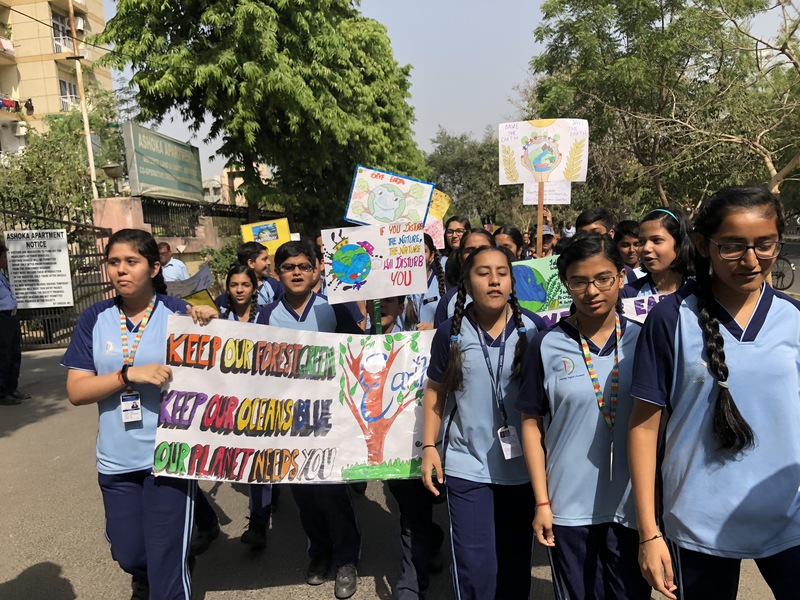 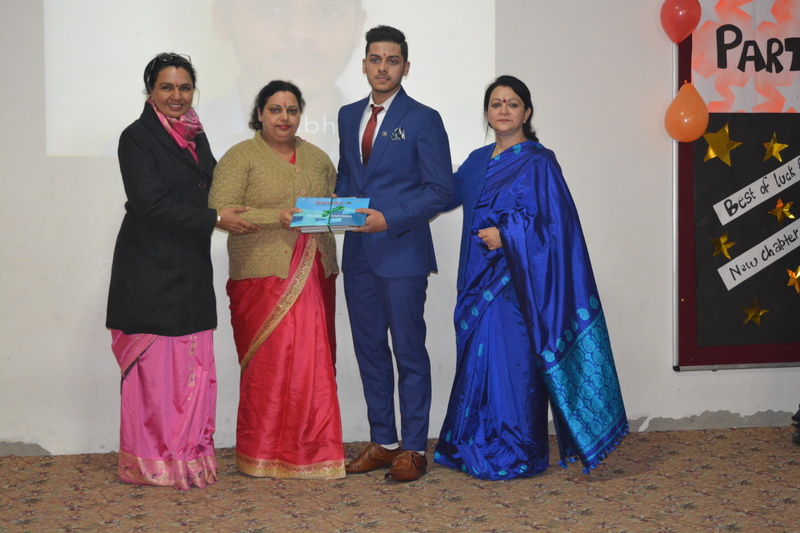 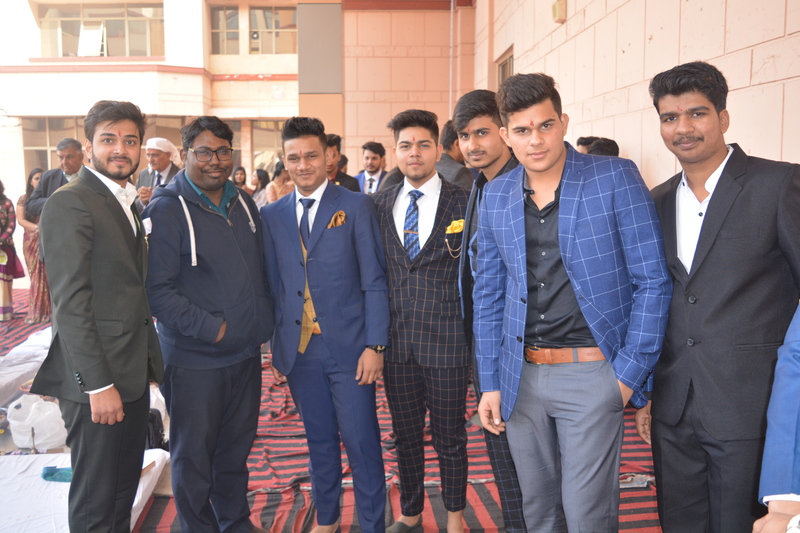 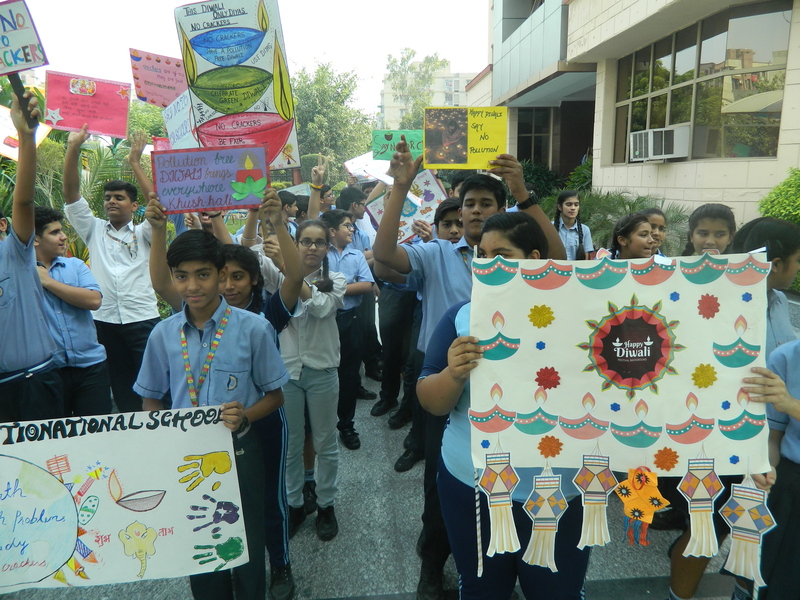 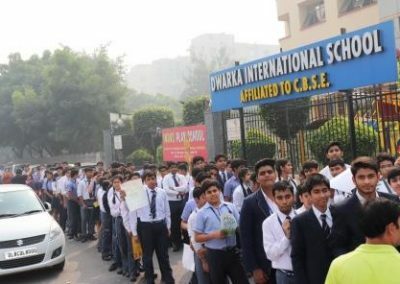 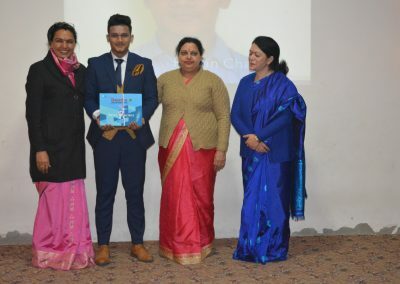 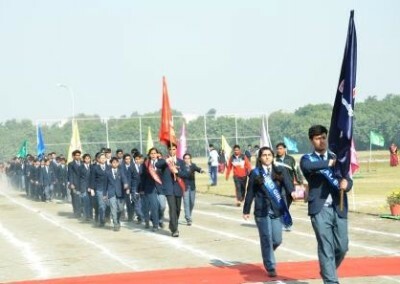 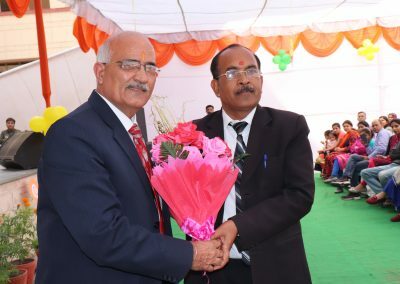 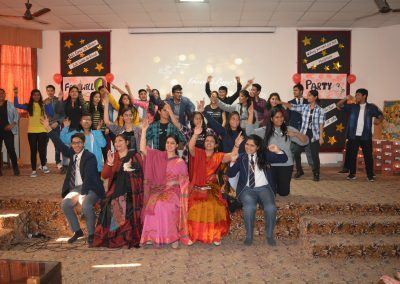 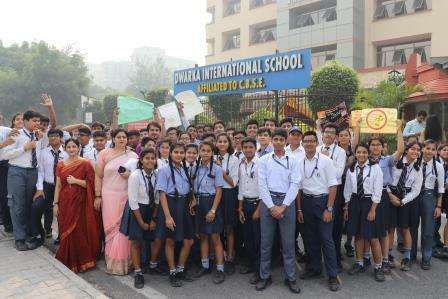 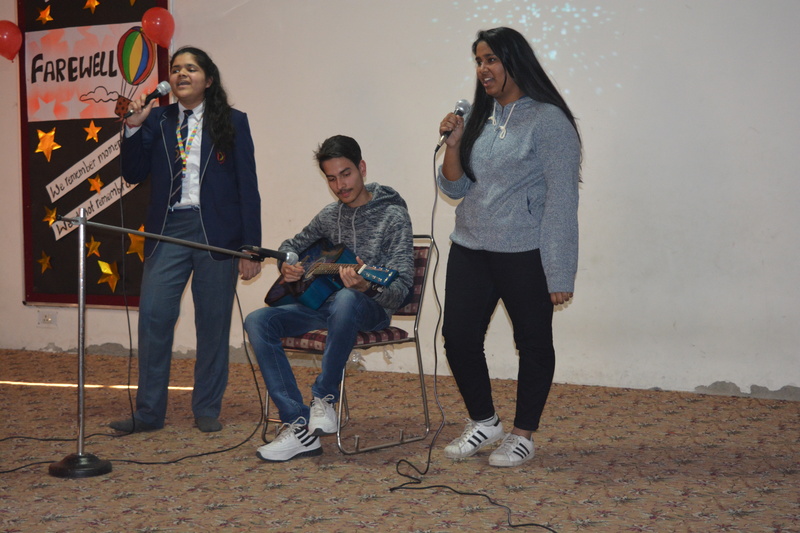 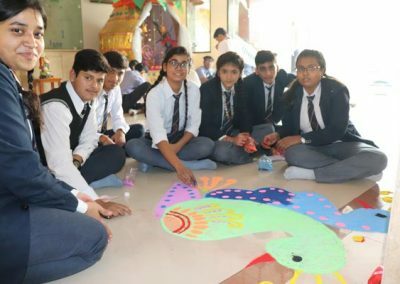 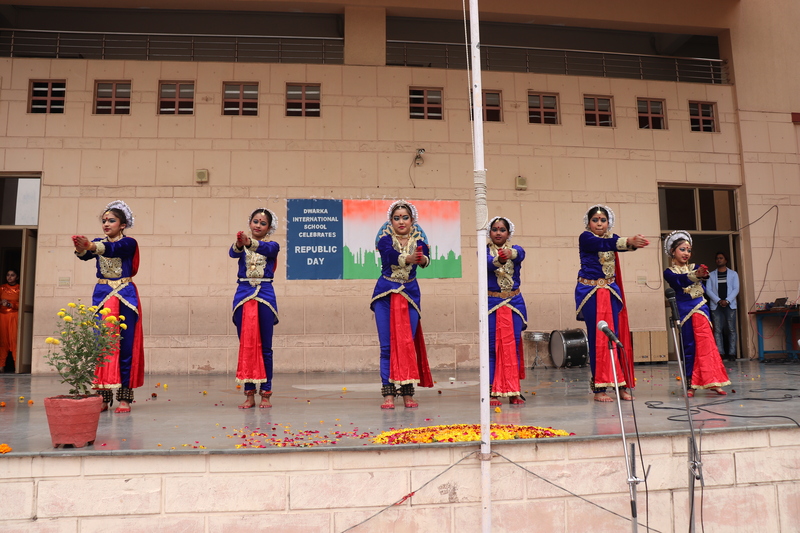 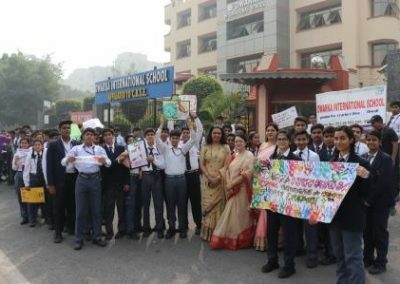 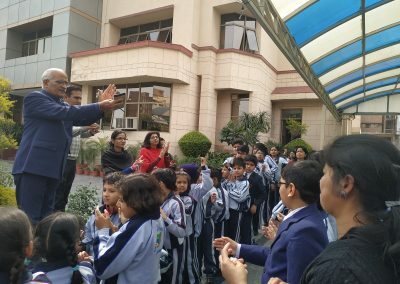 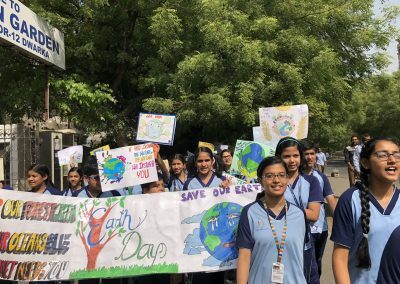 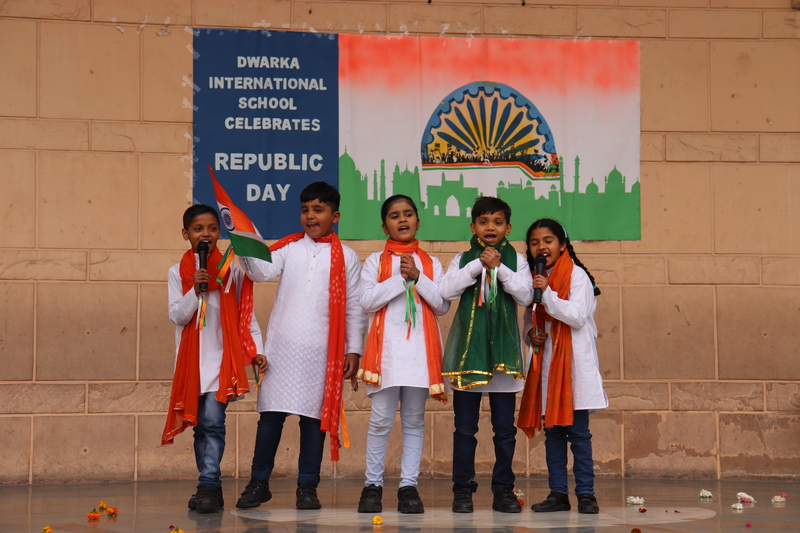 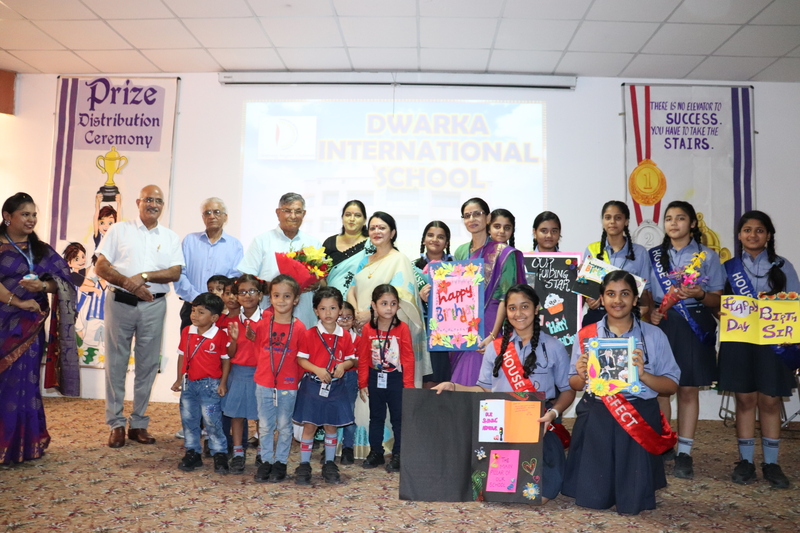 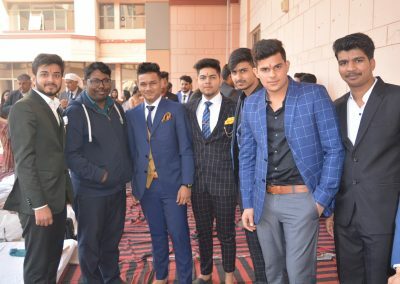 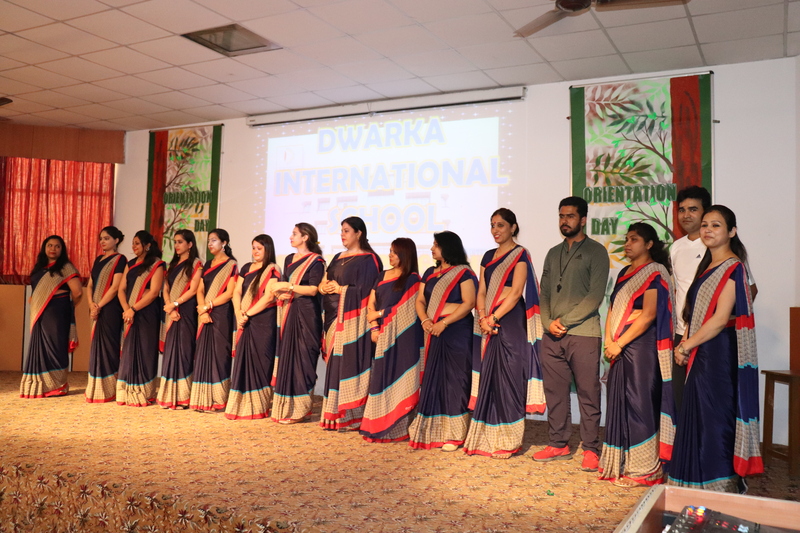 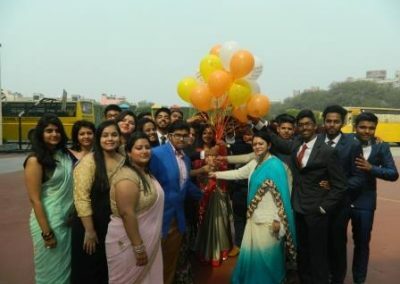 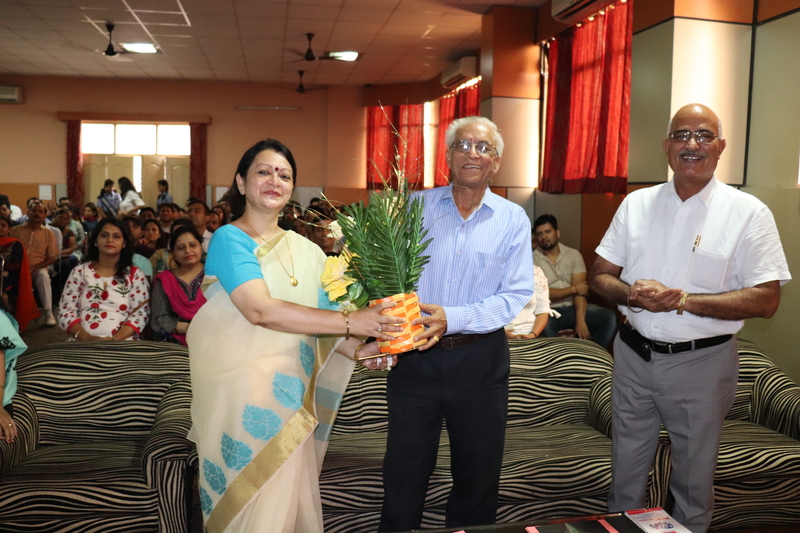 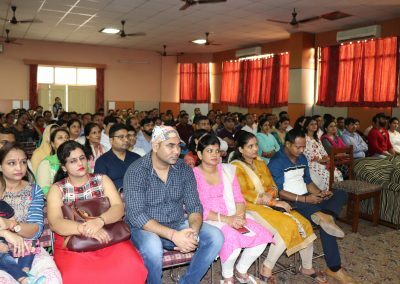 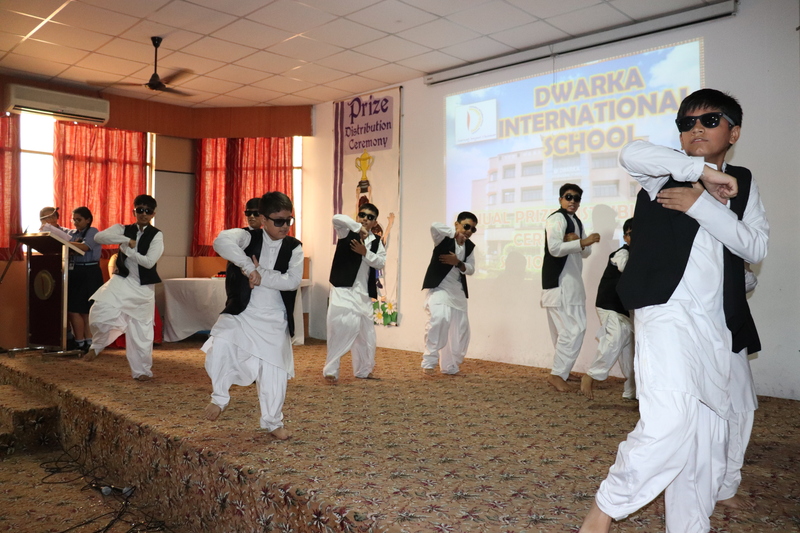 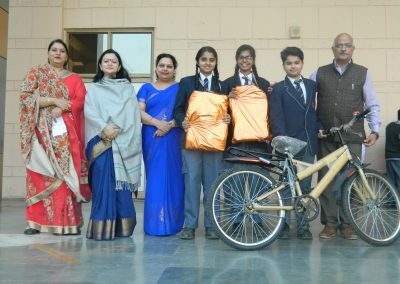 The students, staff and management of Dwarka International School bid adieu to class XII students on Saturday 2nd February, 2019. 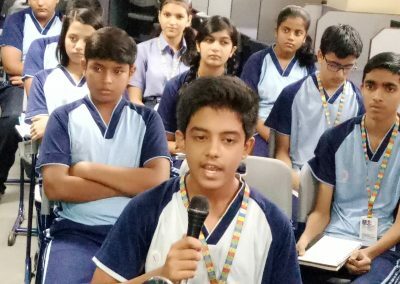 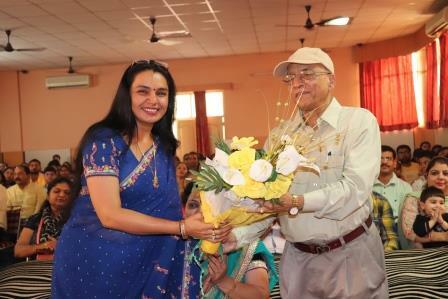 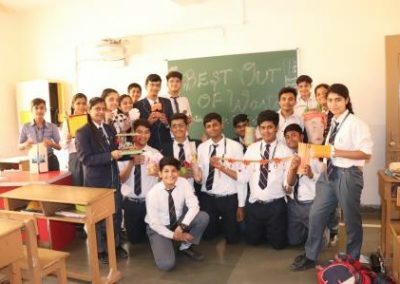 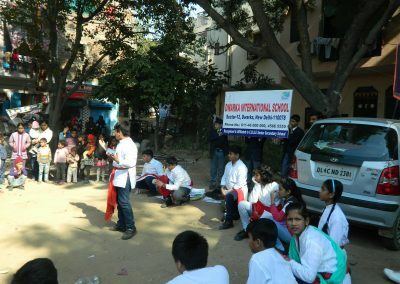 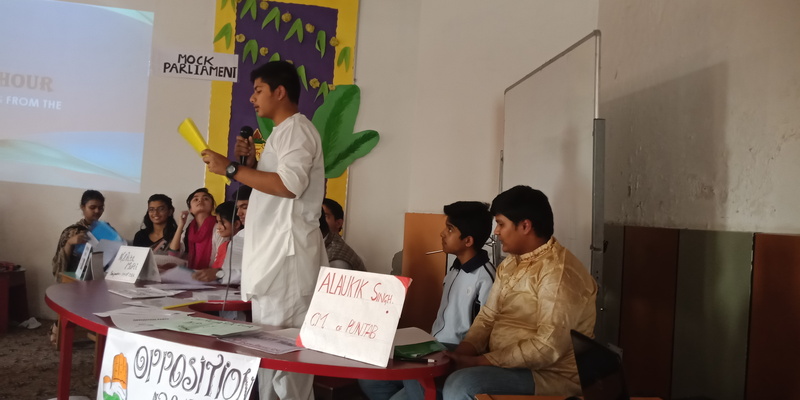 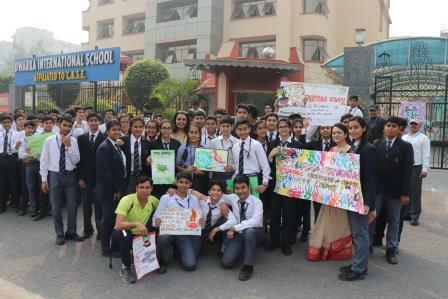 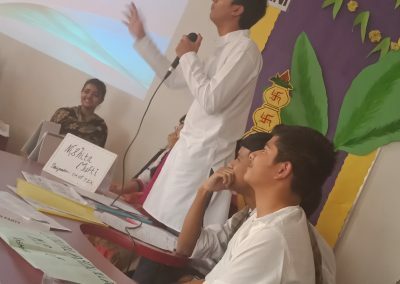 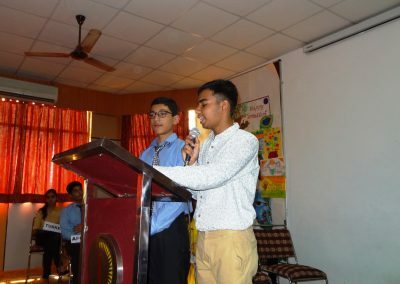 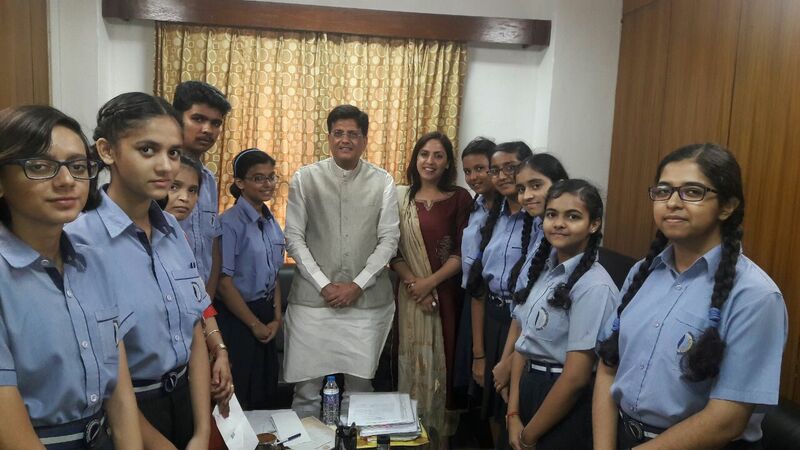 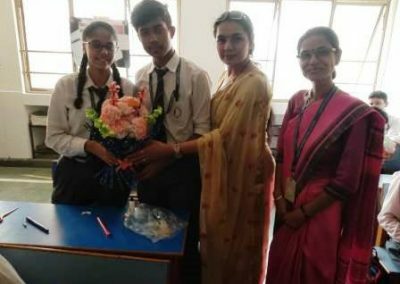 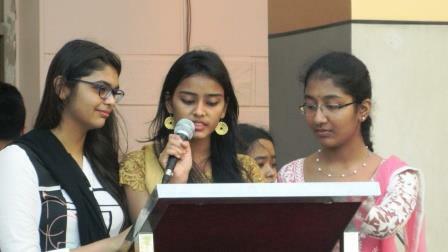 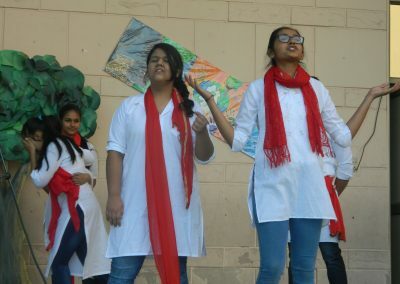 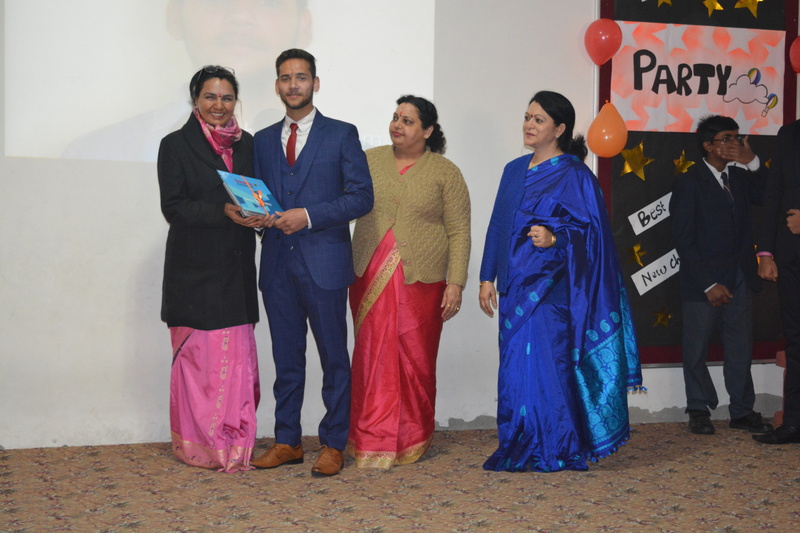 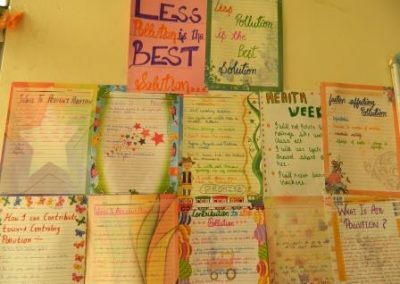 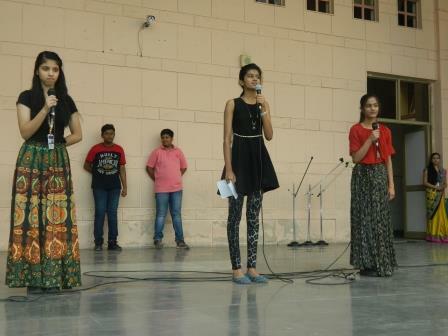 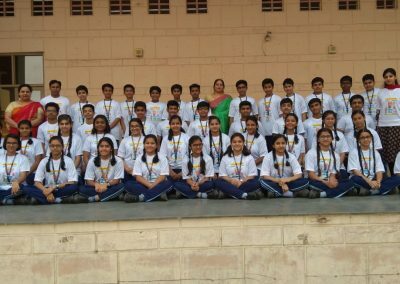 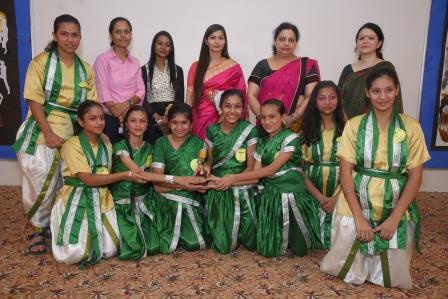 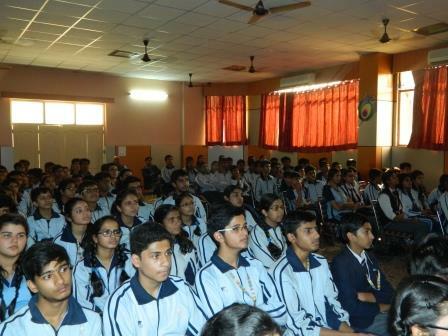 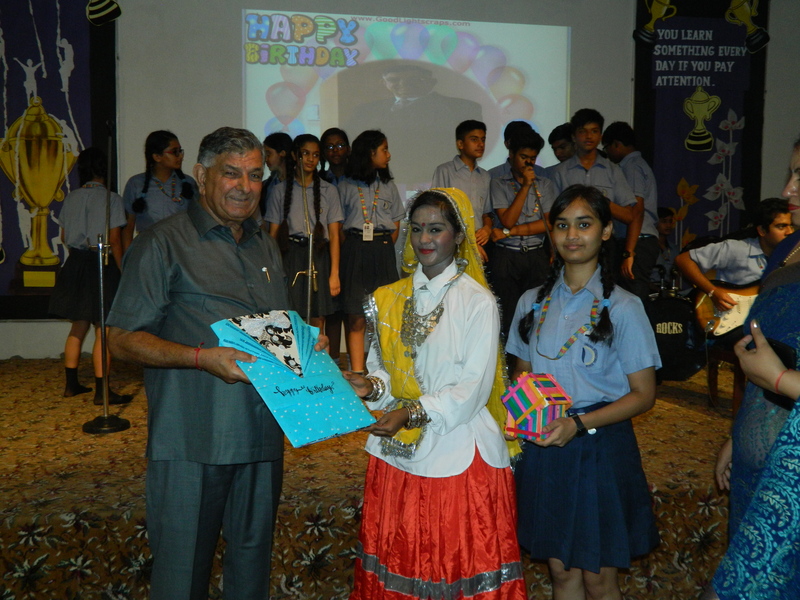 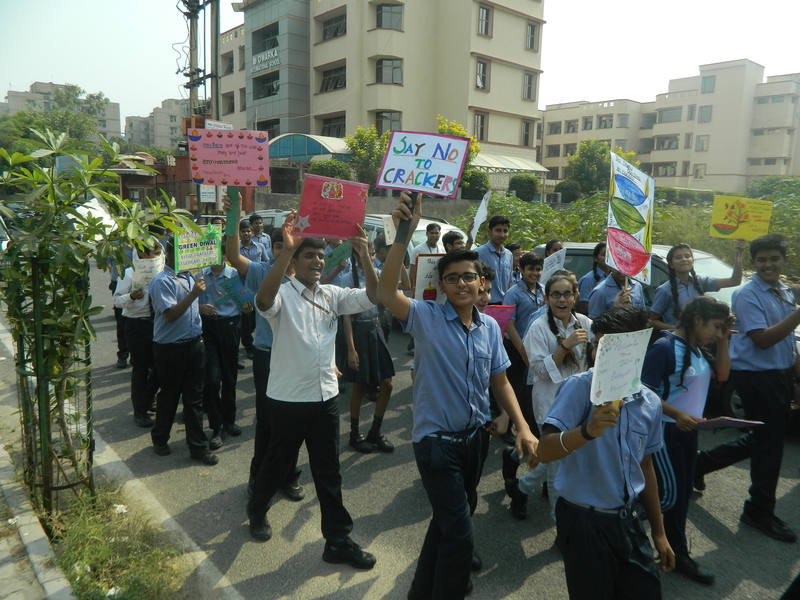 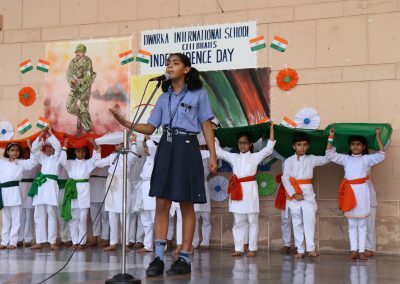 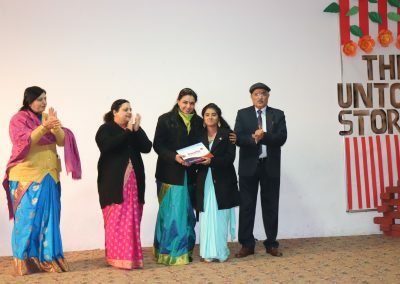 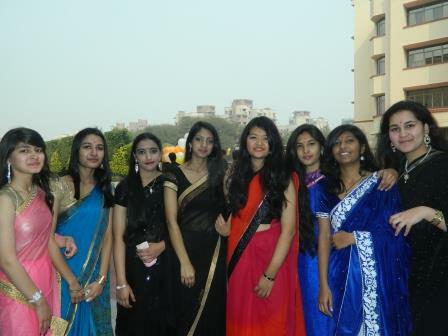 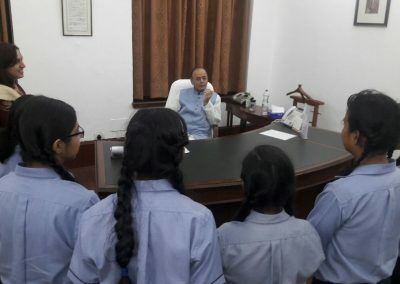 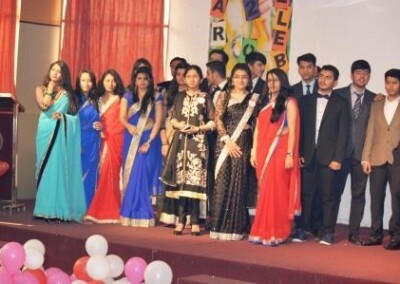 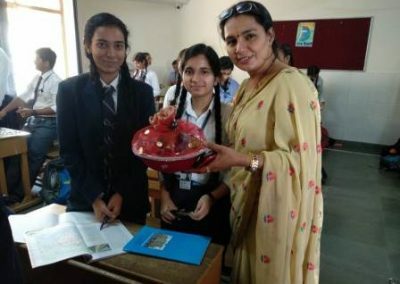 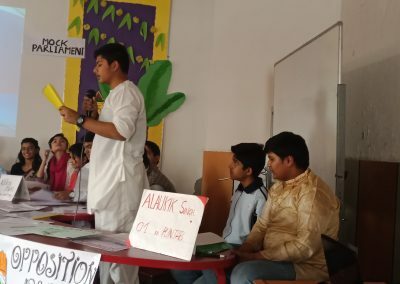 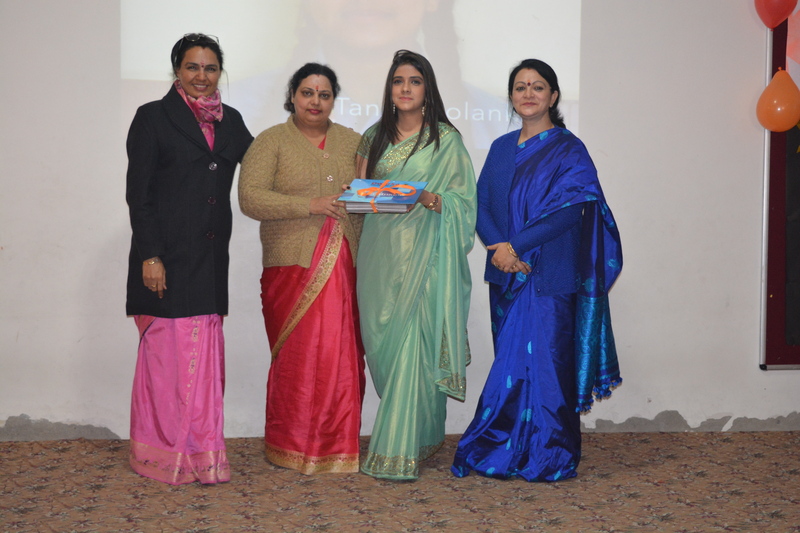 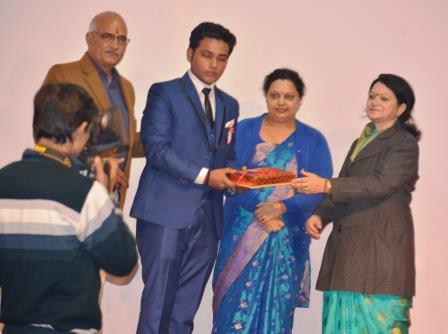 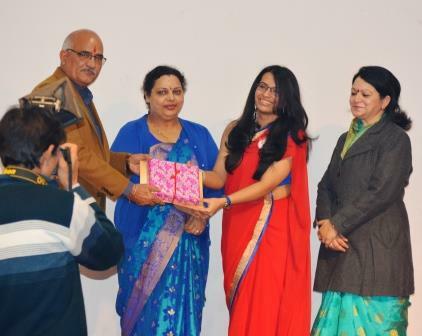 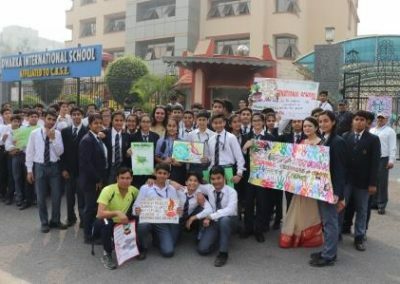 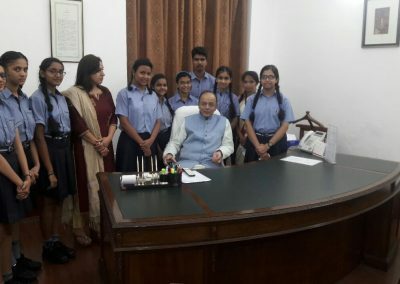 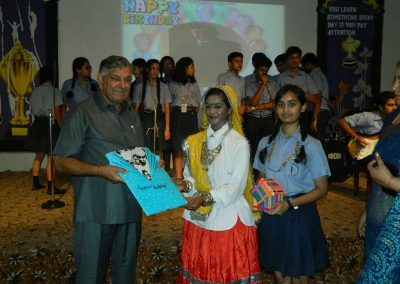 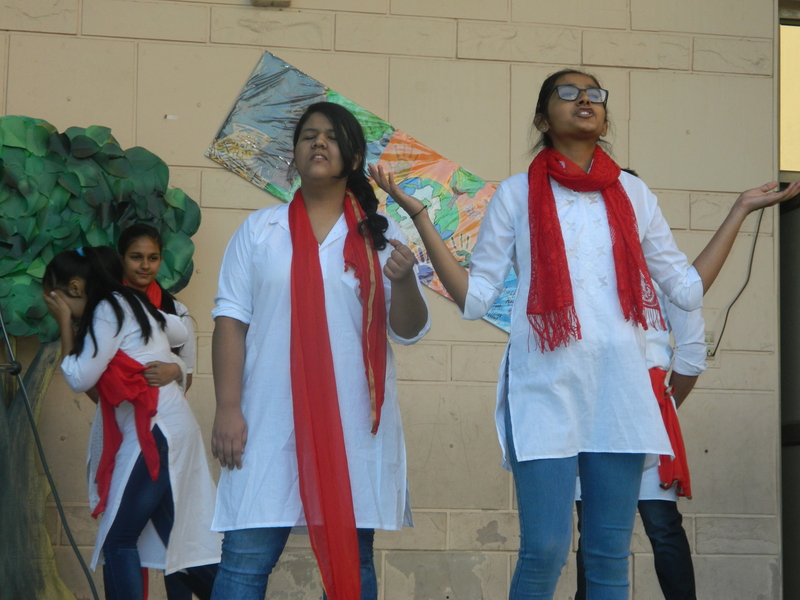 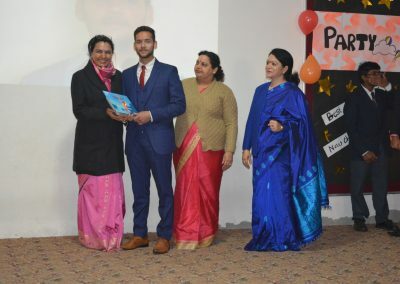 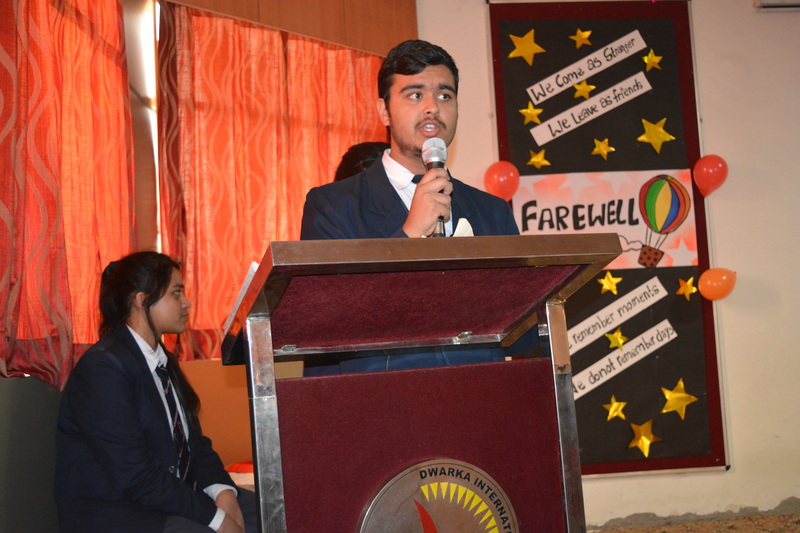 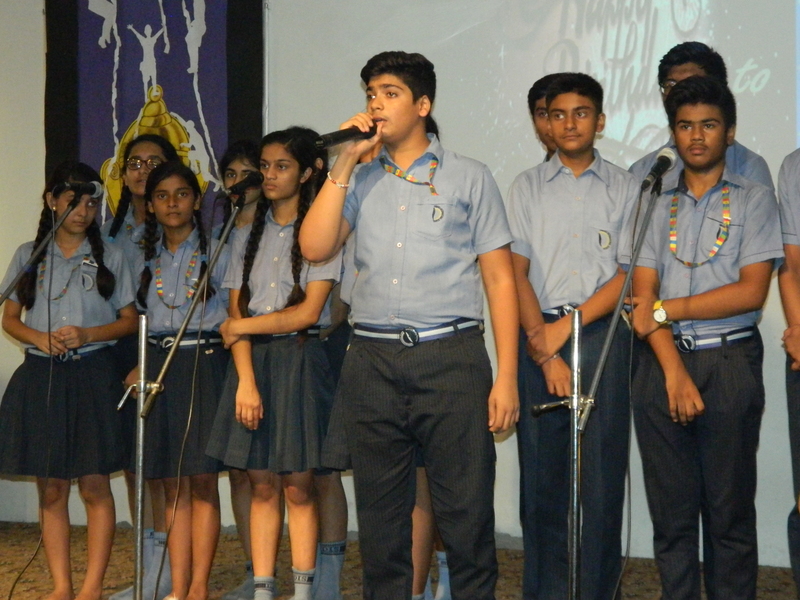 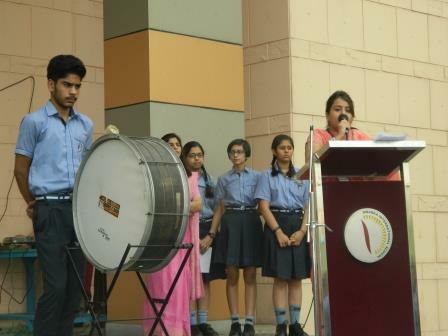 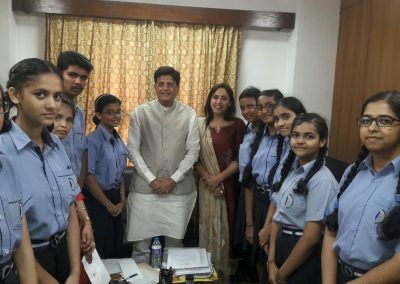 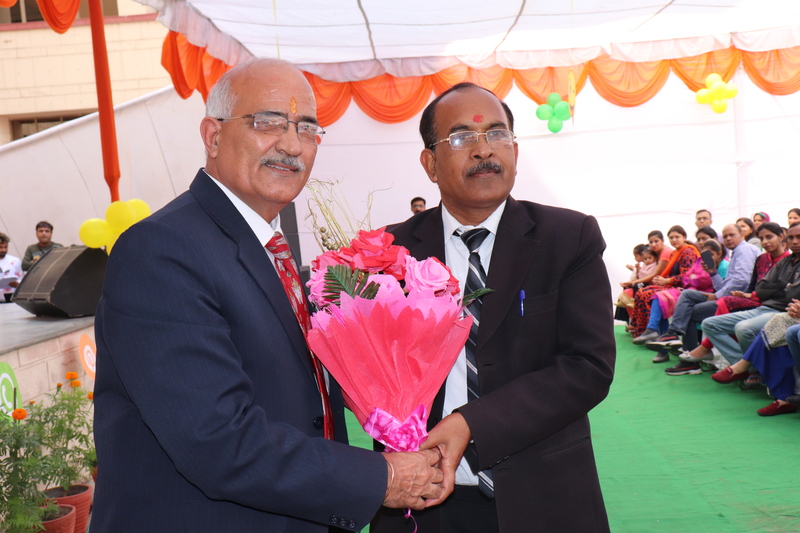 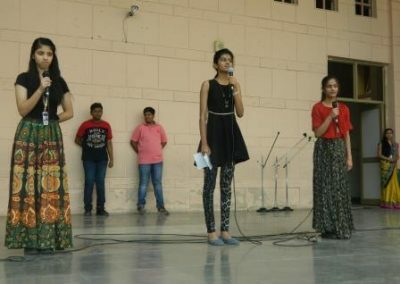 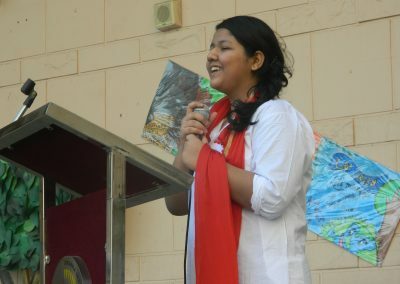 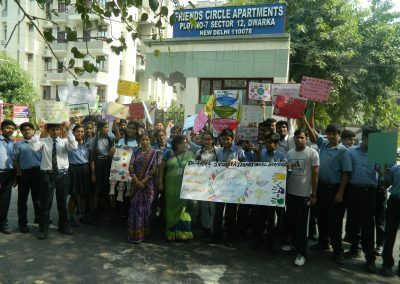 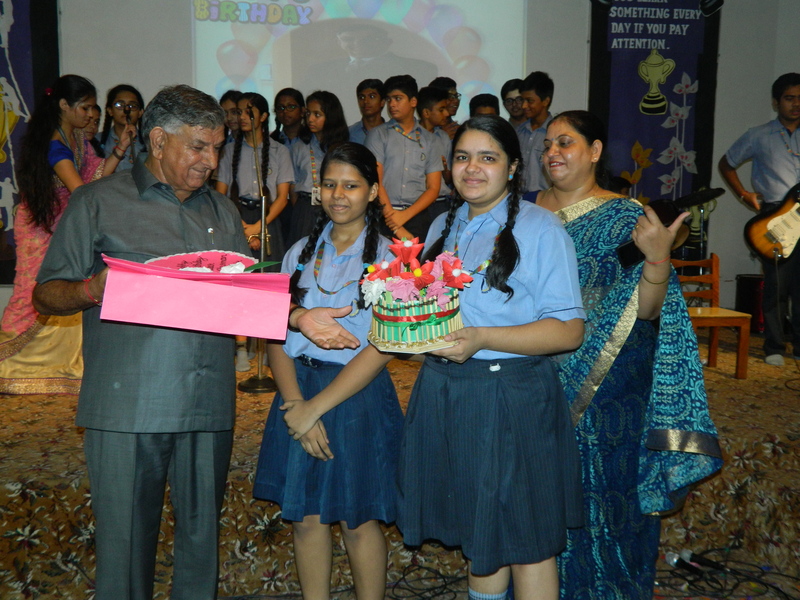 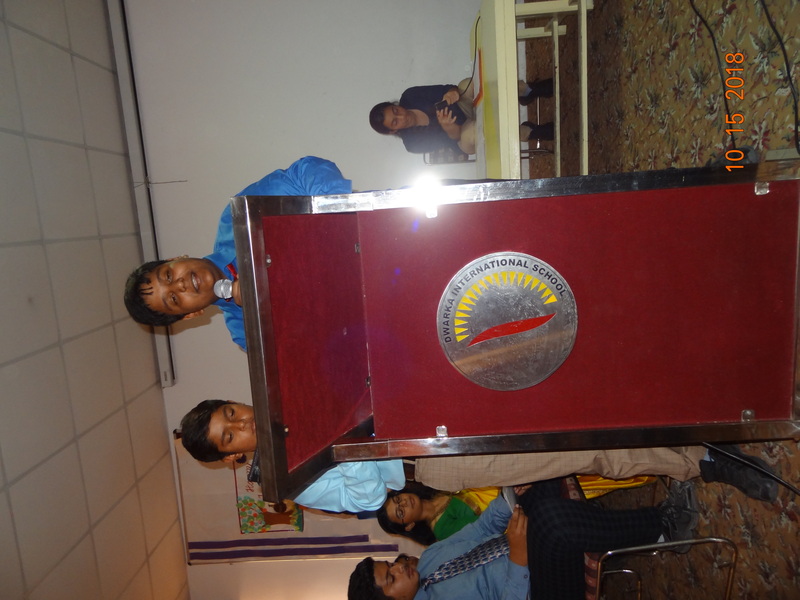 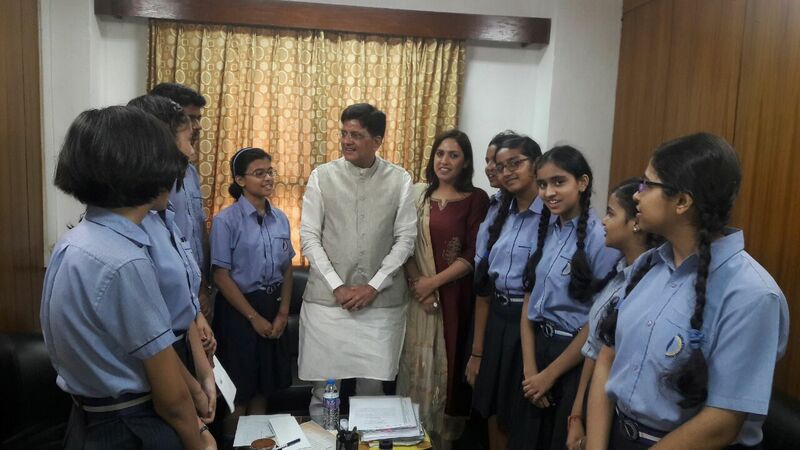 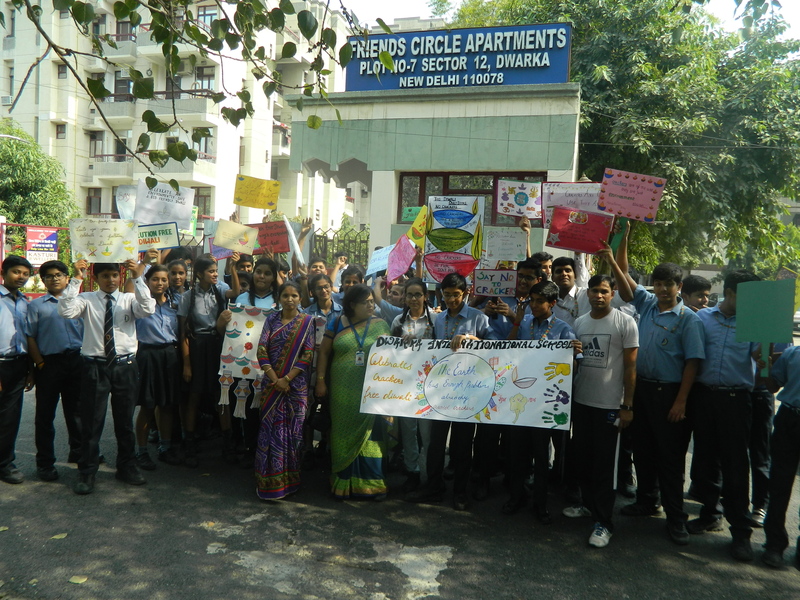 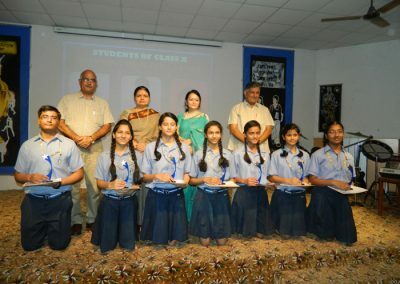 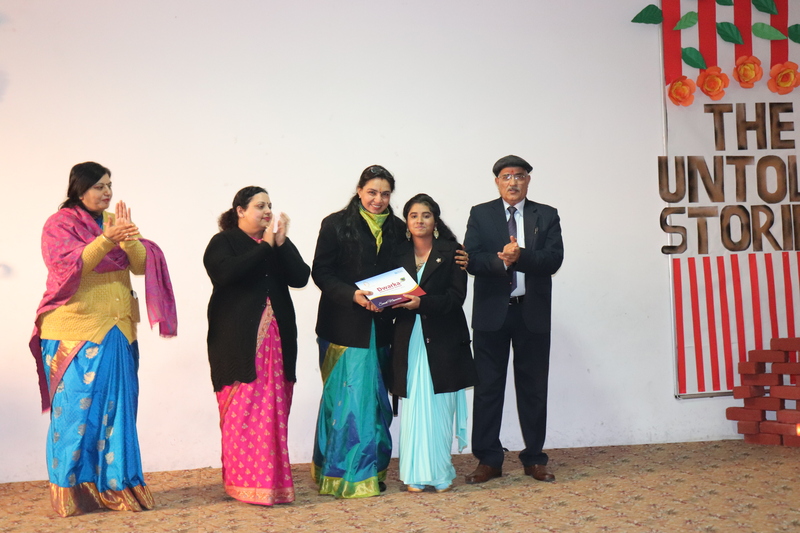 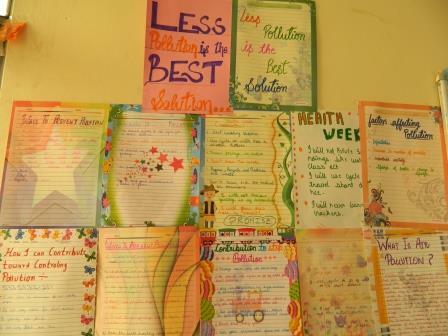 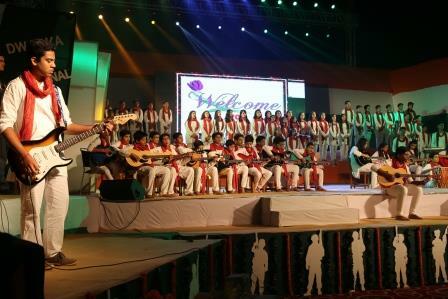 The farewell ceremony was organised by class XI students, who gave their best wishes to their seniors. 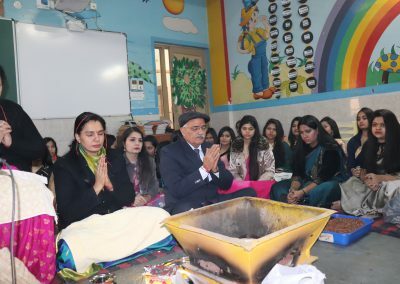 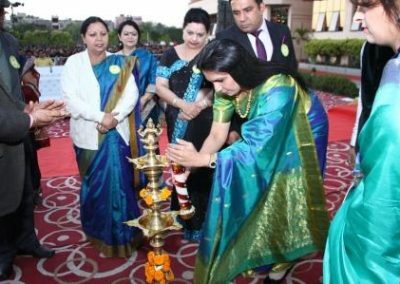 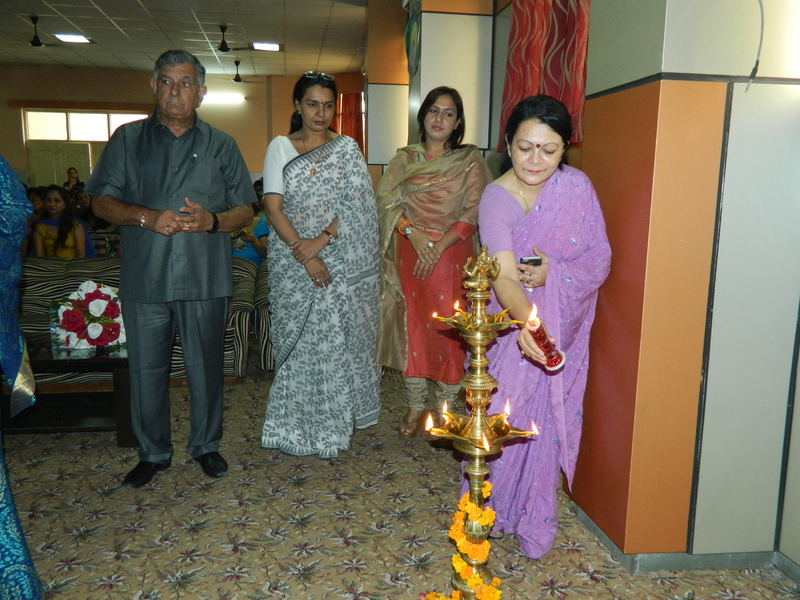 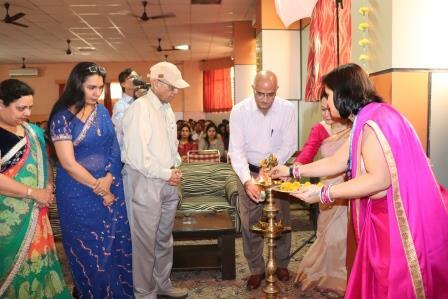 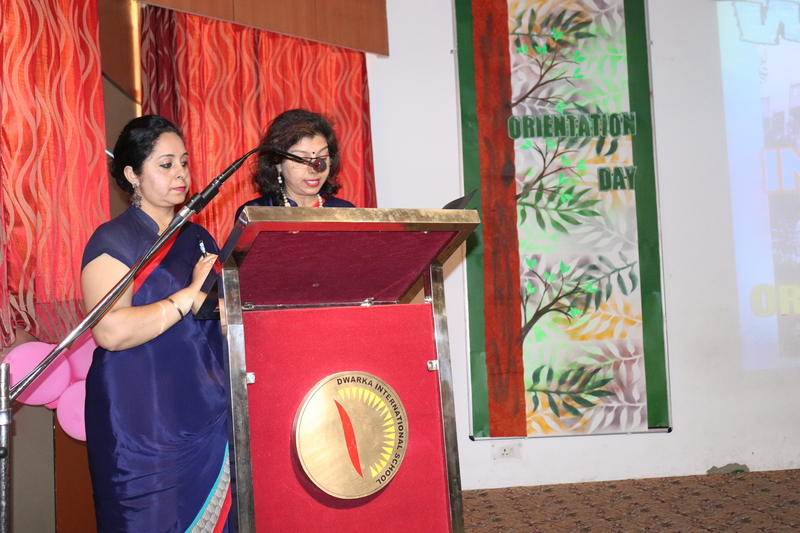 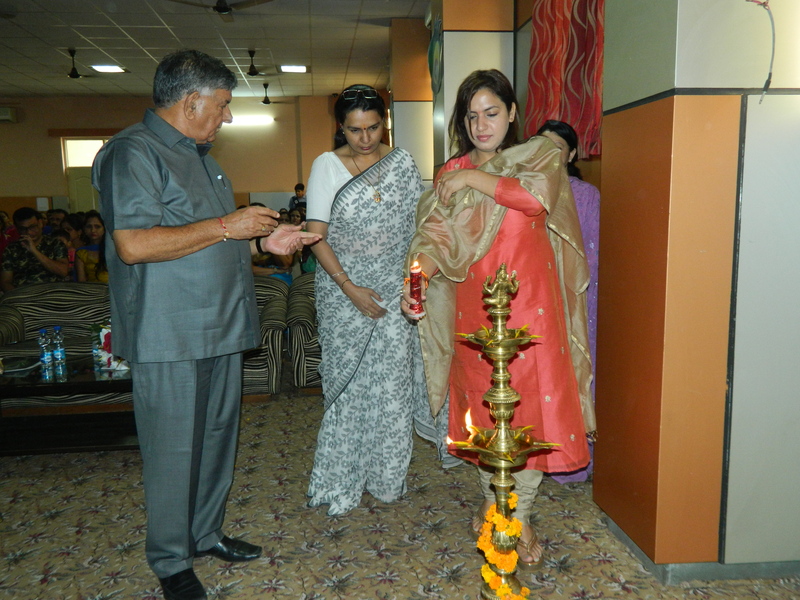 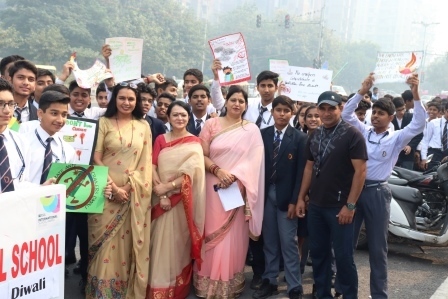 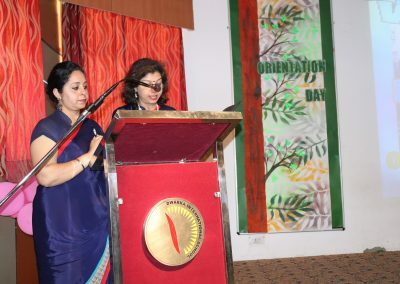 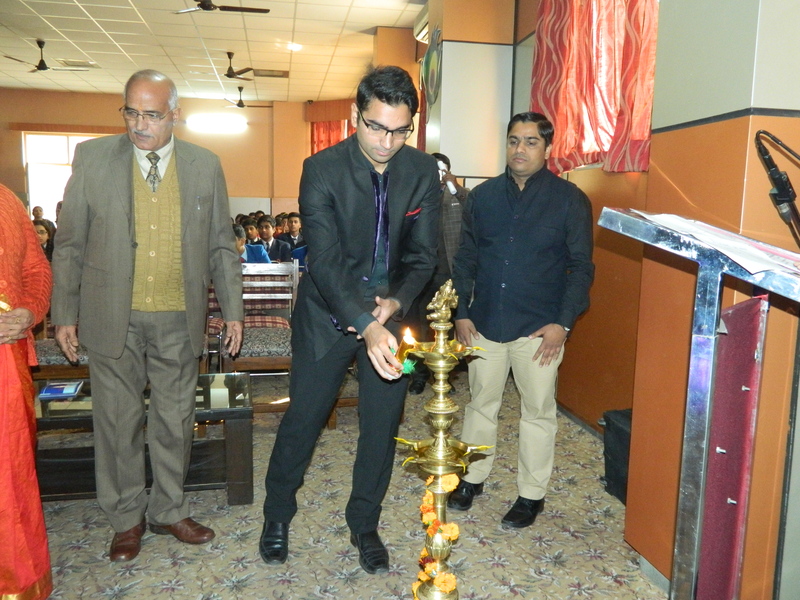 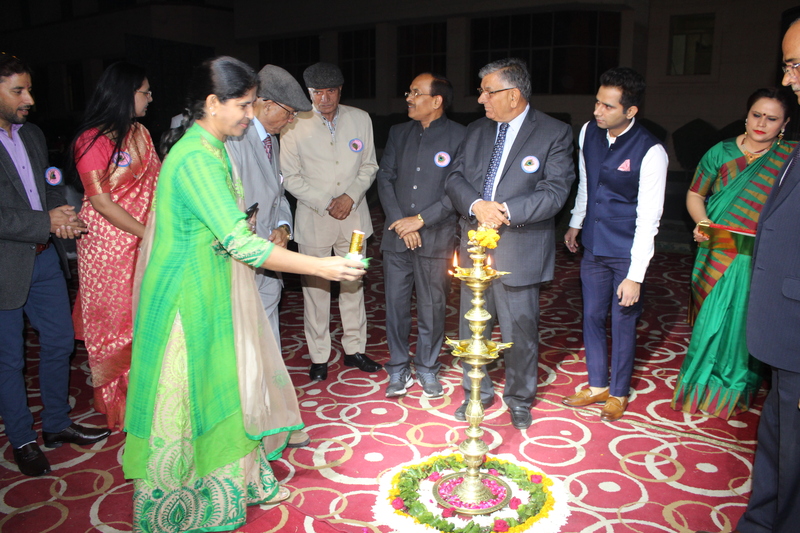 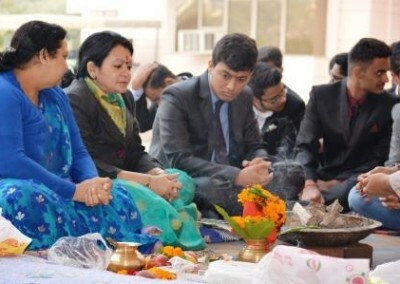 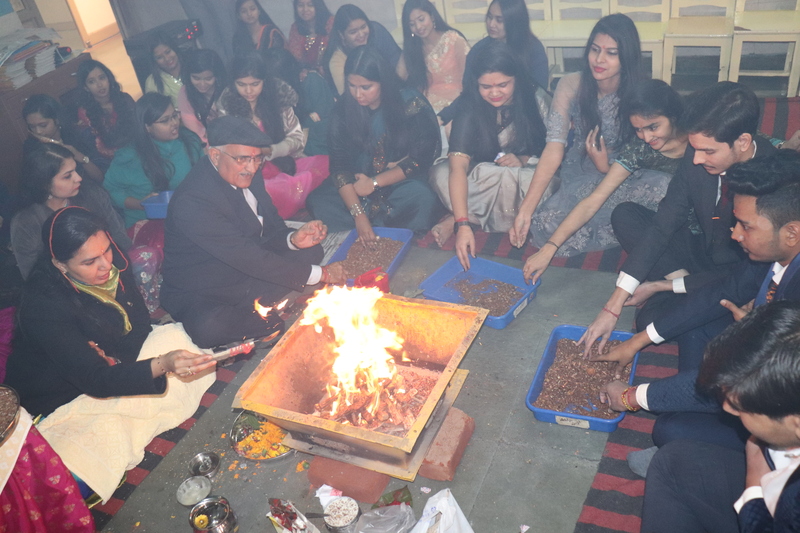 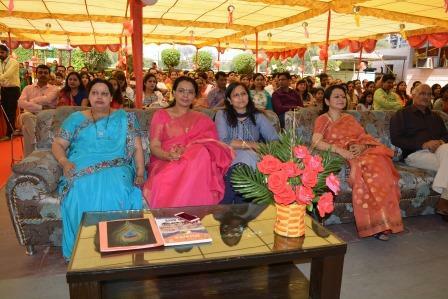 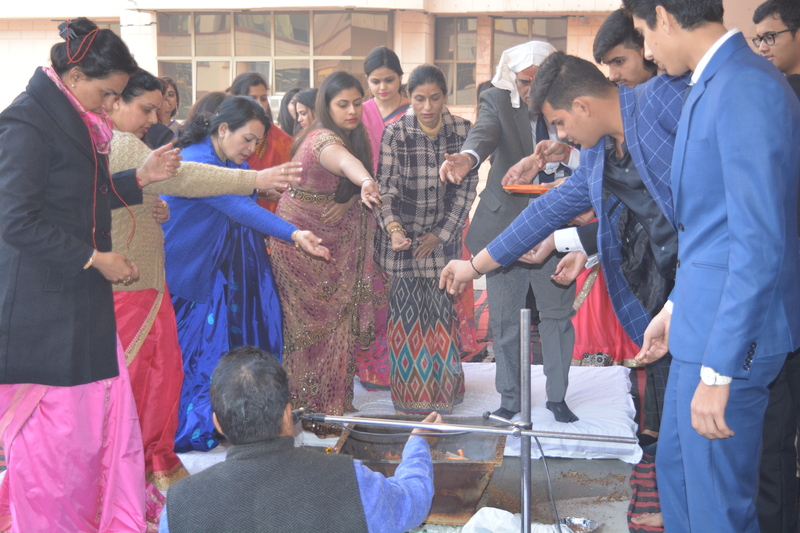 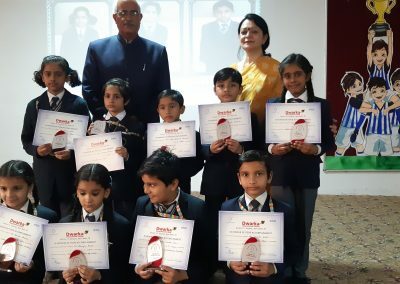 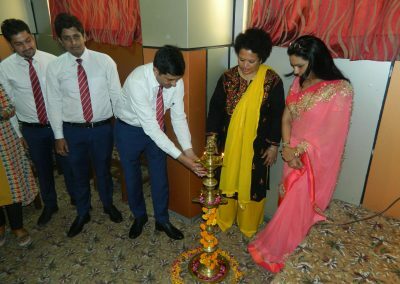 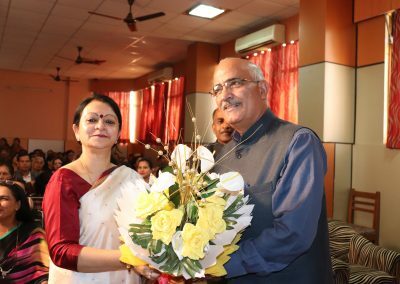 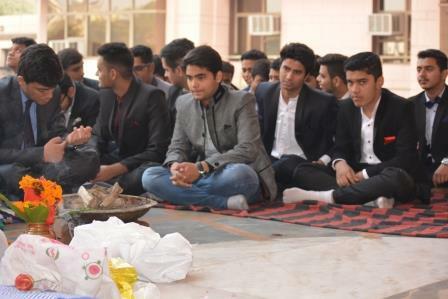 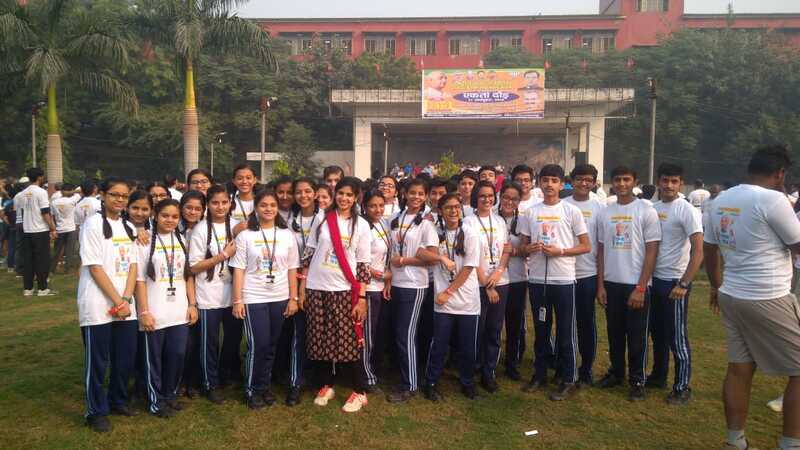 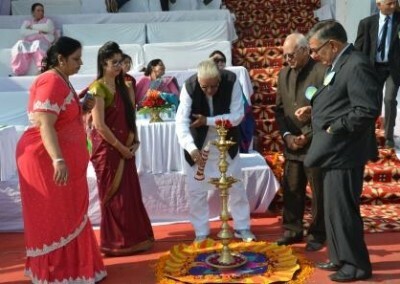 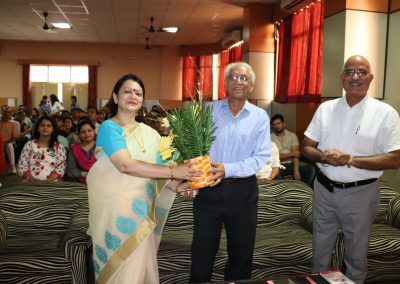 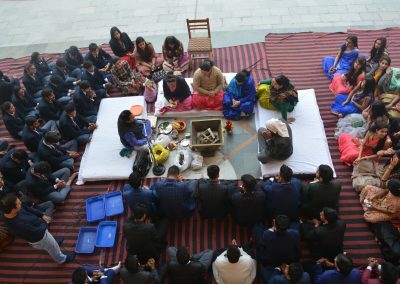 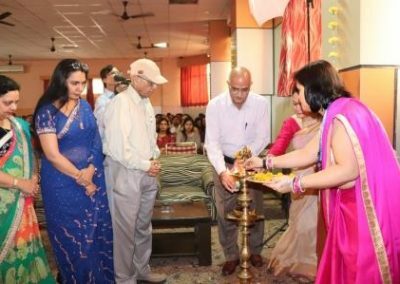 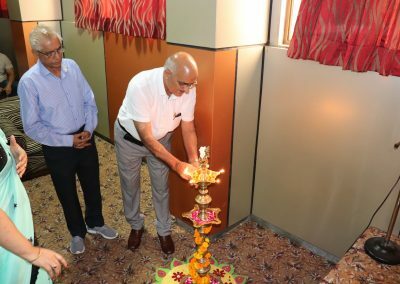 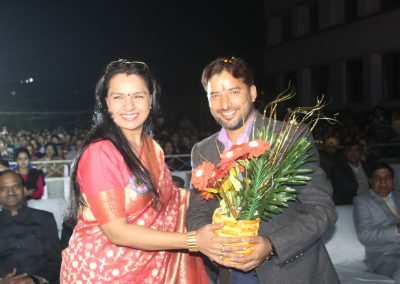 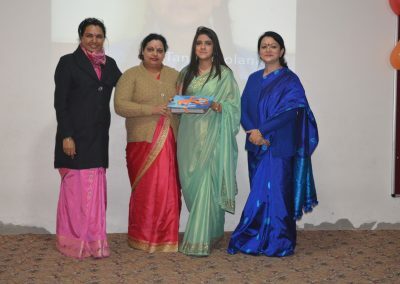 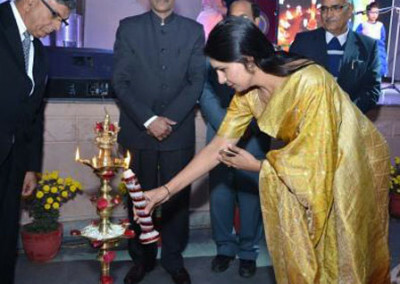 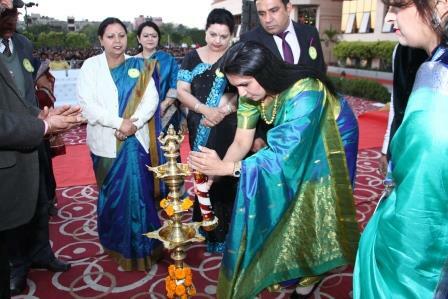 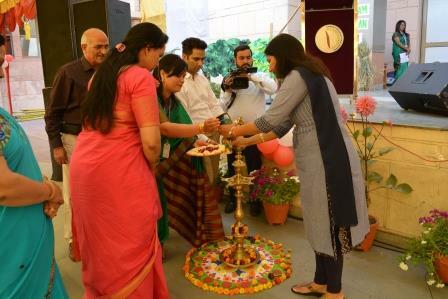 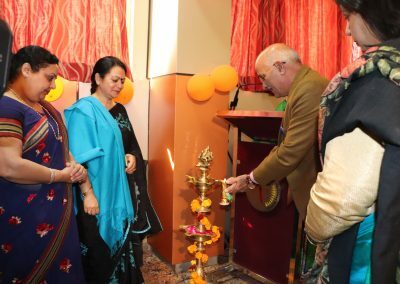 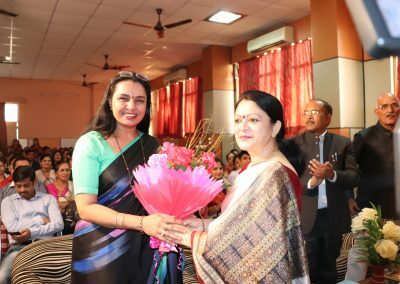 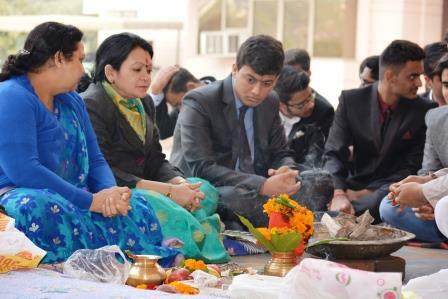 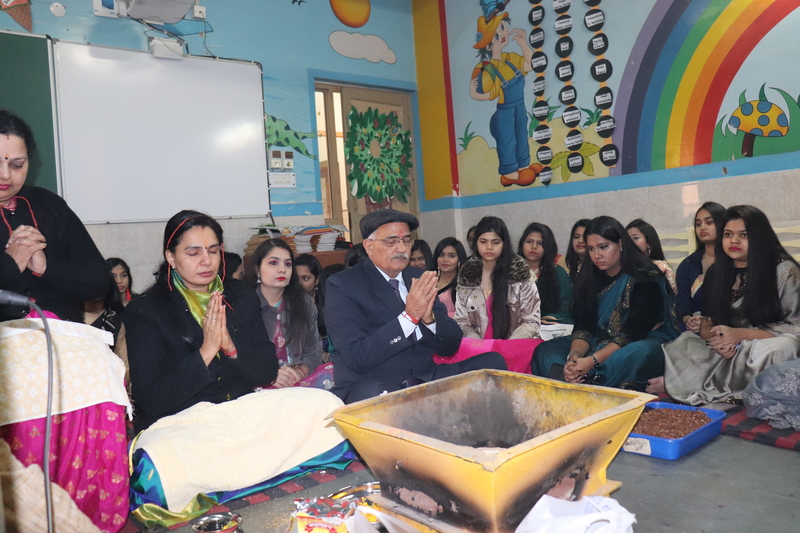 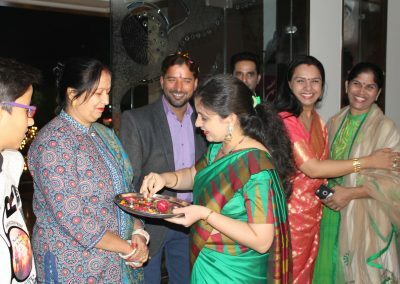 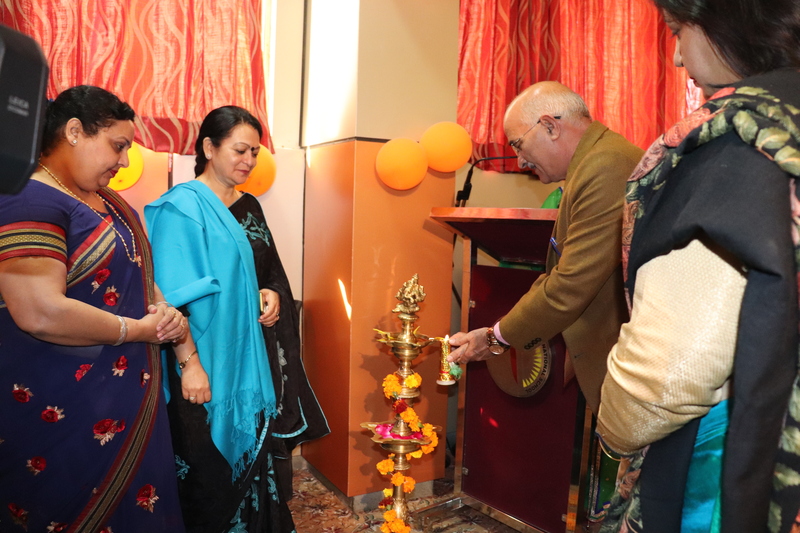 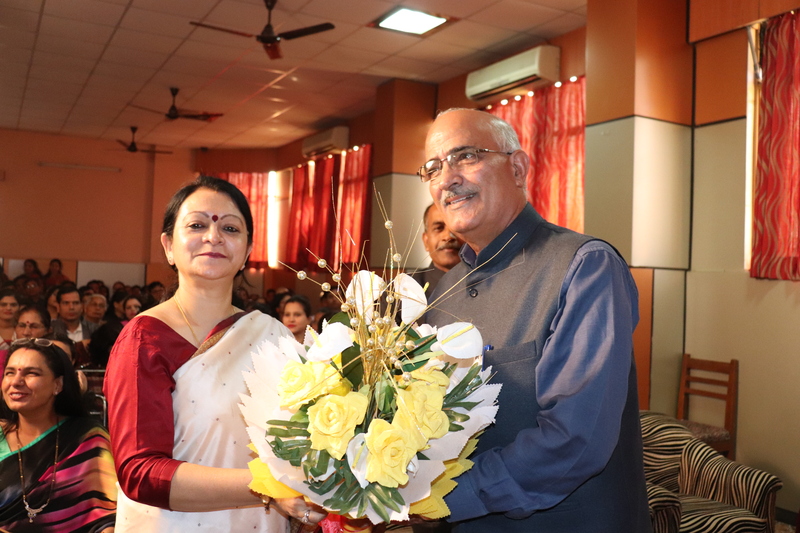 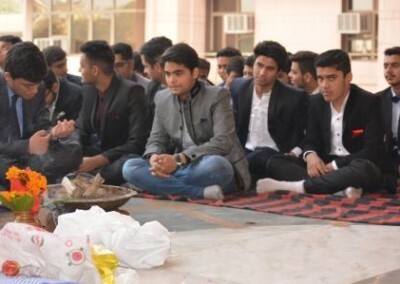 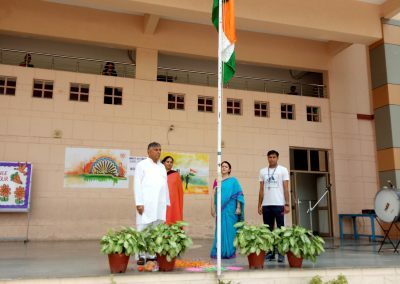 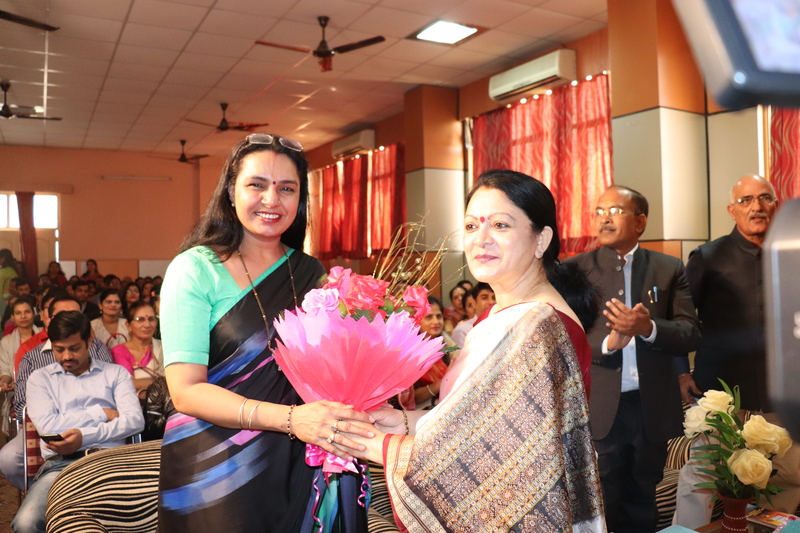 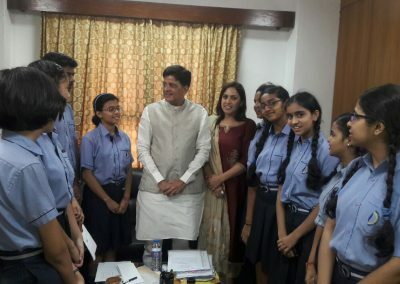 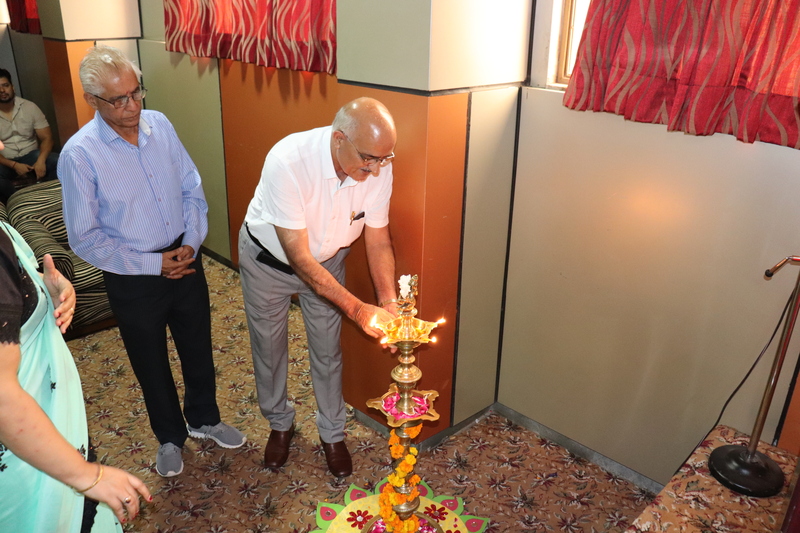 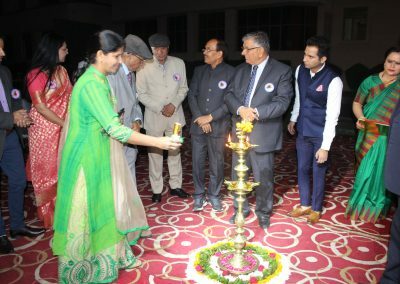 The day began with the hawan ceremony and was participated by students of class XII along with their teachers and esteemed dignitaries of the management Vice Chairperson Ms. Sangeeta Choudhury, Principal Ms. Poonam Jha, Academic Advisor Ms. Sudesh, Director (Academics) Mr. Rajbir Singh Gahlot and Headmistress Ms. Archana Rathi. 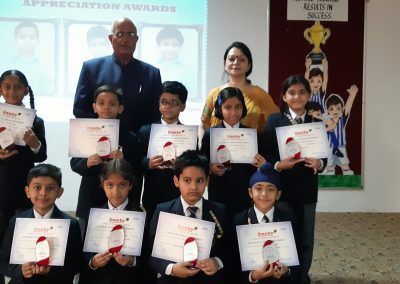 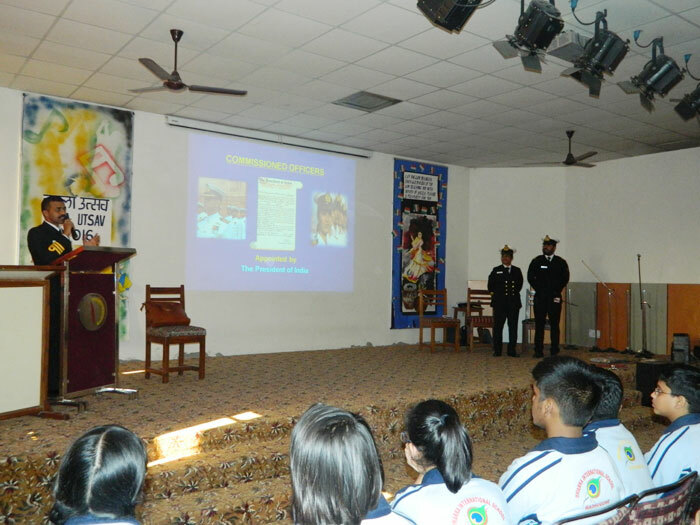 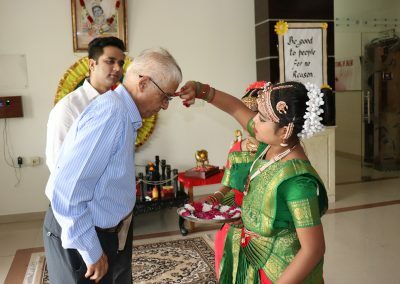 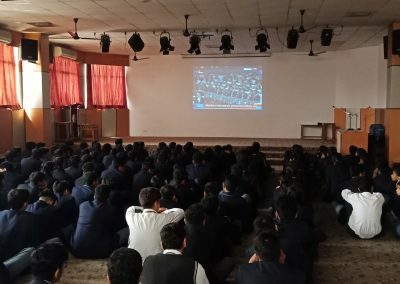 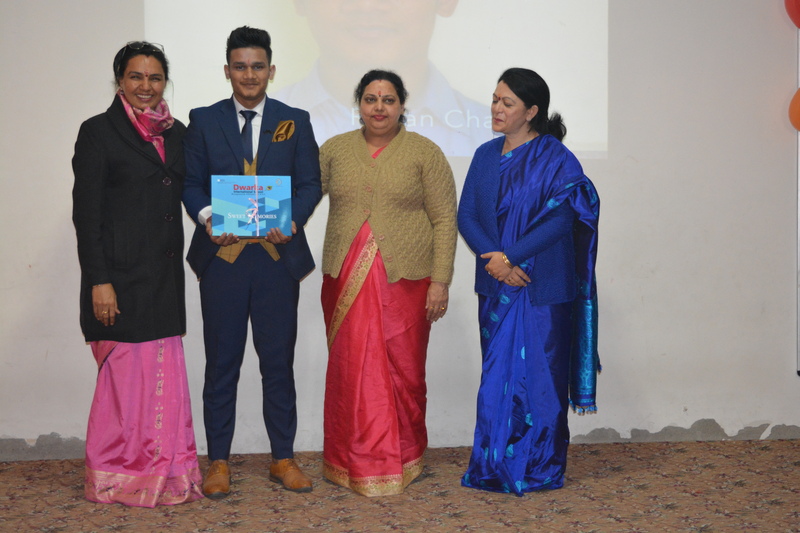 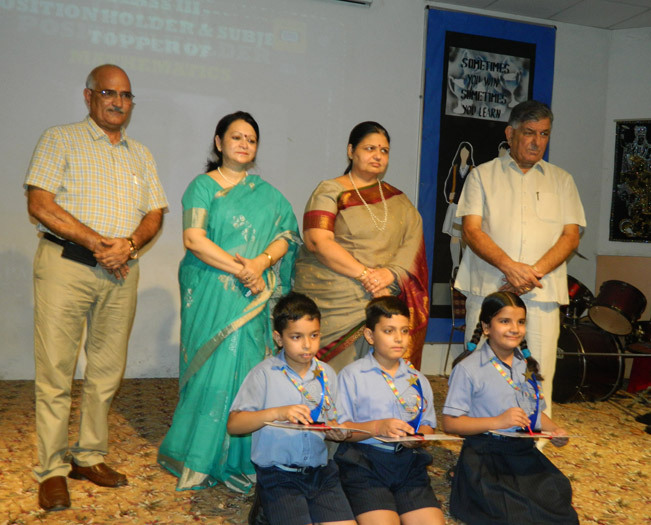 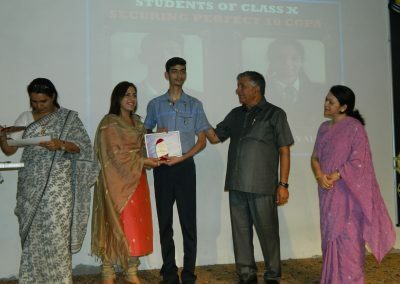 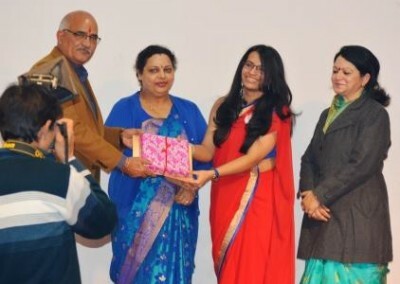 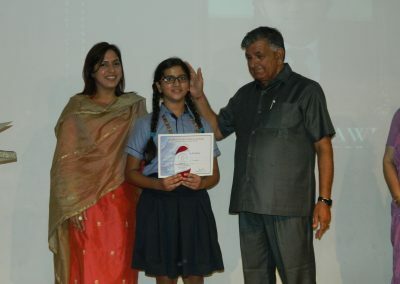 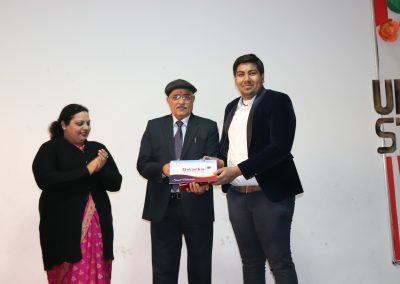 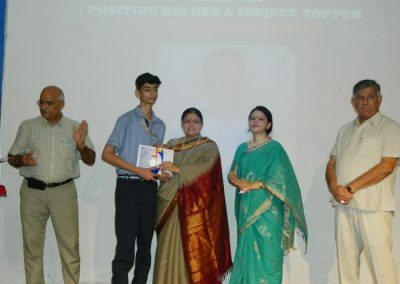 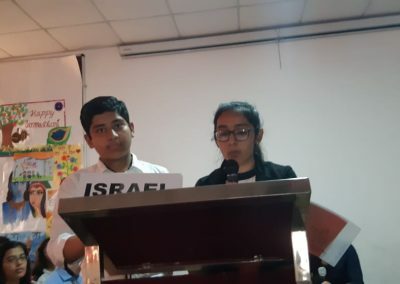 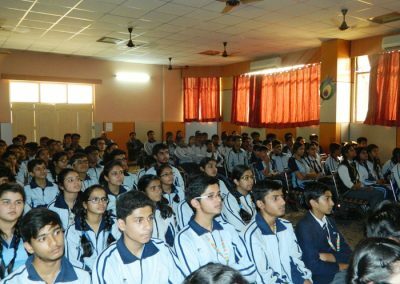 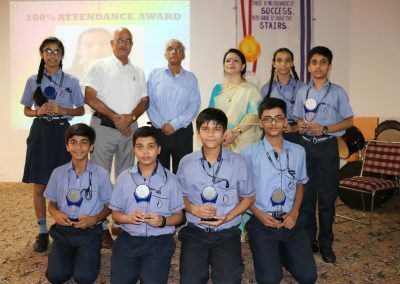 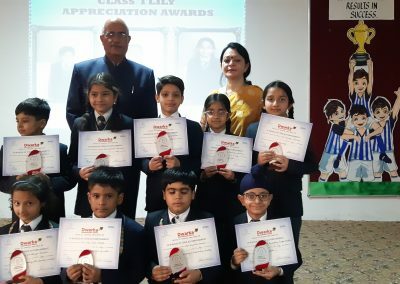 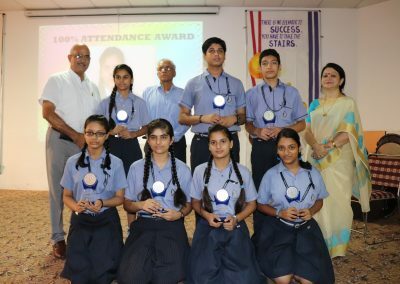 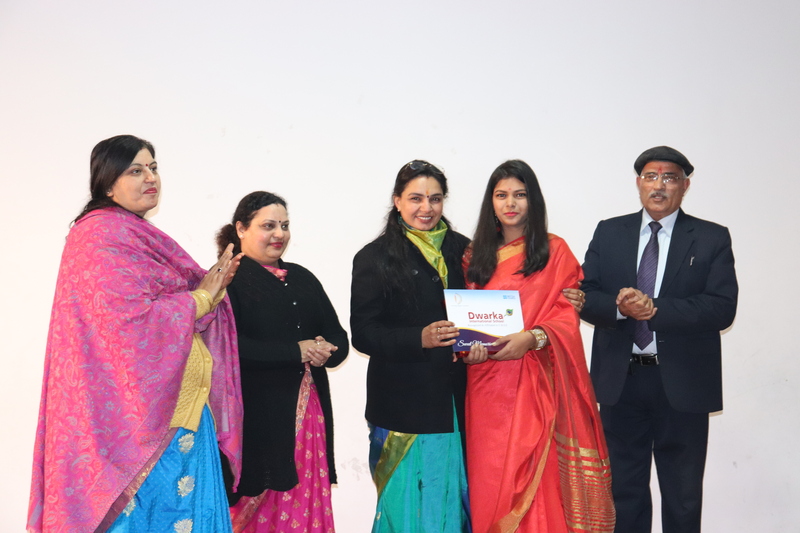 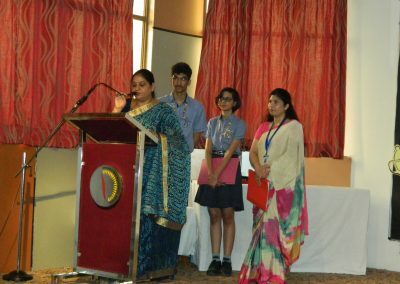 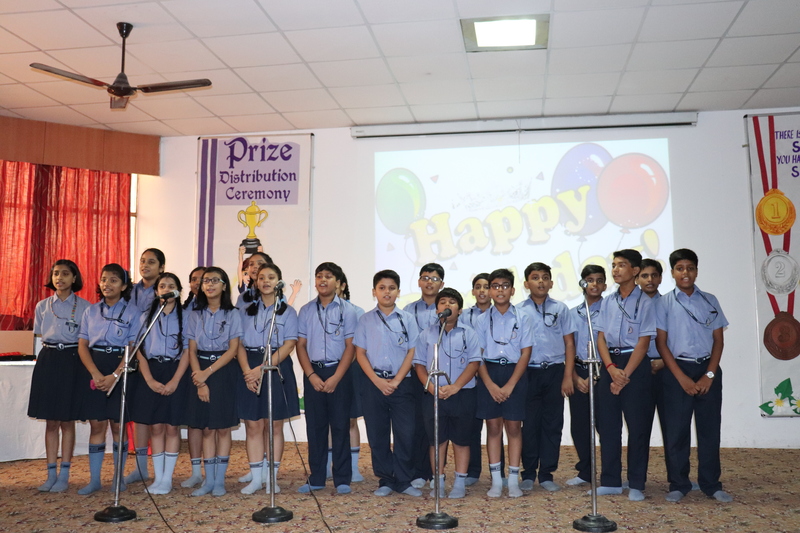 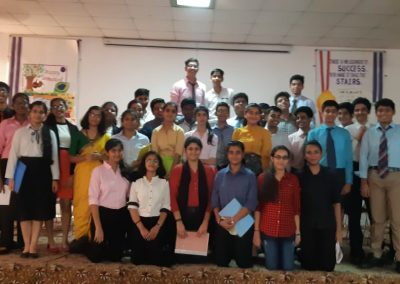 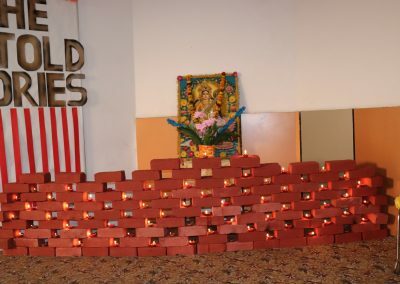 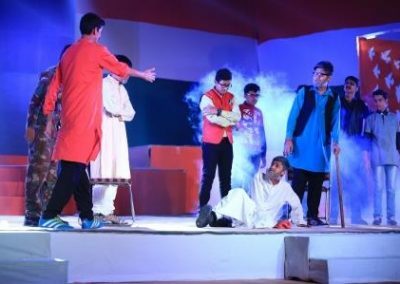 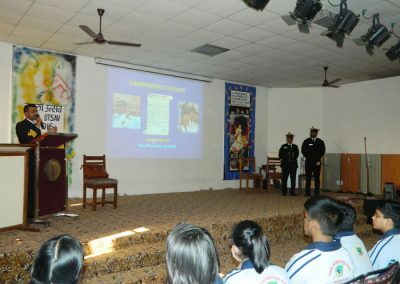 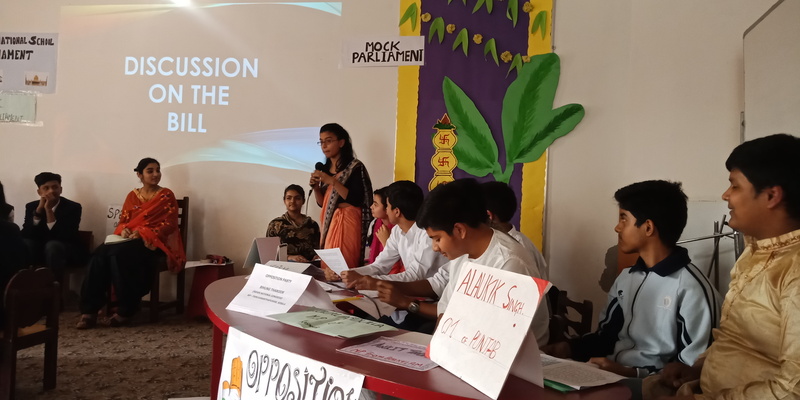 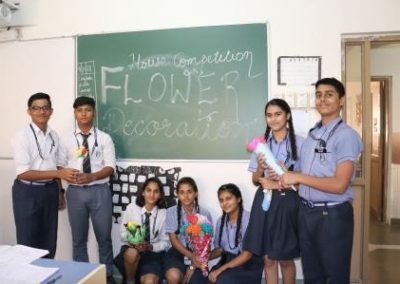 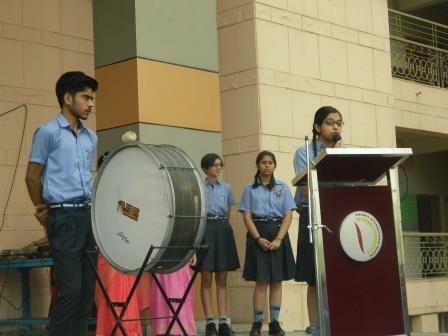 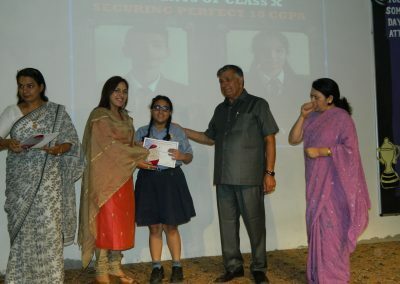 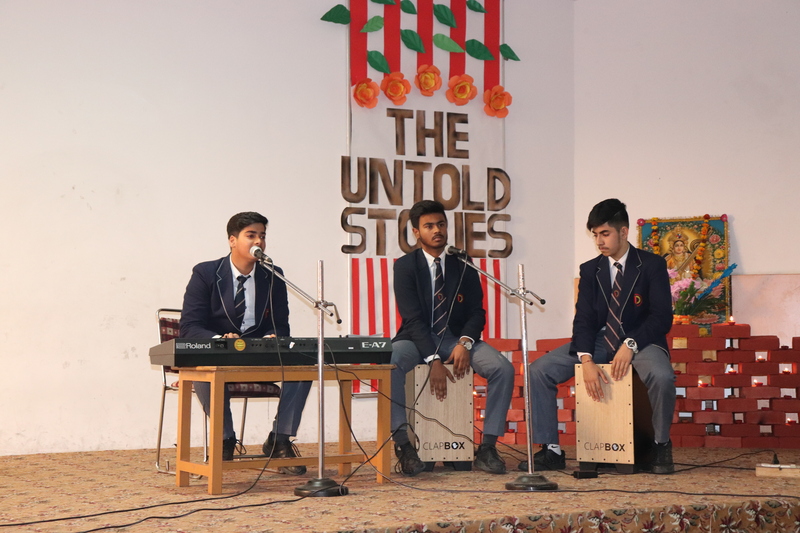 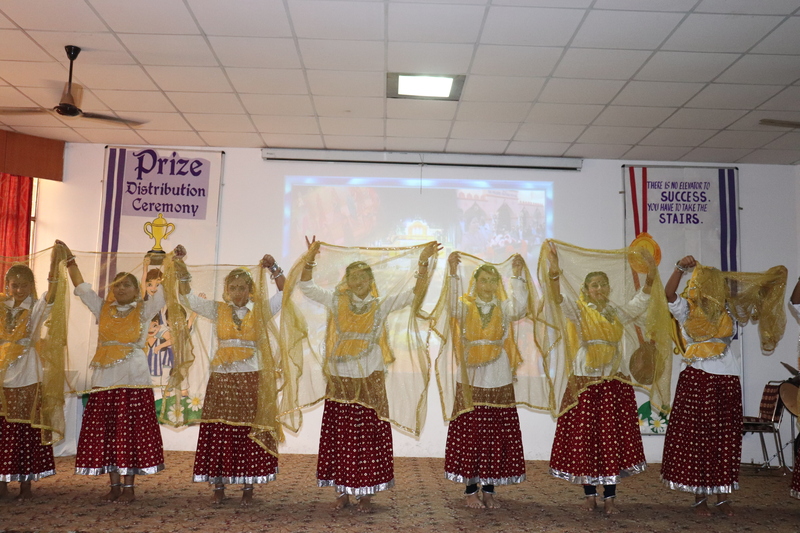 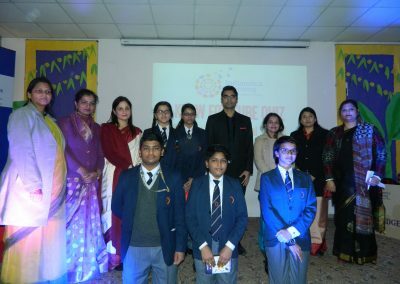 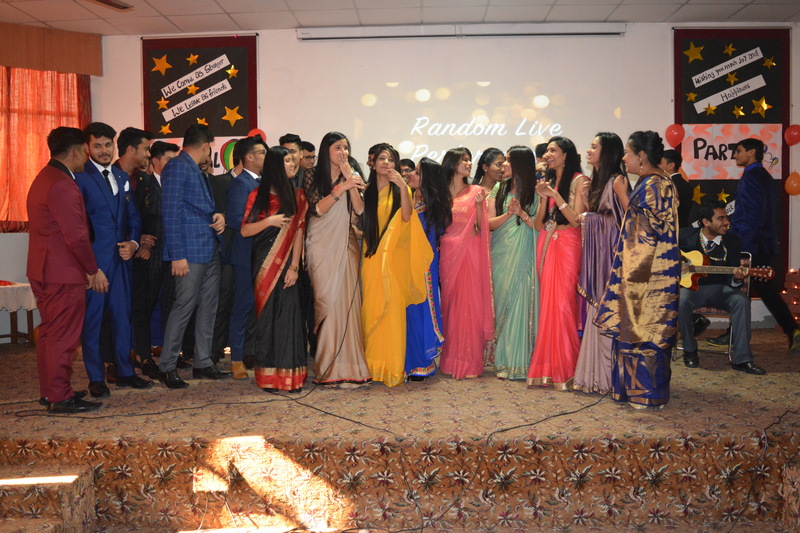 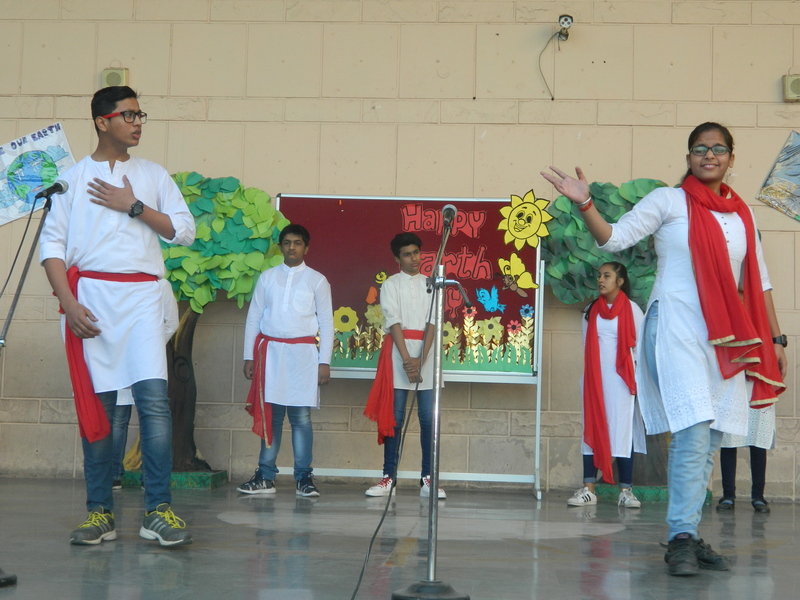 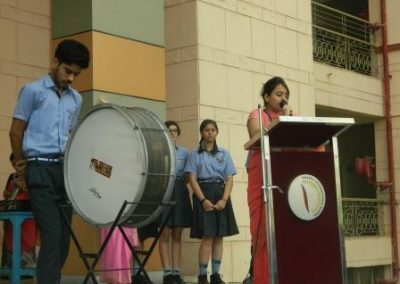 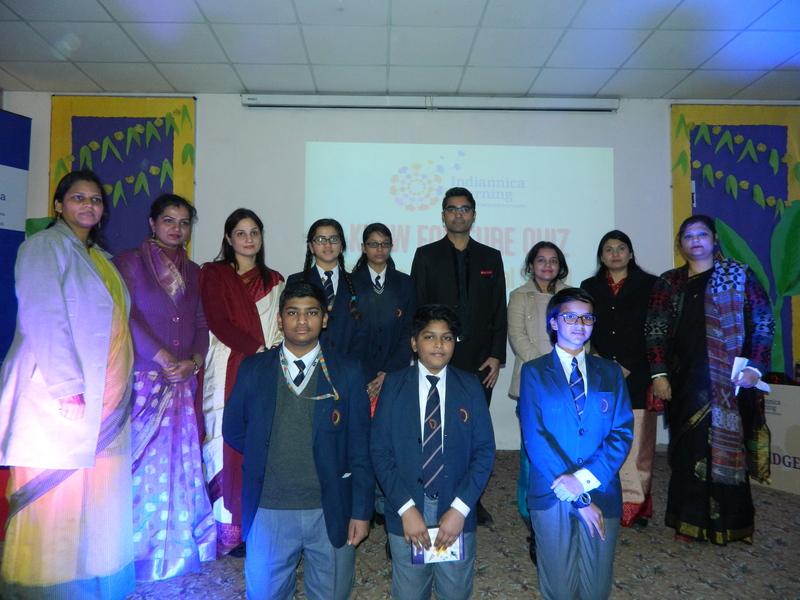 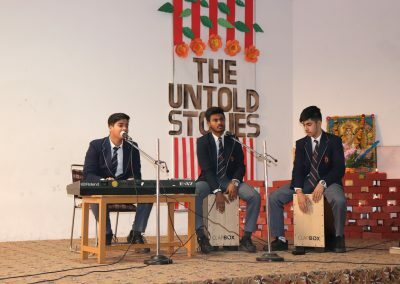 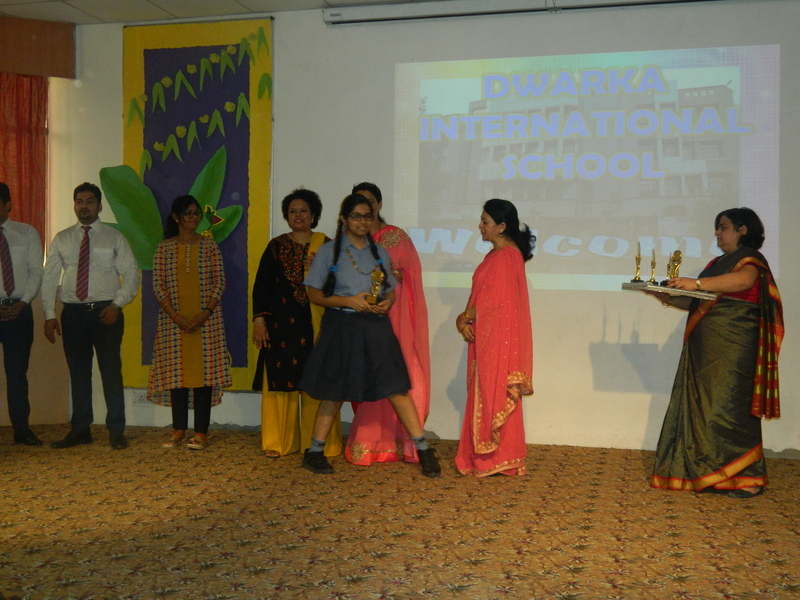 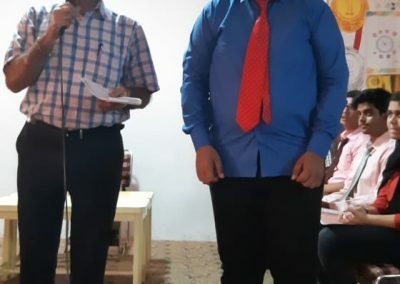 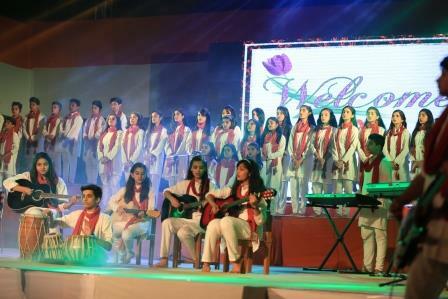 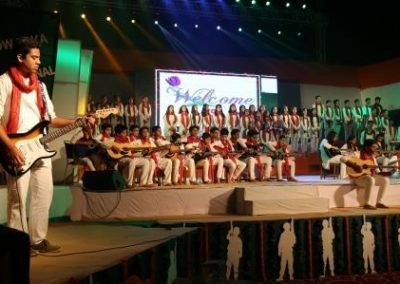 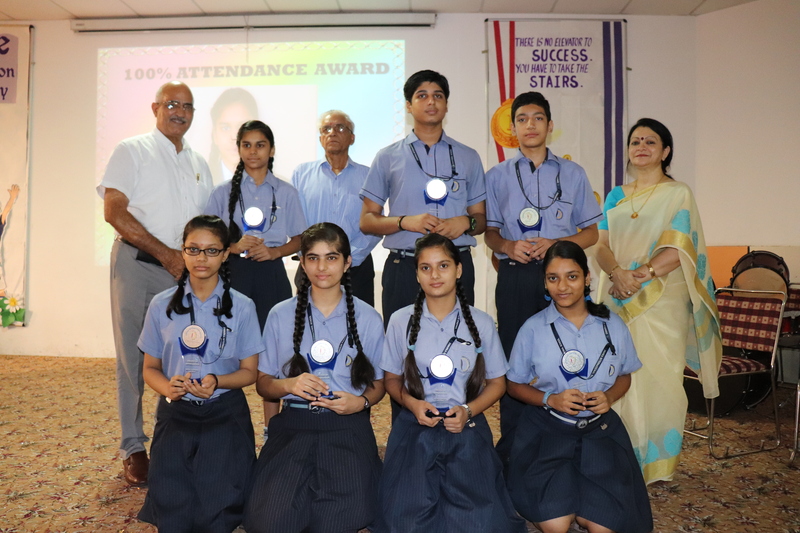 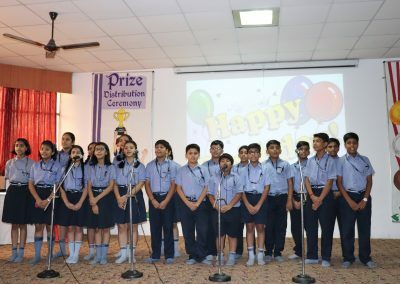 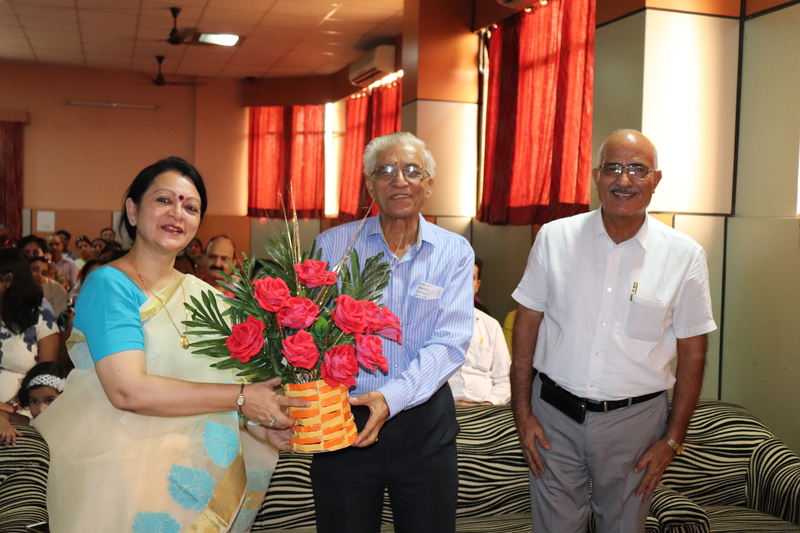 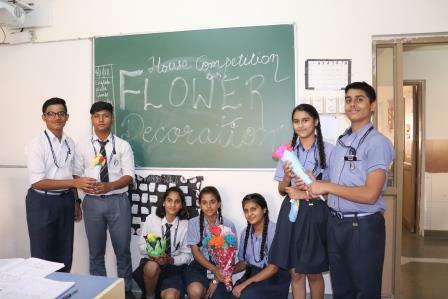 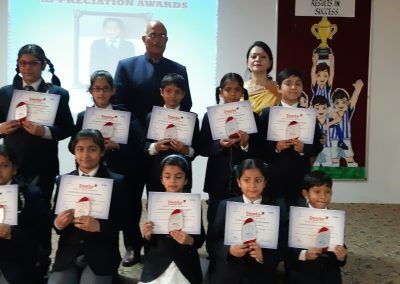 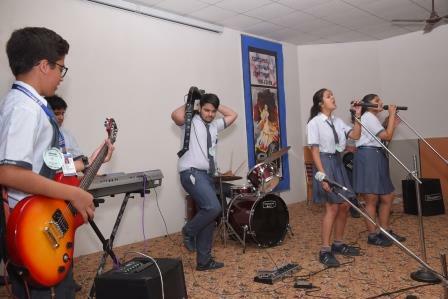 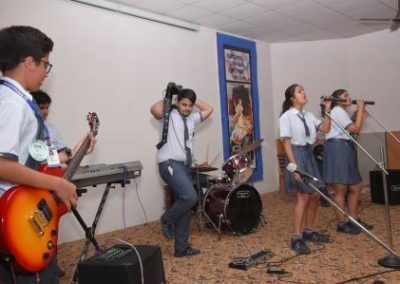 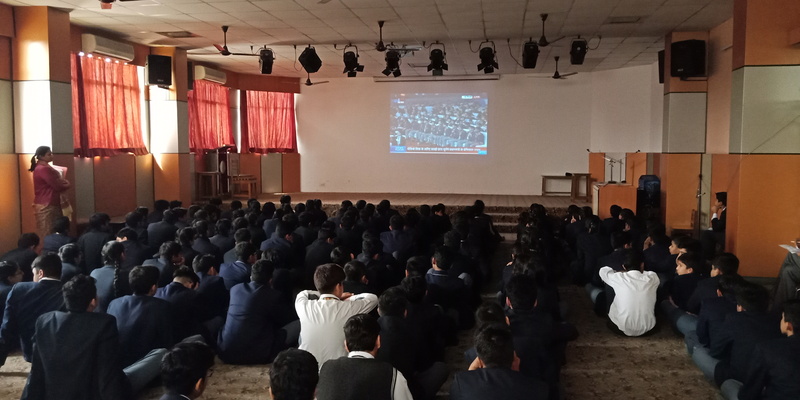 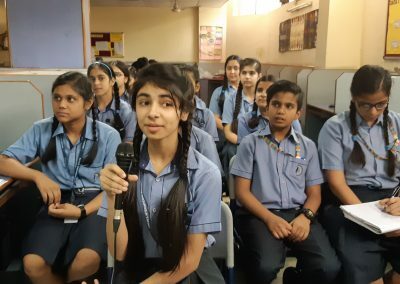 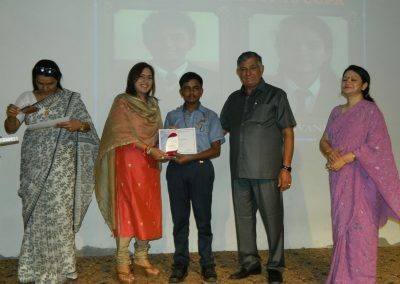 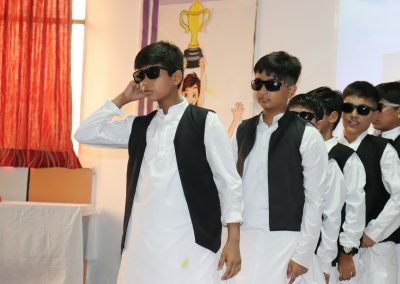 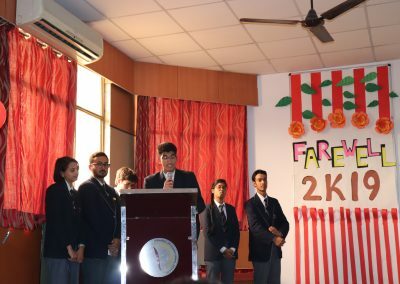 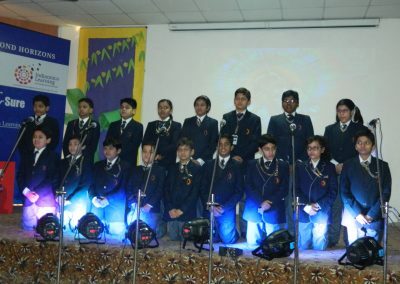 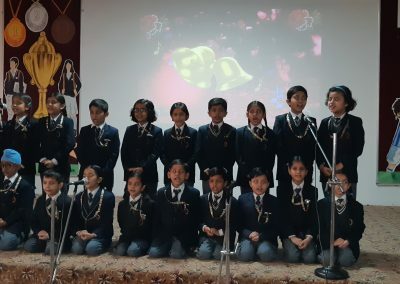 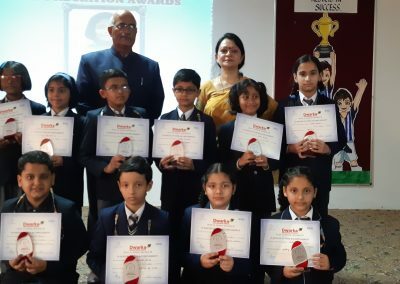 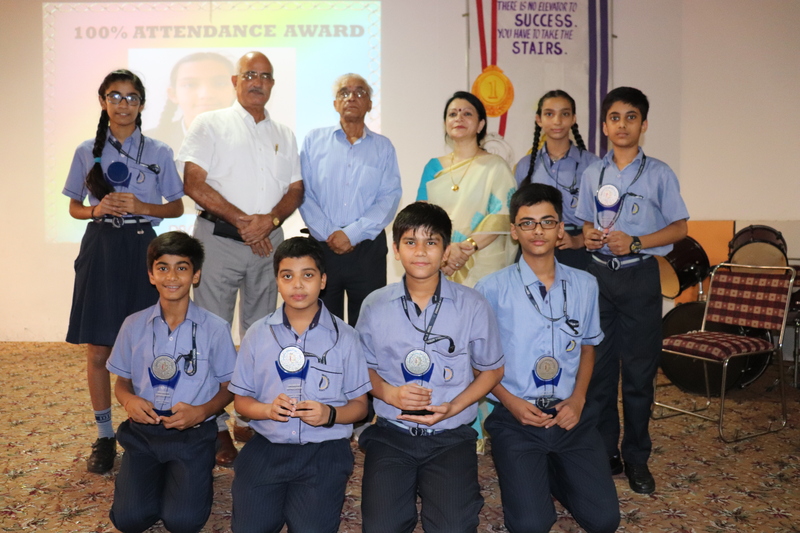 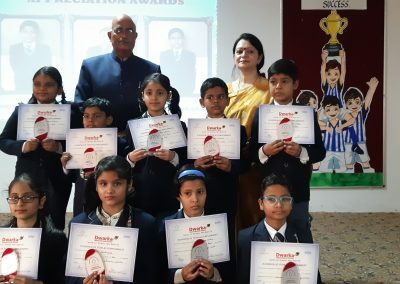 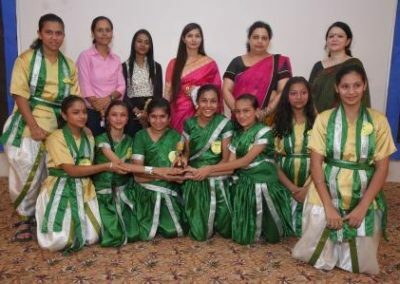 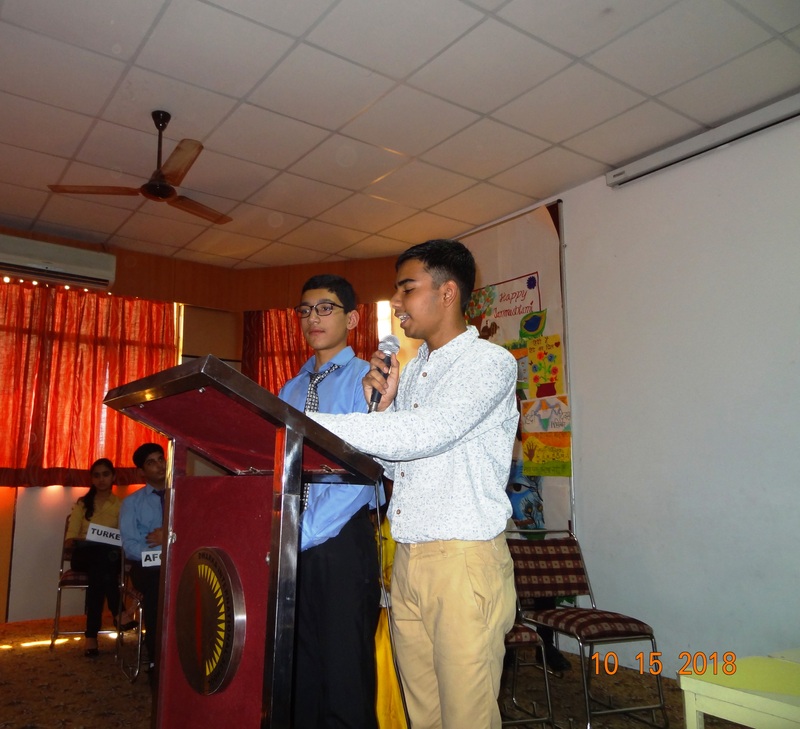 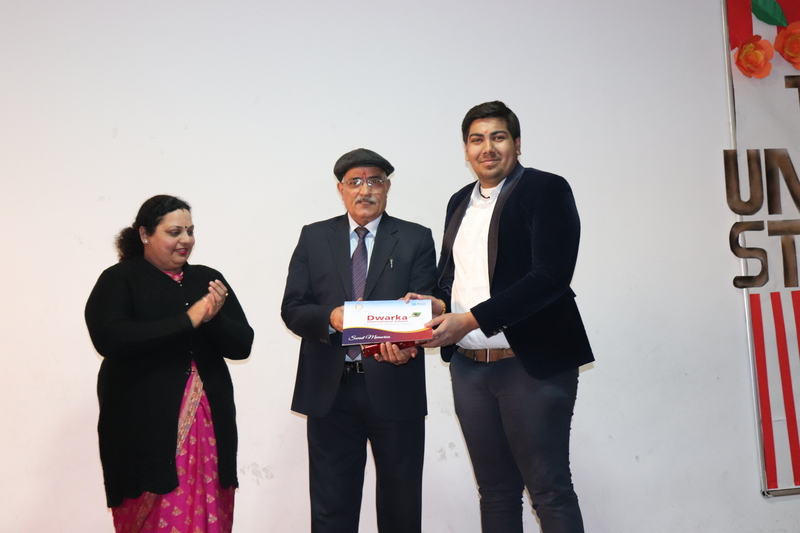 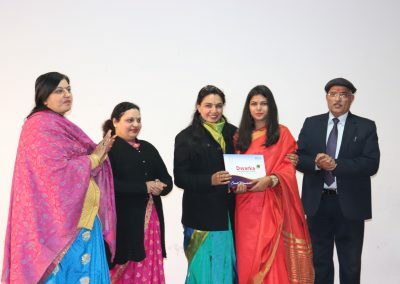 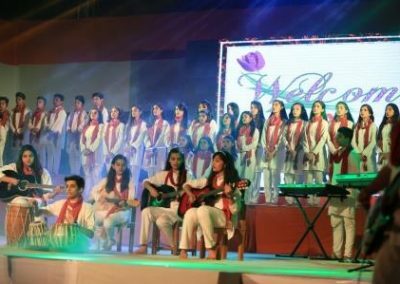 Students were then escorted to the auditorium by their juniors for the valedictory ceremony comprising giving away of mementoes, the wall of fame ritual, the customary title distribution ceremony followed by thought provoking speeches and a musical medley by students of class XI. 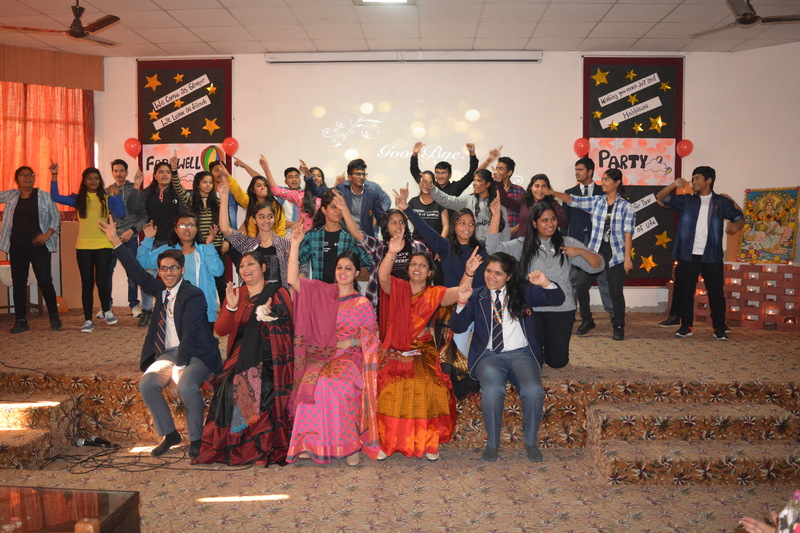 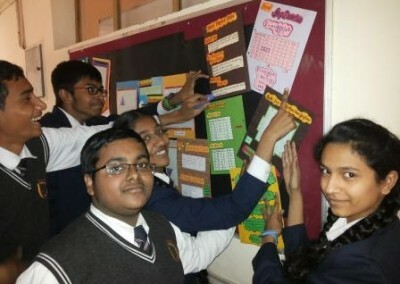 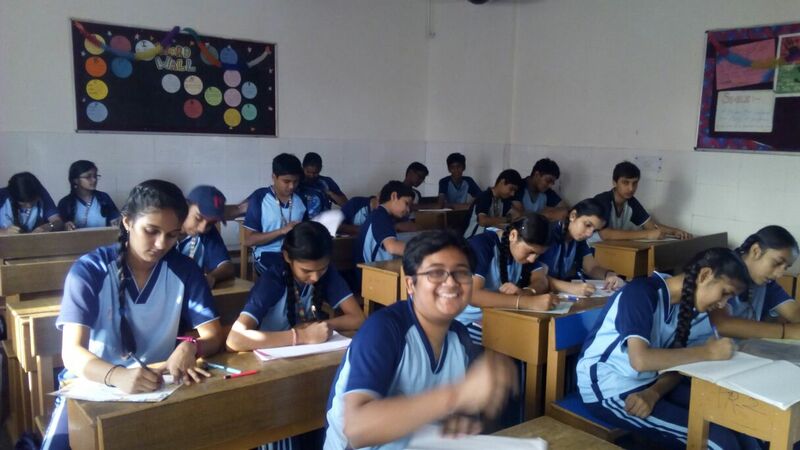 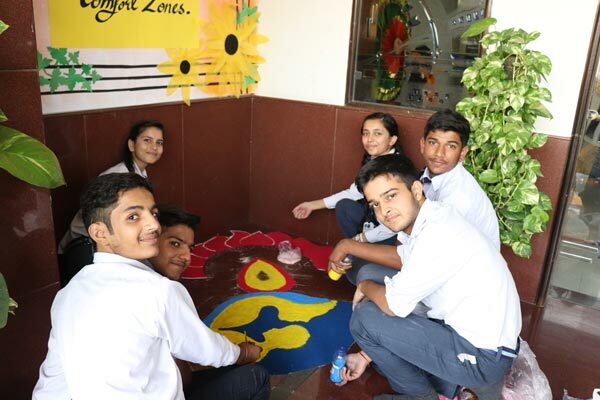 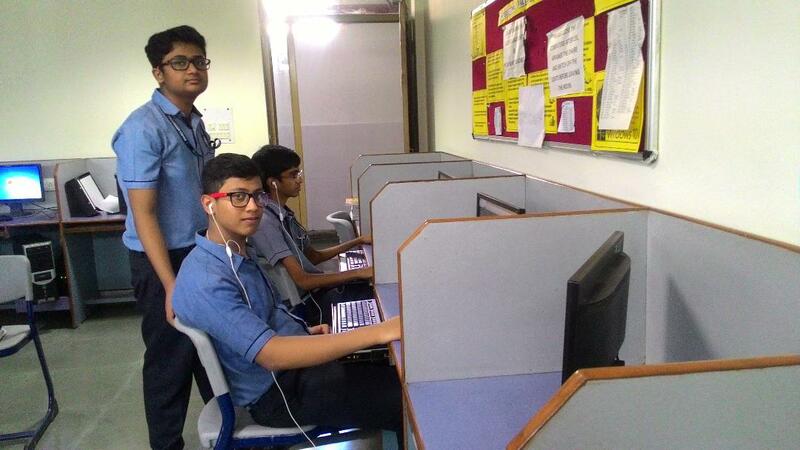 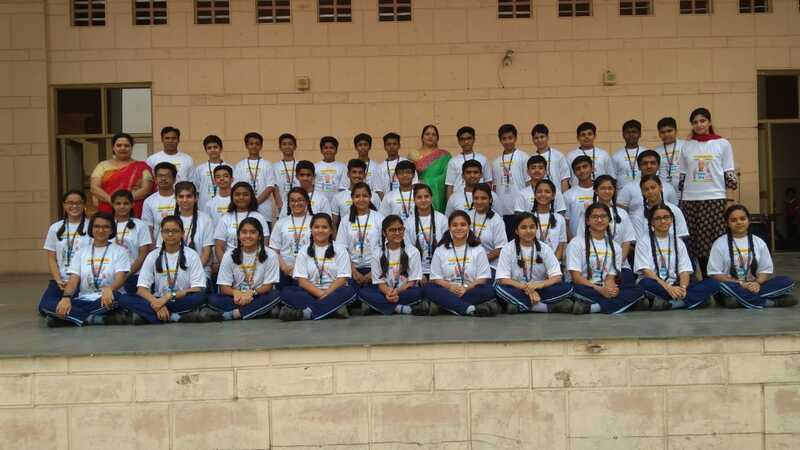 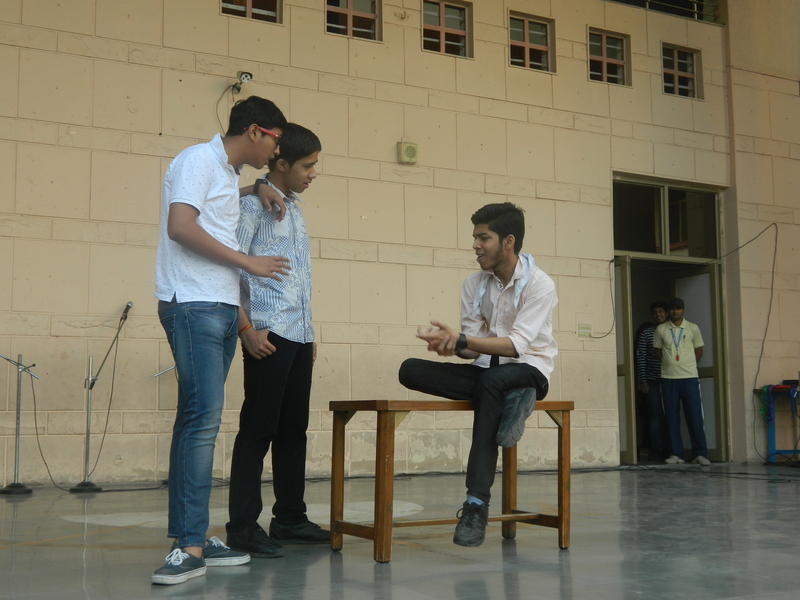 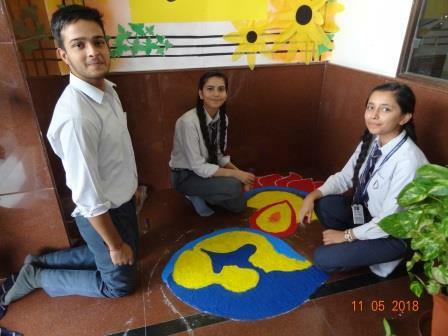 It was indeed nostalgic witnessing students recollecting memories and the time spent by their seniors in the school. 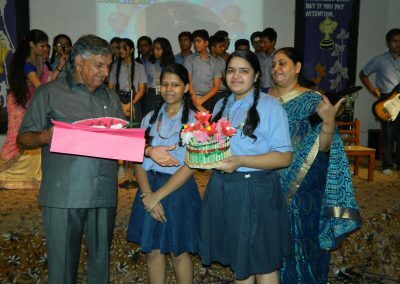 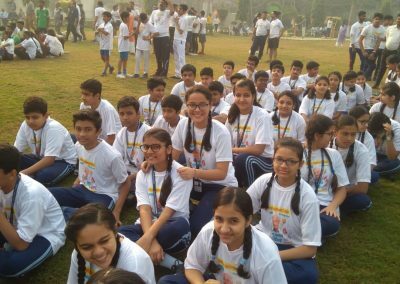 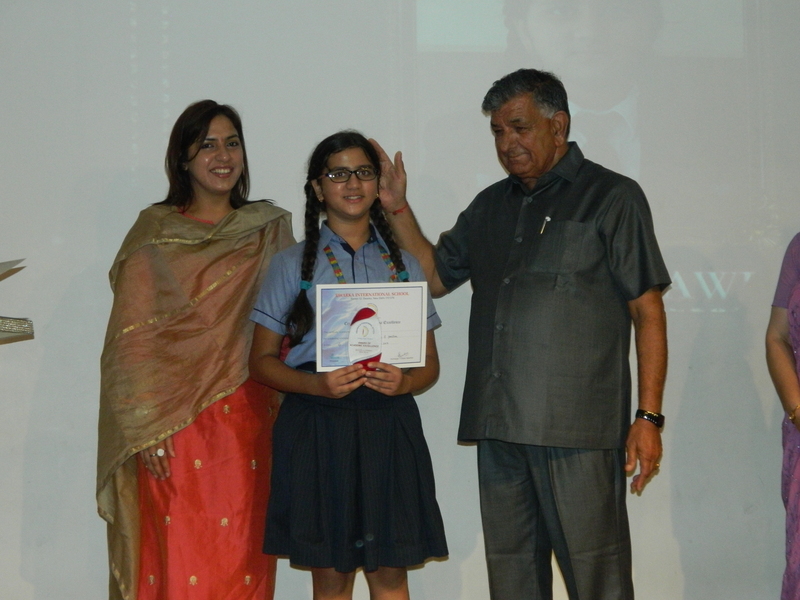 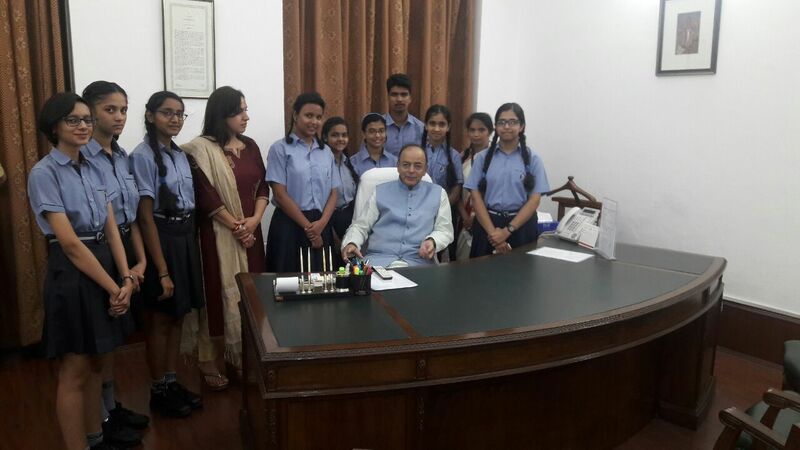 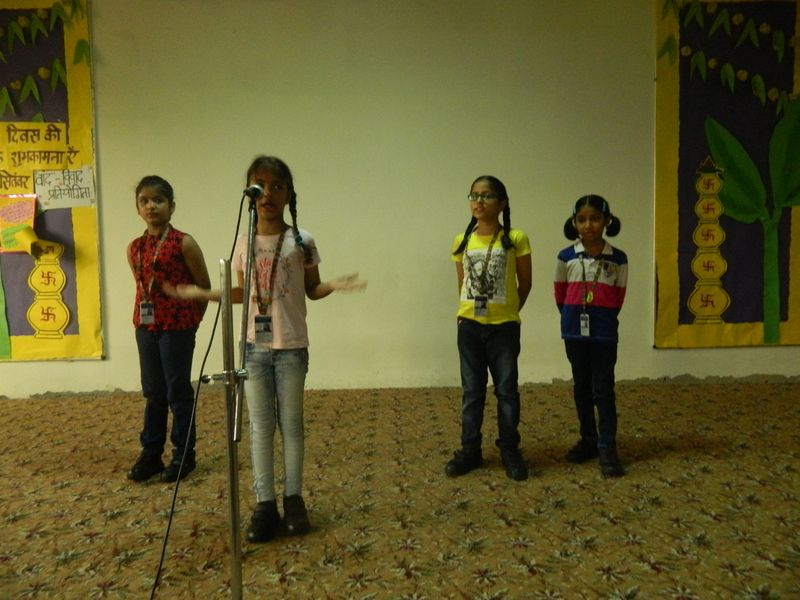 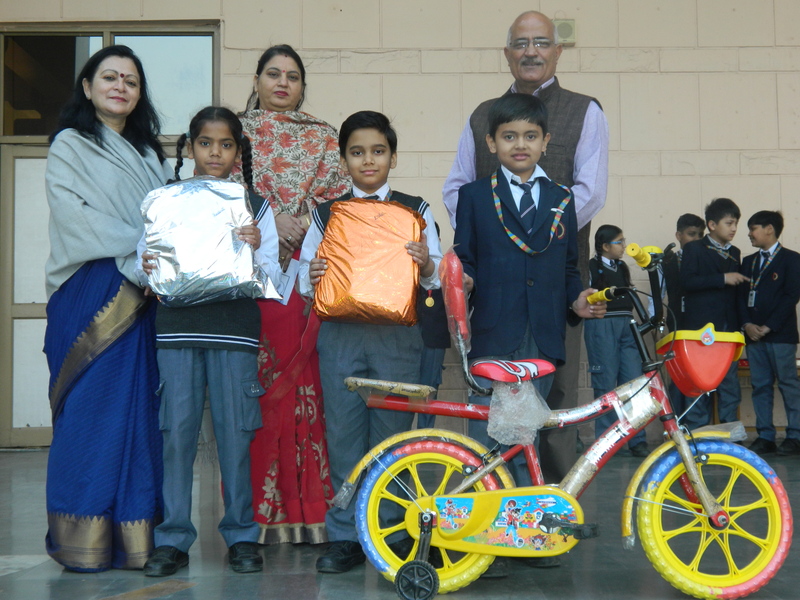 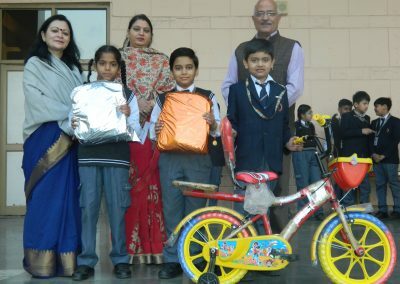 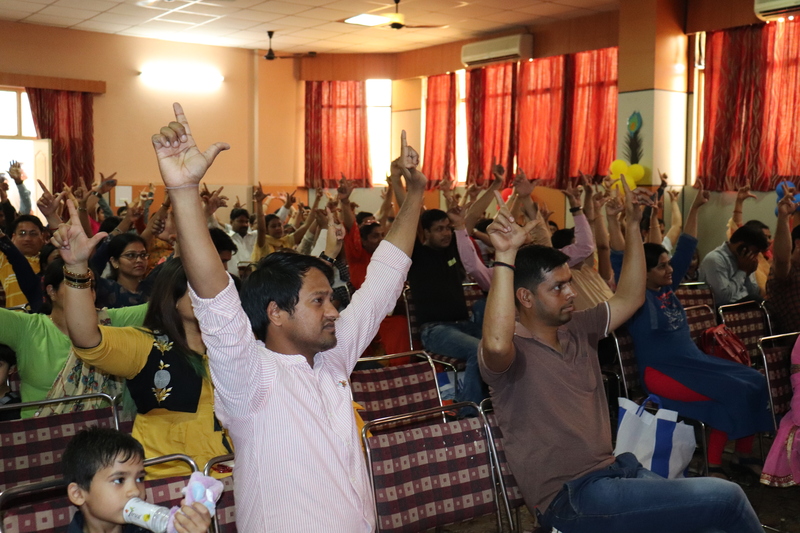 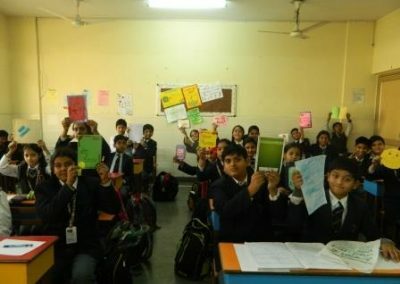 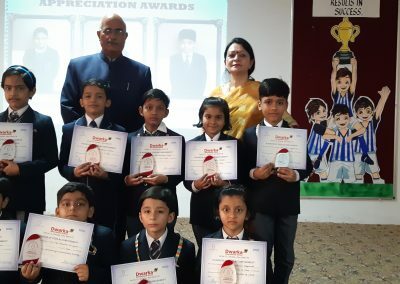 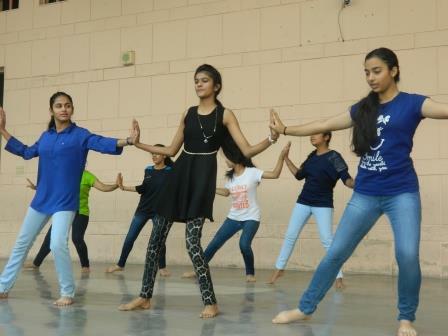 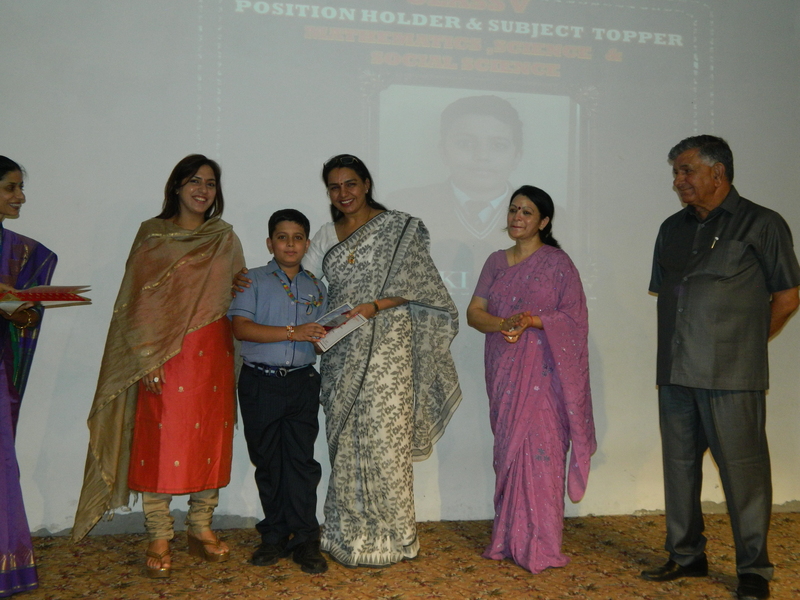 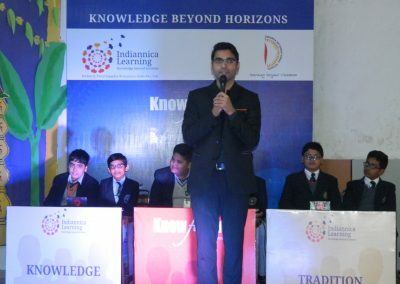 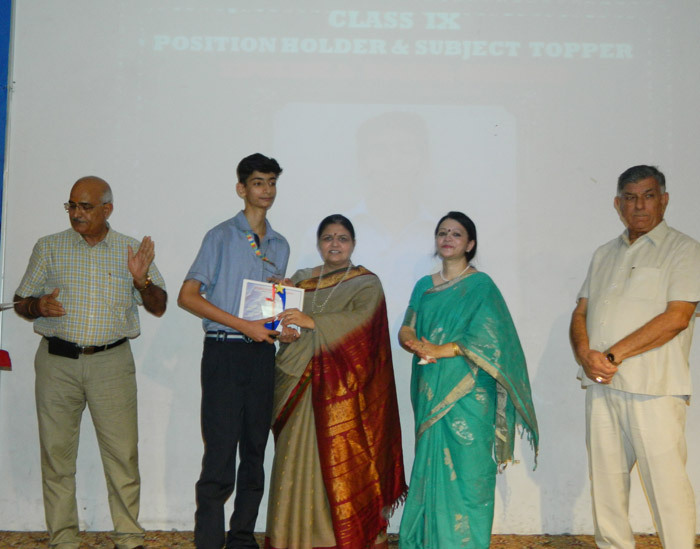 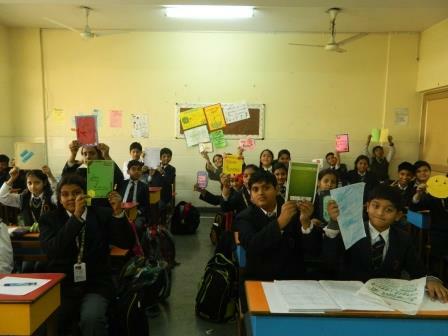 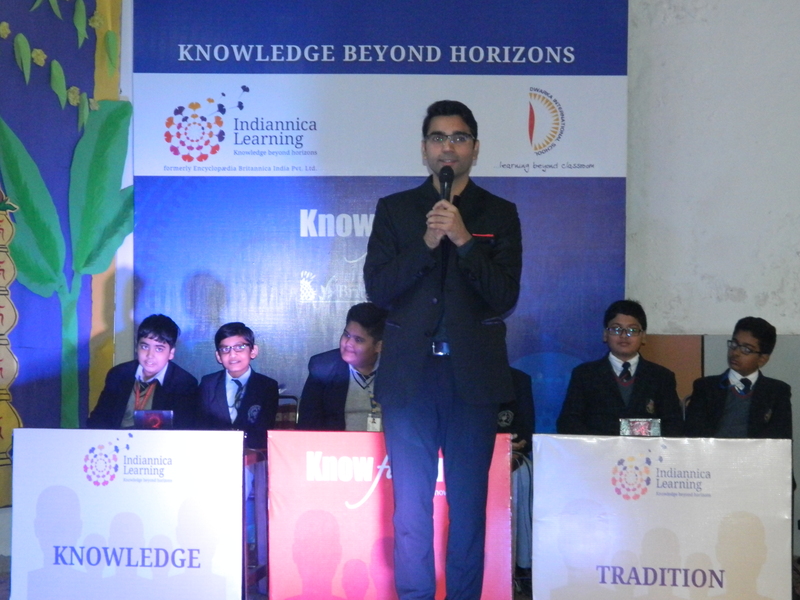 The outgoing batch was moved by the kind gesture of their juniors and appreciated their efforts earnestly. 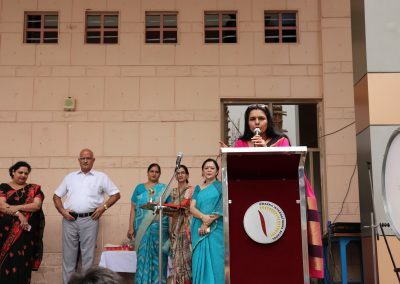 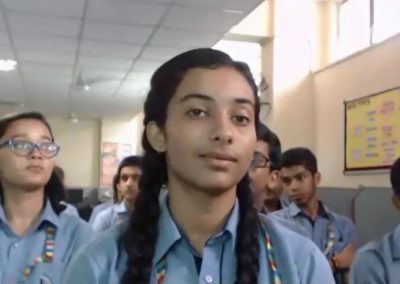 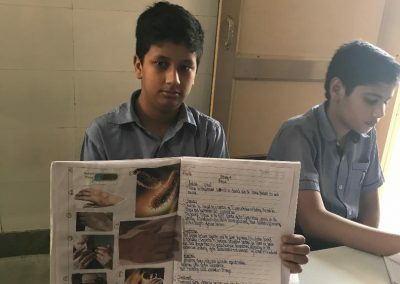 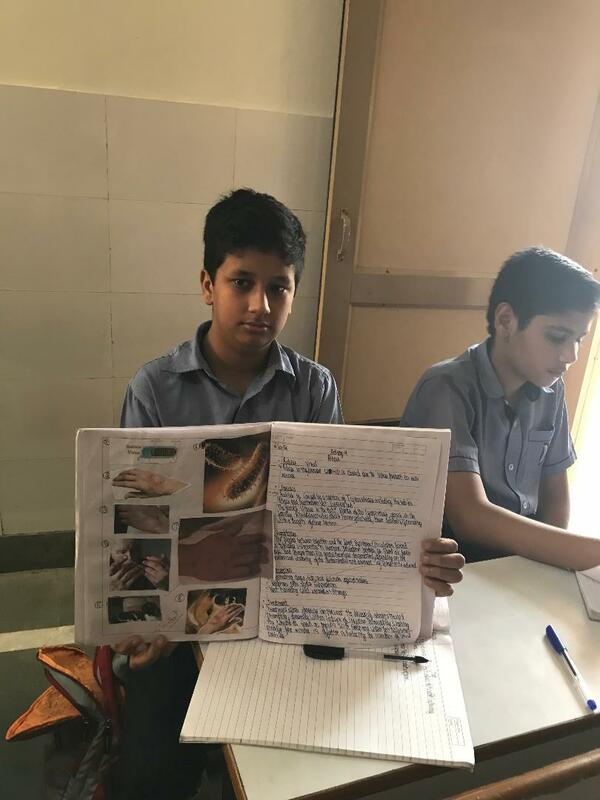 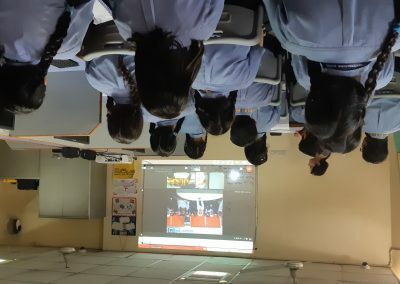 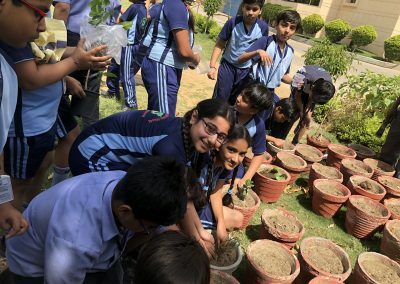 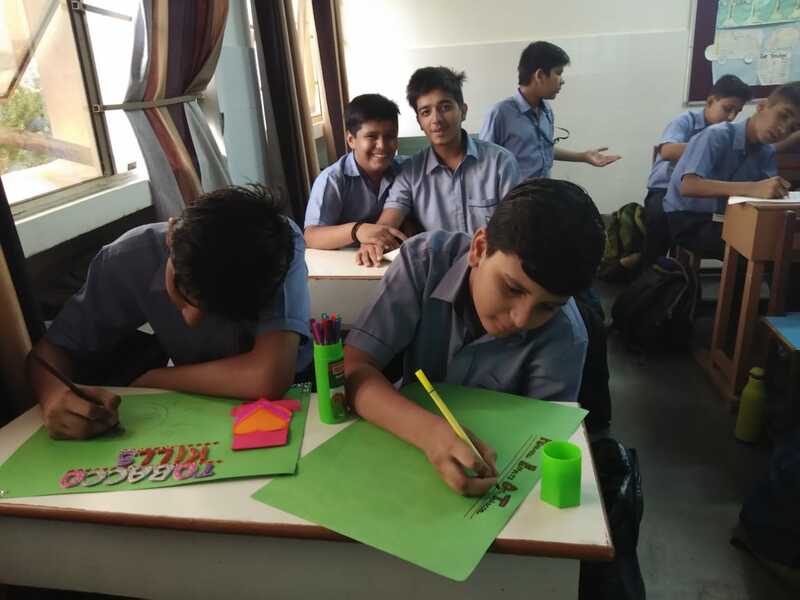 It was an occasion for them to look back at the time that they spent in the lawns of the school and the professional education and the skills they acquired during the period. 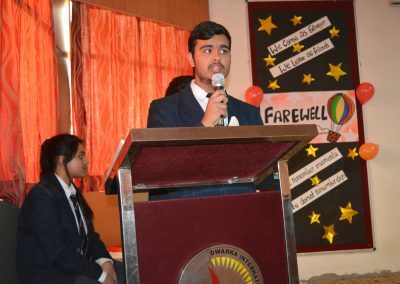 It was indeed an emotional moment bidding farewell to the students with a heavy heart, but with a hope that they fair well at every turn in life. 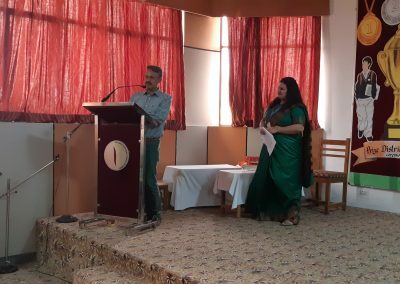 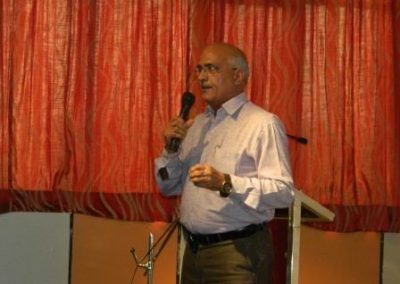 The ceremony came to a close with Director( Academics) Mr. Rajbir Singh Gahlot giving tips on success and examinations thus passing the light of wisdom to the students. 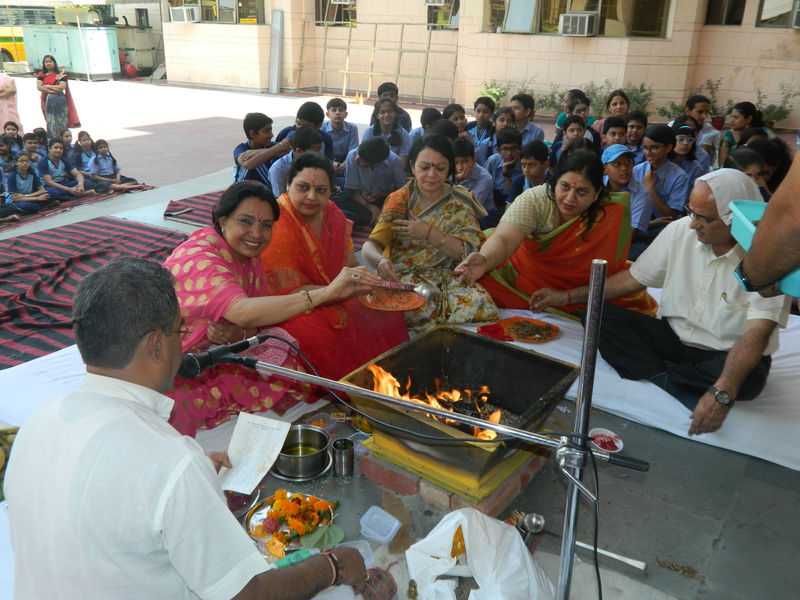 A sumptuous lunch followed next. 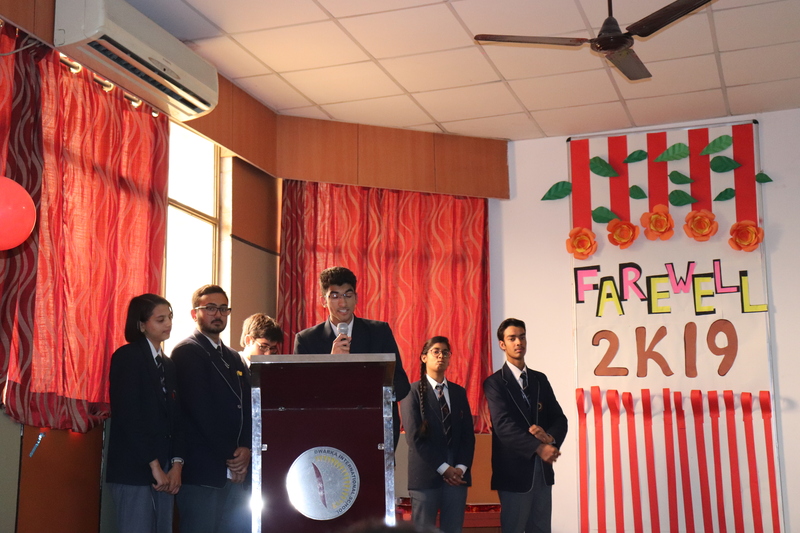 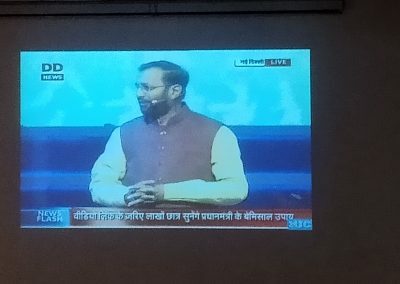 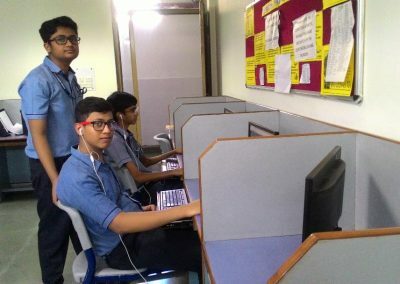 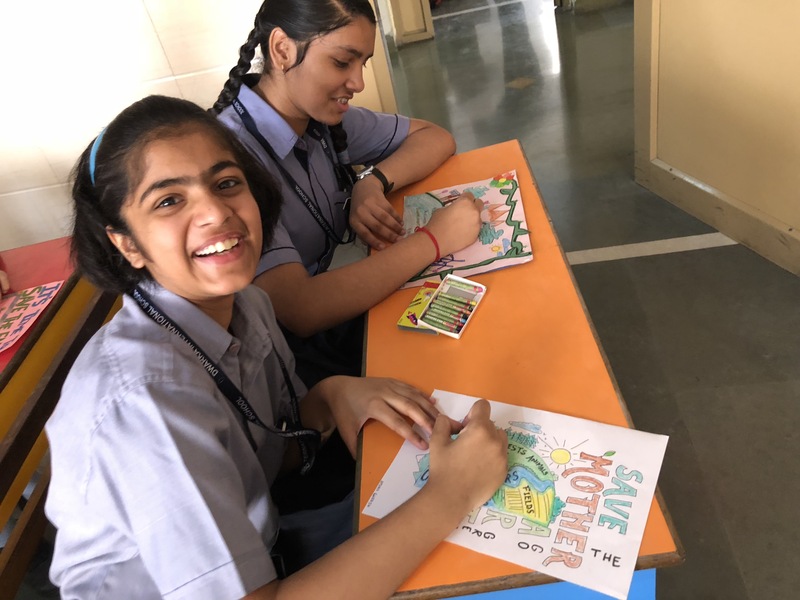 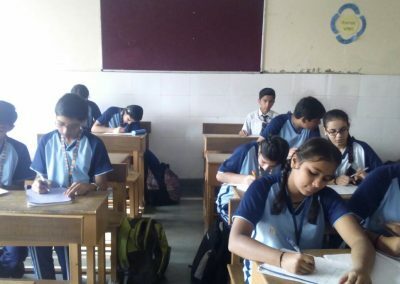 Farewell 2019 was thus an honest endeavour of class XI which was full of feelings and emotions for their departing seniors.